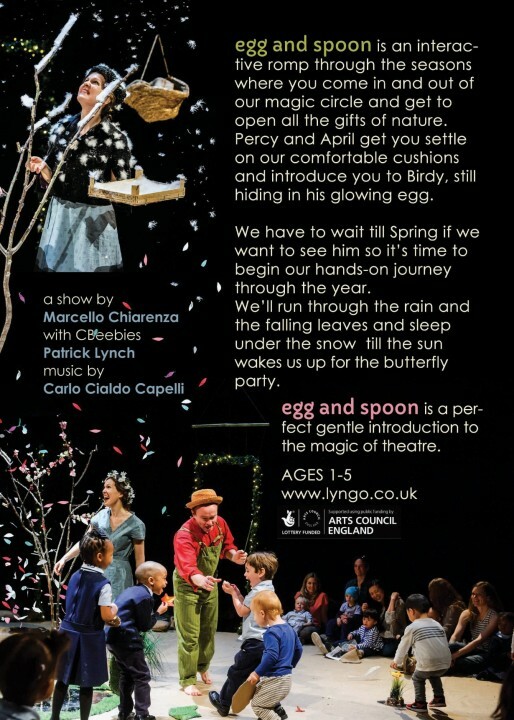 LYNGO is a UK based children’s theatre company with strong Italian connections. 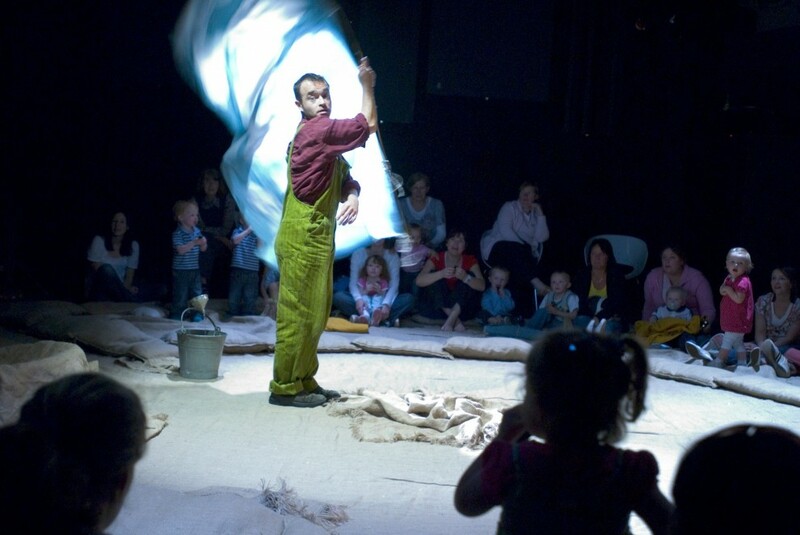 Our shows have delighted children and adults for over 15 years with their unique mix of fun and beautiful imagery, working magically together to reveal the vivid poetic realm that is at the heart of our work. 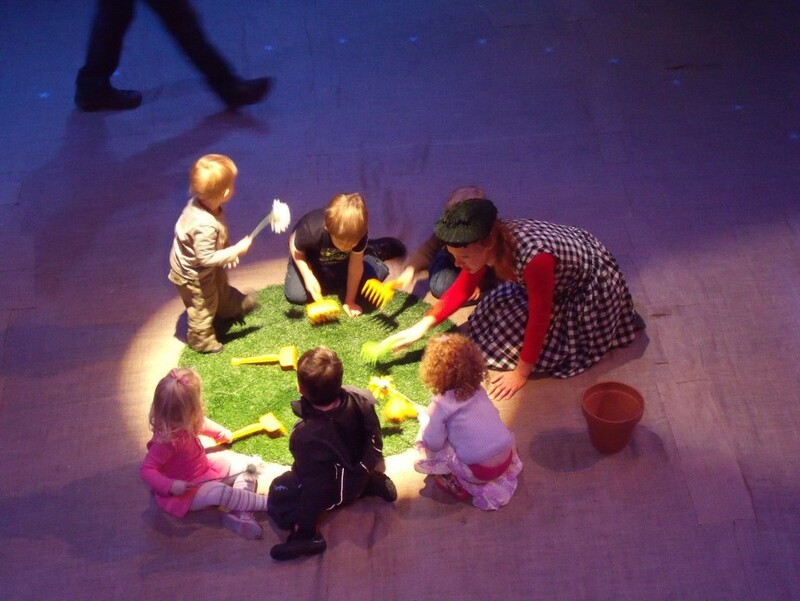 Our trademark features are a singular visual flair, an inventive use of props -beautifully designed and hand-made ‘theatre toys’- and an interactive and genuine approach to play, no matter the age of our audience. 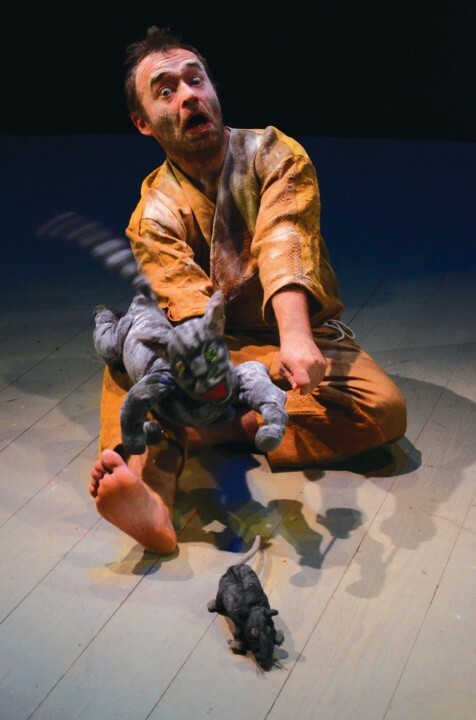 "Hands dows the best piece of children theatre I have seen to date." 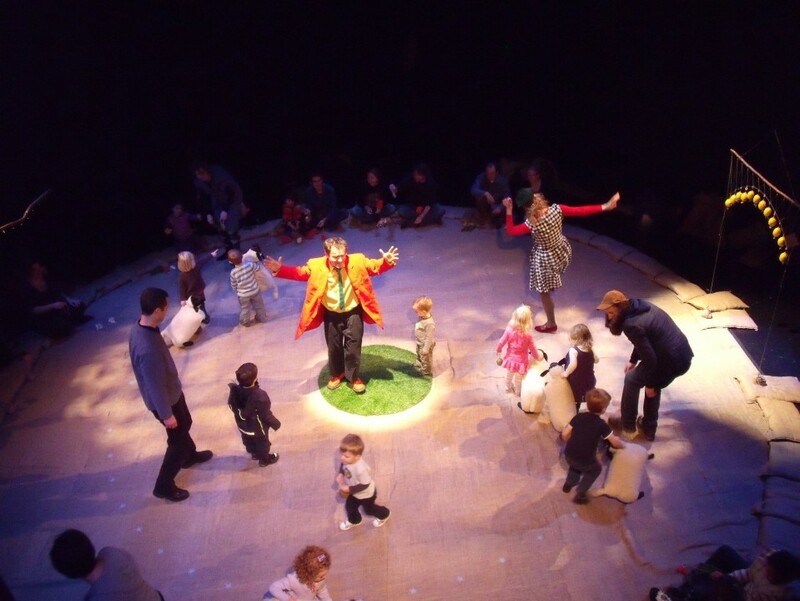 WHAT A WONDERFUL WORLD (ages 2-5) ...a much anticipated relaunch of our in-the-round, early years show! We'll be making it even more wonderful using all the experience we've gained in the past 10 years (including new marketing materials). Touring from September 2019. Before anything new is made it must be dreamed. From our moon-base in the Sea of Tranquility we get a great view of the Earth and it’s time to make a new one just like we do every night! What shall we put in tomorrow’s world? Snowballs and flamingos of course! So all aboard the sleeper train as it takes us on our dream voyage. 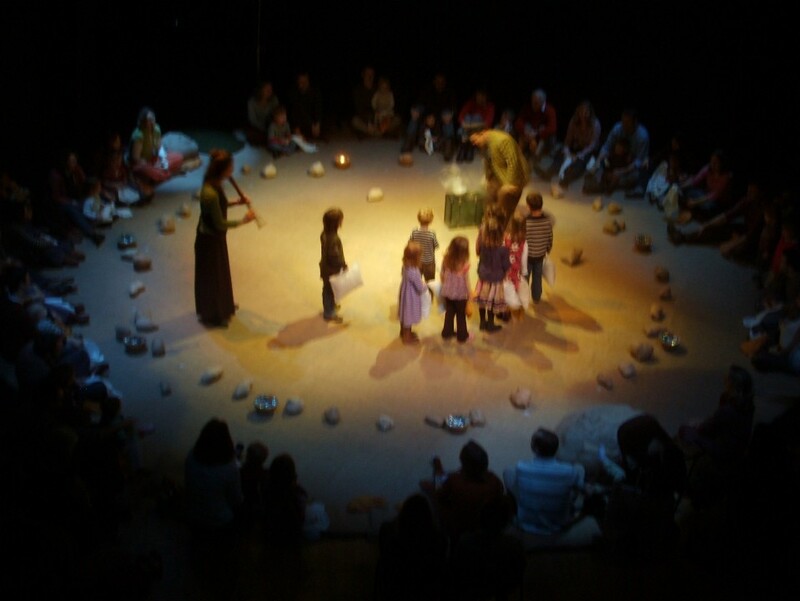 We start with putting the stars in the sky and move through history, creating life, discovering fire all over again and finally arriving at the one-world tree where we celebrate the new home that we made all together. This is an amazing romp through the universe where you can get your hands on the stuff of creation! 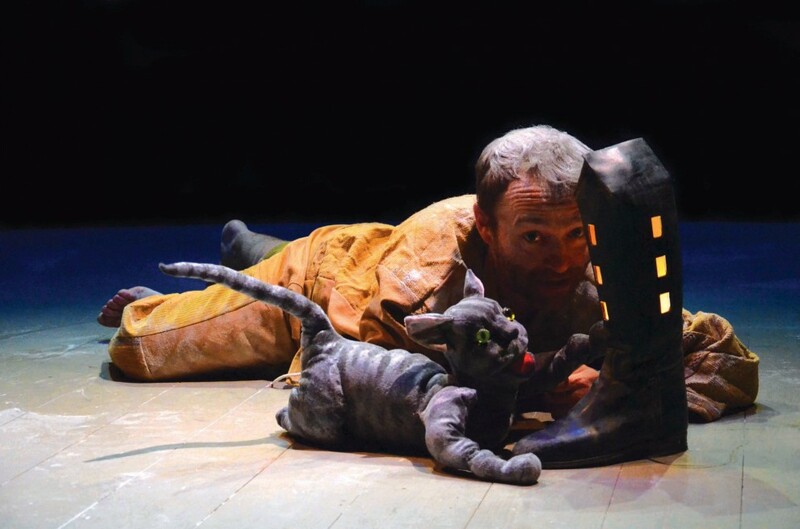 PUSS IN BOOTS (4+) This show is described as 'utterly captivating' in a review on The Stage magazine and was a great success during our first tour in 2016 receiving many brilliant reviews (go to 'publicity' on the main menu and choose reviews and comments) We are going to revamp it and launch it again in Spring 2020. 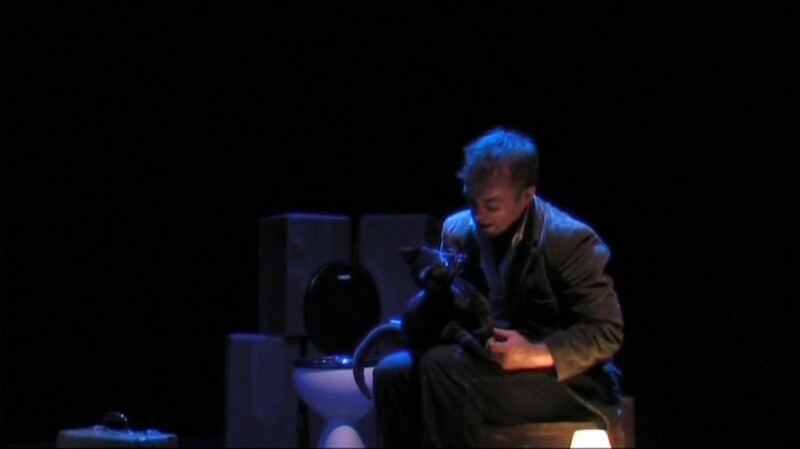 Would you trust a talking cat? 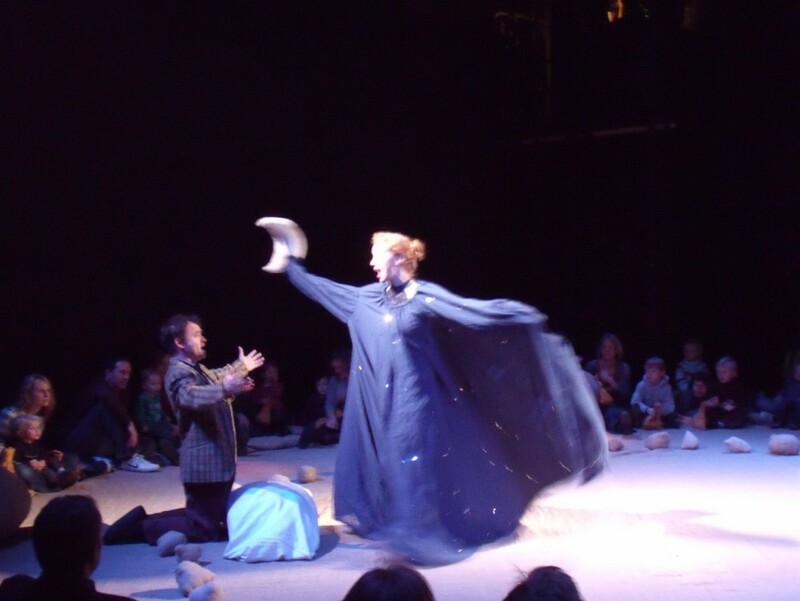 You never know, he might turn you from a pauper to a prince just like the hero of this story, brought to vivid life on our incredible sloping stage by Patrick Lynch from Cbeebies. 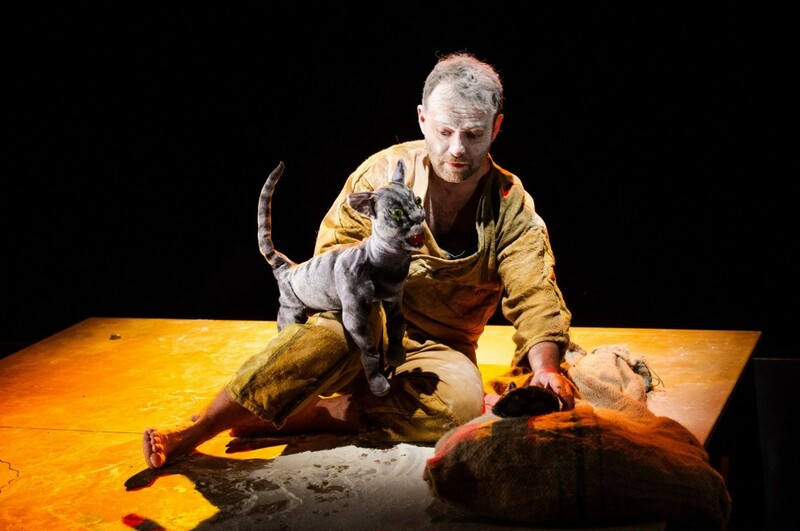 Using smoke and mirrors and hidden trapdoors he’ll show you how this sure-footed feline fools both the King and the Ogre to put his master at the top. 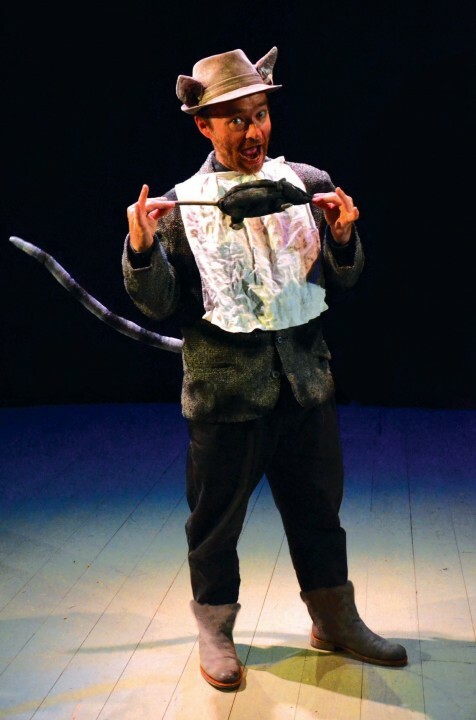 With a host of puppets, a working windmill and an avalanche of fruit and nuts come and see this classic furry tail. It’s the cat’s whiskers! 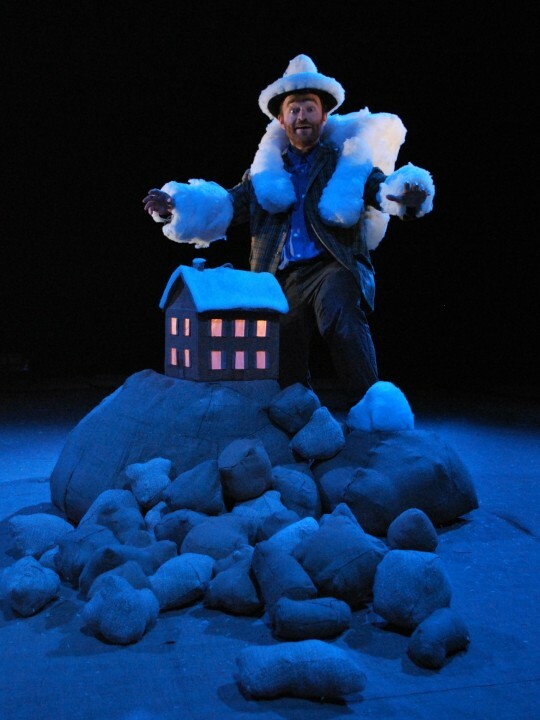 Heart of Winter (ages 3+) is our new Christmas show. 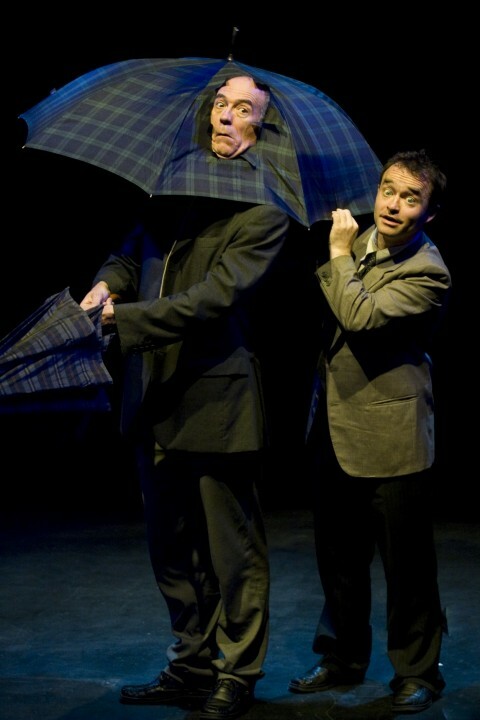 We will have the debut at the Watermans theatre in Brentford on the 9th of December. See SHOWS for images and details and check out the promo video here. 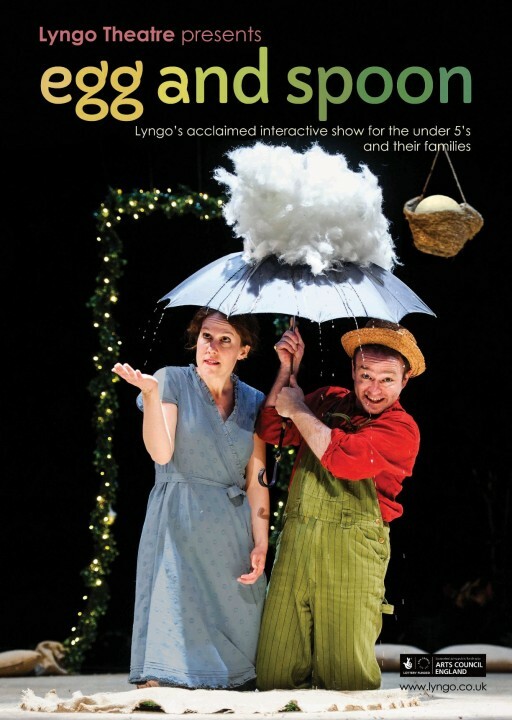 To mark 15 years of activity Lyngo are bringing back their very first show, revamped and specially adapted for a younger audience. 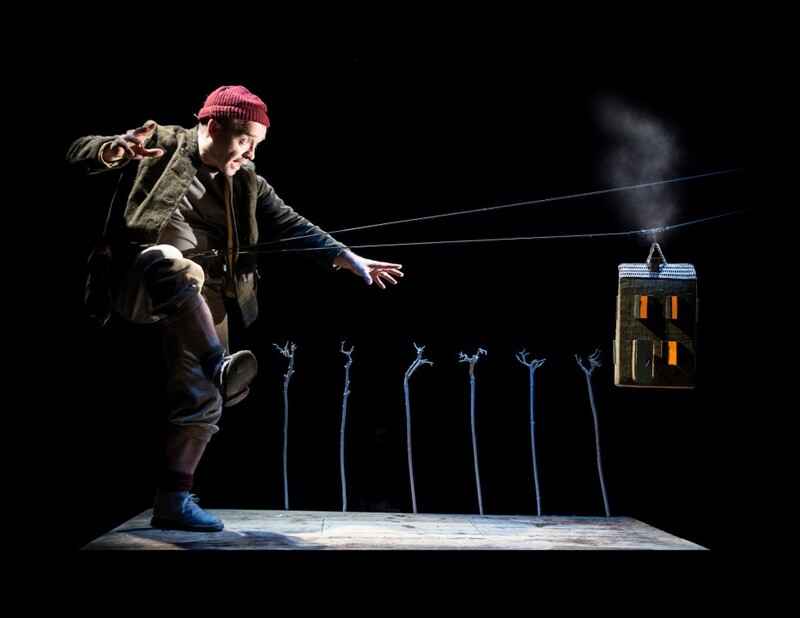 Tom Thumb has been our most successful piece, touring Europe almost continually for the past 10 years and racking up 1000's of performances. In 2018 we'll be touring the UK and Ireland with the definitive version, packed with new magical surprises. 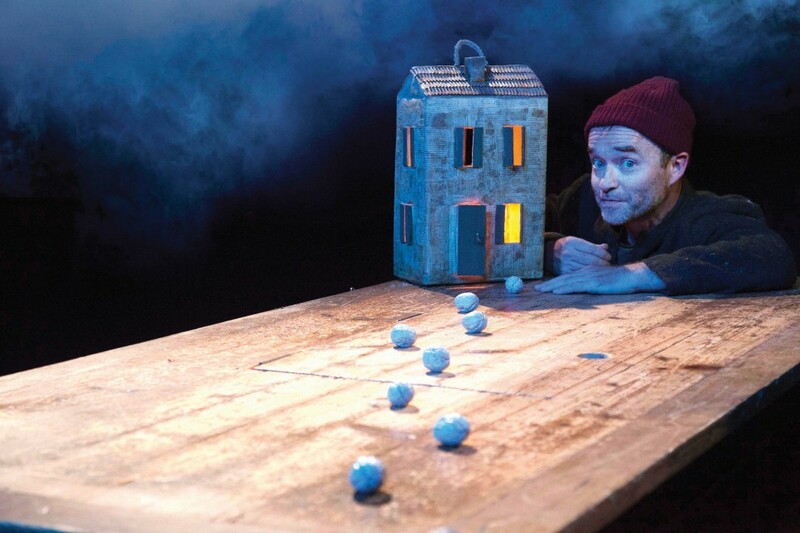 This table-top show is literally performed on and under an incredible kitchen table with trapdoors, growing forests and flying houses to amaze the younger audience and their families with one of the best of the classic fables. 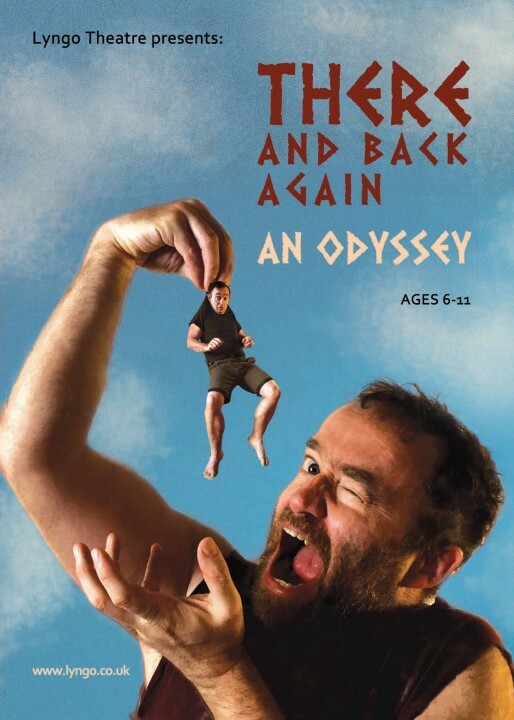 'There and back again - an Odyssey' is our new production for 2017 which ventures into the innovative genre of cinema-theatre, combining live theatrical experience with the thrill of the big screen. Please go to SHOWS to see details and images and watch the promo video here. 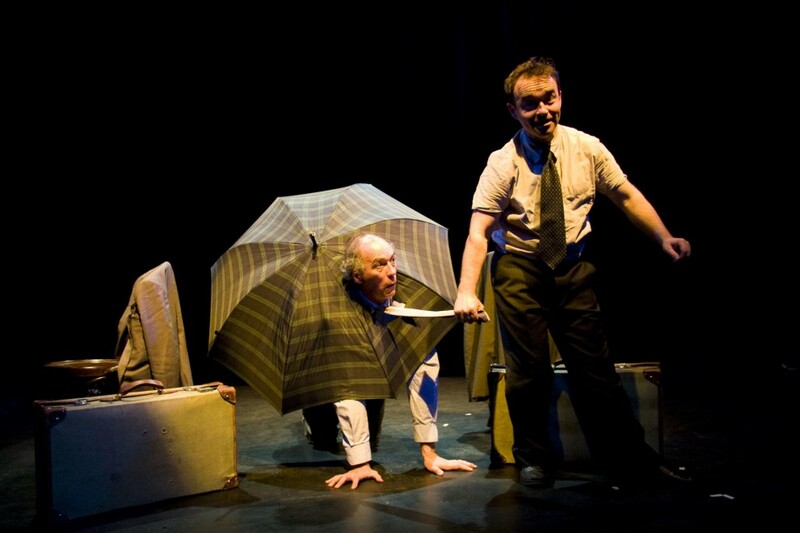 We have just started the tour and received these two brilliant reviews already! Here and here! The show has had a great tour in 2016 and we are taking bookings for the whole of 2017. You can watch a promo video here. 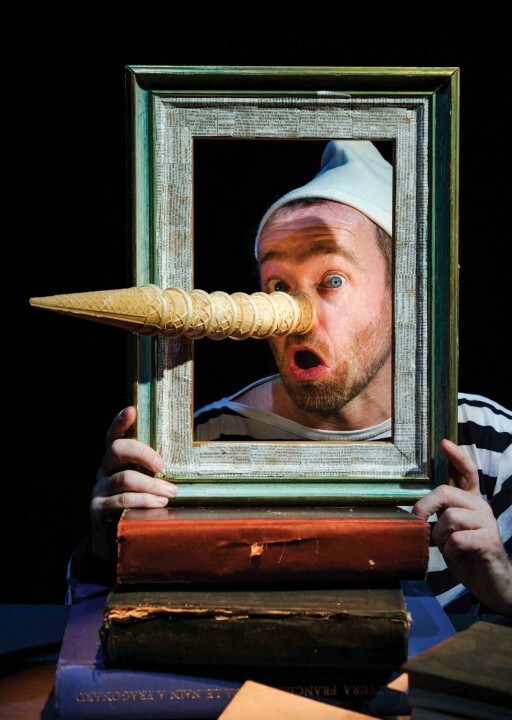 We took Pinocchio to Singapore last August and these are two lovely reviews: here and here. Read all the brilliant reviews here: read review here read review here read review here read review here read review here. Go to SHOWS for more details and images. 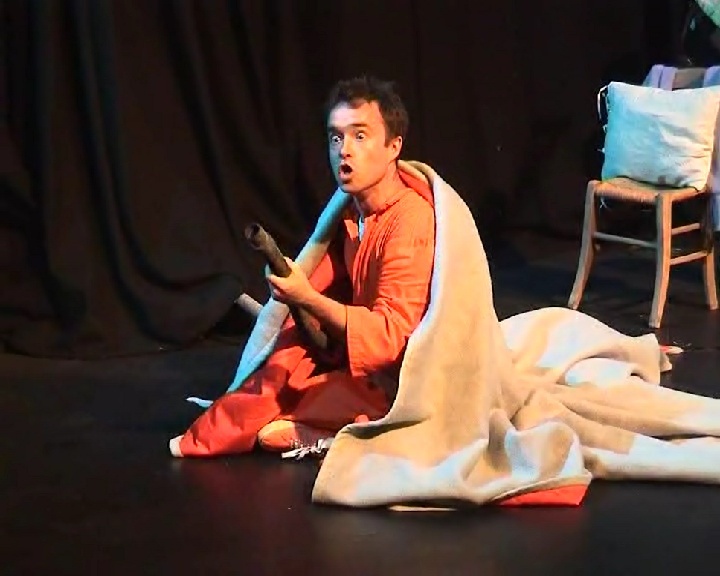 Outwitting his parents and the ogre Tom shows everybody that even though he is small he is still mighty as he protects his brothers, finds the treasure and makes sure they'll never be hungry again. 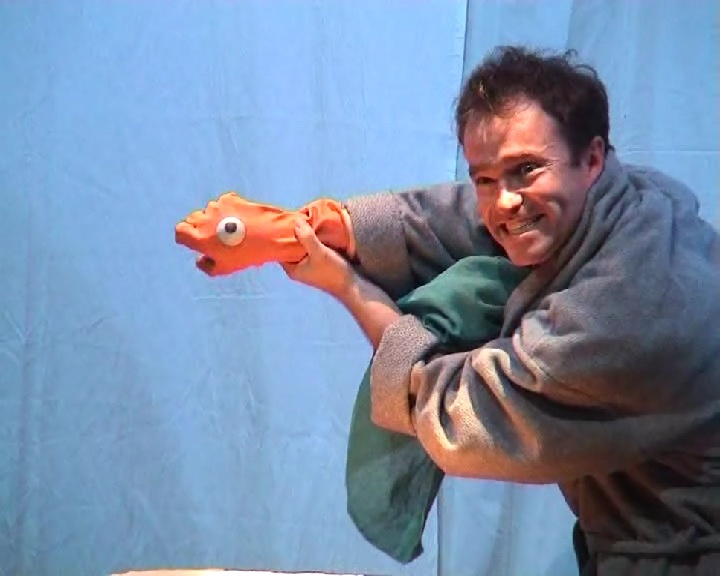 We all know what it feels like to be a fish out of water but our hero really is one in this bubbly show! 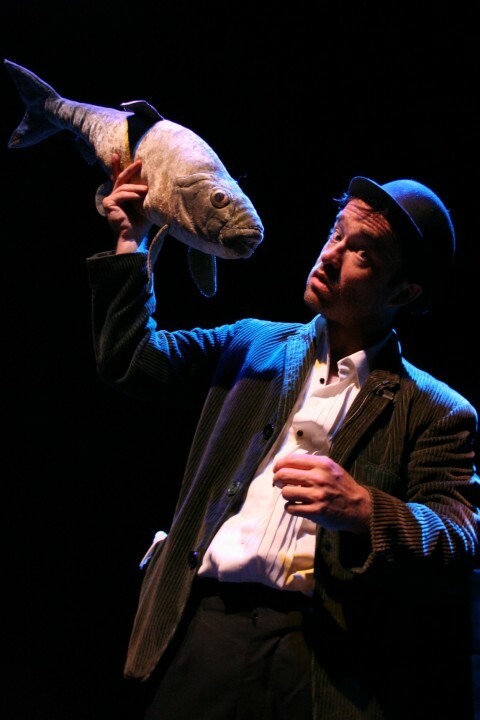 A little fish who lives in a glass of water gets knocked over by the cat and finds himself suddenly in our airy world of up and down populated by strange creatures like the hoover-fish and books full of fire. 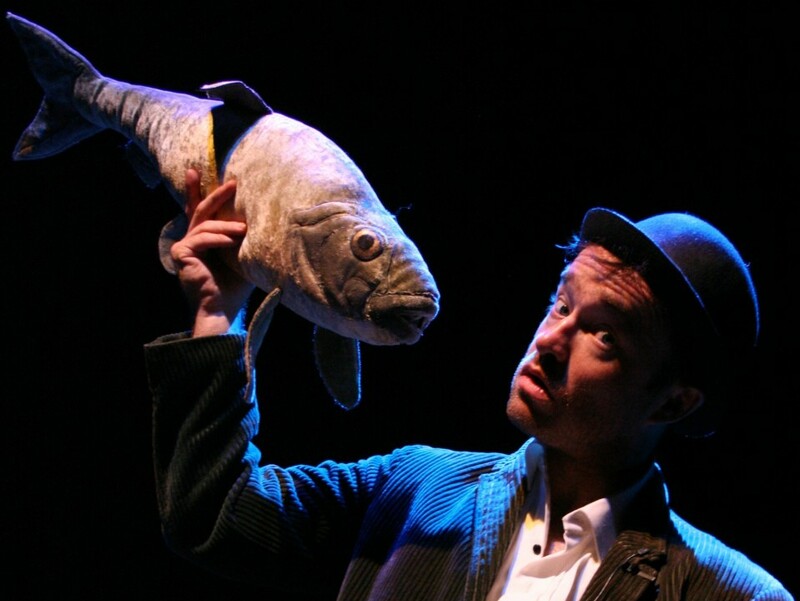 Our little fish has lots of questions like ‘how do you breathe with air?’, ‘Where do they keep the water?’ and ‘ why is the sky blue?’. Just like many small creatures we know and love he needs answers and he needs them now. This is philosophical cabaret for the very young presented with grace and poetry and a good dose of the surreal. 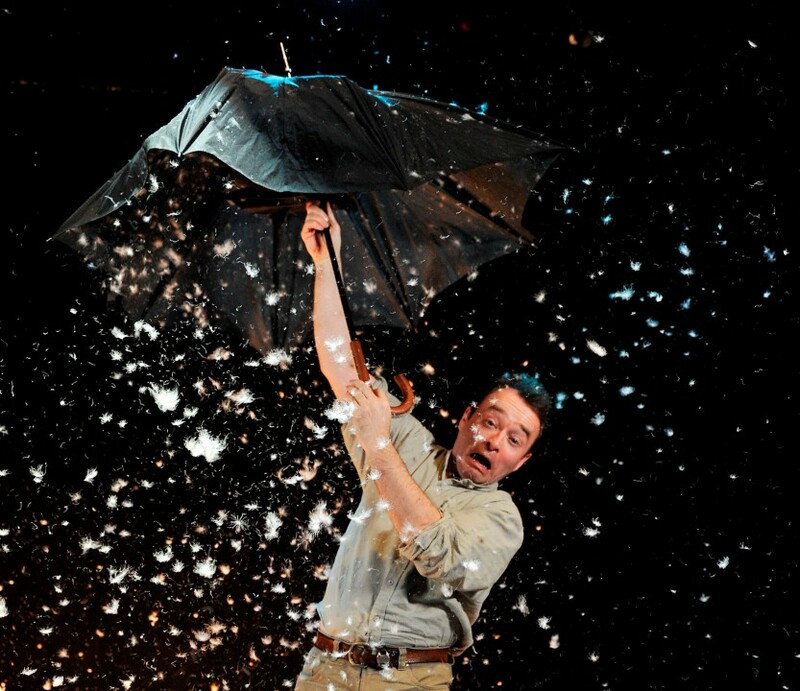 Accompanied by our amazing theatre toys - like an umbrella with built-in rain, a bowl full of stars and a pot full of bubbles – Patrick Lynch floats through a show full of laughs, surprises and some real scientific explanations where our young audience finally get some of their constant questions answered. 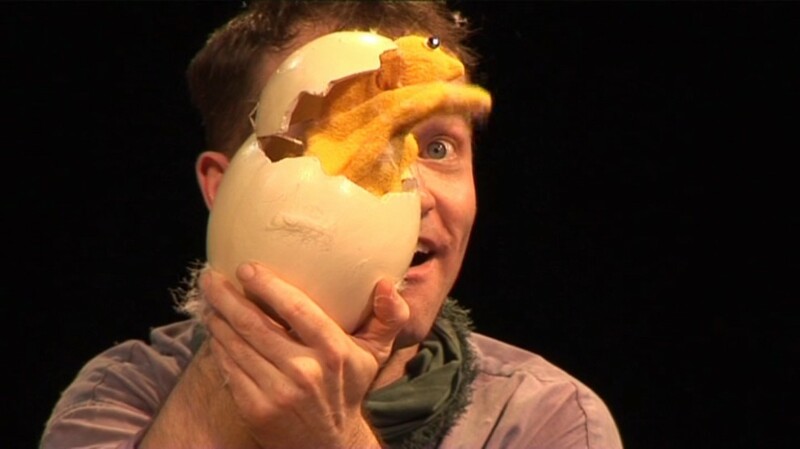 It all starts with an egg that doesn’t want to hatch...His mum is busy, like all mums these days, and can’t hang about. She’s got to get down South with all the other birds before the Winter arrives. So when she leaves Percy the gardener has to step in and see if he can convince Birdy to come out. Is he shy, lazy or scared? With that hungry eagle flying about he’s got good reason to be frightened but Percy isn’t alone in looking after Birdy. There is Nancy the invisible spider, Sheila the spitting fish and Jeremy the sleepy bear as well. Throw in the wolf and Polly the butterfly and this is our most populated show! 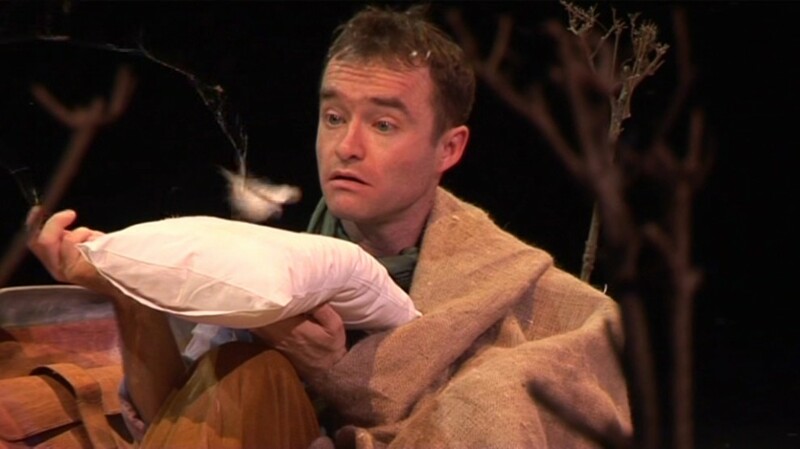 All characters are played or portrayed by Patrick Lynch in a show full of quick changes, magical disappearances and a host of excitable woodland creatures. 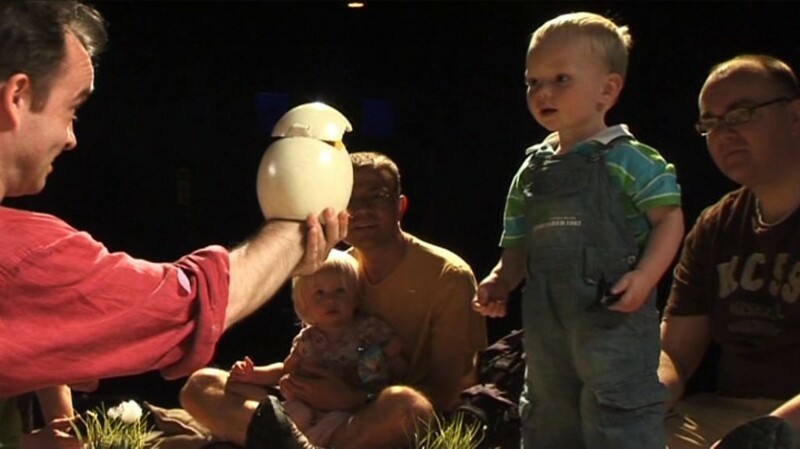 When Birdy does hatch out of his egg to say hello our audience really feels that they helped Birdy finally come into the world. Dreams are mysterious. We don’t know what they mean or why they happen but we know where they come from – The Dust Man makes them. He lives on the other side of the mirror where all the forgotten dusty things end up. 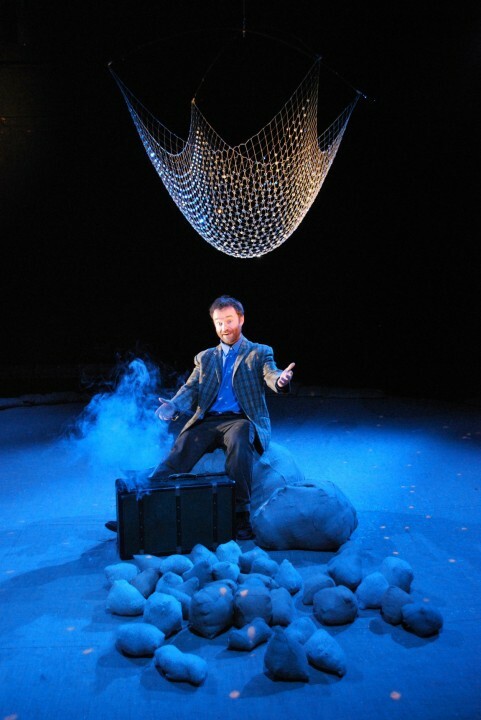 From the flotsam and jetsam of your memories and wishes he constructs your personal dream voyage for you every night. All of us dream so he’s pretty busy and with the toilet-phone constantly ringing and the night falling into a saucepan it’s really a nightmare for him. 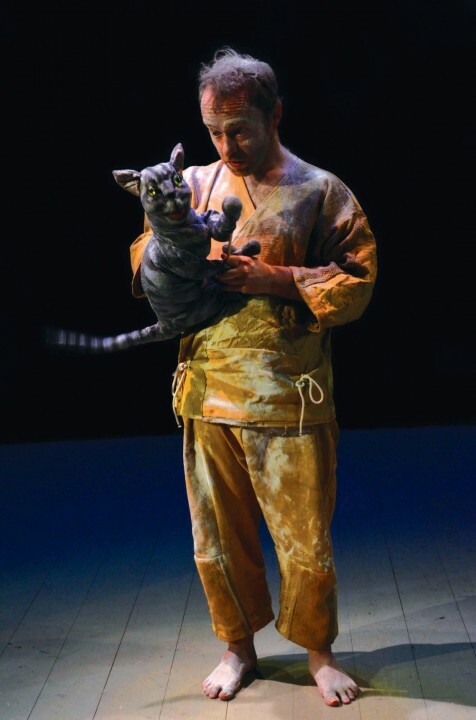 Nero, his cat, is there to help him though and tonight they are both going to make your dreams come true in front of your eyes in a tour de force of stage illusions and surreal events. 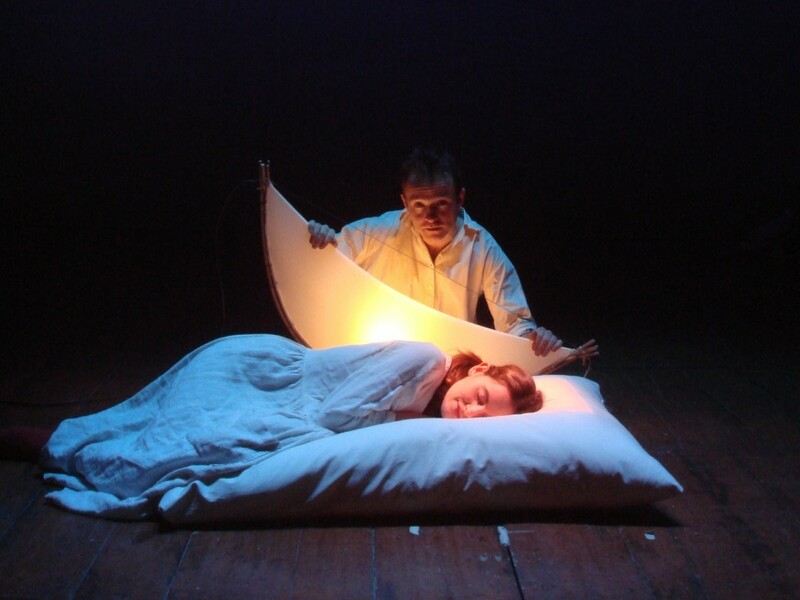 You’ll be constantly rubbing your eyes and pinching yourself in this show where it is always 9 o’clock but not always bed time and where we find out what to do if you are afraid of the dark. Close your eyes, open your hearts and get ready for the best day-dream you’ve ever had. 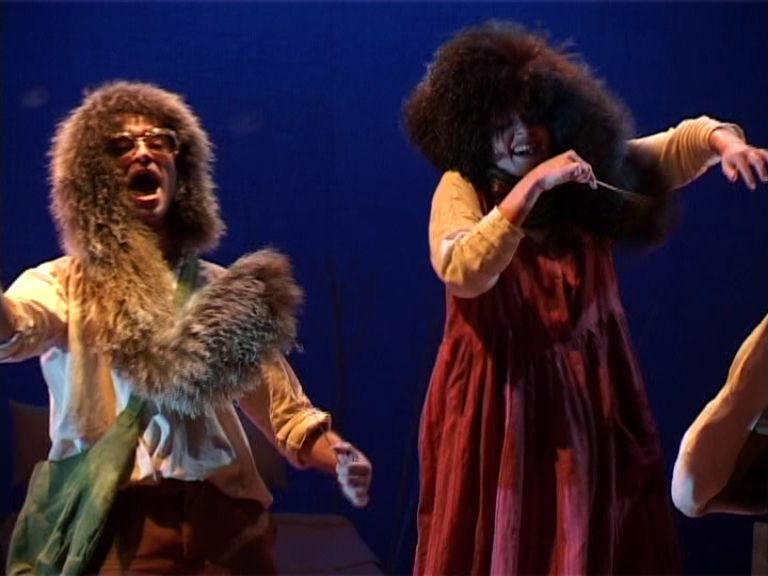 A musical theatre version of this classic brother and sister tale of adventure and magic where we’ll have you humming along throughout and cheering as the witch slides down into our flaming oven. Is hunger stronger than love? 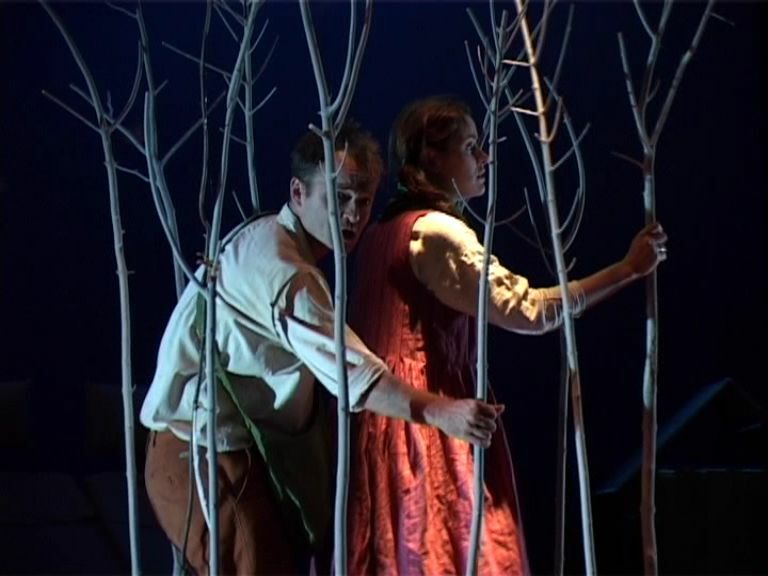 In this story it seems to be as the poor woodsman’s empty stomach goes to his head, he gives in to the bony step-mother and they leave Hansel and Gretel in the forest, not just once but twice and the second time there won’t be any moonstones to follow back home. Instead they follow their noses to the sugary heart of the forest where the witches are waiting. 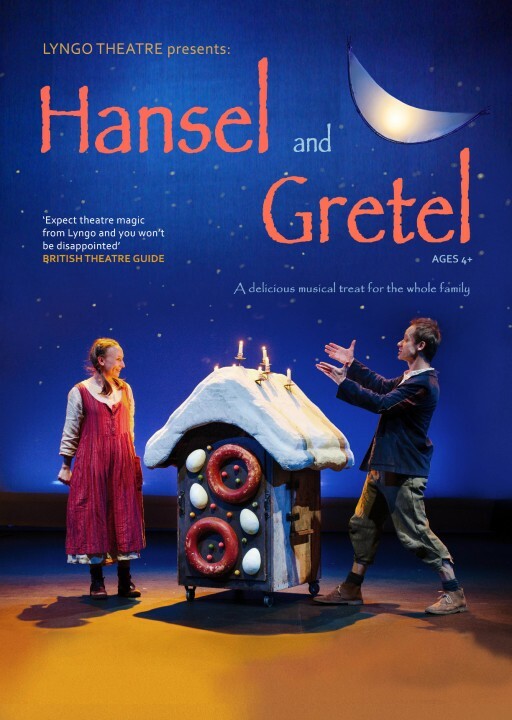 Hansel and Gretel’s musical journey takes them from a house with empty cupboards and a step-mother who doesn’t like children to a house made of sweets and someone who just loves children – on toast! Lyngo serve up a musical theatre treat with their own special recipe of multi-roled performances, captivating songs and beautiful imagery. 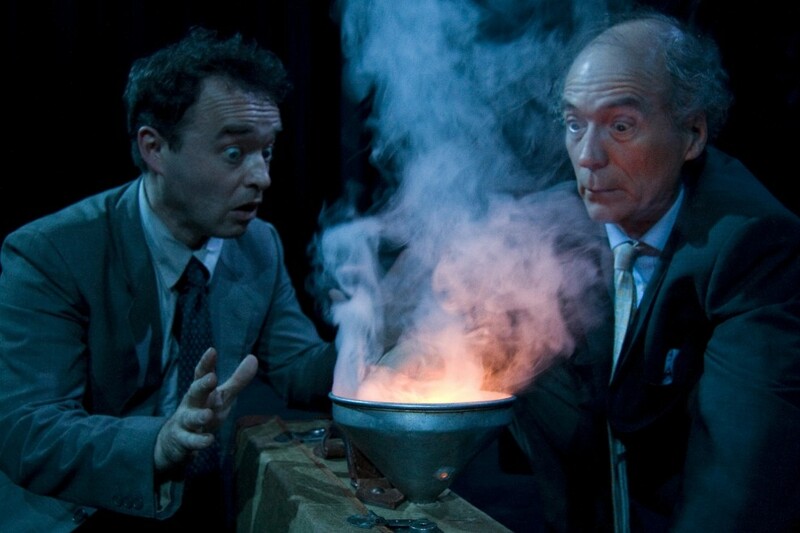 Usually actors know what they are doing but when Mr Rossi turns up to do this show with Mr Lynch it always goes wrong. Mr Rossi hasn't learned his lines and doesn't even know how the theatre works. What's worse, he doesn't even speak English! Every time Mr Lynch tries to start the show Mr Rossi always messes things up and they take off in a different direction. 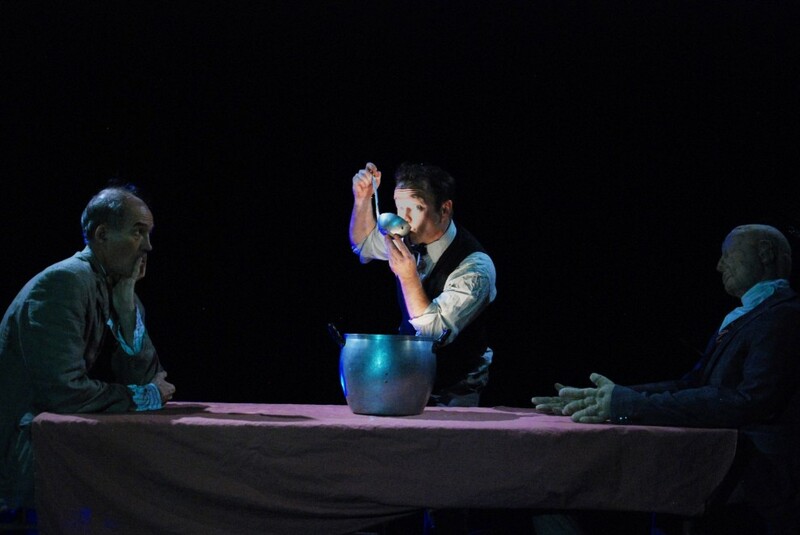 As Mr Lynch shows Mr Rossi how the theatre works they play with and distill all the usual theatrical conventions, creating new magic for the audience. They pull and stretch out light and throw it around, catching it between their fingers. 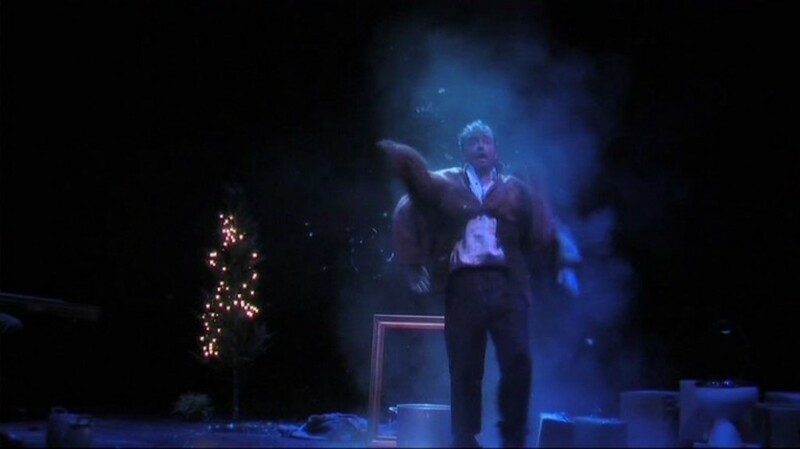 Sound effects suddenly become real and explode on the stage. Shadows become solid and solid things become insubstantial and we see the actors pass through them. 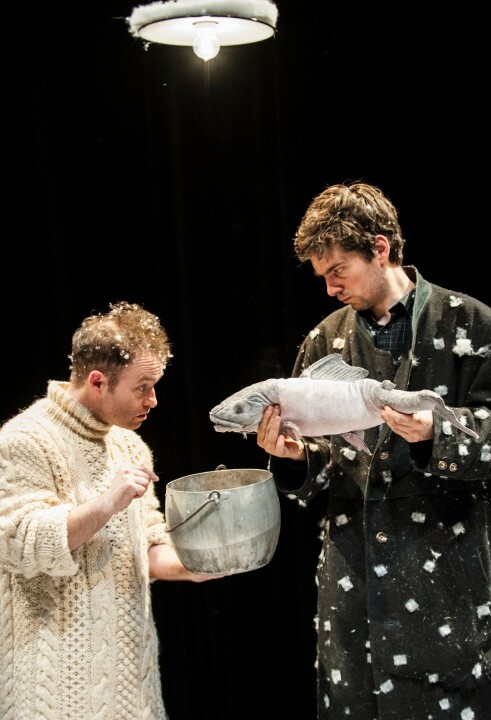 As they struggle with each other to get somewhere they take the audience on a fantastic journey passing by shrinking desert islands, some frantic Shakespeare and a storm at sea. 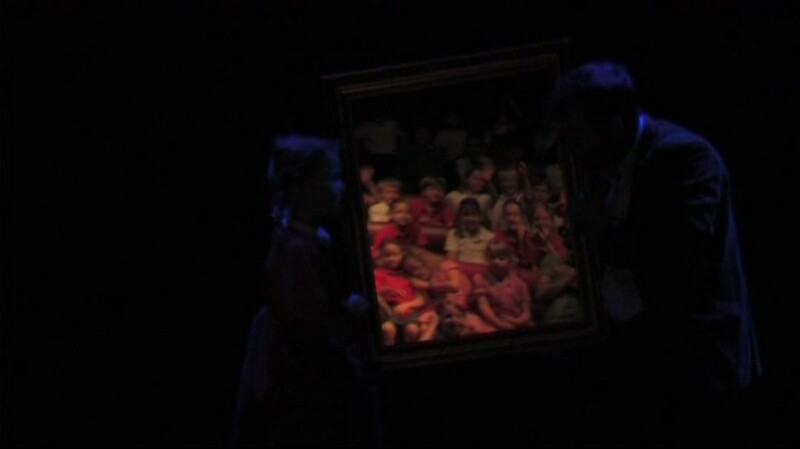 The audience are invited on stage and the show spills out into the auditorium collecting them up for a giant size instant photograph. 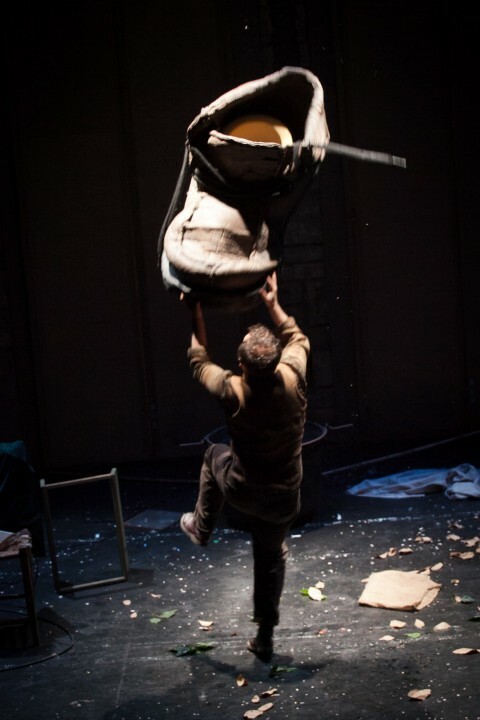 This is a show all about the theatre and the wonderful things that an audience and actors can create – together. What would you do if one year Winter decided to stay and moved into your house? You would have icicles in the kitchen and snow all over your bed! 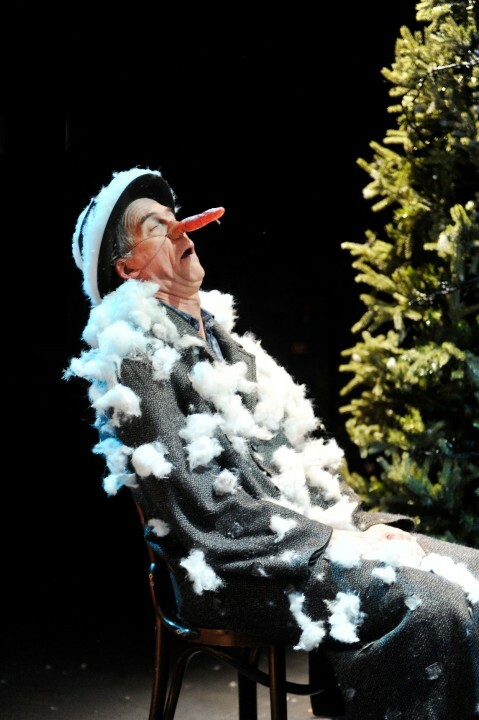 Well that’s what happens in our snowy spectacular show where you are guaranteed a white Christmas, no matter what the weather or the time of year! 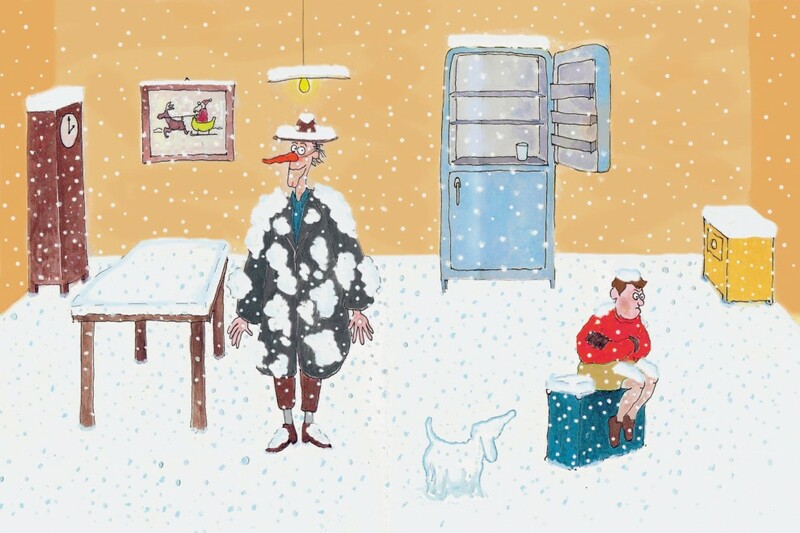 When Mr Green comes back from holiday to find Mr White in his house it's the start of a brrrrilliant series of adventures as Mr White covers the whole house in snow and Mr Green does everything he can to get him outside into the garden. 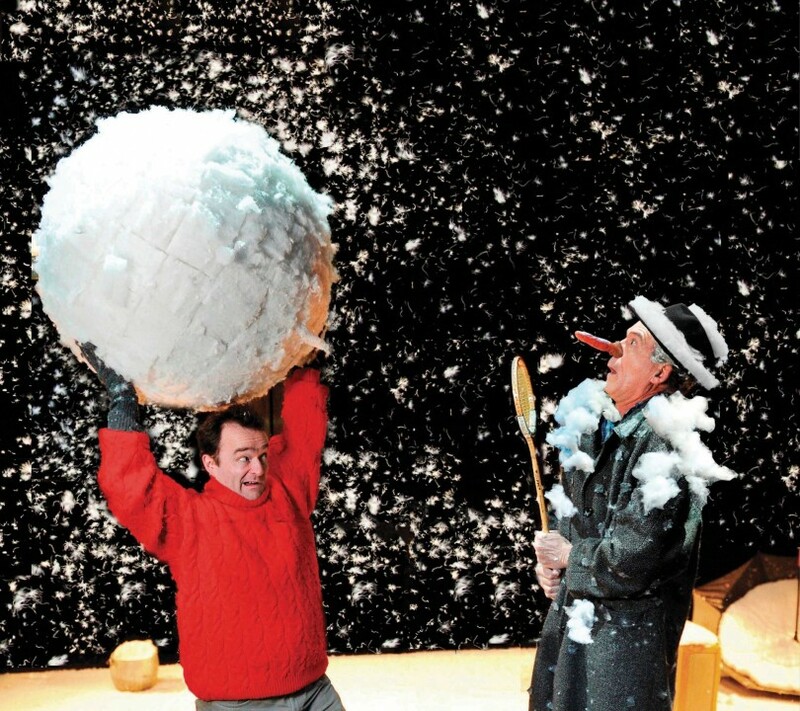 The audience gets stuck in too with their own snow, making a snowman and joining in with a massive snowball fight. But it's getting warmer and, as Mr White stars to melt, the tables might be turning... 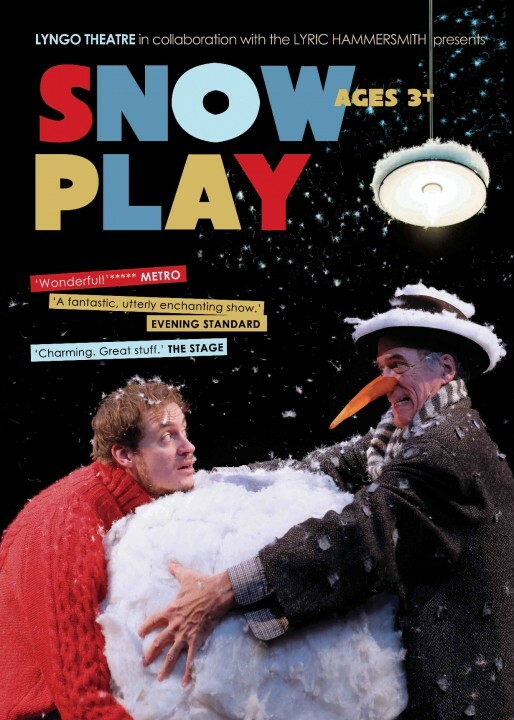 Snow Play is a showdown between Winter and Spring over who gets to stay and who has to go away! Take Castaway, the Marx Bothers and It’s a Wonderful Life, mix them all up and you get this story which shows us that no man is an island. 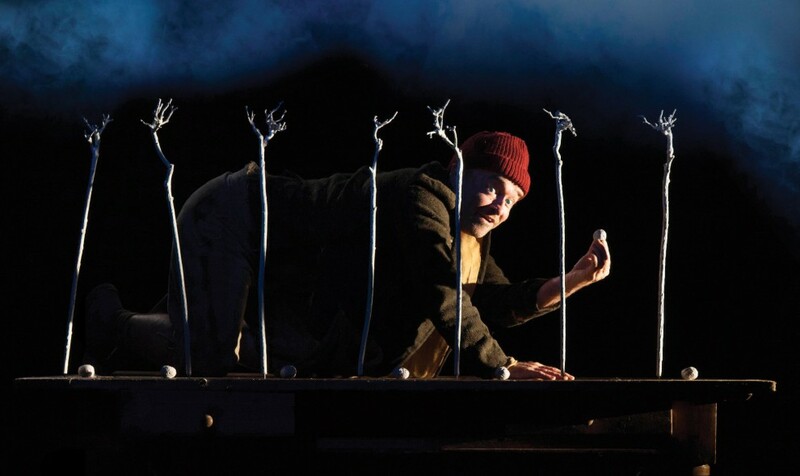 Knick lives on a big smelly island of rubbish all by himself and spends all day sorting through our crud and clinker – it’s not a wonderful life! But it all changes when Doo Dad arrives. He’s here to help, but actually ends up making everything worse. 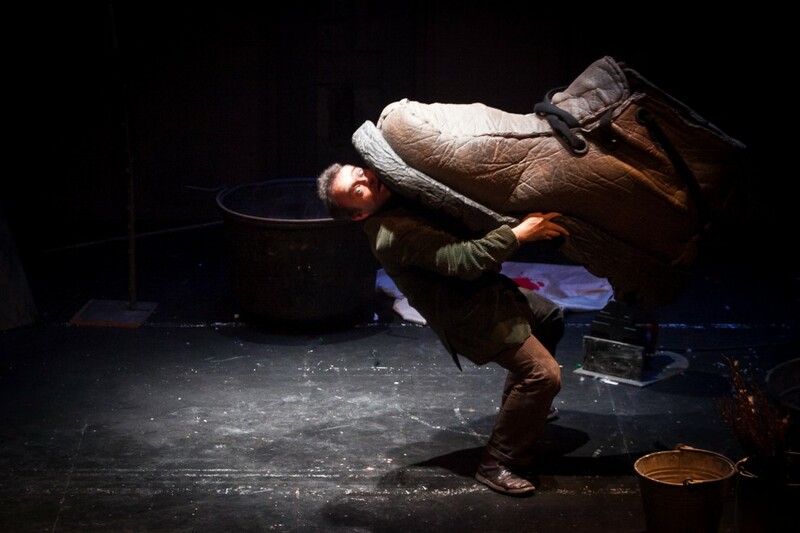 If only he could show Knick what friends are for he knows that the rubbish dump would burst into flower – but how do you help someone like Knick who doesn’t want to be helped? And should you? 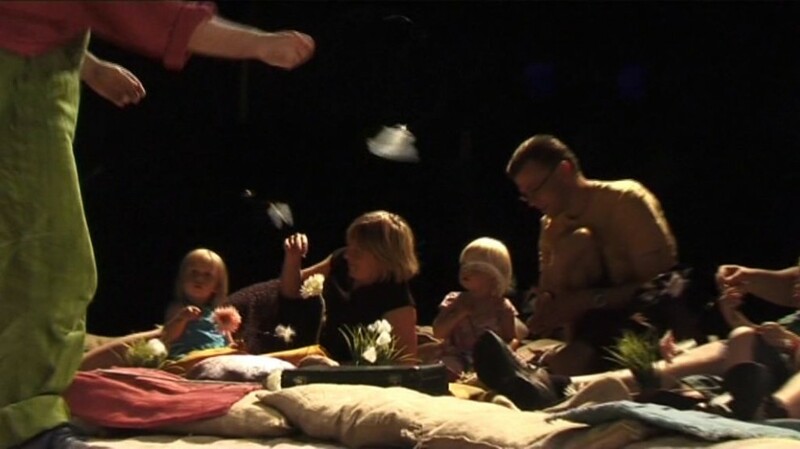 We want you to help us decide and to join in with the rubbish storm, the crying chorus, and with making bubbly fire and ha-ha food in this highly interactive show about how silly it is to be sad. We'll have great fun as we transform our trash into amazing new toys and reboot your recycling routine into something special. Come along and discover all the reasons to be cheerful and find out what finally makes Knick Knack smile! 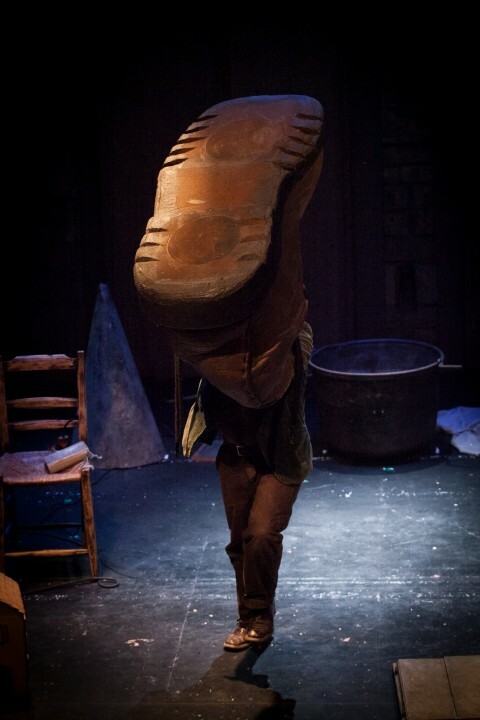 Fee Fi Fo Fum! 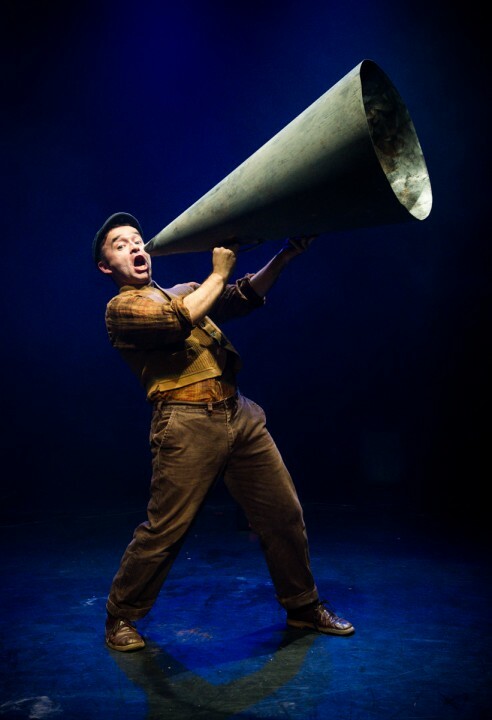 It’s a giant of a show, we’d love you to come! 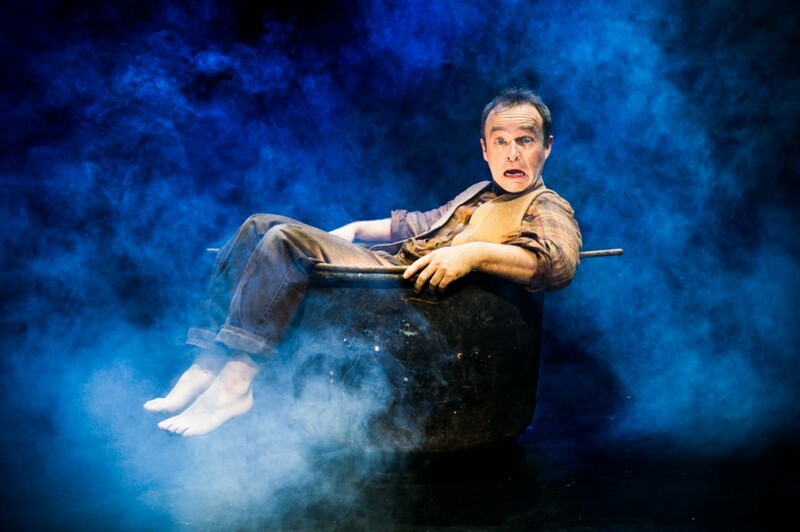 This classic fairytale now gets the Lyngo treatment so expect lots of surprises, a gripping story and beautiful images as Jack sells his cow for 5 magic beans and finds himself in the land above the clouds. 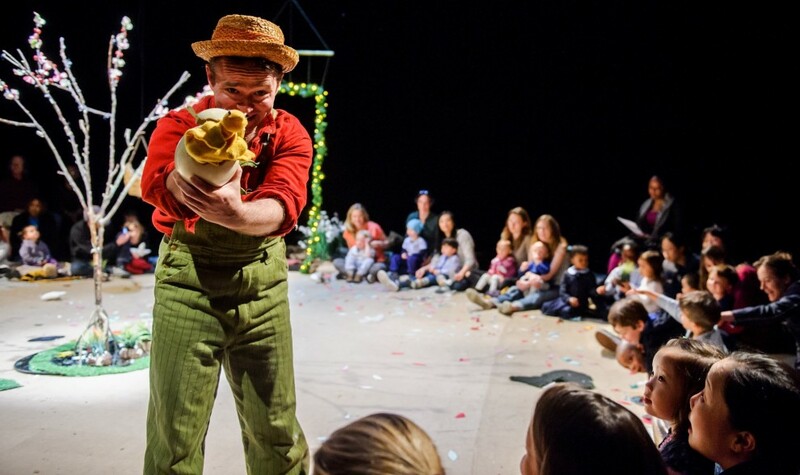 It’s a show for the over 3’s (and their giants) with something for everyone – enormous shoes, tiny houses, showers of silver and gold and a big, leafy explosion! 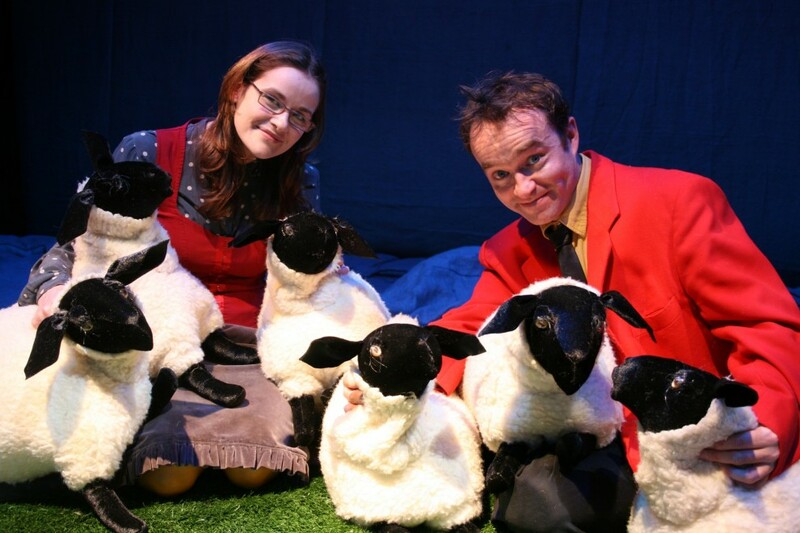 Lyngo Theatre are bringing out their next fabulous fable. 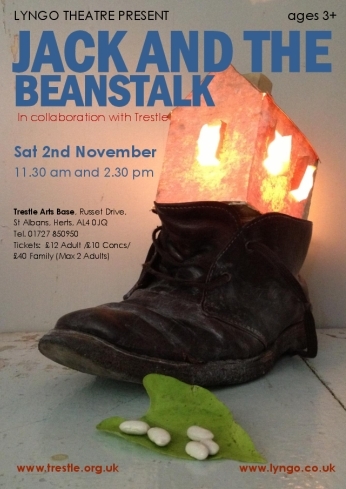 As with our last show - 'Jack and the Beanstalk' - this is no pantomime. It does full justice to the adventure and depth of the original story. It's not behind you, oh no it isn't. 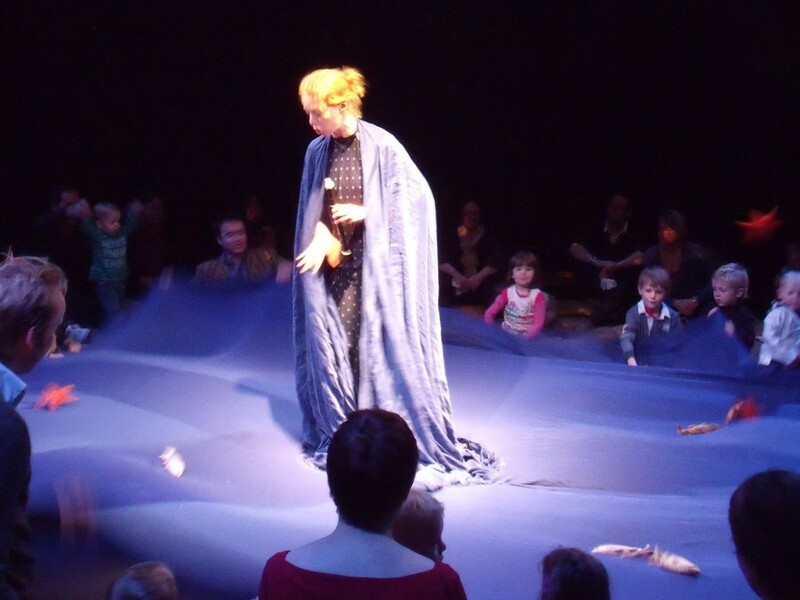 Our magical story is all right in front of you is a perfect 50 minutes for ages 3-8. 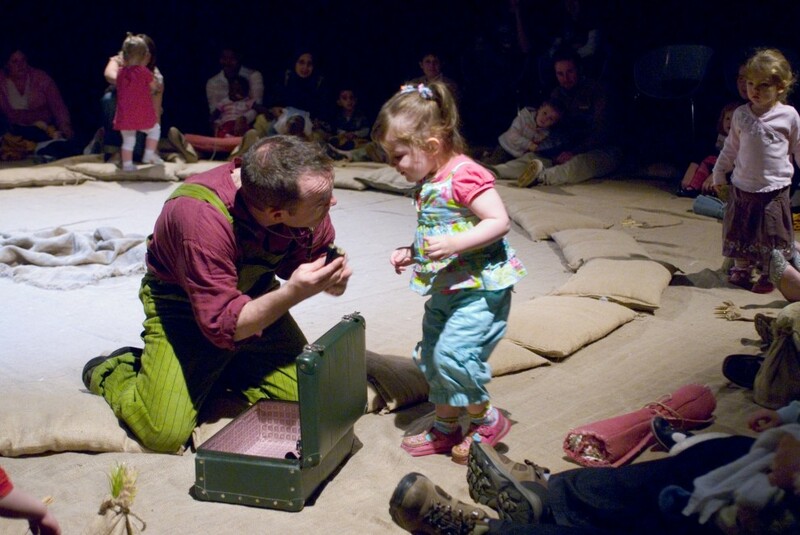 We have developed a stand-alone sloping mini-stage that allows us to surprise and delight the audience with drawers, trap-doors, puppets and shadow-play. 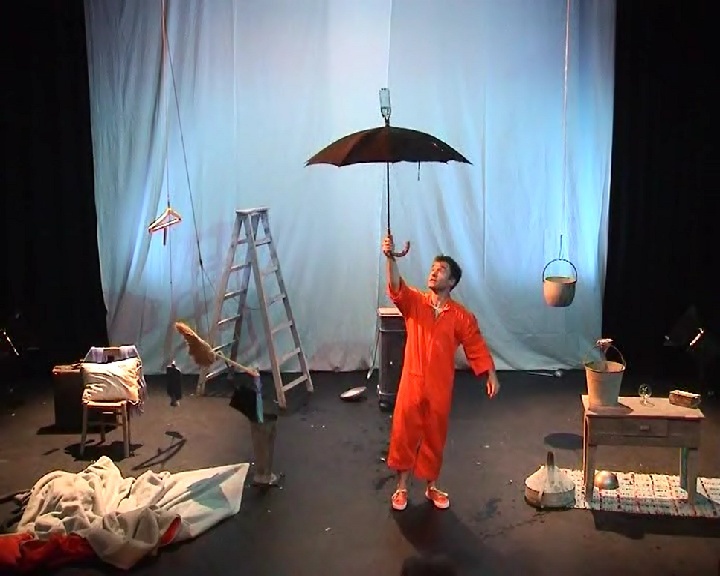 It's suitable for small to mid-stage theatres. 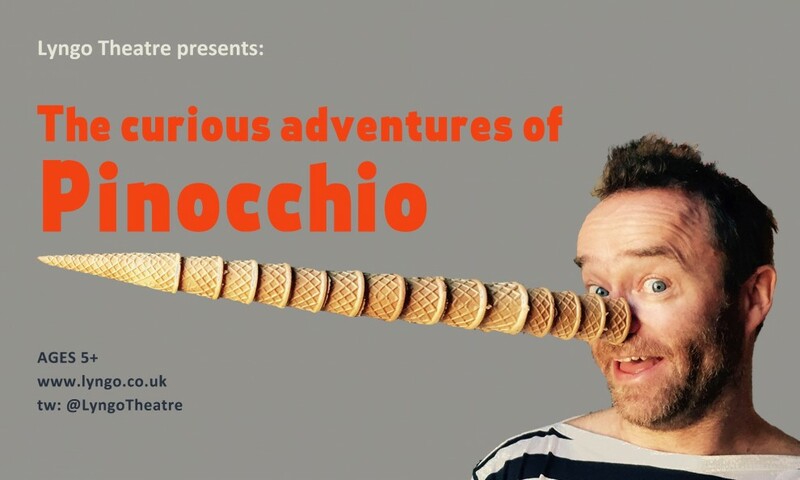 'The curious andventures of Pinocchio' is the title of Lyngo's new show. 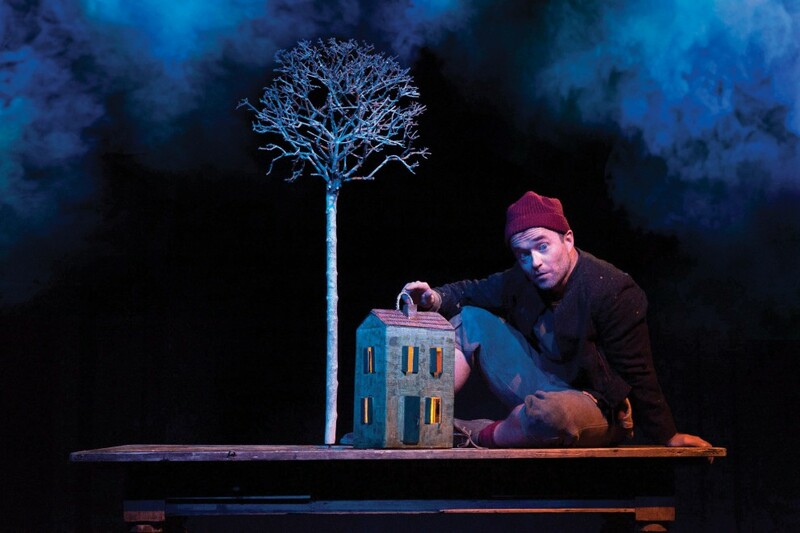 We are adapting this epic tale into a unique retelling where the story leaps off the page and onto the stage. 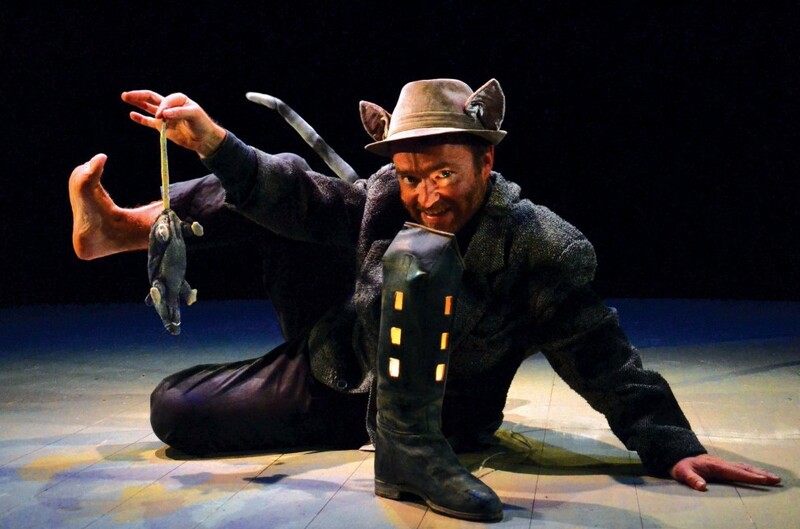 Crickets, cats, foxes and, of course, the world-famous puppet, will spring out of our collection of dusty, old, magic books, while Patrick Lynch from CBeebies pulls all the strings and turns all the pages to bring you the true story of Pinocchio, no lie. Who nose? He might even find his father and become a real boy. 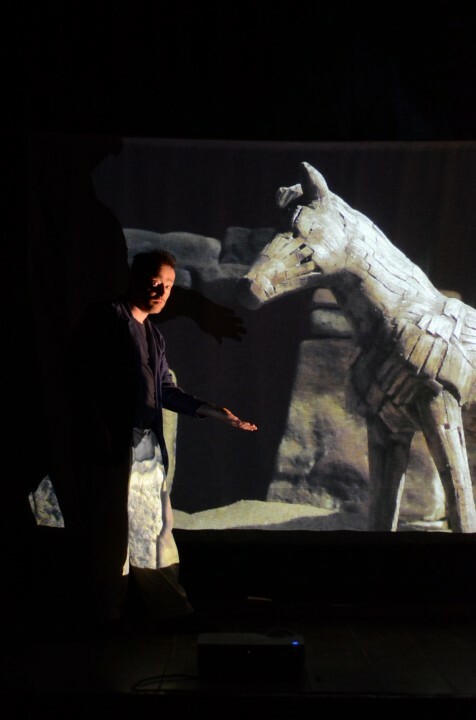 Follow CBeebies Patrick Lynch as he uses a pioneering mix of live cinema and theatre to take you on a thrilling ride across the magical world of ancient Greece. 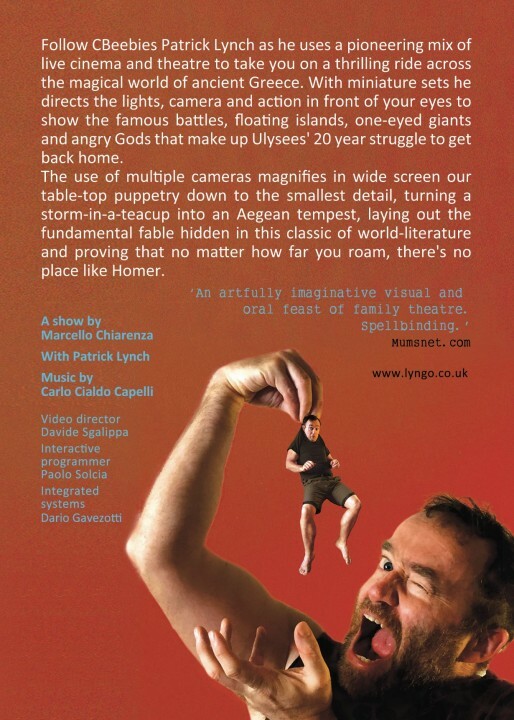 With miniature sets he directs the lights, camera and action in front of your eyes to show the famous battles, floating islands, one-eyed giants and angry Gods that make up Ulysees' 20 year struggle to get back home. The use of multiple cameras magnifies in wide screen our table-top pup-petry down to the smallest detail, turning a storm-in-a-teacup into an Ae-gean tempest, laying out the fundamental fable hidden in this classic of world-literature and proving that no matter how far you roam, there's no place like Homer. Christmas is coming and Sally can't sleep – it's far too hot! 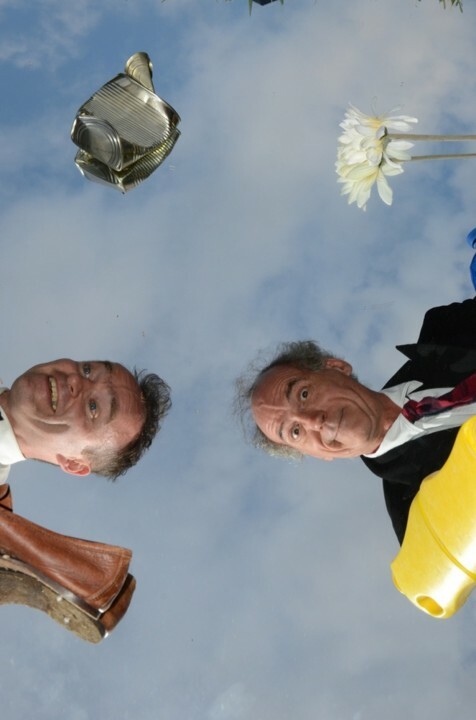 The weather has gone topsy-turvy. 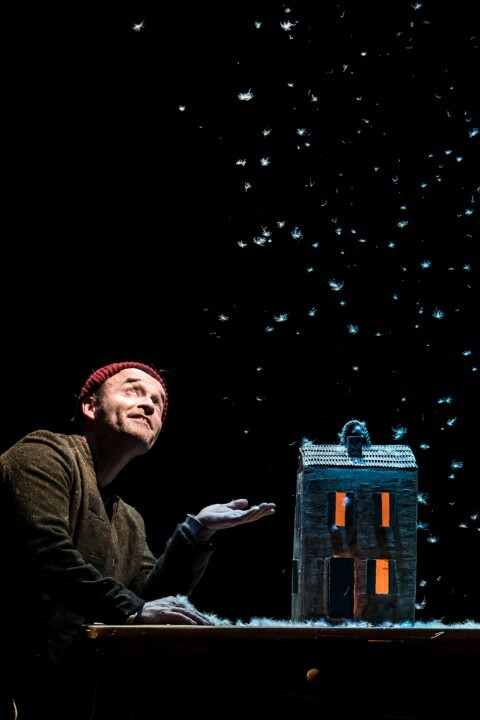 No-one can remember the last time it snowed, or even rained, and her father can't sell any of his umbrellas. To help her sleep Dad reads her a story about the last snowflake. 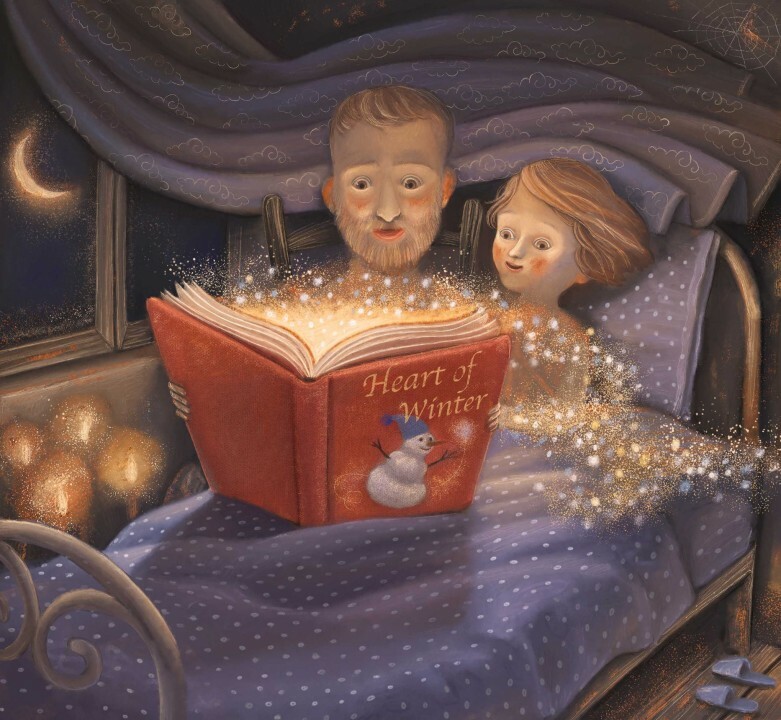 That night Sally has a dream that changes everything – a mysterious silver spark transforms her bedroom into a glistening, white field where she meets the glowing heart of Winter. 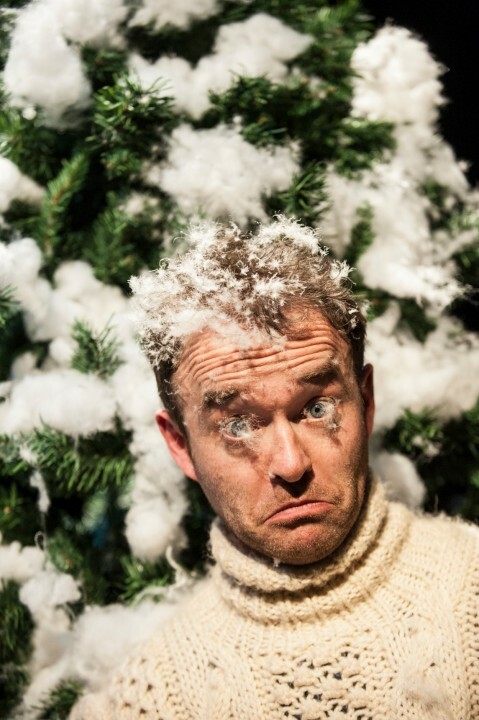 Heart of Winter is Lyngo's magical new musical show which warmly celebrates family, friendship and the good fortune of finding the winter we really need and want…with the precious festive offering of lots of fluffy snow! This is Lyngo’s second in-the-round show for the very young. 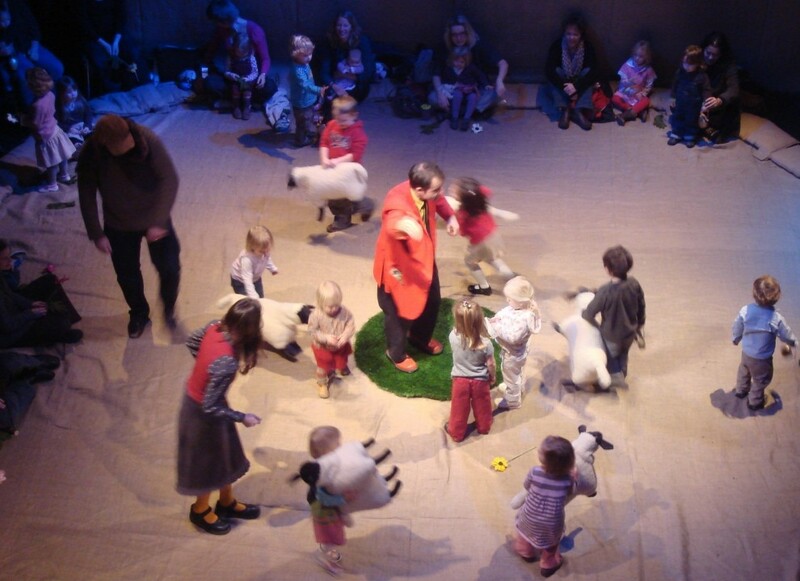 Roll up, crawl up and toddle up to the smallest biggest Circus in the world! 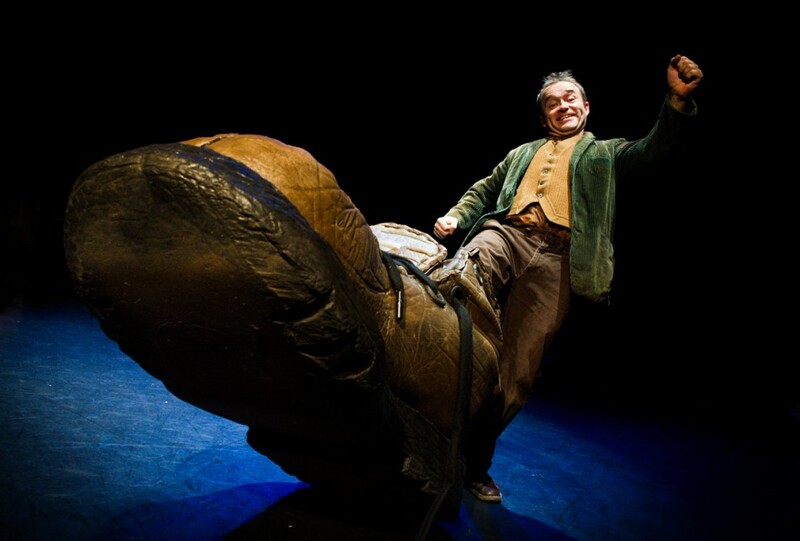 General Tom Thumb is your ringmaster and once your are settled in our circular circus it’s time for the show to begin. And you are the show! There is nothing more spectacular than the breathtaking feats of a family - Mums spinning plates, Dads flying by the seat of their pants, little clowns and tiny tigers. We put you in the ring and let you do your thing! 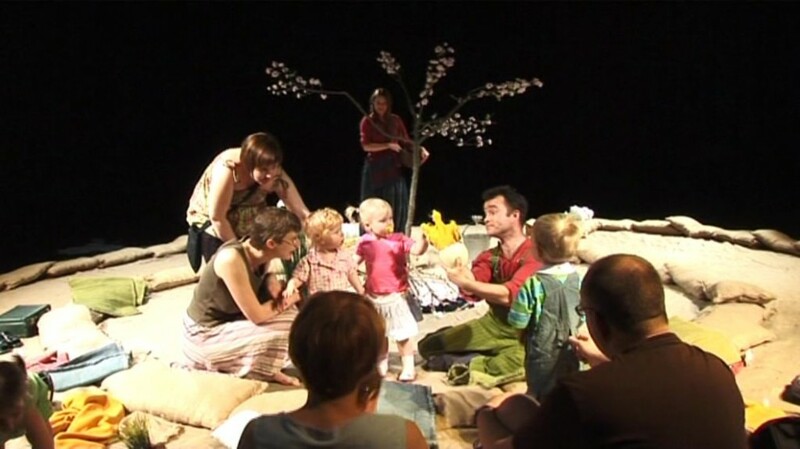 Like all our shows for the very young you can either relax on our cushions or get up and into the spotlight. 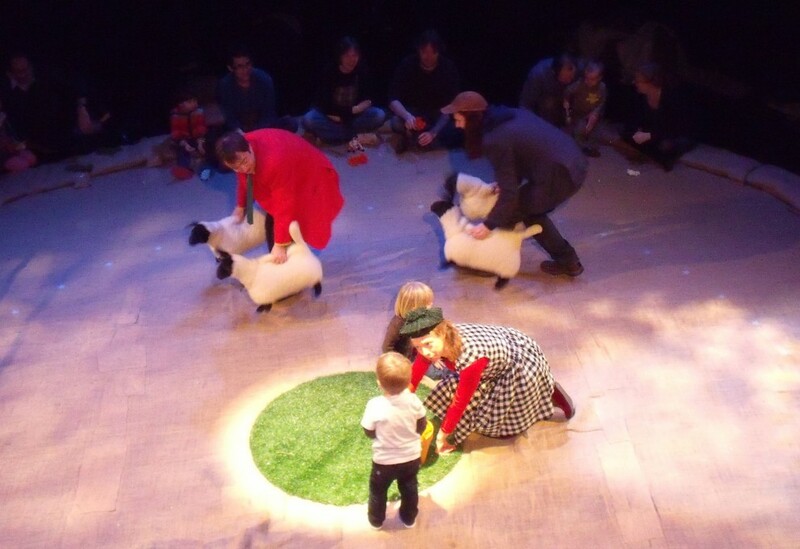 In this guided interactive journey through domesticity we start in the garden with the sheep parade and head for the dining room where we serve up the sun and the moon on our giant tablecloth. 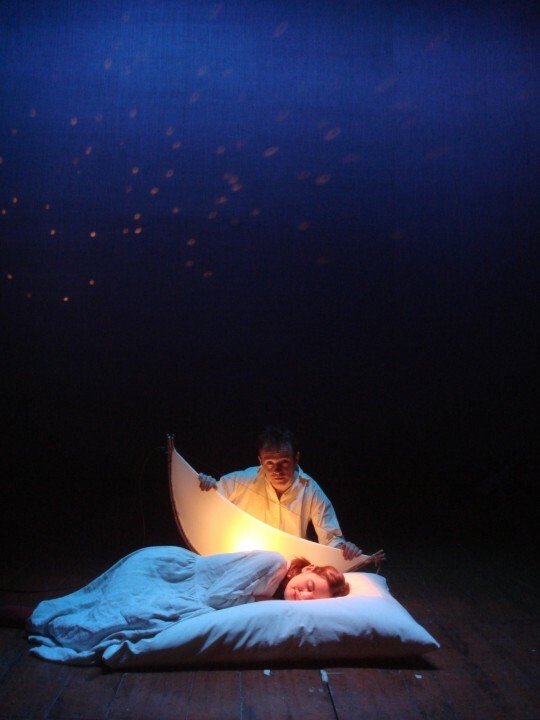 Instantly we find ourselves in bed where it’s time to dream of the ocean of night and the sparkling star fish while a flying jellyfish looks down on us, waving luminous tentacles. 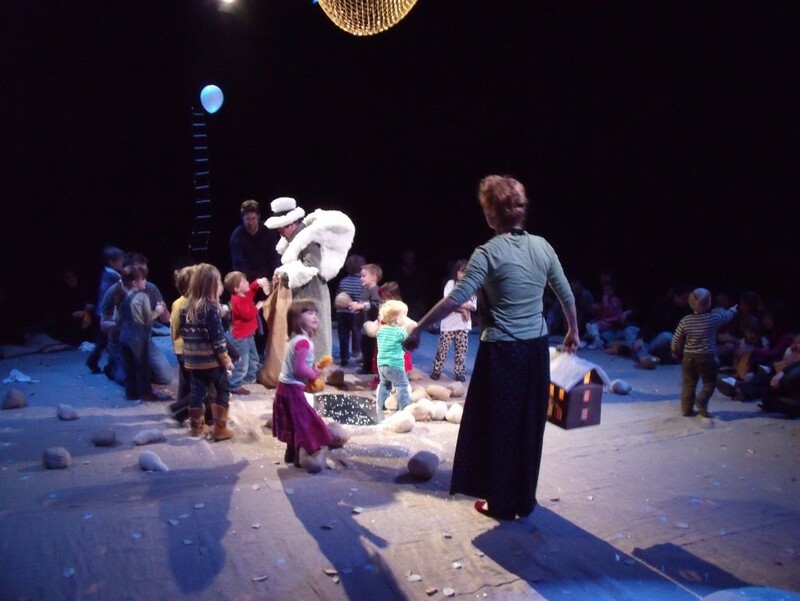 Circus Minimus will show you that you are having the greatest adventure possible – being a family. 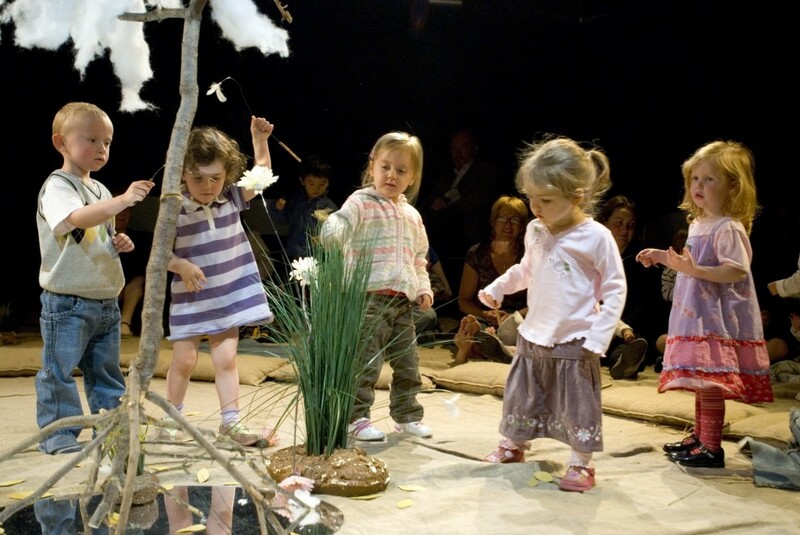 For the last of our trilogy of early years shows we’ve gone all-out. 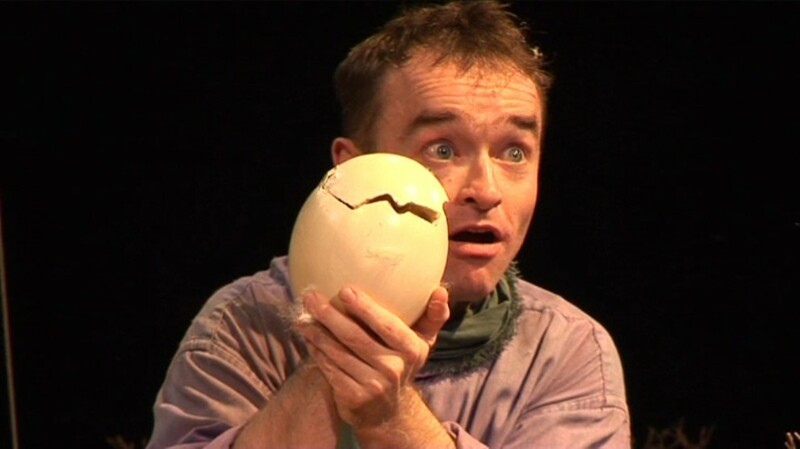 Our first show was about a tiny egg, our next about family life and now we look at the whole of creation! But before anything new is made it must be dreamed. From our moon-base in the Sea of Tranquility we get a great view of the earth and it’s time to make a new one just like we do every night! What shall we put in tomorrow’s world? Snowballs and flamingos of course! So all aboard the sleeper train as it takes us on our dream voyage. 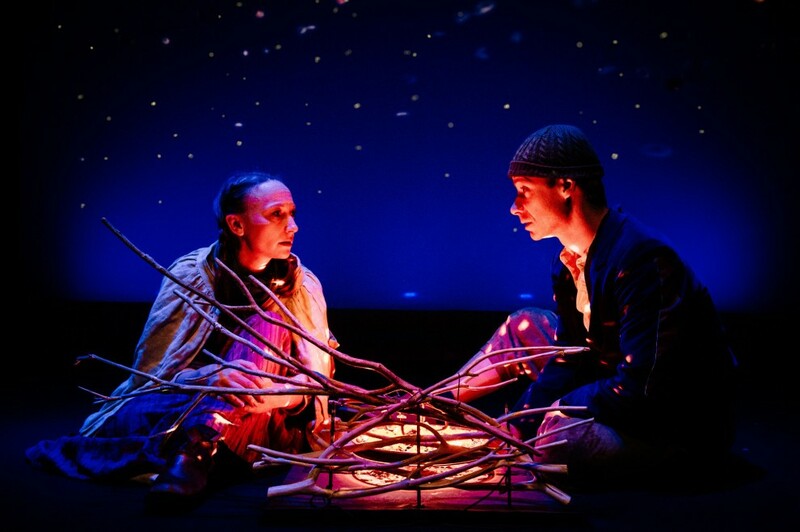 We start with putting the stars in the sky and move through history, discovering fire all over again and finally arriving at the one-world tree where we celebrate the new world that we made all together. This is an amazing romp through the universe where you can get your hands on the stuff of creation! 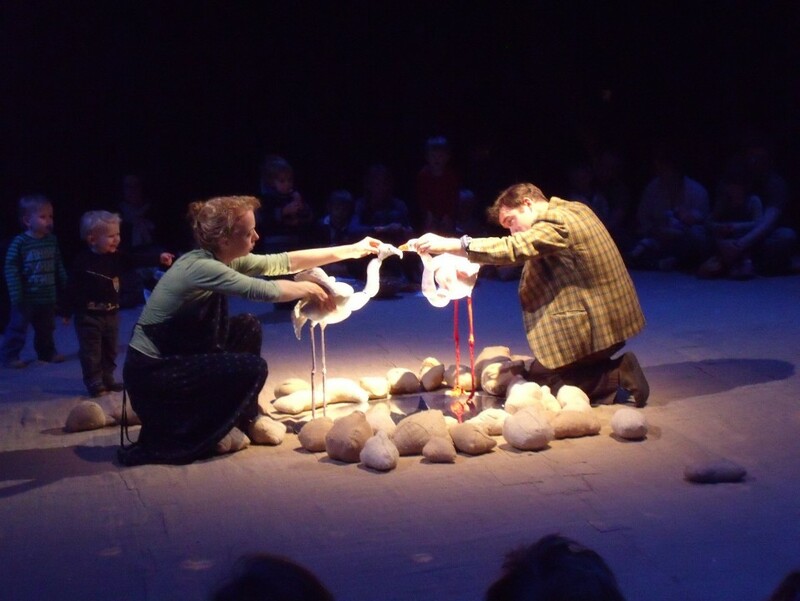 Our first special theatre show for the early years. The very young won’t sit still to watch a show and we don’t expect them to. 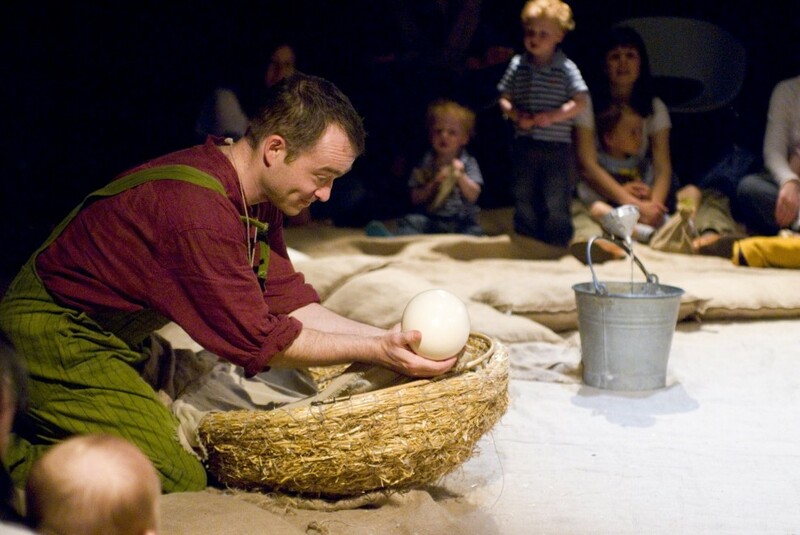 Egg and Spoon is an interactive romp through the seasons where you come in and out of our magic circle and get to open all the gifts of nature. 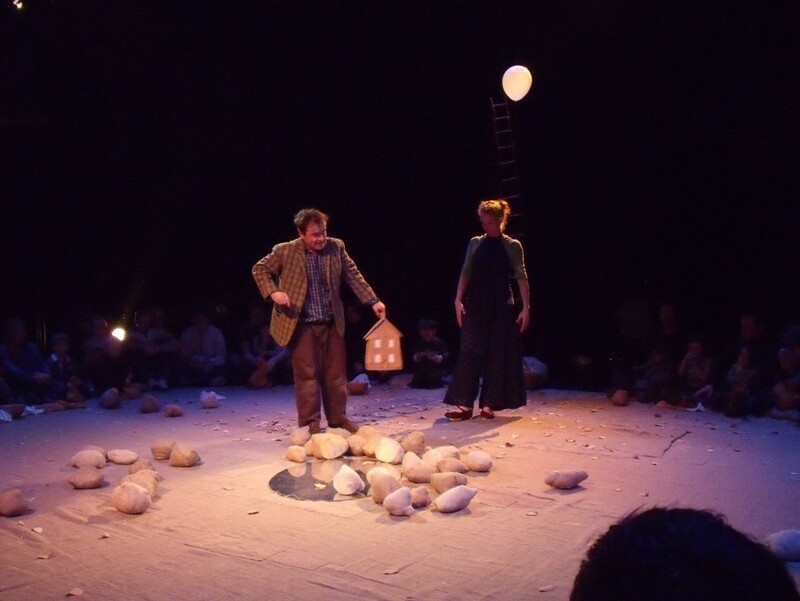 Percy and April get you settled on our comfortable cushions and introduce you to Birdy, still hiding in his glowing egg. We have to wait till Spring if we want to see him so it’s time to begin our hands-on journey through the year with flocks of real flying birds circling around our special growing tree. We’ll run through the rain and the falling leaves and sleep under the snow till Spring wakes us up for the butterfly party. 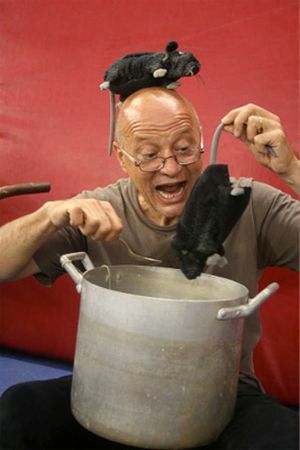 This show has delighted children all over the world from New York to Singapore and when Birdy does come out they all want to give him a little stroke and a feed. 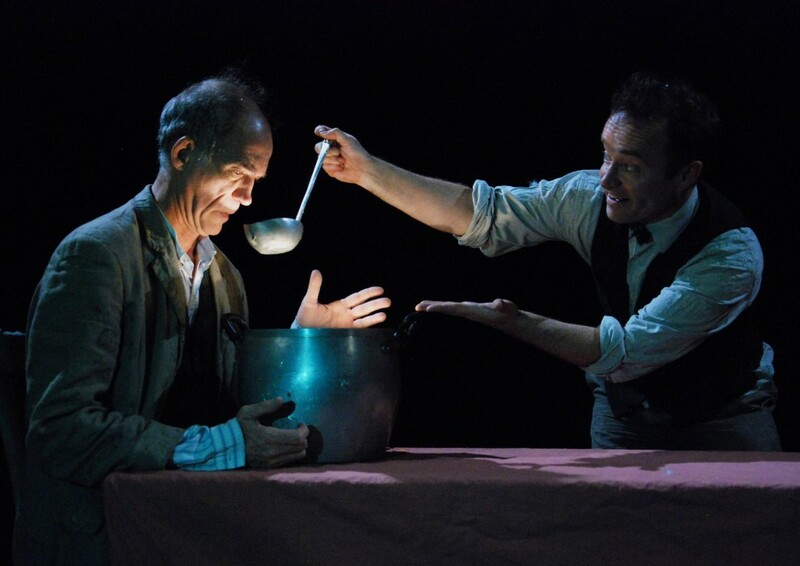 Egg and Spoon is a perfect gentle introduction to the magic of theatre. We are working on the relaunch of our classic shows that will be touring from Autumn 2019. Duration: 45 minutes, no interval. Duration: 50 minutes, no interval. Duration: 60 minutes, no interval. Duration: 40 minutes, no interval. Duration: 1 hr, no interval. 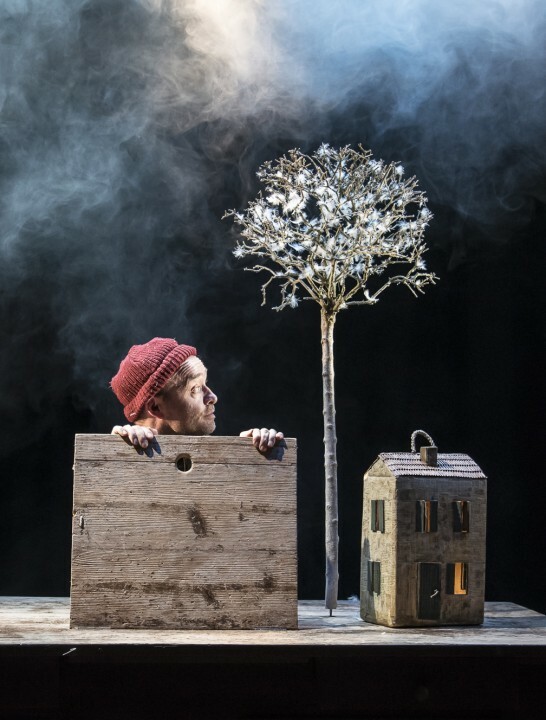 One night tiny Tom overhears Mum and Dad talking - there's nothing left to eat so they are going to leave him and his six brothers in the forest! 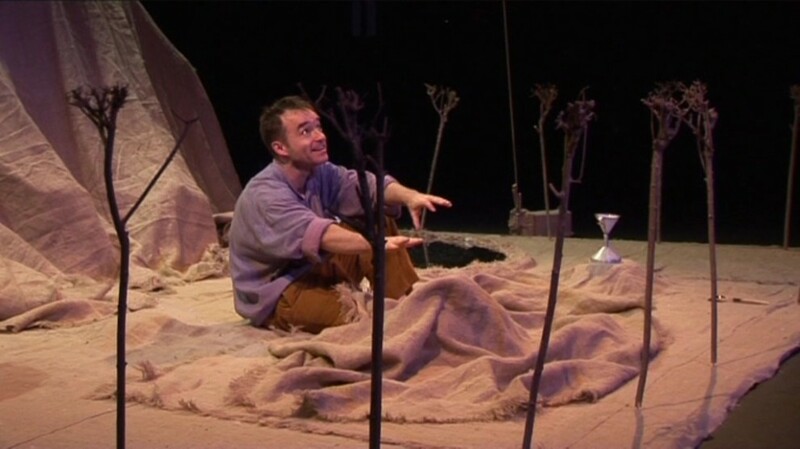 Outwitting his parents and the ogre Tom shows everybody that even though he is small he is still mighty as he protects his brothers, finds the treasure and makes sure they'll never be hungry again. 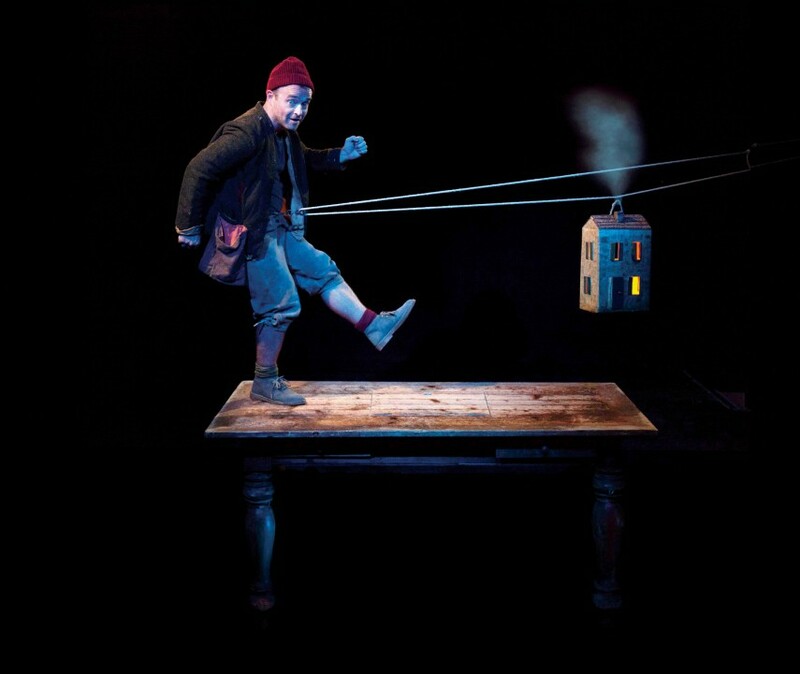 Performed entirely on and under a kitchen table this classic story is brought to life in a playful and fascinating show full of Lyngo's magic with feathery spinning birds, a flying house and a portable forest. Come and join tiny Tom on his very big adventure! A little vegetarian fish who lives in a glass escapes into our airy world to eat bubbles, collect tears and drink stars from a bowl. He’s got lots of questions like ‘why is the sky blue?’ and ‘where is the sea?’ and just like many small creatures we know and love he needs answers and he needs them now. 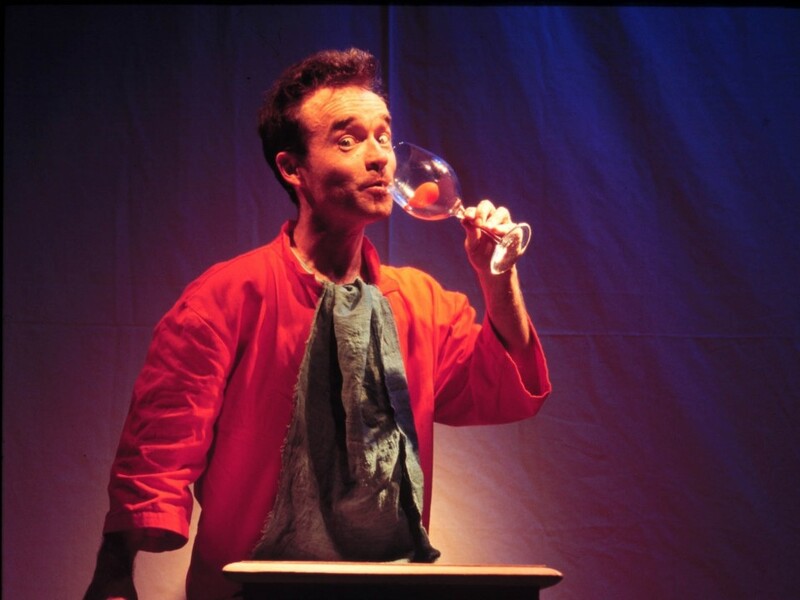 This is highly interactive philosophical cabaret for a younger audience. Patrick Lynch floats through a show full of laughs and surprises where you finally get some answers! 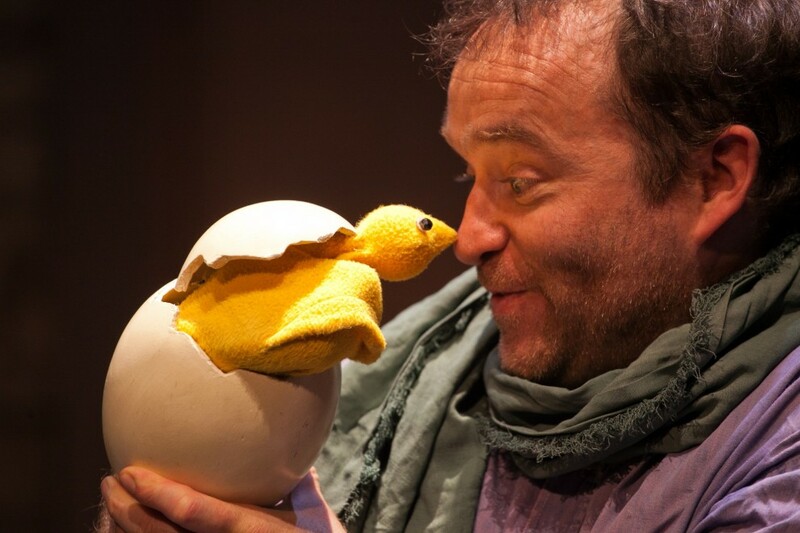 It all starts with an egg that doesn’t want to hatch...His mum is busy, like all mums these days, and she’s got to get down South with all the other birds so Percy the gardener has to step in and see if he can convince Birdy to come out. Is Birdy shy, lazy or scared? With that hungry eagle flying about he’s got good reason to be frightened but Percy isn’t alone in looking after him. 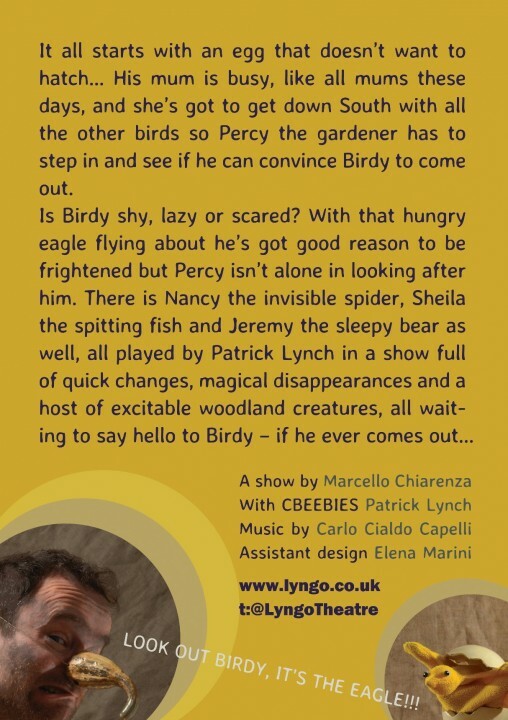 There is Nancy the invisible spider, Sheila the spitting fish and Jeremy the sleepy bear as well, all played by Patrick Lynch in a show full of quick changes, magical disappearances and a host of excitable woodland creatures, all waiting to say hello to Birdy – if he ever comes out! Dreams are mysterious. 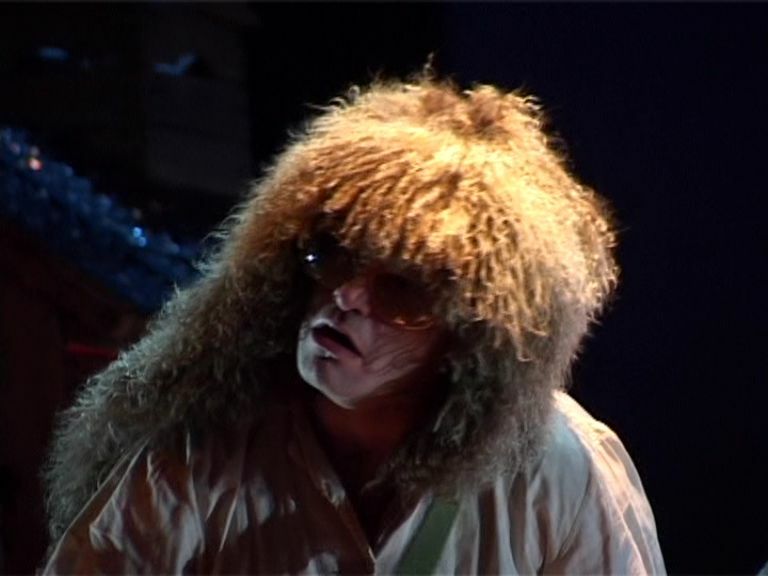 We don’t know what they mean or why they happen but we know where they come from – The Dust Man makes them. 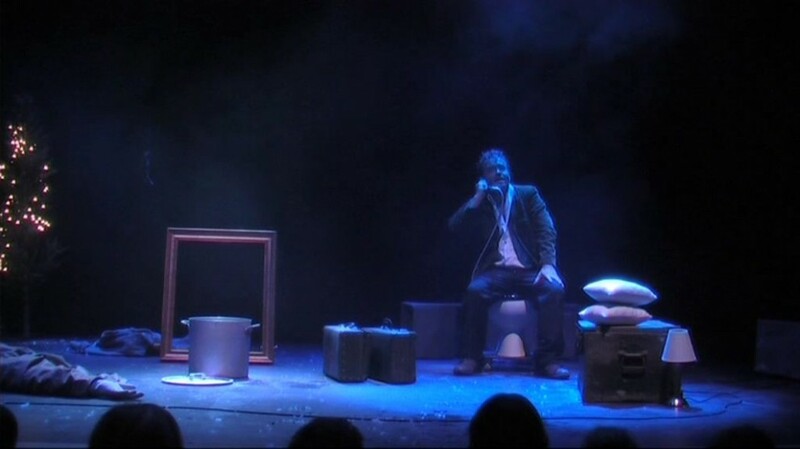 All of us dream so he’s pretty busy and with the toilet-phone constantly ringing and the night falling into a saucepan it’s really a nightmare for him. 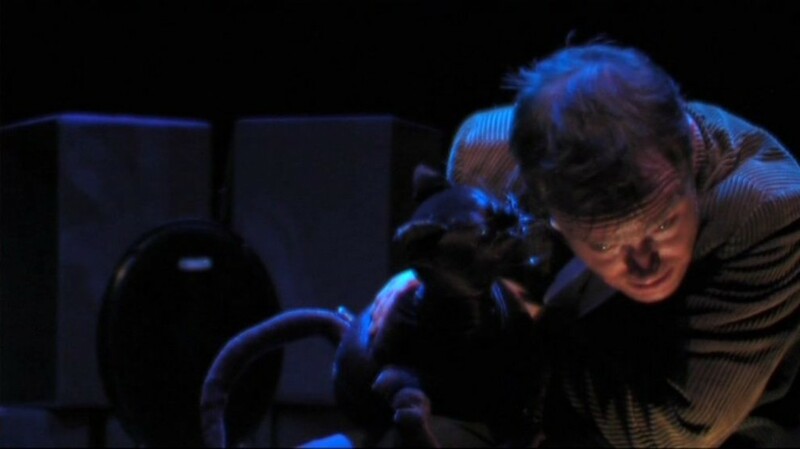 Nero, his cat, is there to help him though and tonight they are both going to make your dreams come true in a tour de force of stage illusions and surreal events. 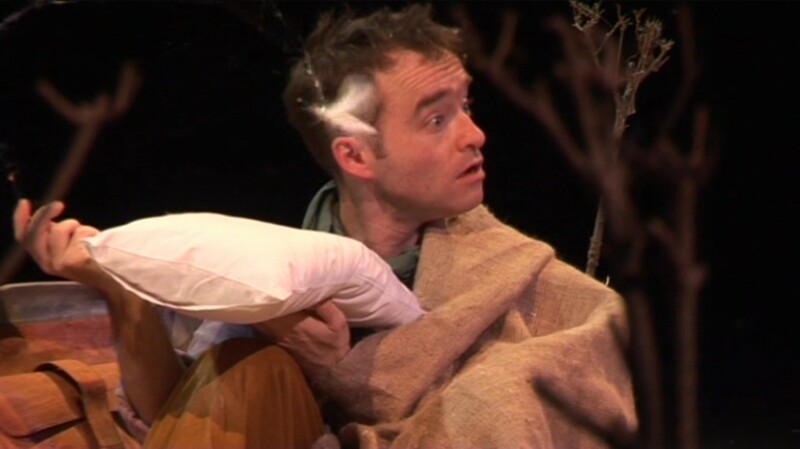 You’ll be constantly rubbing your eyes and pinching yourself in this show where it is always 9 o’clock but not always bed time and where we find out what to do if you are afraid of the dark. Close your eyes, open your hearts and get ready for the best day-dream you’ve ever had. 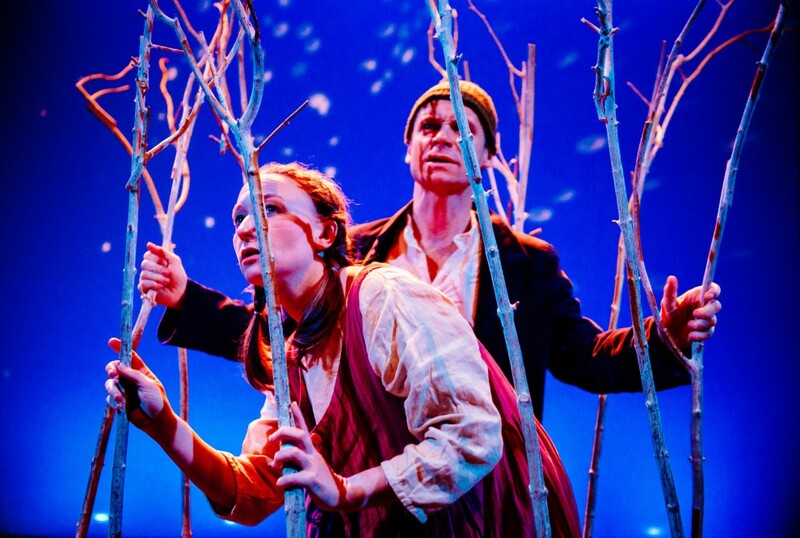 A musical theatre version of this classic brother and sister tale of adventure and magic where we’ll have you humming along throughout and cheering as the witch slides down into our flaming oven. Lyngo serve up their own special recipe of multi-roled performances, captivating songs and beautiful imagery. When Mr Rossi turns up to do this show with Mr Lynch it always goes wrong. 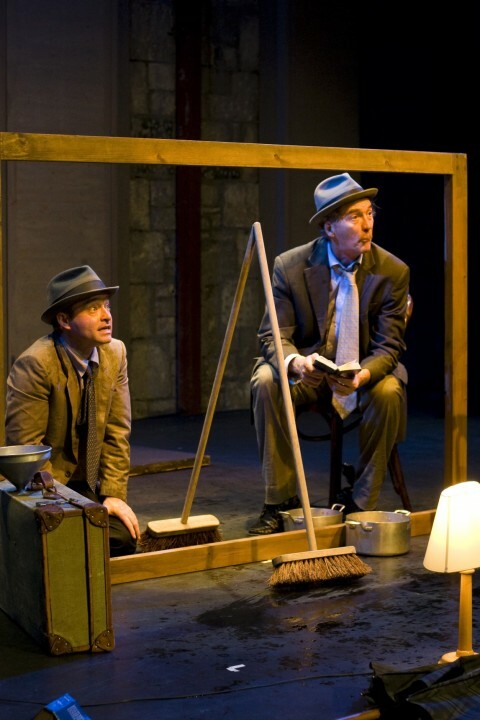 As Mr Lynch shows Mr Rossi how the theatre works they play with and distill all the usual theatrical conventions. They stretch out light and throw it around. 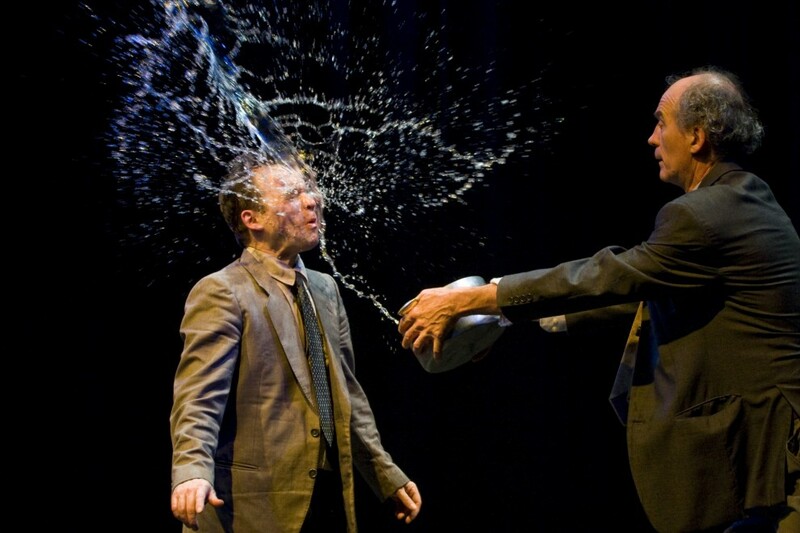 Sound effects suddenly become real and explode on the stage. Shadows become solid and solid things become insubstantial. 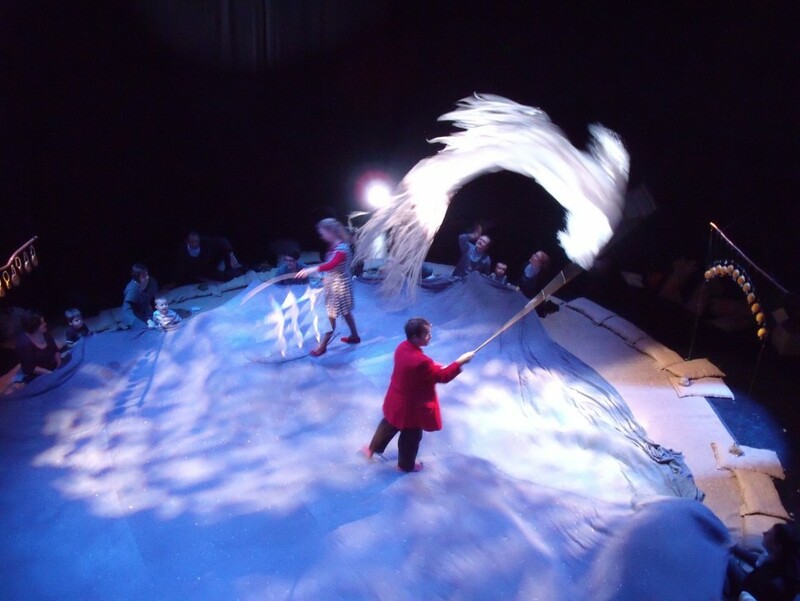 As they struggle with each other to get somewhere they take the audience on a fantastic journey passing by shrinking desert islands, some frantic Shakespeare and a storm at sea as the show spills out into the auditorium. What would you do if one year Winter decided to stay and moved into your house? 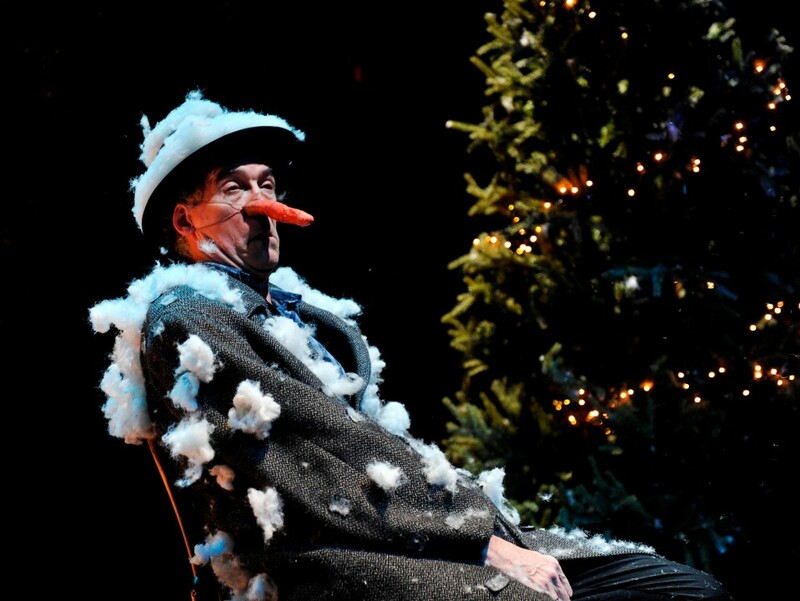 Well that’s what happens in our snowy spectacular show where you are guaranteed a white Christmas, no matter what the weather or the time of year! 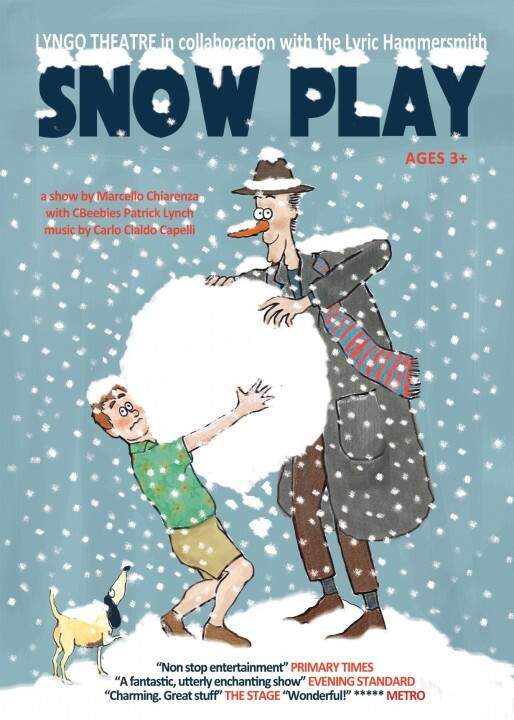 Snow Play is a showdown between Winter and Spring over who gets to stay and who has to go away. 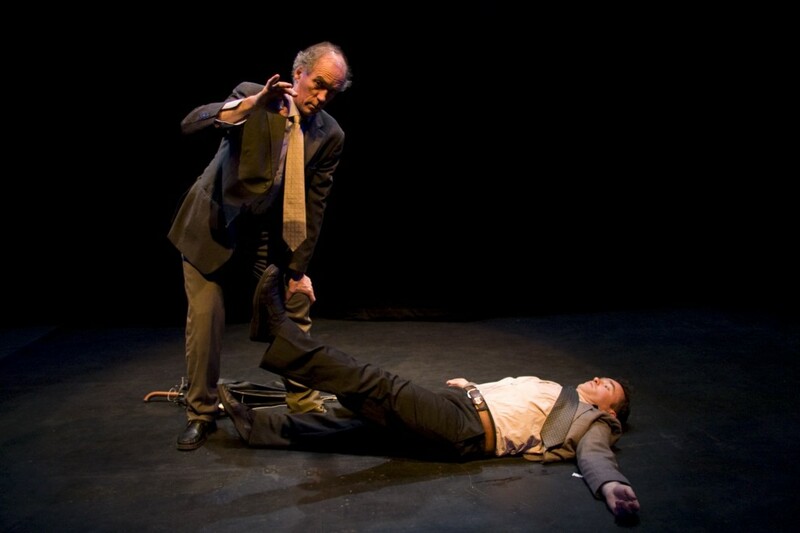 Help Mr Green against Mr White in this highly interactive smash-hit London production. 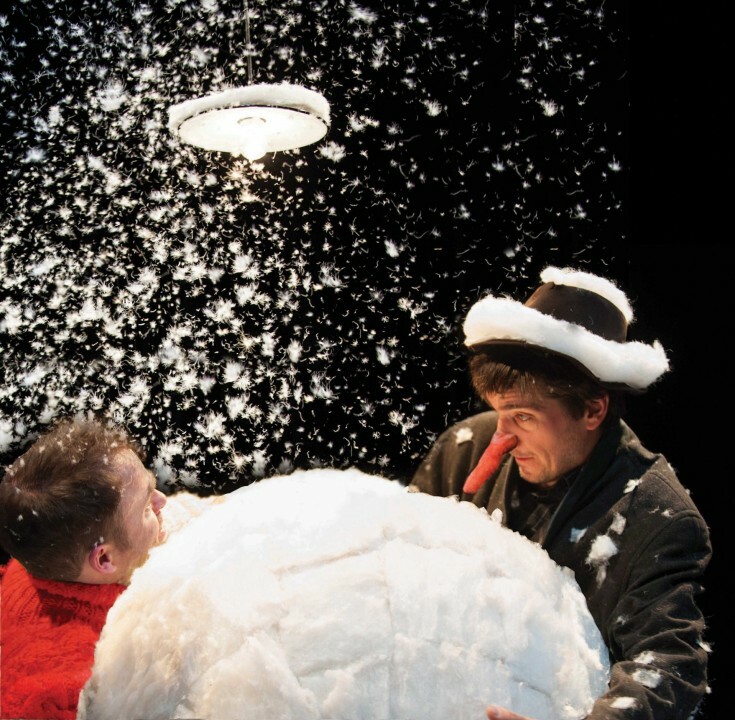 You get to make a giant snowman, cover a whole house in snow and have a super snowball fight! 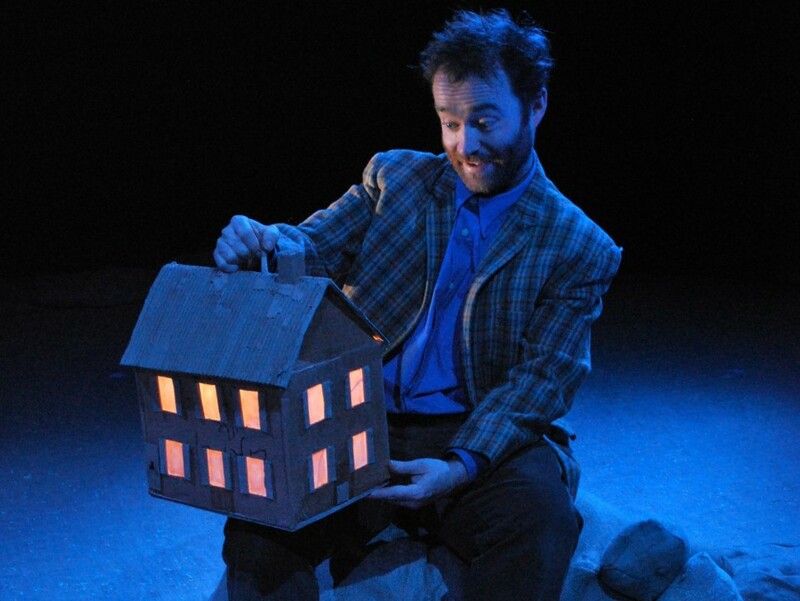 Knick lives alone on a big smelly island of rubbish but it all changes when Doo Dad arrives. He’s here to help, but actually ends up making everything worse. If only he could show Knick what friends are for he knows that the rubbish dump would burst into flower. 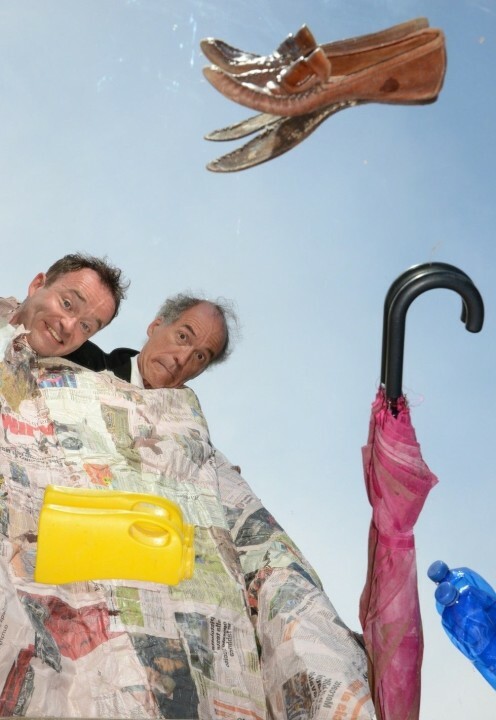 We want you to help us and to join in with the rubbish storm, the crying chorus, and with making bubbly fire and ha-ha food in this highly interactive show about how silly it is to be sad. We'll have great fun as we transform our trash into amazing new toys and reboot your recycling routine into something special. Come along and discover all the reasons to be cheerful and find out what finally makes Knick Knack smile! 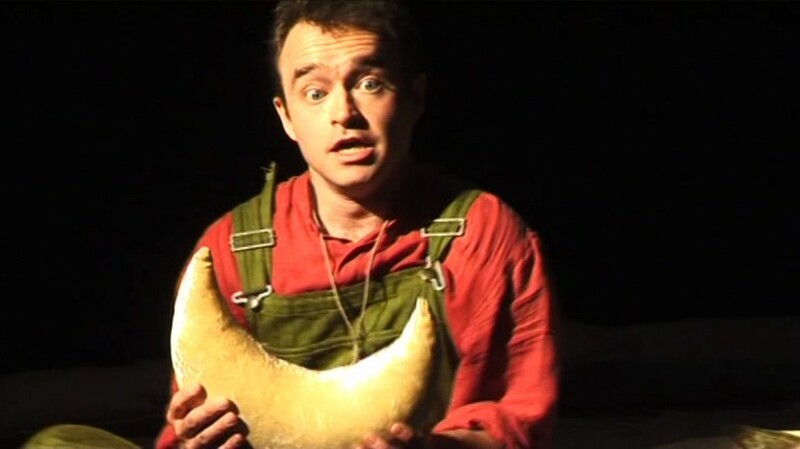 This classic fairytale now gets the Lyngo treatment so expect lots of surprises and beautiful images as Patrick Lynch (from Cbeebies) tells the gripping story of Jack who sells his cow for 5 magic beans and finds himself in the land above the clouds. 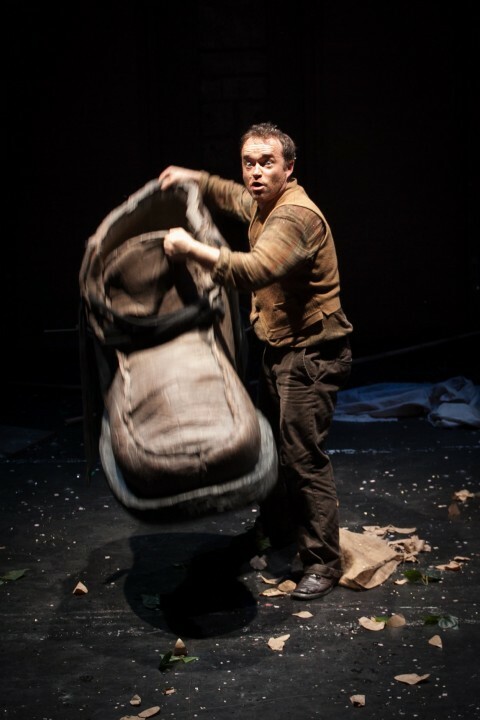 It’s a show for the over 3’s (and their giants) with something for everyone – enormous shoes, tiny houses, showers of silver and gold and a big, leafy explosion! The very young won’t sit still to watch a show and we don’t expect them to. 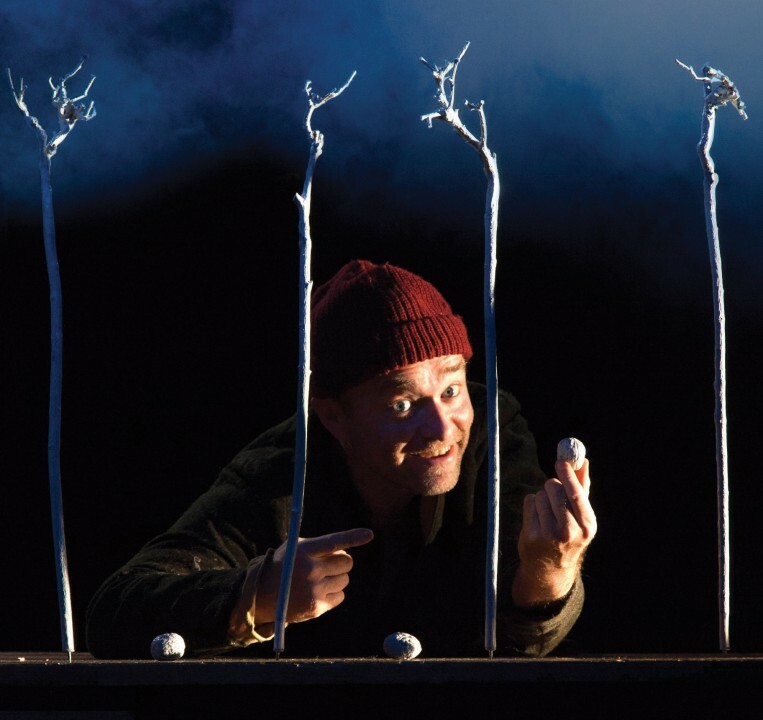 Egg and Spoon is an interactive romp through the seasons where you come in and out of our magic circle and get to open all the gifts of nature. 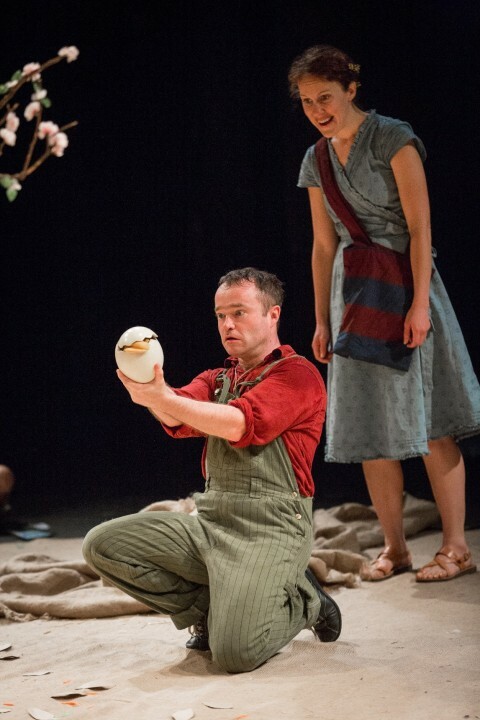 Percy and April get you settled on our comfortable cushions and introduce you to Birdy, still hiding in his glowing egg. We have to wait till Spring if we want to see him so it’s time to begin our hands-on journey through the year. We’ll run through the rain and the falling leaves and sleep under the snow till the sun wakes us up for the butterfly party. 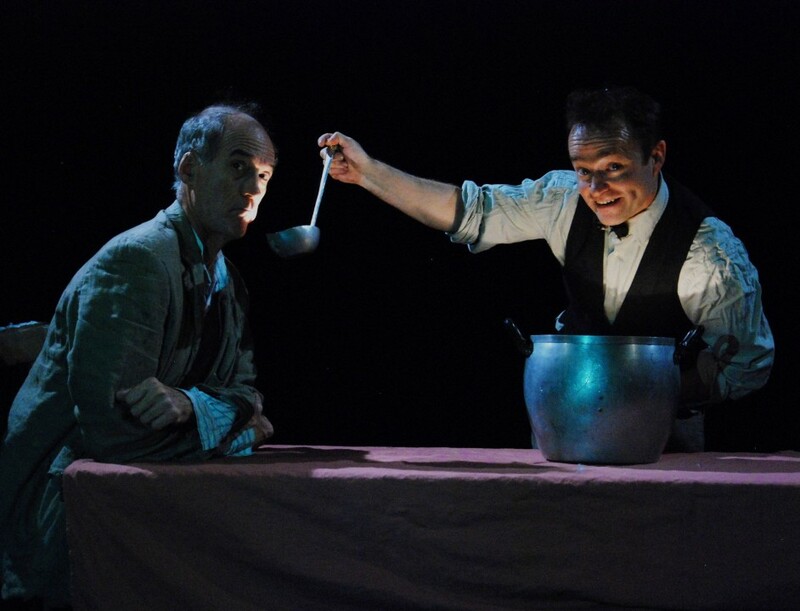 Egg and Spoon is a perfect gentle introduction to the magic of theatre. Every family is a circus – in lots of ways. There are toddling clowns, teenage lions, mums who spin plates and dads who fly by the seat of their pants. Growing, eating, sleeping and dreaming has all the fun of the fair. 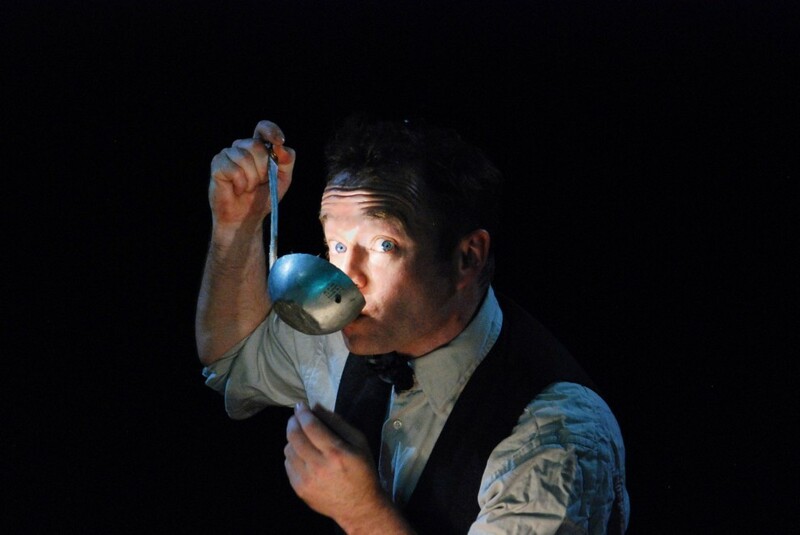 Circus Minimus puts our everyday life in the spotlight and takes you from the front garden into the dining room and then to bed. But it doesn’t stop there as we dive into dreams and fly up to the stars and beyond. Our circus puts you in the ring and let’s you do your thing! Before anything new is made it must first be dreamed. From our moon-base in the Sea of Tranquility we get a great view of the earth and it’s time to make a new one just like we do every night! What shall we put in tomorrow’s world? Snowballs and flamingos of course! So all aboard the sleeper train as it takes us on our dream voyage. 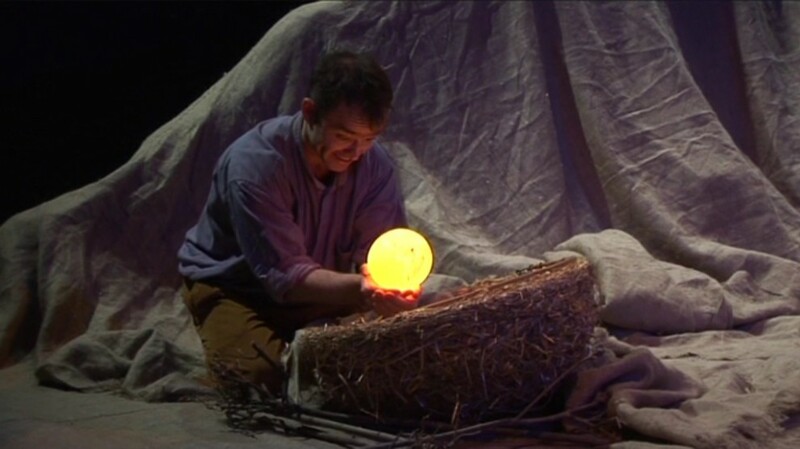 We start with putting the stars in the sky and move through history, discovering fire all over again and finally arriving at the one-world tree where we celebrate the new world that we made all together. This is an amazing romp through the universe where you can get your hands on the stuff of creation! 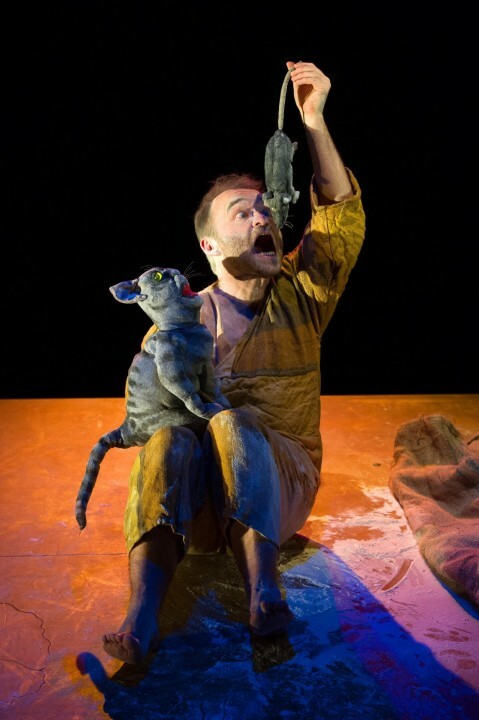 Would you trust a talking cat? 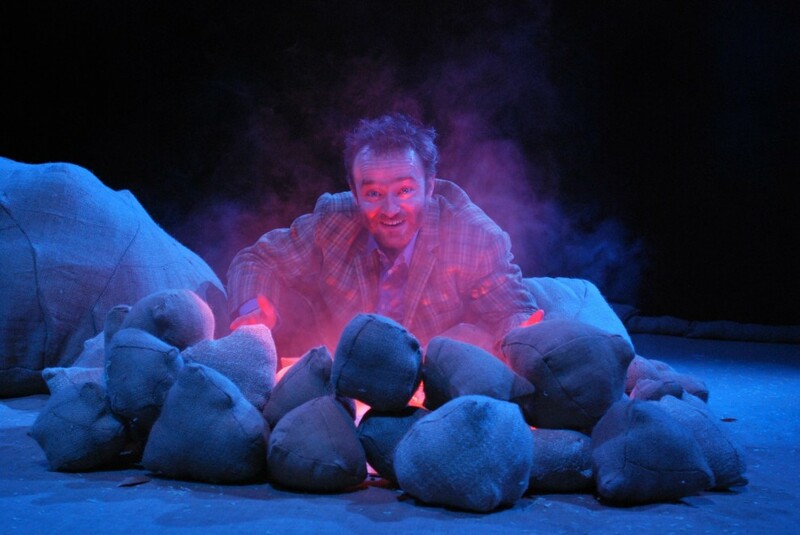 You never know, he might turn you from a pauper to a prince just like the hero of this story, brought to vivid life on our incredible sloping stage by Patrick Lynch from CBeebies. 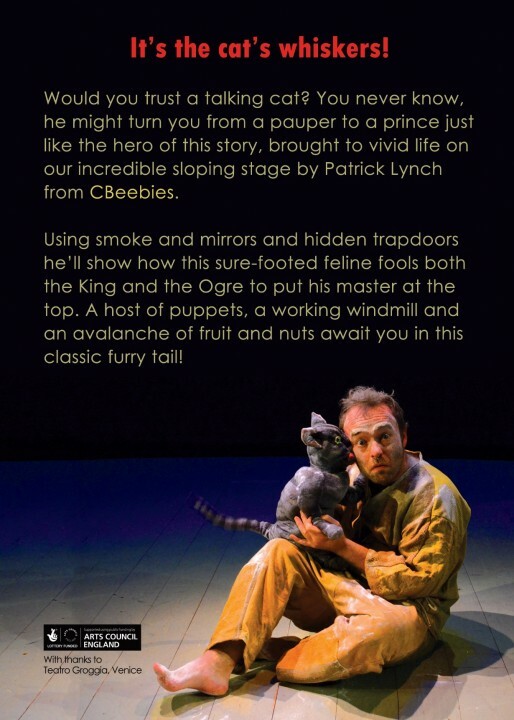 Using smoke and mirrors and hidden trapdoors he’ll show you how this sure-footed feline fools both the King and the Ogre to put his master at the top. 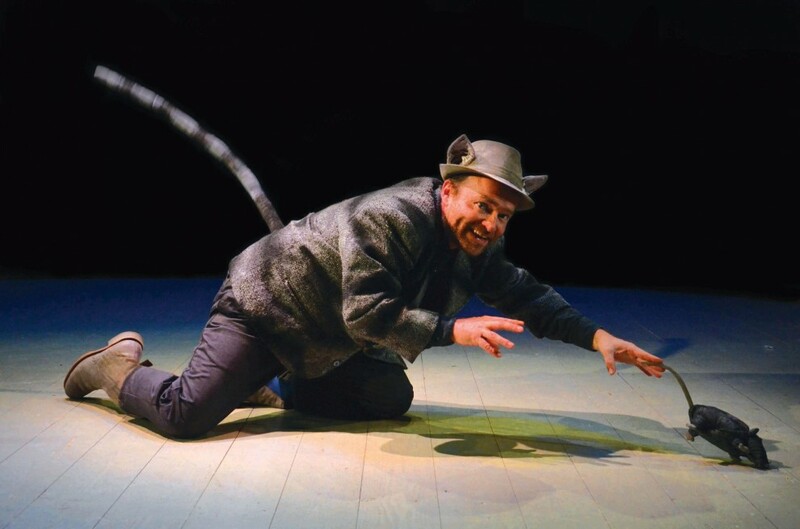 A host of puppets, a working windmill and an avalanche of fruit and nuts await you in this classic furry tail! It’s the cat’s whiskers! 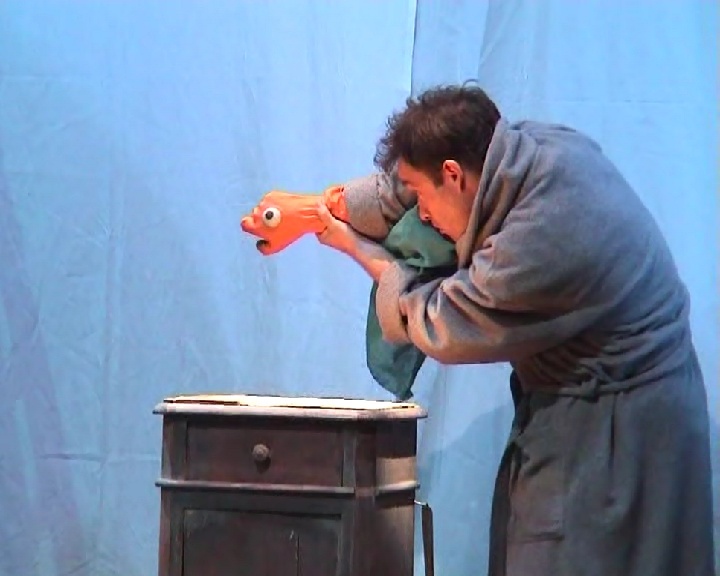 One of the best loved classics for children comes to life, litterally. 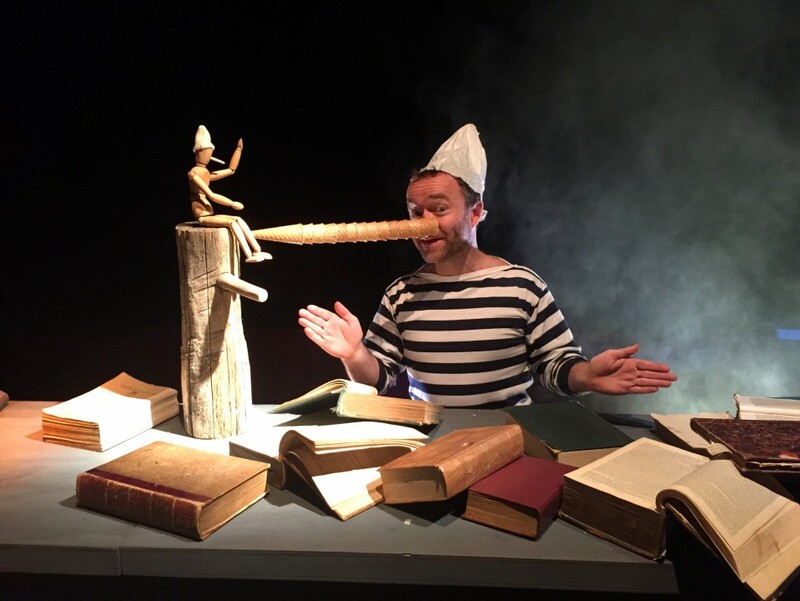 Crickets, cats, foxes and, of course, the world-famous puppet, will spring out of our collection of dusty, old, magic books, while Patrick Lynch from CBeebies pulls all the strings and turns all the pages to bring you the true story of Pinocchio, no lie. Who nose? He might even find his father and become a real boy. 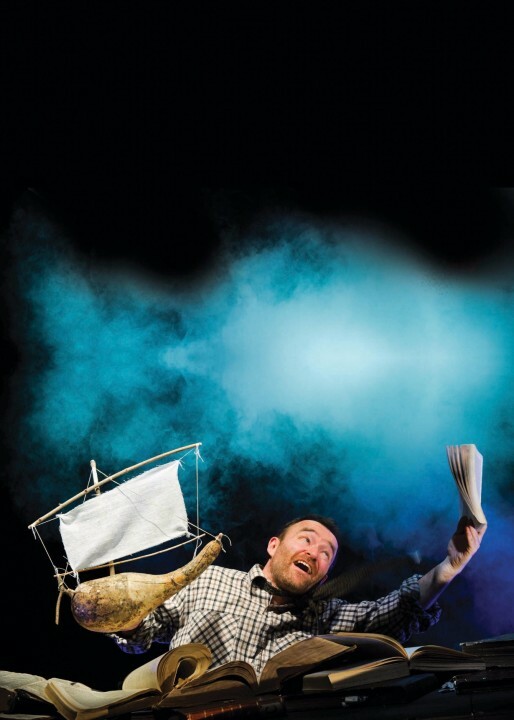 Come and join him on his incredible journey, you'll have a whale of a time! 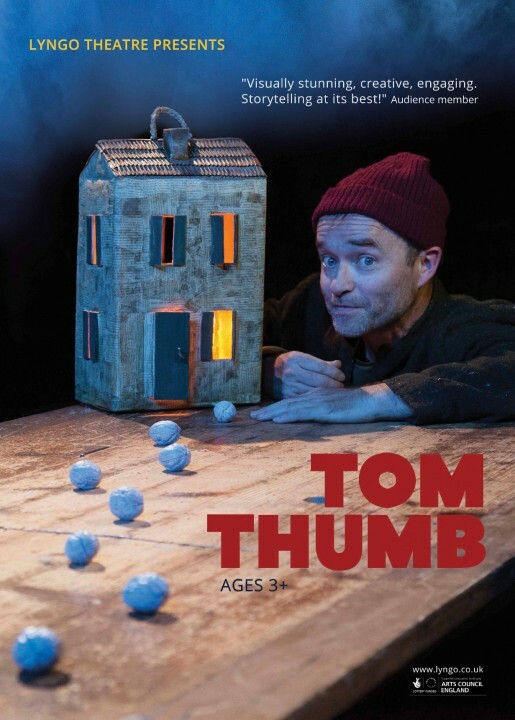 Hands down, Lyngo Theatre’s production of Tom Thumb, at the Nuffield Southampton Theatres, is the best piece of children’s theatre I have seen to date. 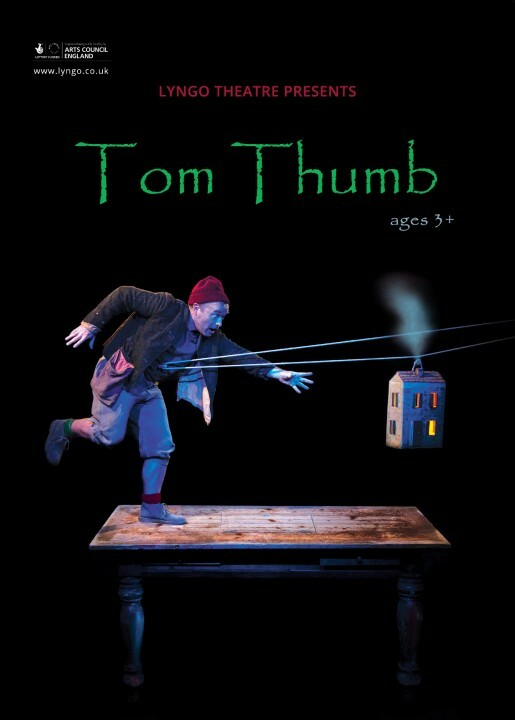 Aimed at children aged 3+, Tom Thumb is beautifully visual, with use of handmade props and set. 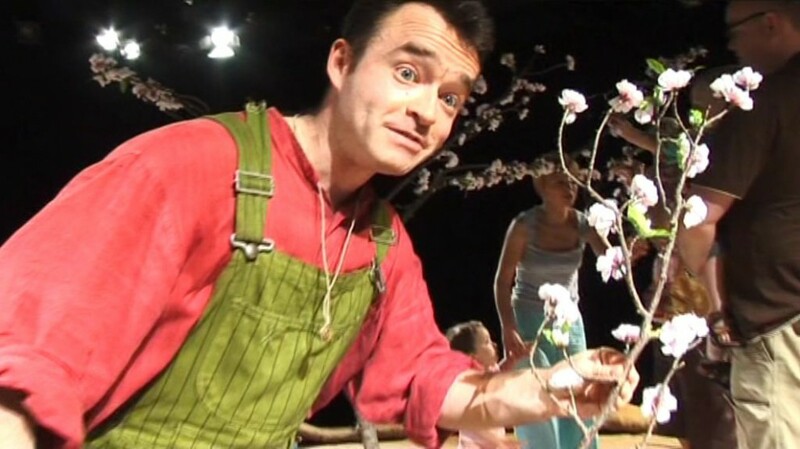 Shabby chic, inventive and unique, this production is 'the wooden train set of young theatre', compared to 'the Fisher Price kitchen set styled theatre' I have seen previously. The story followed the famous poetic tale of Tom Thumb, proving that despite being tiny, he can still save his brothers from the great ogre. 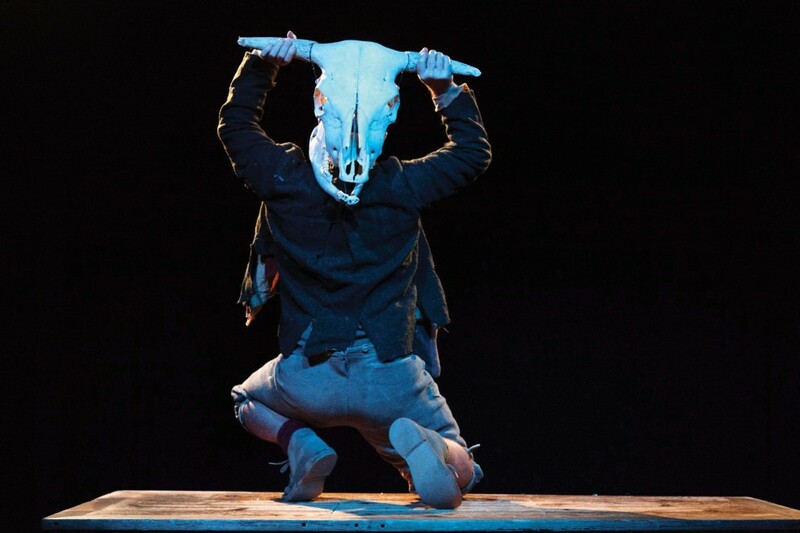 The ogre was portrayed using a ram’s skull. Although slightly nightmarish, this created the perfect monster, and, with the the use of a red wash, the creation of shadows heightened the experience, increasing the ogre’s magnitude. 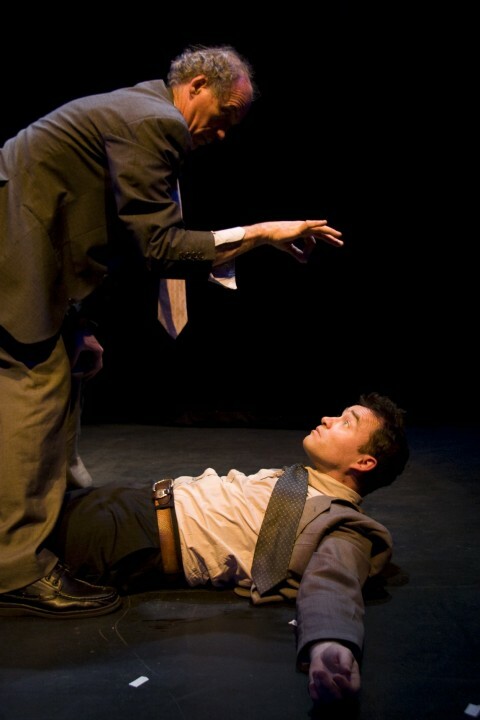 The approach to the play was genuine and simultaneously completely original. 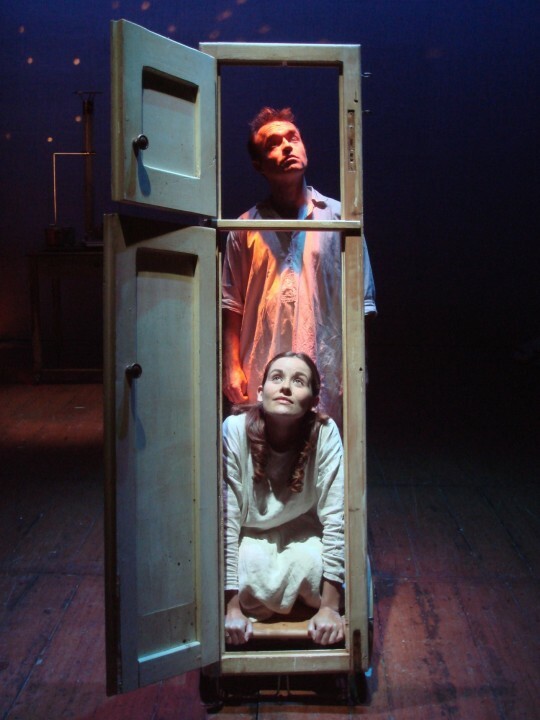 The set consisted entirely of an old kitchen table; on it sat a model house with internal lights attached to a rope and carabiner. The table had two draws which were also self-lit. 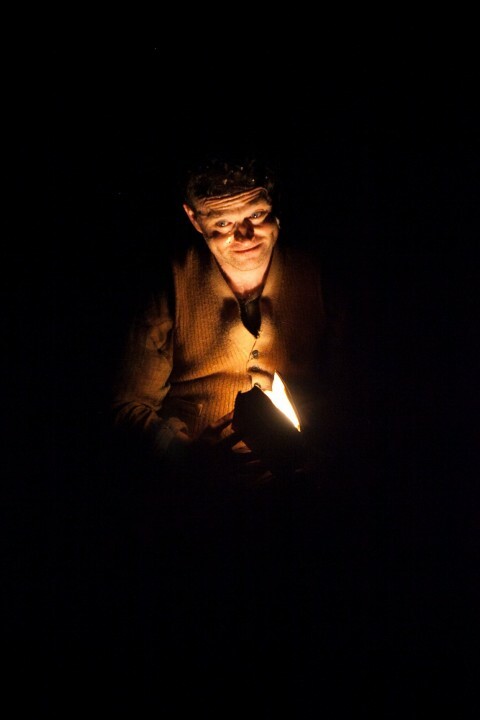 The small, intimate set was lit by a vintage, squirrel cage light bulb, shaded by a symbol. 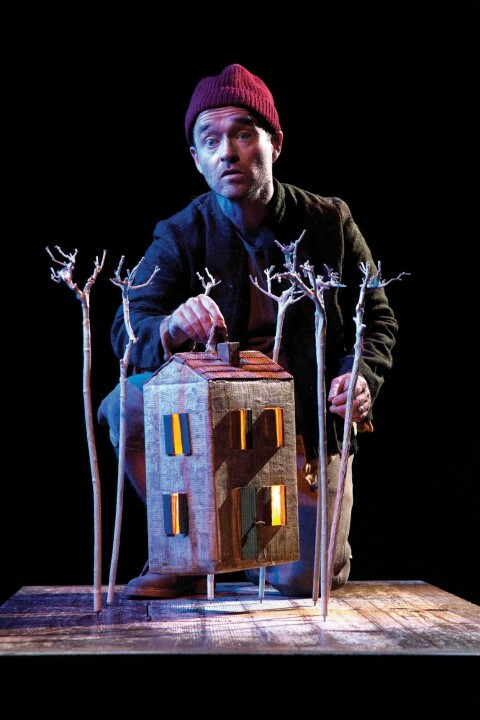 The light was suspended by rope, attached to a window frame which Tom often peeped through to tell parts of the story. The use of props was genius. 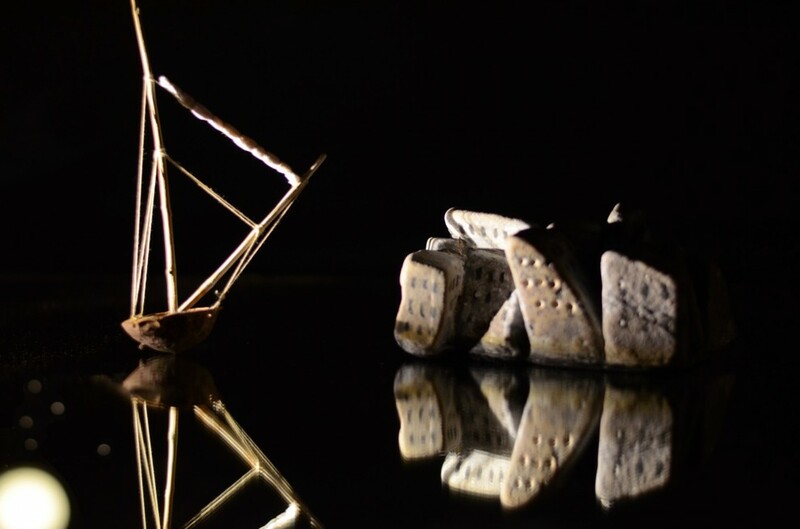 The creation of birds was done with kite poles attached to origami bird structures. 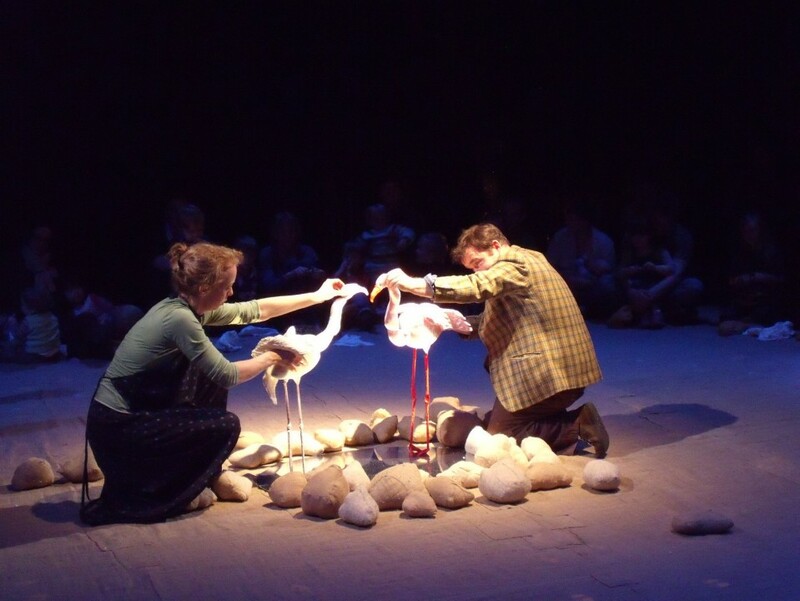 The migration of the bird across the stage was fluid and, with the combination of bird song soundscape, the invention was magic. 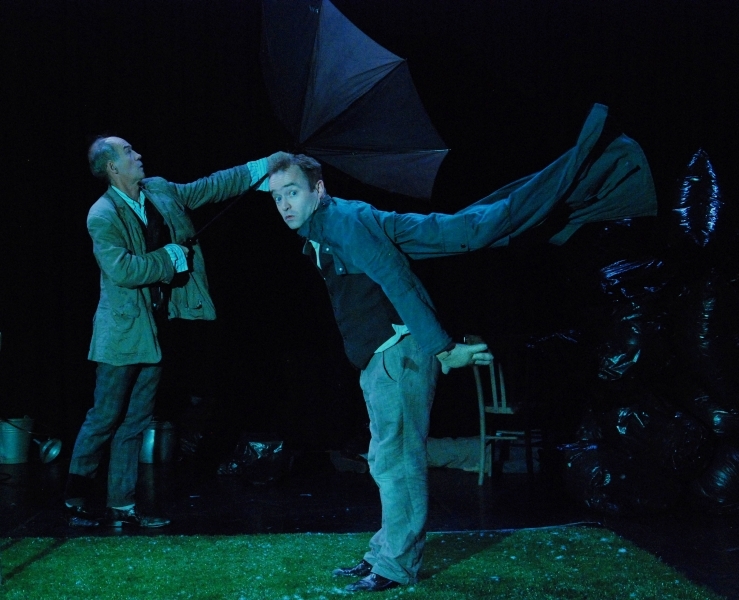 The developing seasons was imaginative and executed with flair. 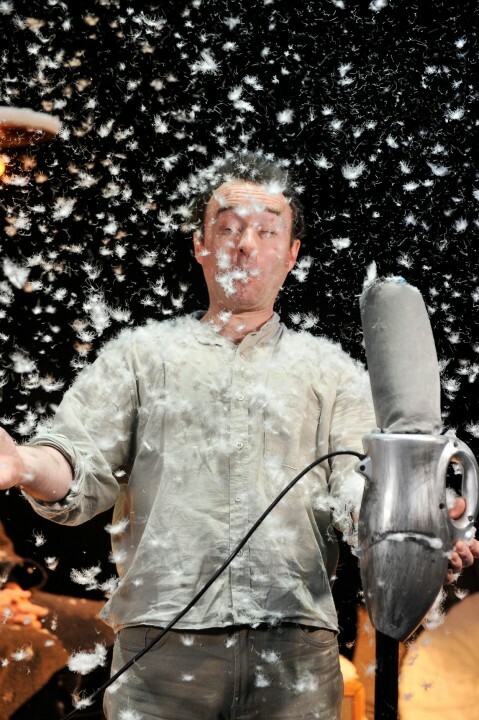 Snow was shown through the gentle cascading of feathers from a material bag attached to the lighting rig, which could be tugged by rope to release. 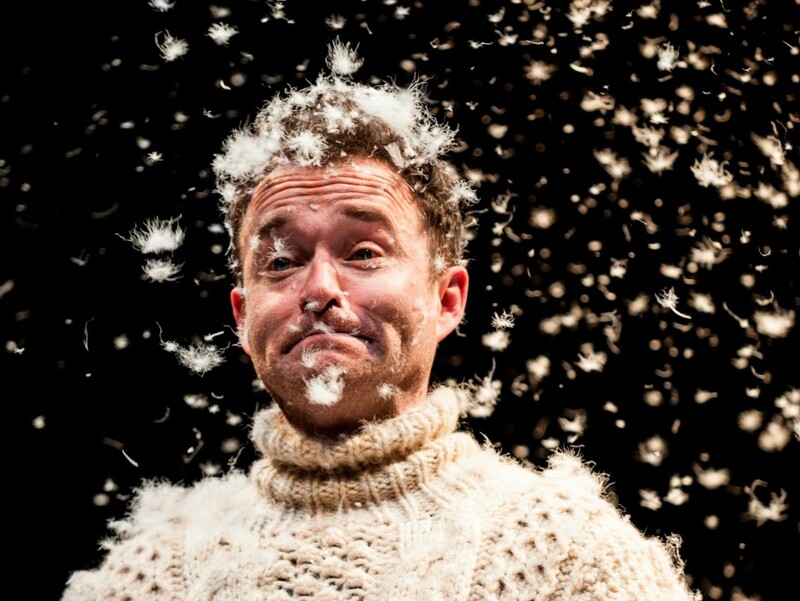 This created the paragon effect of a snowy day, with feathers sticking to branches and forming a white blanket on the ground. 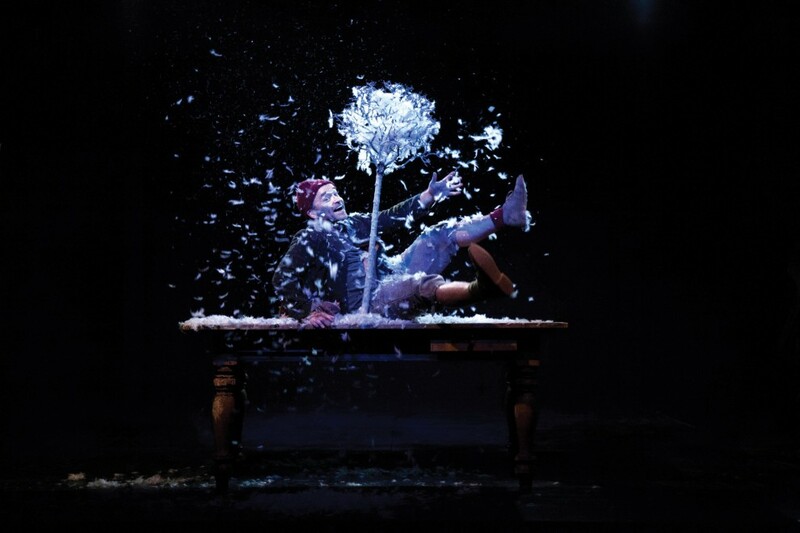 There is something enchanting about the falling of snow, and Lyngo Theatre captured that essence flawlessly. 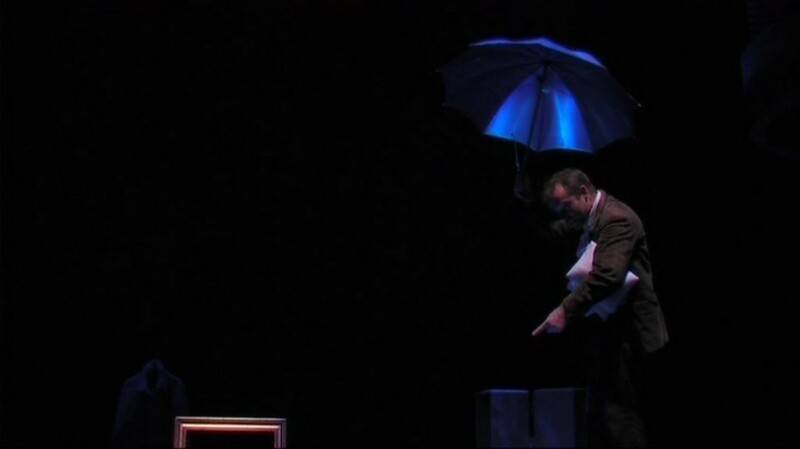 A rainy day was conjured using an upside-down bottle of water pierced with holes attached to an umbrella. This was compelling and added a charming absurdity. 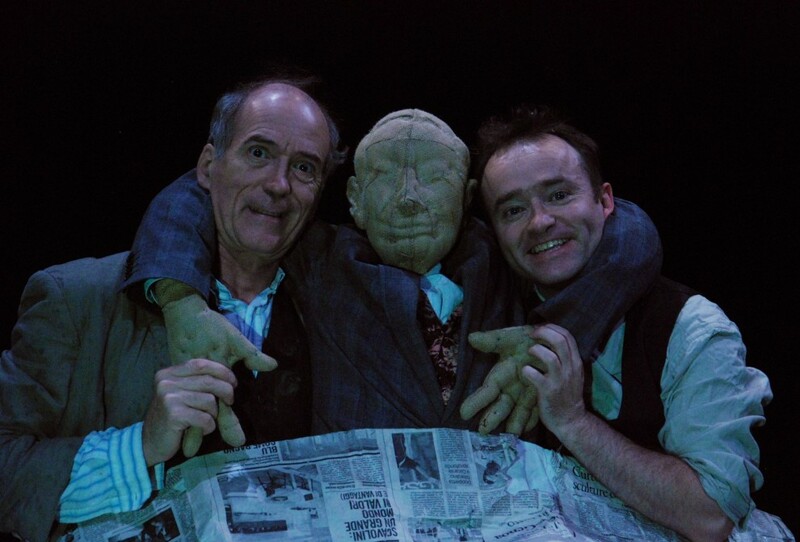 The story was retold by a one performer, taking on the role of narration, as well as characters, such as Tom Thumb, mother, father, the ogre and the old lady. His used of voice, changing in accent and dialect allowing for the subtle shift of character, without the need for a change of costume. 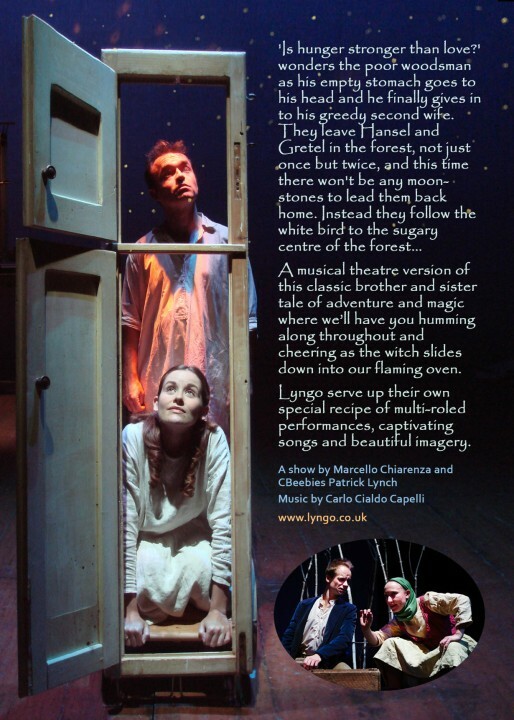 The soundscape, designed by Carlo Cialdo Capelli, alluring, bringing the fairy tale to life, whilst also creating a slightly eerie undertone. The wandering minor scales and chimes of the glockenspiel created the passing of time. And finally, the addition of the lullaby, sung live, brought warm and sleepy atmosphere to the stage, drawing the performance to an end. 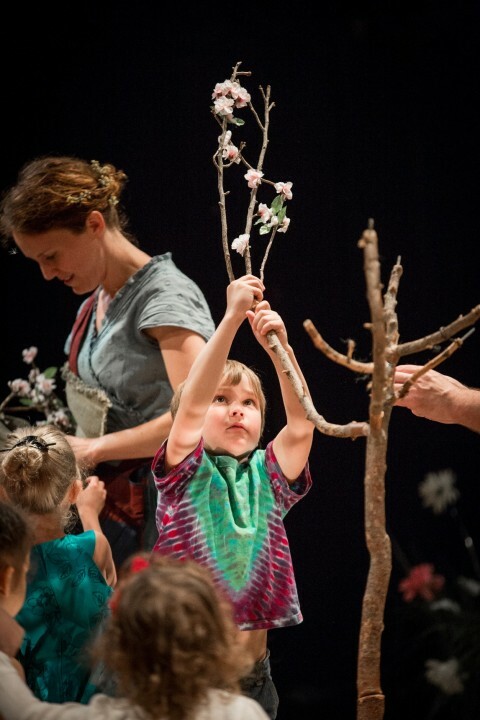 This performance provides an enchanting adventure through the forest, perfect for children and parents. 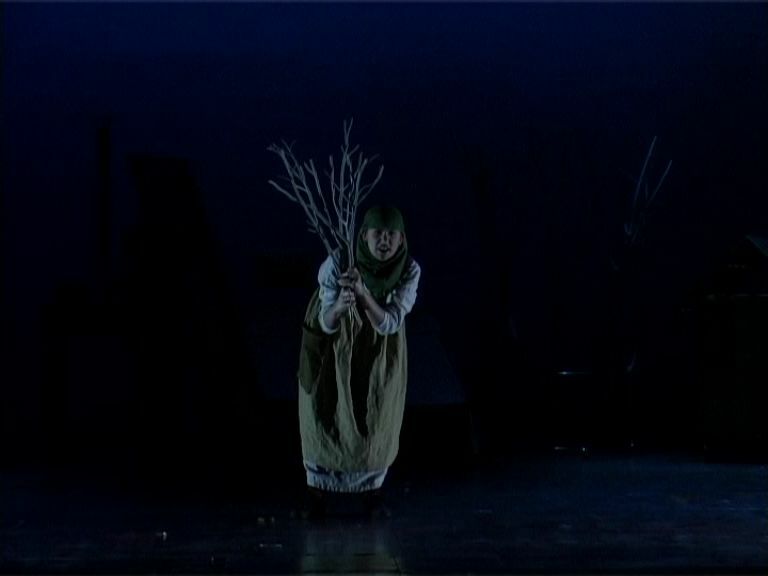 I had no idea what to expect from this performance, but I was pleasantly surprised as it unfolded into a magical fairy-tale via Lynch’s beautiful performance. 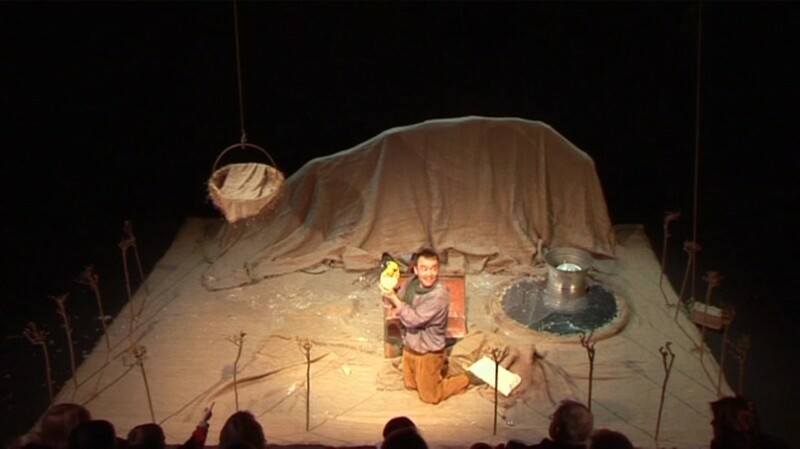 The stage was set with various contraptions and the props were so cleverly created; I particularly adored the use of pulleys, magnets and magical moments of inspiration. These constructions were imaginative and I felt as though I was watching my own children create and play with the various sensory instruments. 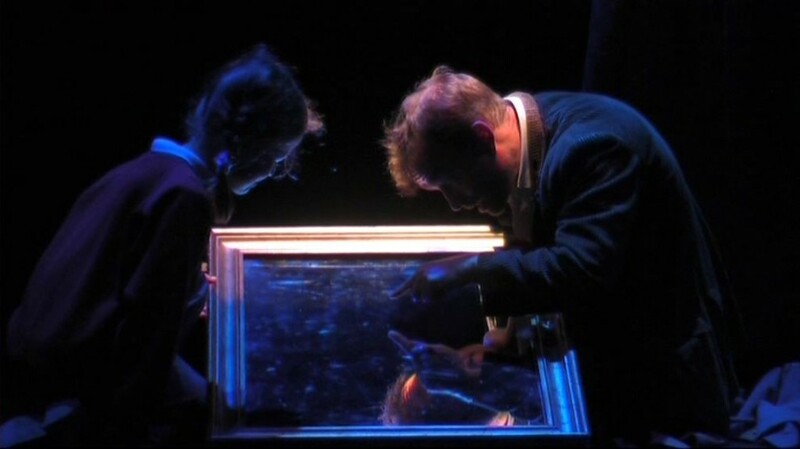 The music and lighting added extra sensory elements, and reinforced the magical intimacy created by Lynch. 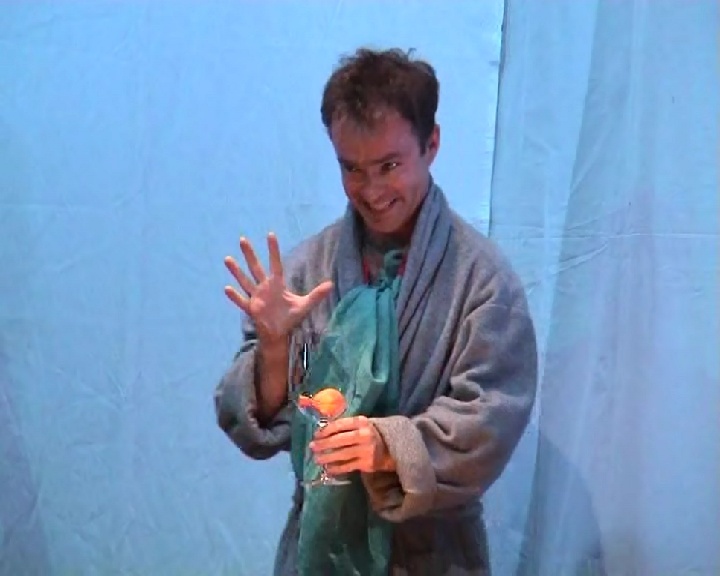 Lynch performs with a childlike manor, offering a gentle and interactive character to the audience. 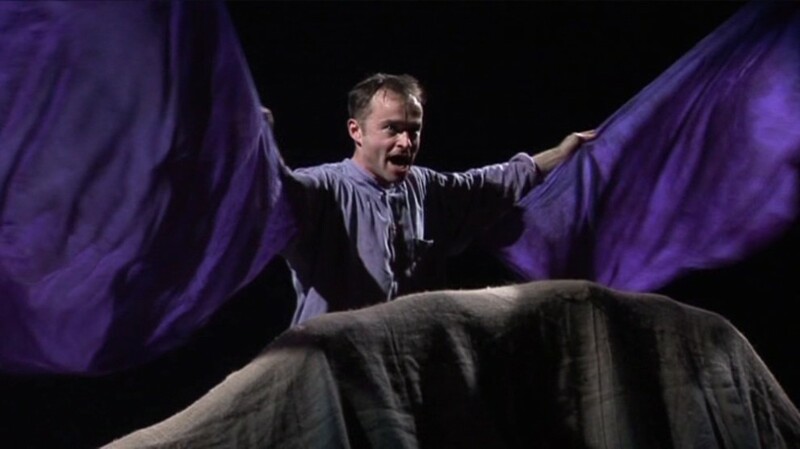 He is mesmerising as Tom, as well as various other characters, and the costume and props allow him to flit between the different characters in order to tell the story. Lynch also offers a very calm and soothing environment, drawing us into Tom’s world as the story unfolds. 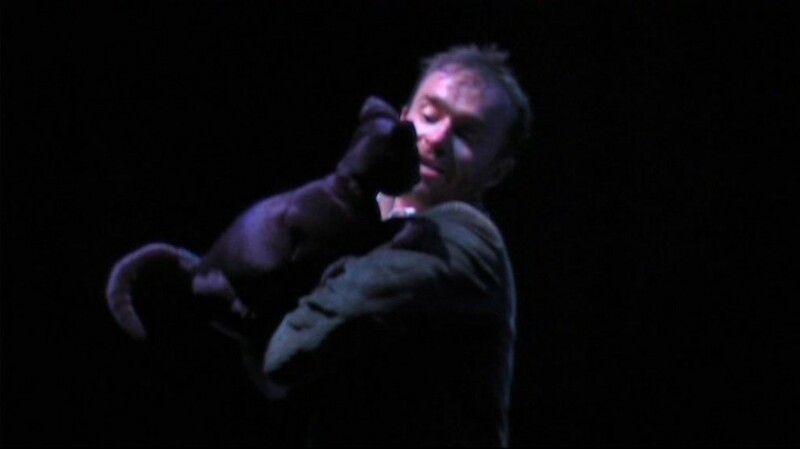 I loved how he interacted with the audience and how relaxed the atmosphere felt. 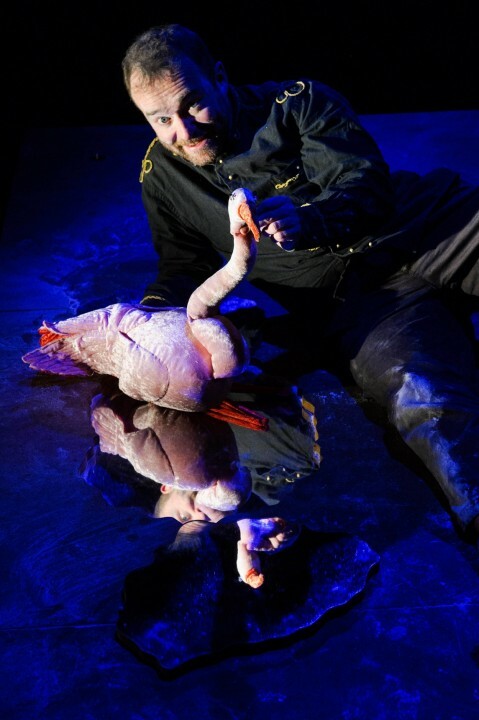 With gorgeously simple yet effective special effects (think water, movement, feathers…) this show is a glorious example of imagination and heart. More recent brilliant reviews here: read review here read review here read review here read review here read review here. 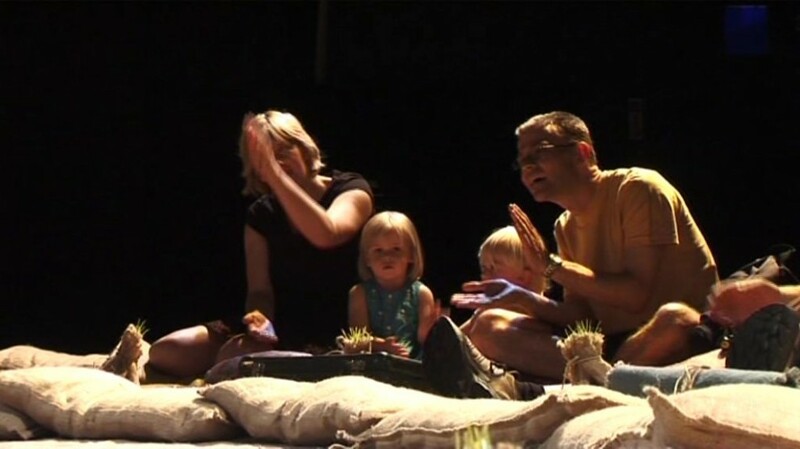 ‘This is a 50 minute piece aimed at the little ones, say from three years old to the end of infant school, and a pleasure for grown ups to who can enjoy sharing something that is simple and direct. Tall Carlo Rossi is tramp-like looking Mr White. 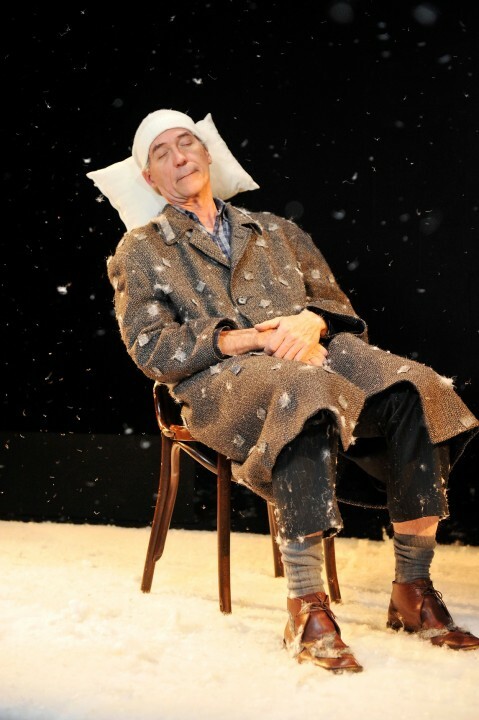 He's dozing on a chair centre stage when the audience enter but wakes up and waves at them from the other side of the French windows, mouthing words we cannot hear. The kids who wave back are in for a treat for there is plenty of opportunity for the confident to participate in the action and those who are shy won't be pushed into doing anything. They can sit back and enjoy it - though even they seem to enjoy getting into a snowball fight before things are over. 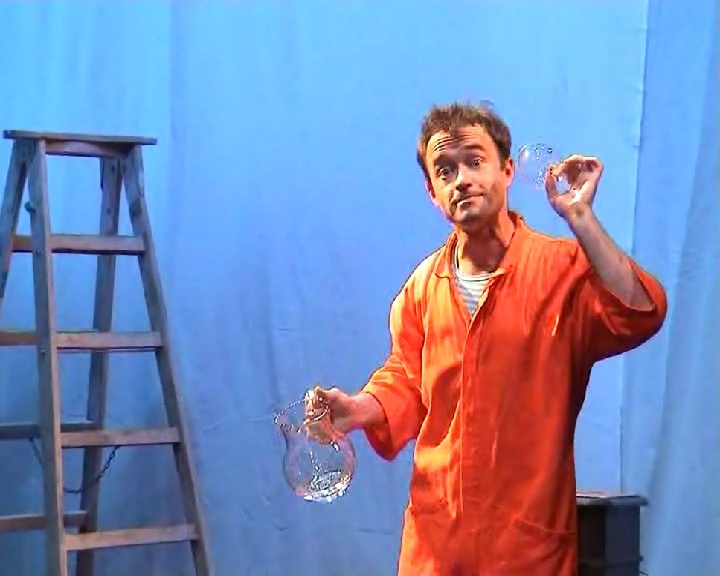 In fact Mr white soon comes out and gives everyone some snow. But it isn't his house. It's the home of Mr Green (lively Patrick Lynch, the straight man to Rossi's oddball). And now he comes back from his holidays. At first he thinks he must have gone to the wrong house but it is certainly his Christmas tree in the garden. 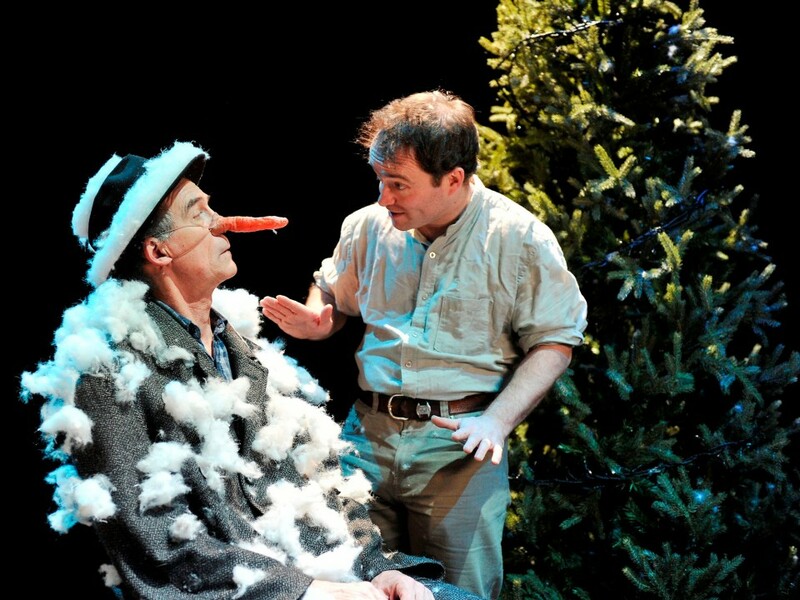 How is Mr Green (or Mr Scream or Mr Ice Cream as Mr White calls him) going to get White to leave, or at least to stop him and his audience helpers from bringing more and more of cold winter indoors? Spring comes at last, with flowers and a butterfly but not before there has been lots of snow fun and Mr White goes back north taking winter with him. 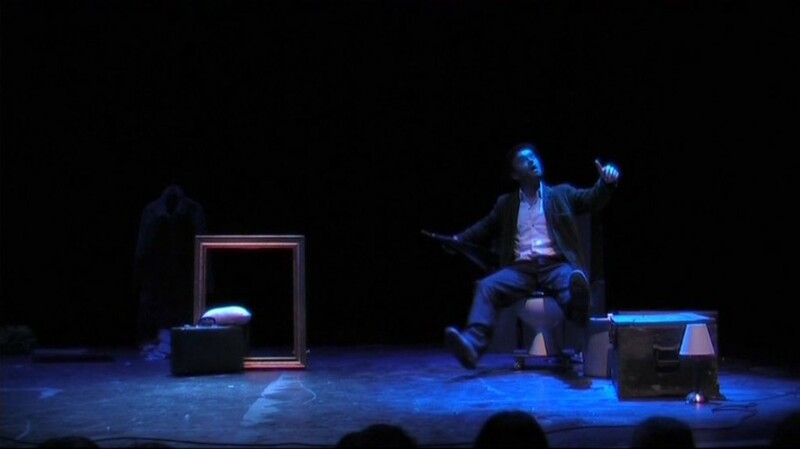 It works because its mime and surreal symbolism are so direct and because Rossi and Lynch are skilled performers who gauge their audience perfectly and have them joyfully co-operating in creating the occasion. 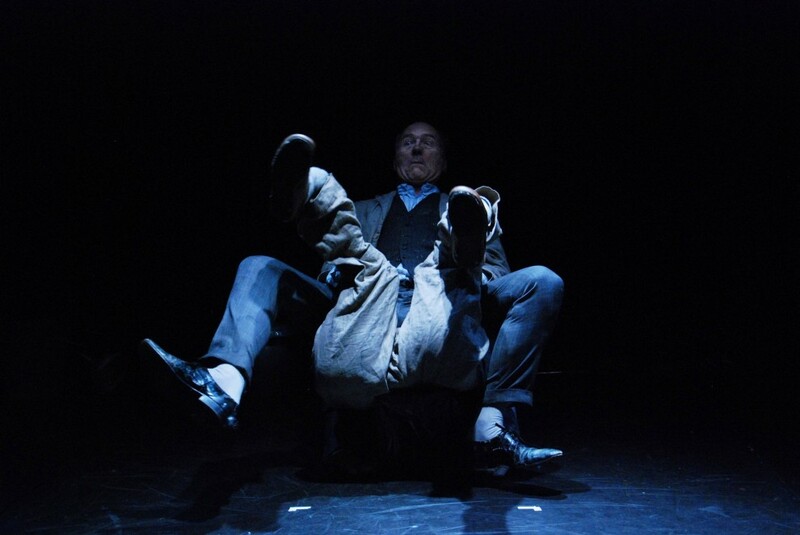 .Lynch doesn't need to ask the audience to tell him what Rossi is doing while his back is turned; there spontaneously shouting out that he isn't keep still but moving, as he performs a dancing perambulation sideways. 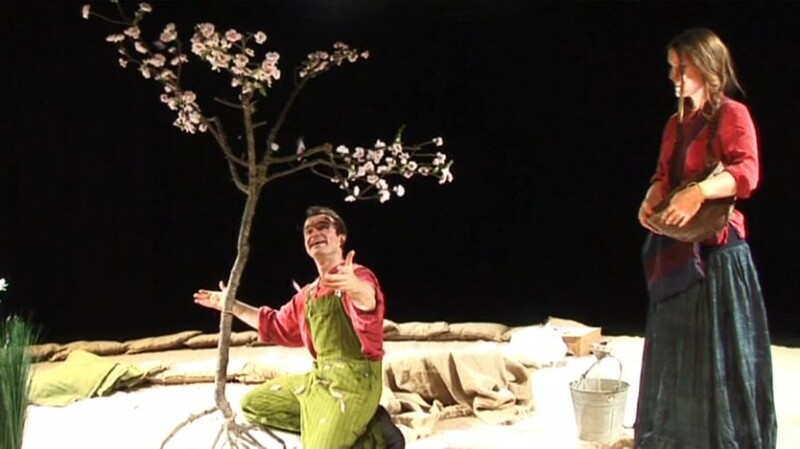 Directed and designed by Chiarenza, with accompanying music by Cialdo Capelli, it really is delightful . 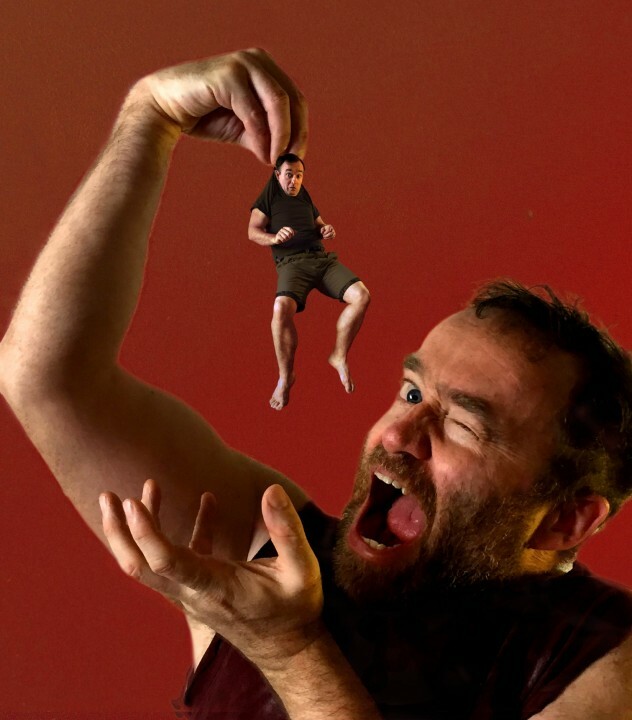 With Edinburgh festival “previews” now running all over the city, Londoners are even more spoilt for choice than usual when it comes to the capital's cultural smorgasbord. 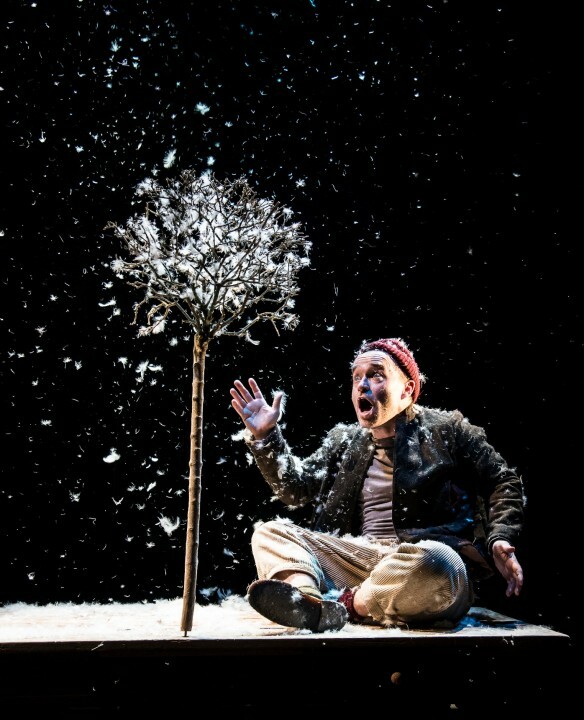 This is also the case for “mini-Londoners”, and this week my four-year-old and I went along to see the Lyngo Theatre Company's Snow Play. 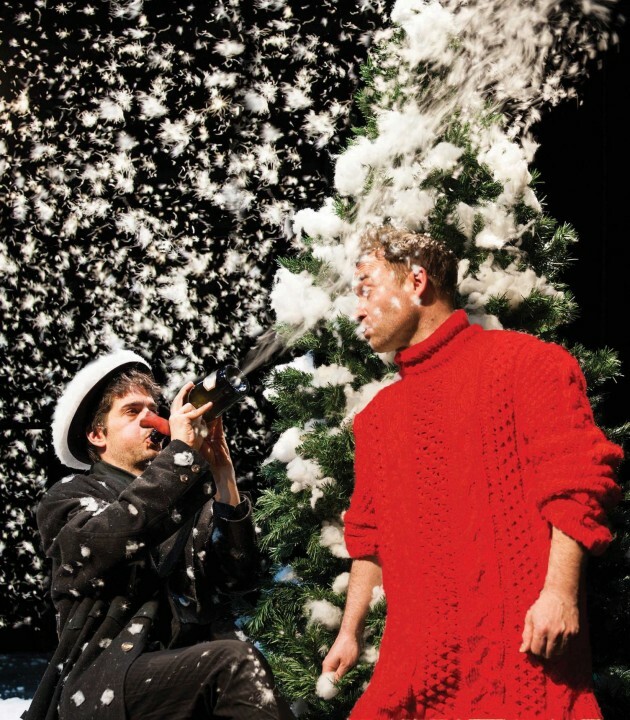 The company had a hit with this play at the Lyric Hammersmith over Christmas, but how would a wintry play work for a summer audience? 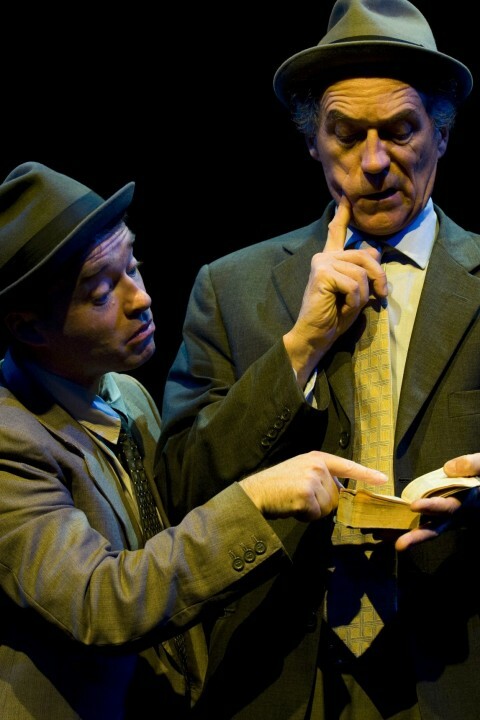 The play was charming and engaging, and the interaction was probably made easier by the intimacy of the audience. Indeed, my daughter, not usually one for overcoming her shyness in front of groups of strangers, got so involved that without prompting she went up to the front and helped coat Mr White in “snow”. 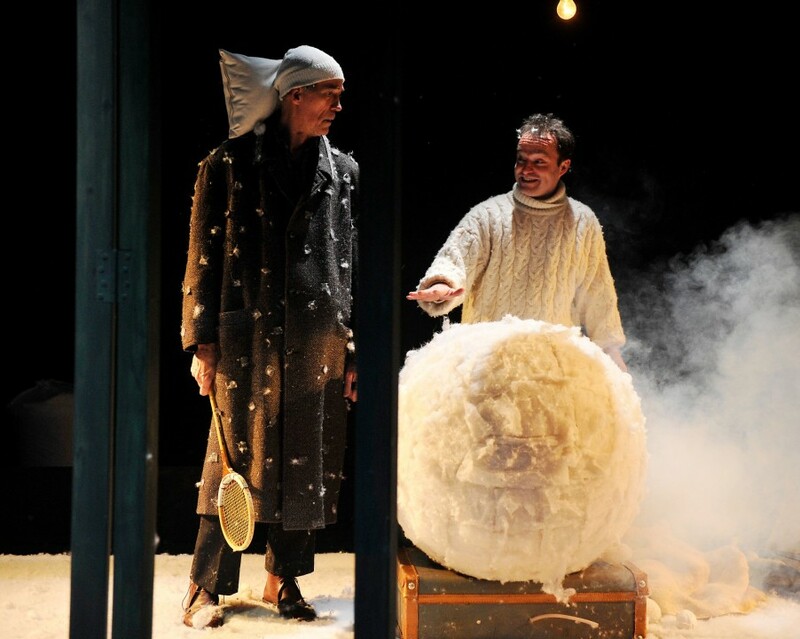 I had had visions of the play utilising real snow, and the auditorium being chilled to an uncomfortable degree. 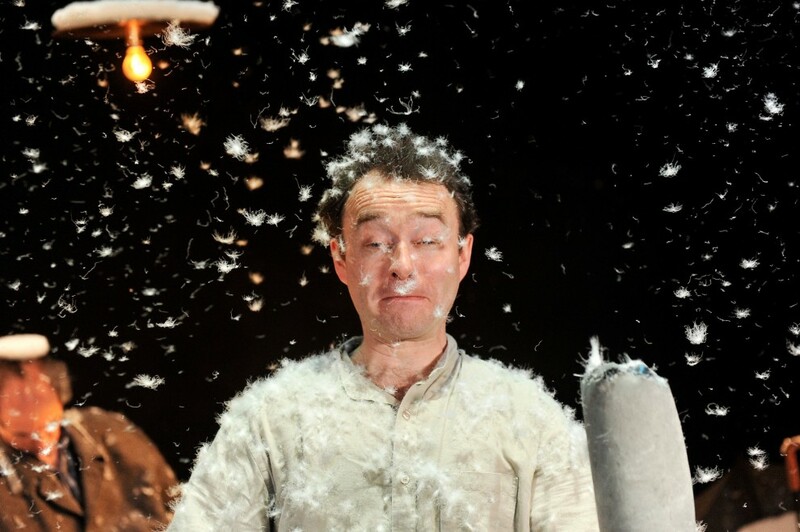 However, on entering the theatre it became apparent that this was not the case, and that instead the company had utilised feathers, white fibre and wadding, which with imaginative lighting and billowing winds was immensely effective (although I couldn't help wondering whether children with asthma and allergies might not get on too well, and might be advised to sit near the back. We were right at the front and could've certainly have done with a “de-linting” after the show had ended!). 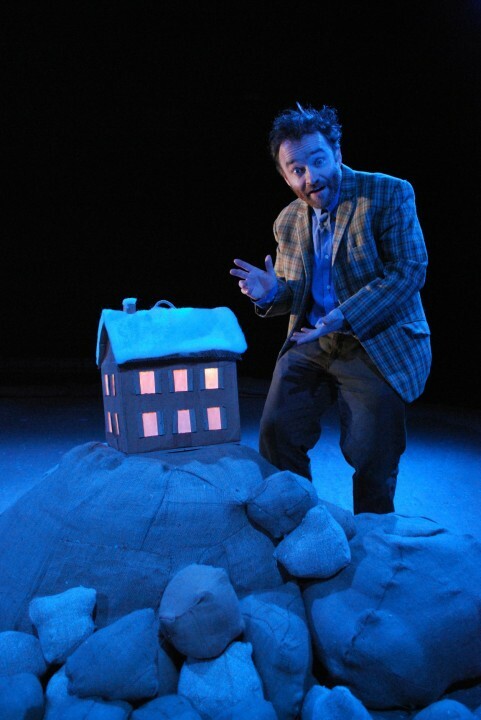 The premise is simple: Mr White has moved into Mr Green's house, and in so doing has brought on Winter, “stealing” Spring. 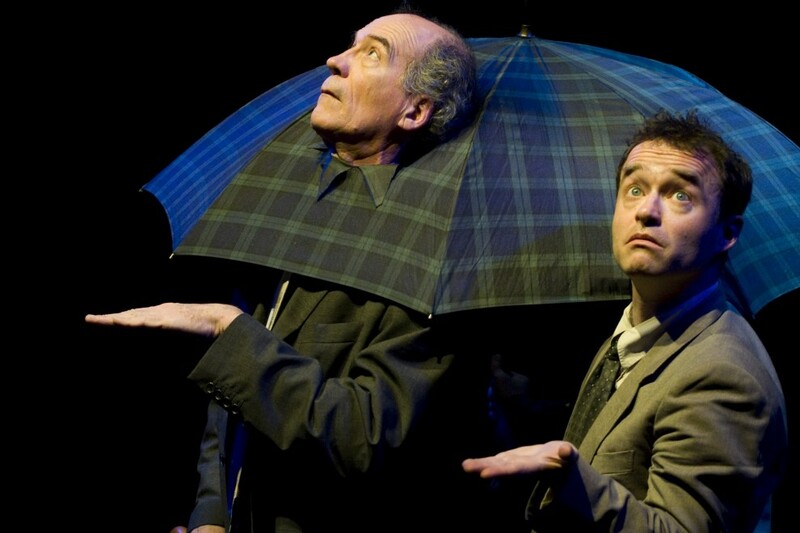 There's a lot of excellent physical comedy, much loved by the children, and the simplicity of the storyline (plus the relatively short running time) keeps the children rapt. The constant interaction (we were throwing “snowballs” at Mr White at one point) meant that the kids felt part of the action rather than mere onlookers, which is a key way to keep this fidgety audience engaged. 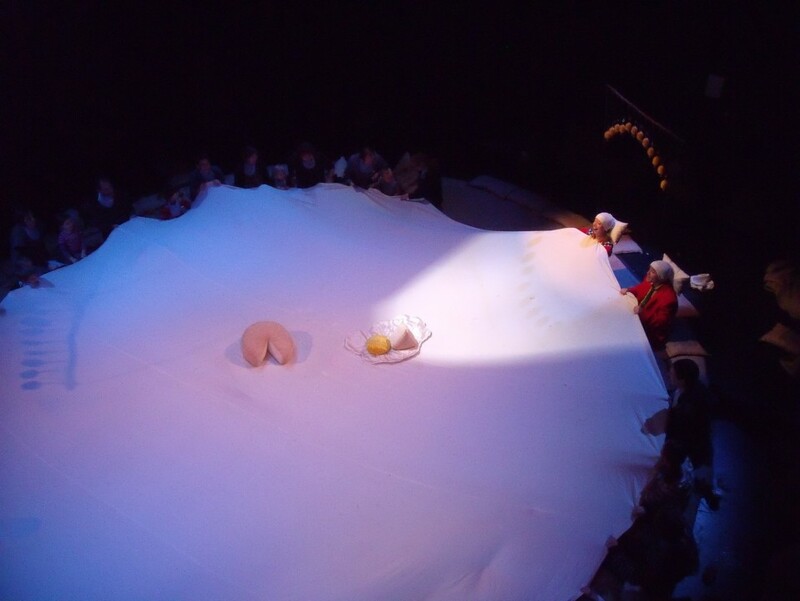 It was a brave decision to stage the play quite starkly; not for Lyngo the gaudy palette much favoured by many children's theatre companies. 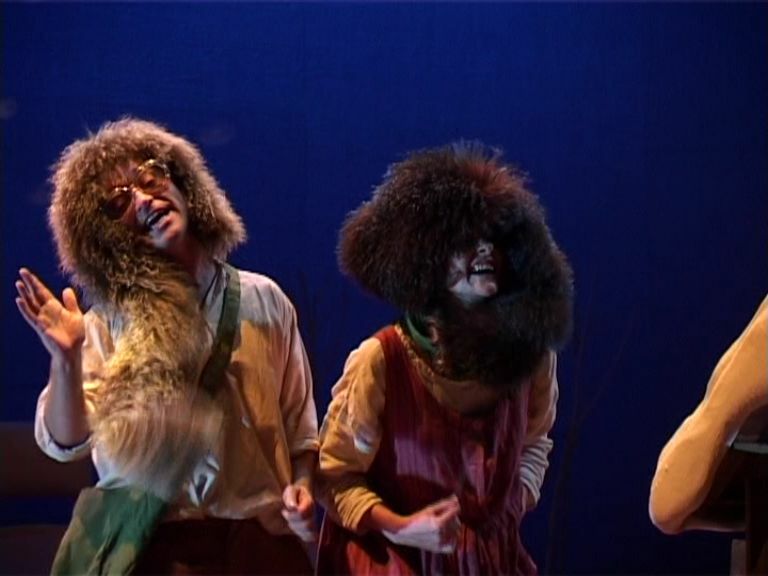 Indeed, I had to laugh inwardly when I realised the production reminded me in a strange way of a Samuel Beckett play! 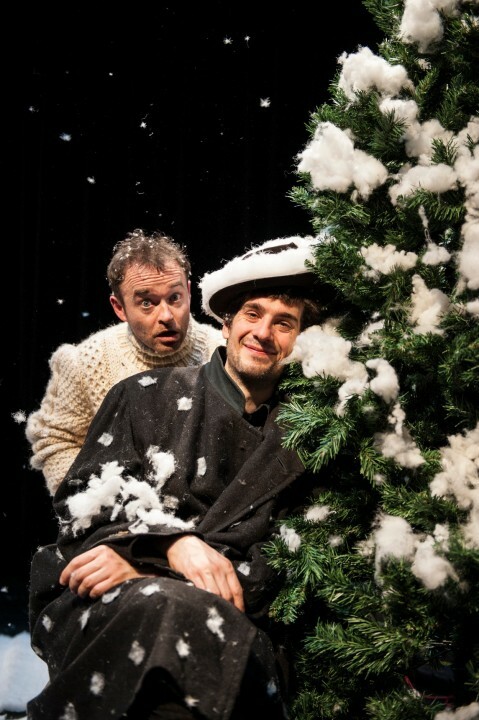 The fact was though that the snow was the star, and extra colours, whizzes and bangs were simply not necessary. 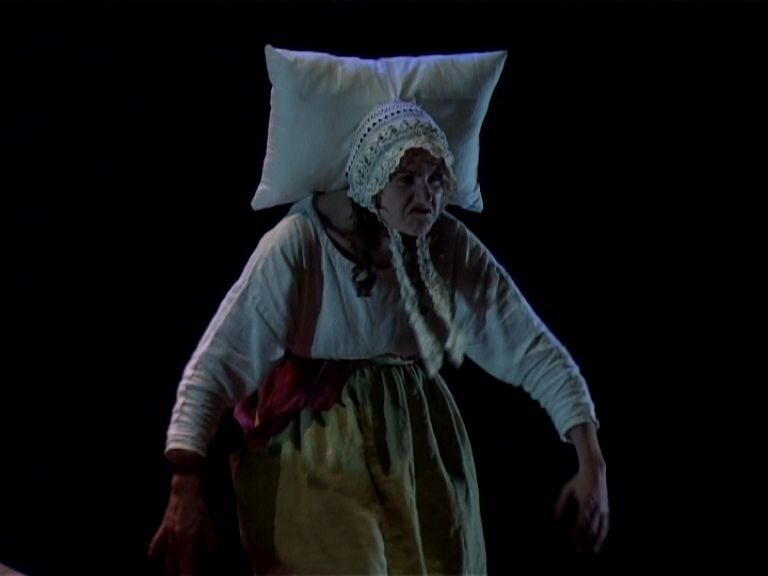 ‘The most vividly memorable thing about this show is the gales of infantile laughter every time the charismatic Carol Rossi lifts so much as an eyebrow. He has a remarkable gift for entertaining children. 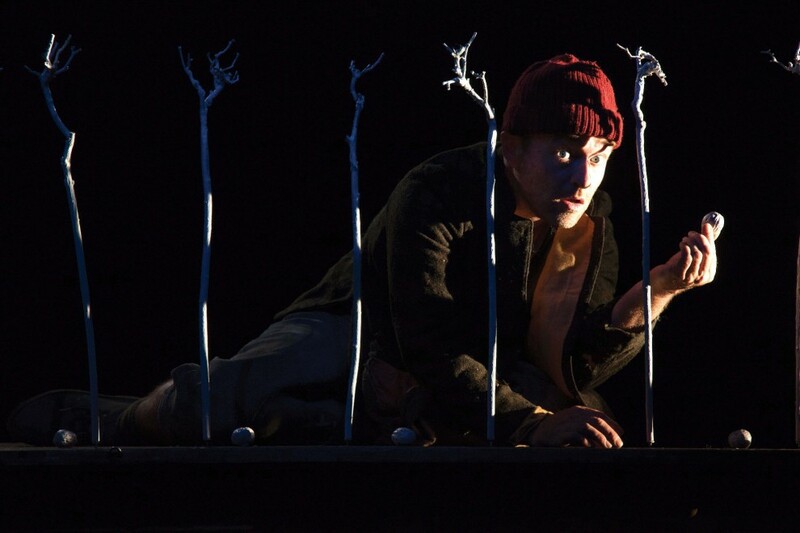 A grey-coated, ragged personification of winter, Rossi's character has arrived squatter-like in the home of Mr Green (Patrick Lynch) who plays the 'straight' spring-like role very warmly against the surreality of Rossi's character. 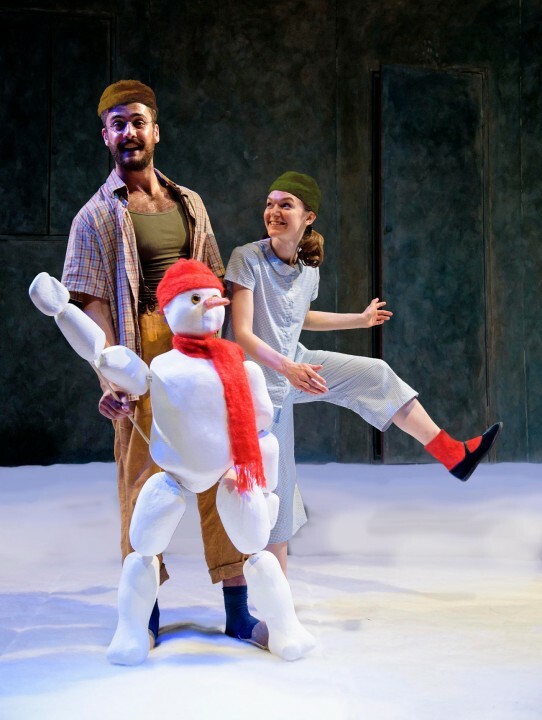 Rossi, a star of Italian children's television, has a chiselled, lived-in extraordinarily expressive face and his naughty dance as the subversive snowman, who is meant to stay put but doesn't, is a delight. 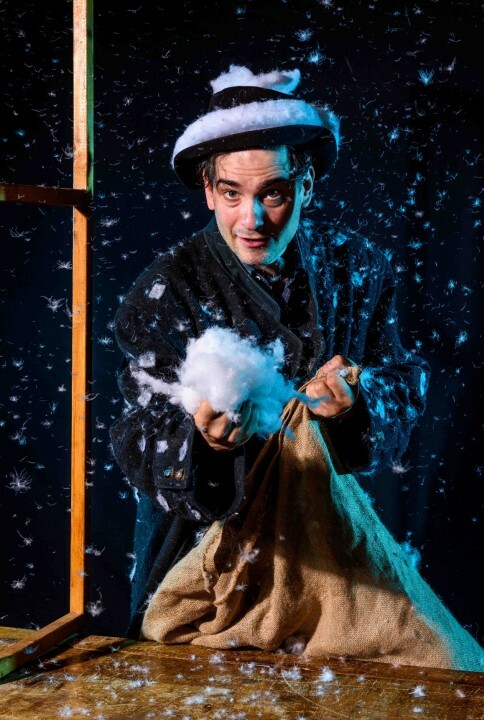 There's a lot of snow in this production - big feathery flakes of it everywhere - and children are invited to handle it, stick it on Rossi's coat and throw snowballs made of it. 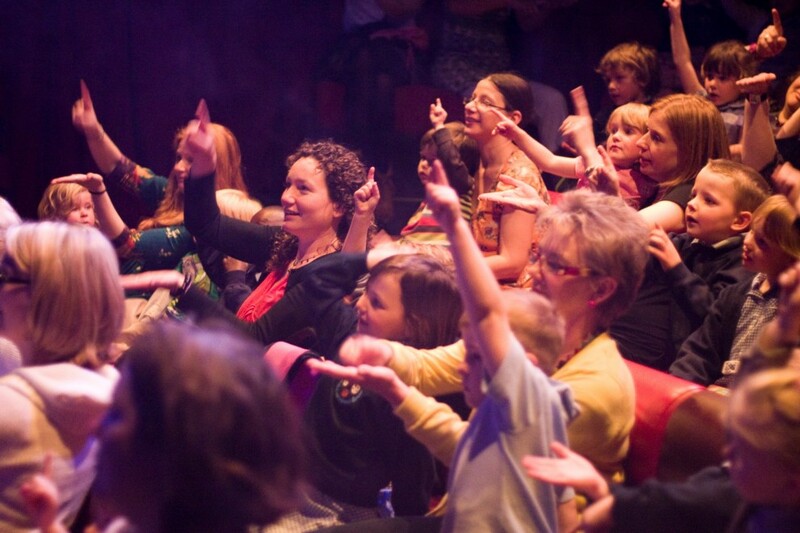 Cue for more irrepressible joyful mirth from the young audience. 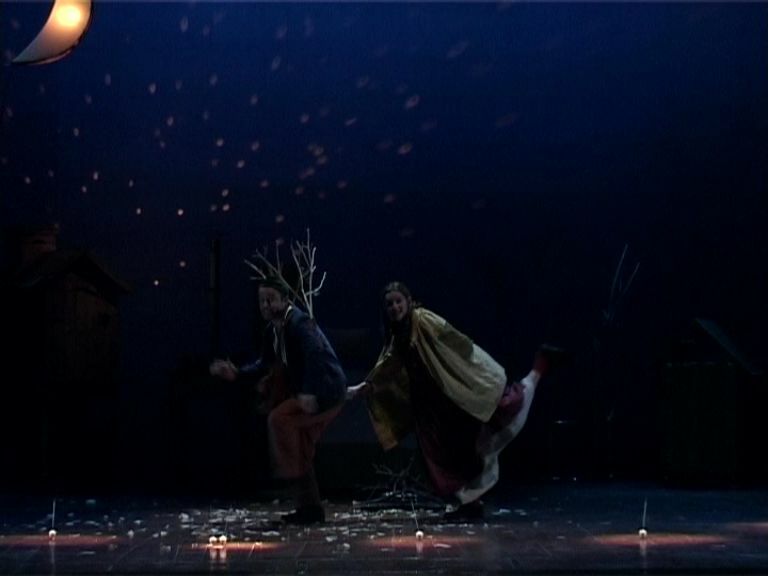 Much of the action is accompanied by Carlo Cialdo Capelli's gentle, melodious music which features seasonal bells. It may have caused the grown-ups a few problems earlier this year, but for children, snow is never a burden. Faced with falling flakes and a snowy white landscape, traffic infrastructure is far from their mind. 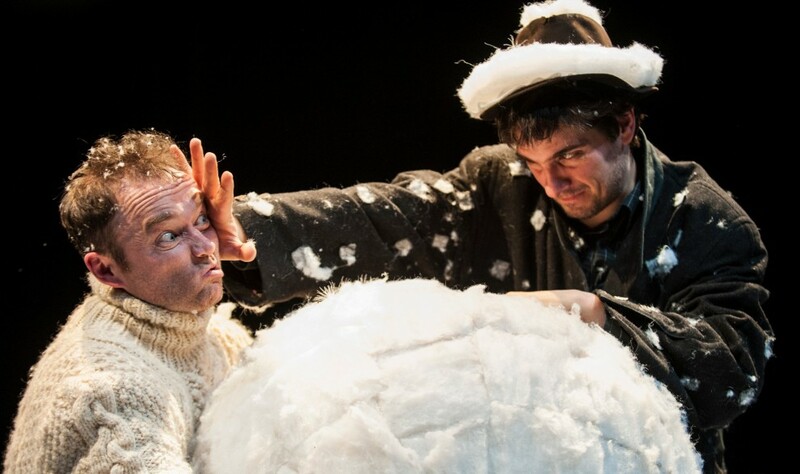 Scottish/Italian company, Lyngo Theatre may not have real snow in its simple yet highly effective show, but the cotton wool-style substitute goes down a storm with its young audience. 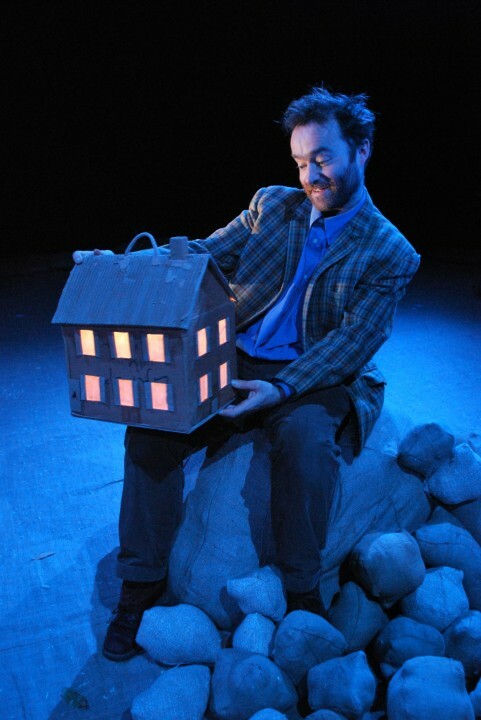 Returning from his holiday in warmer climes, Mr Green (aka spring) finds an uninvited guest in his house. A guest who refuses to leave and, worse still, insists on making an increasingly bigger mess in Mr Green's garden and living room. It transpires the unwelcome visitor is Mr White (aka winter) who can't quite cope with the fact that his time (for this year at least) is over. 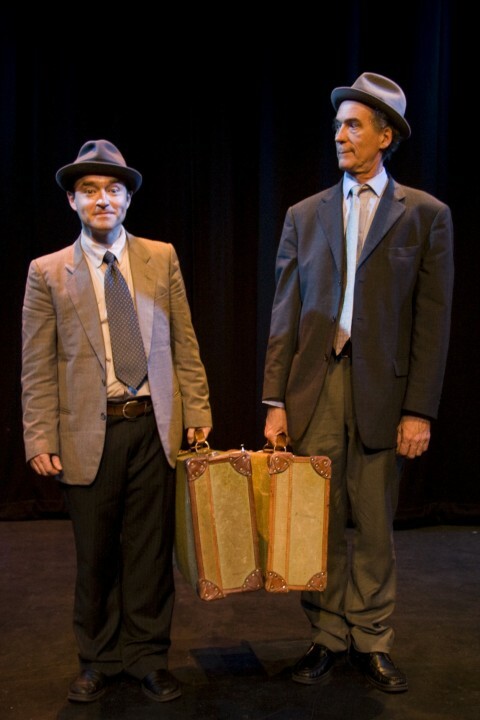 Both Patrick Lynch (Green) and Carlo Rossi (White) have a warm performance style that instantly puts the audience at ease. 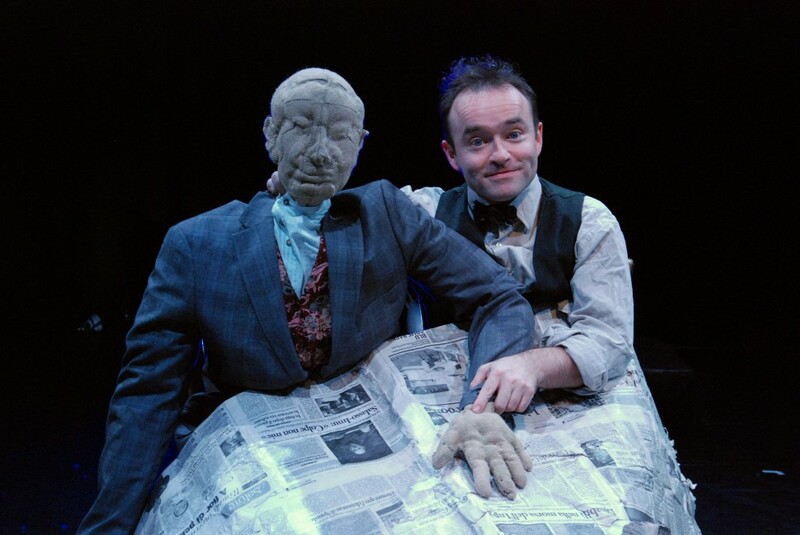 Even though we know Mr Green is in the right, we're really not sure who to root for, so amiable are both characters. 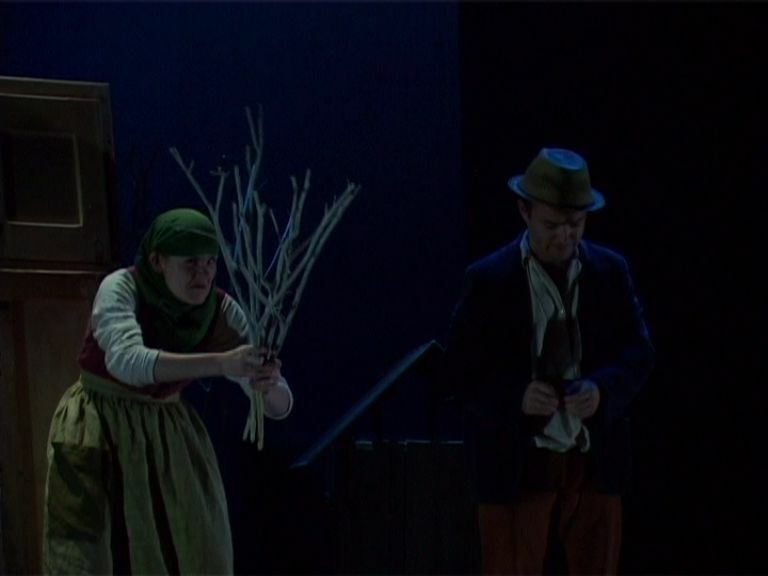 Early on, Rossi enlists the help of two adults from the audience, and if children are left wondering why they haven't been chosen instead, the answer soon reveals itself. 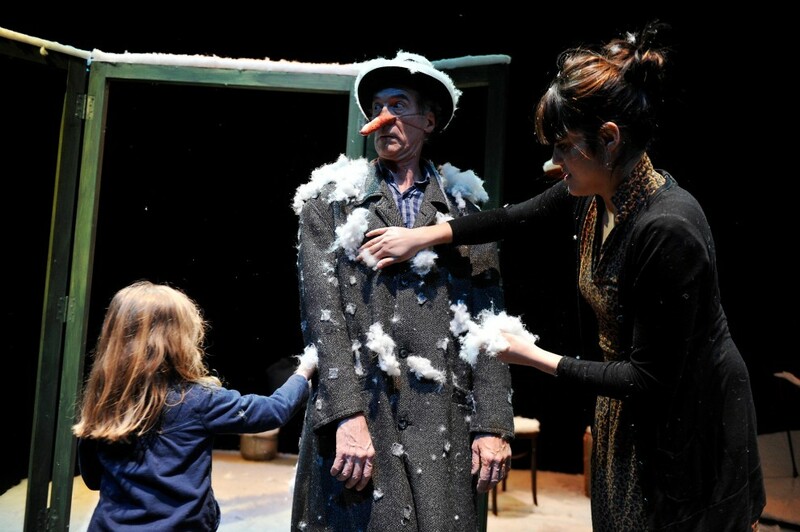 ‘Inviting audience interaction almost from the start, Lyngo theatre's charming little production succeeds in bringing a cold winter day to the summer stage - and leaves its over-four-years-old audience feeling all warm from the experience. 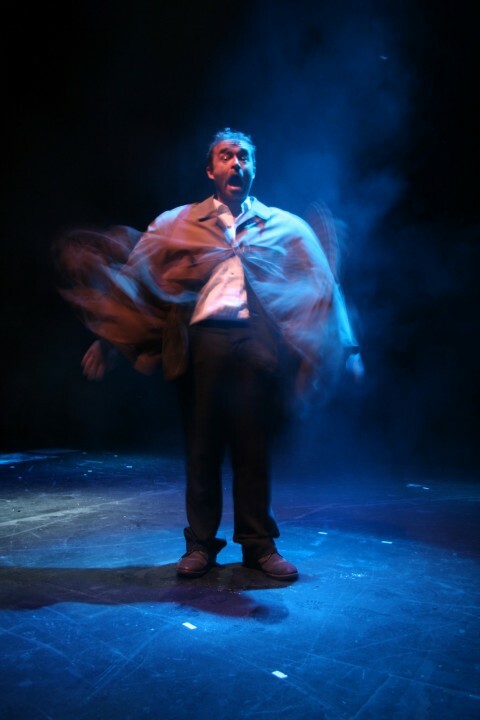 Carlo Rossi plays Mr White, a tall foreign-sounding, pipe-smoking gentleman from the north. 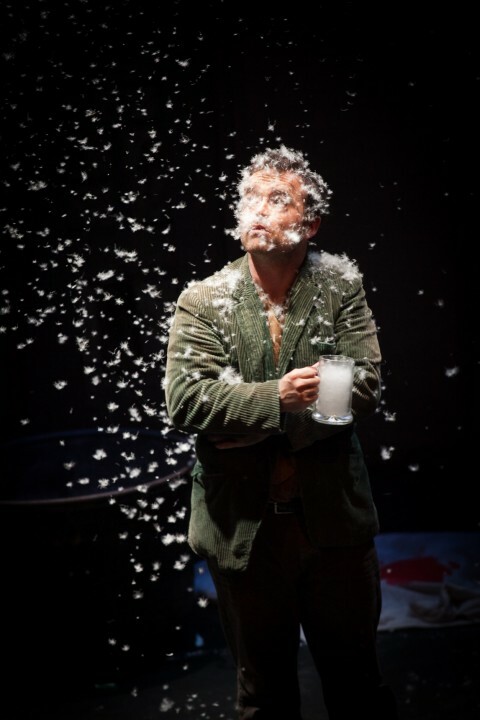 Patrick Lynch is the put-upon Mr Green, who arrives home singing arias from his summer holiday only to find Mr White not just asleep in his front room, but spreading snow all over the place. Soon they are vying for the audience's approval. 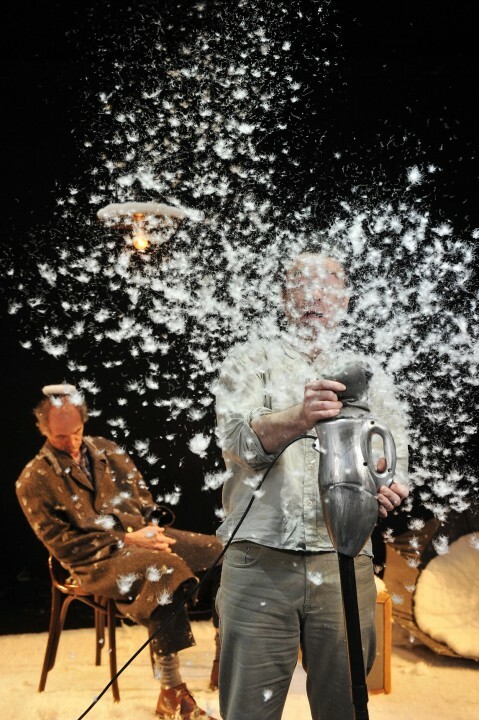 Mr White proffers cotton wool as pretend snowballs and floats motes of snow-like dust around the stage. Mr Green tries to tidy up and gets a couple of kids up from the front row to help. 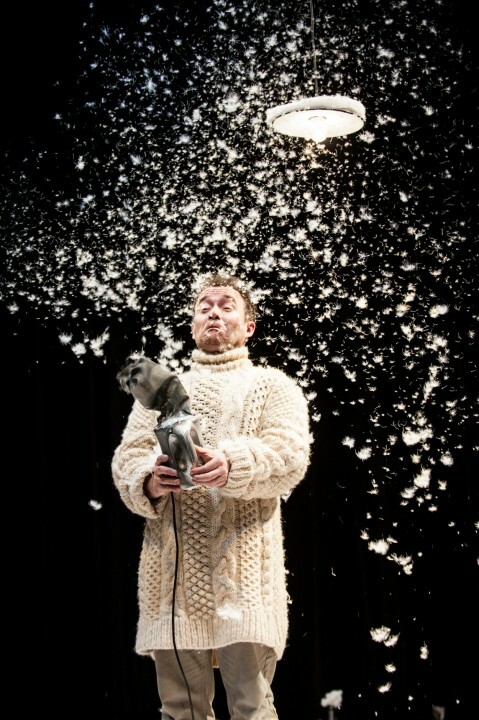 Mr White, meanwhile, has a couple of mums up and helping him spread a blanket of cotton wool across Mr Green's sitting room. 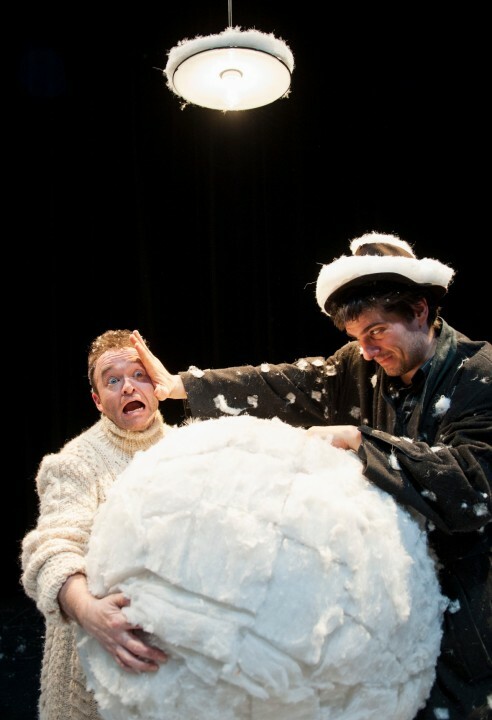 ‘Snow Play is a two person piece designed for two to seven year olds. 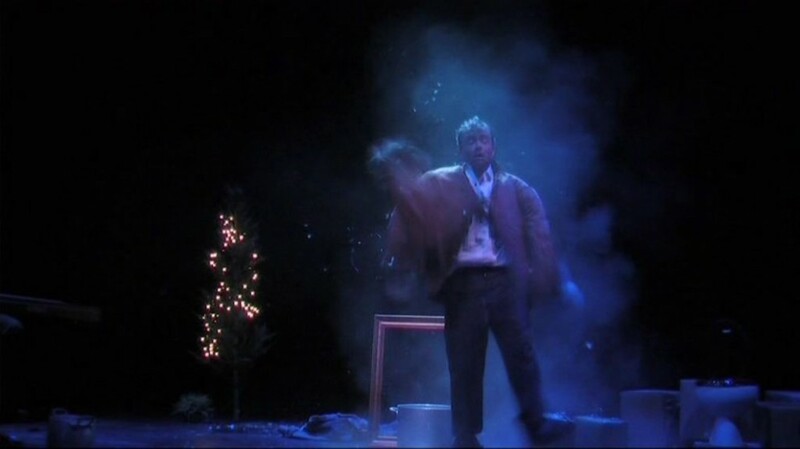 Mr White (Carlo Rossi) is asleep onstage under a single bare light bulb as the house opens, downstage of him are some basic glassless french windows and to the right of those a Christmas tree. 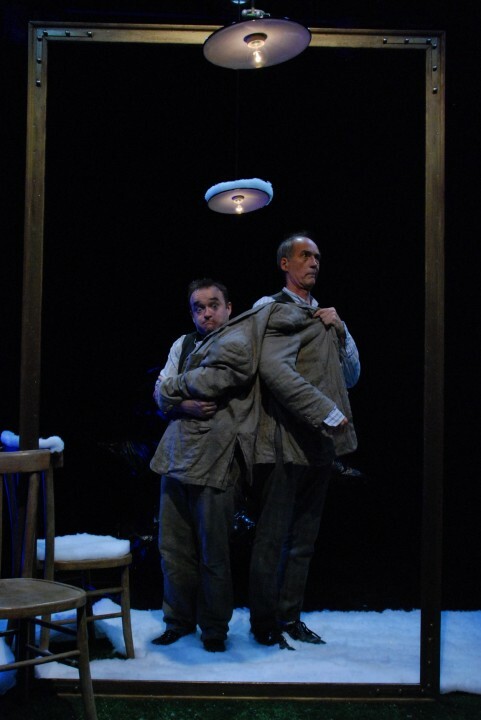 It would be a bare and slightly dull setup were it not for Carlo Cappeli's score - which is a beautiful and evocative piece of writing - and the 'snow' circling in the air. 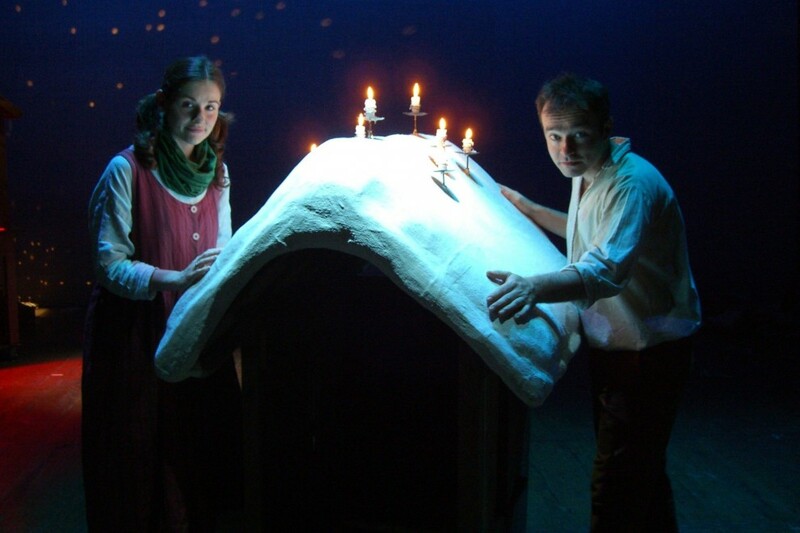 With these in place the theatre becomes a magical winter environment. 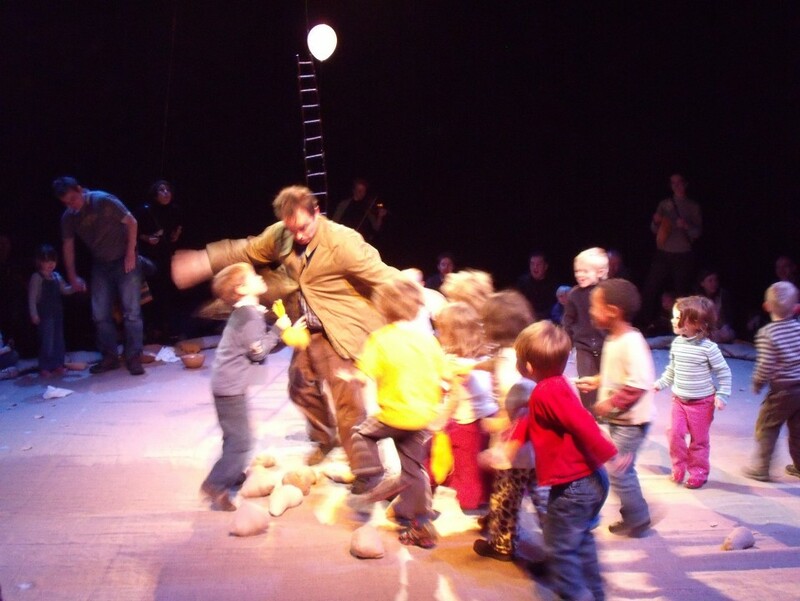 A rowdy audience of children never really settles throughout (this is failing on the parents part rather than the performers) but when they are as close as they will get Carlo Rossi awakes. 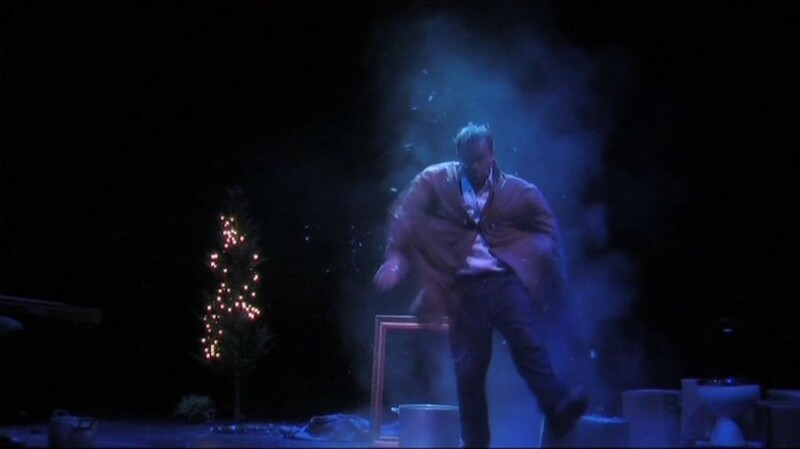 He comes out of the window and hands 'snow' to the audience; 'for later' he says. 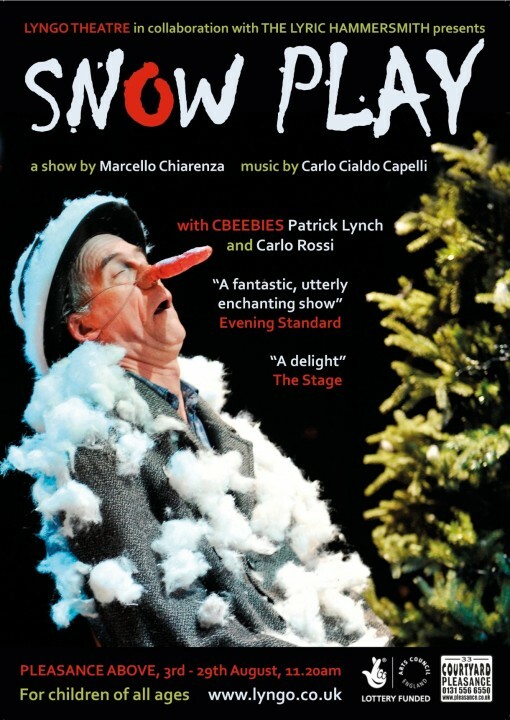 Rossi hasn't got any lines that are much more complicated than that, a skilled clown his role in the piece is to thwart Mr Green's (Patrick Lynch) attempts to get him out of the house and clear up the snow. 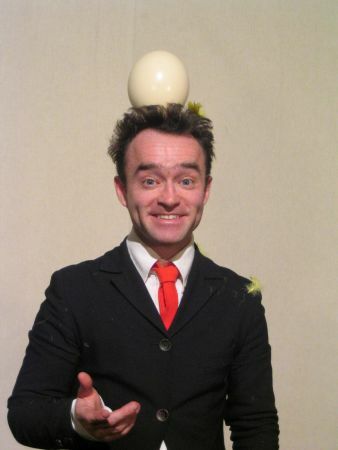 He is a captivating performer with a great capacity for physical humour and keeps the children mesmerised throughout. 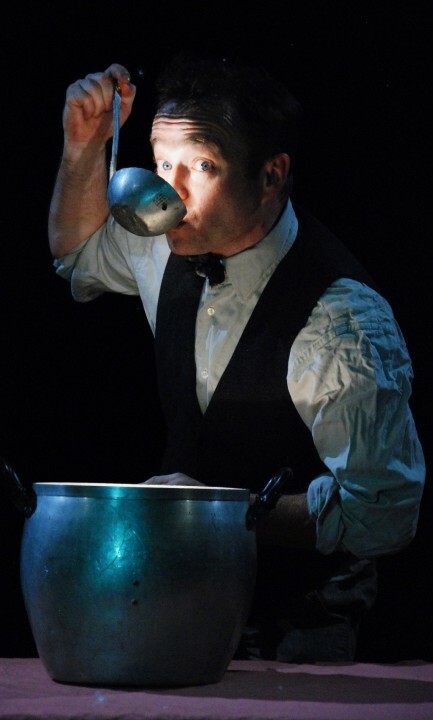 Patrick Lynch is a excellent foil for Rossi, he has the bulk of the lines, communicates clearly and simply with the children but shows a great deal of flair for physical comedy as well. 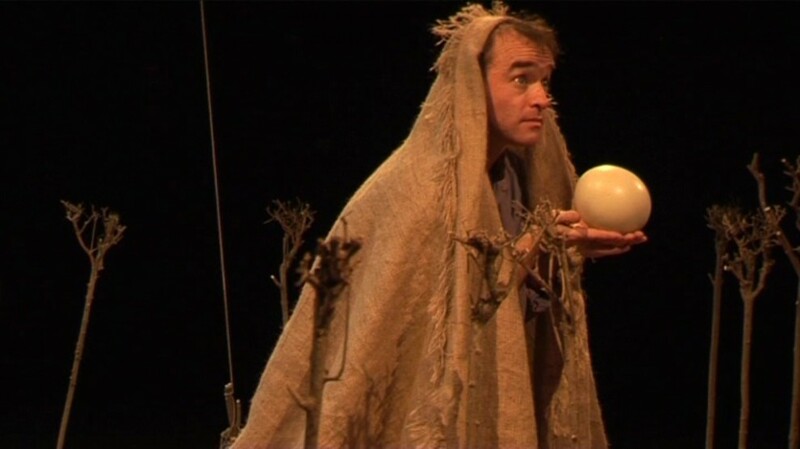 A great deal of credit should be given to him for his control over the children, the production asks a lot (at one point every child in the auditorium is onstage) and yet he manages things without breaking character which is a considerable achievement. Together, him and Rossi are a classy team who effortlessly entertain. 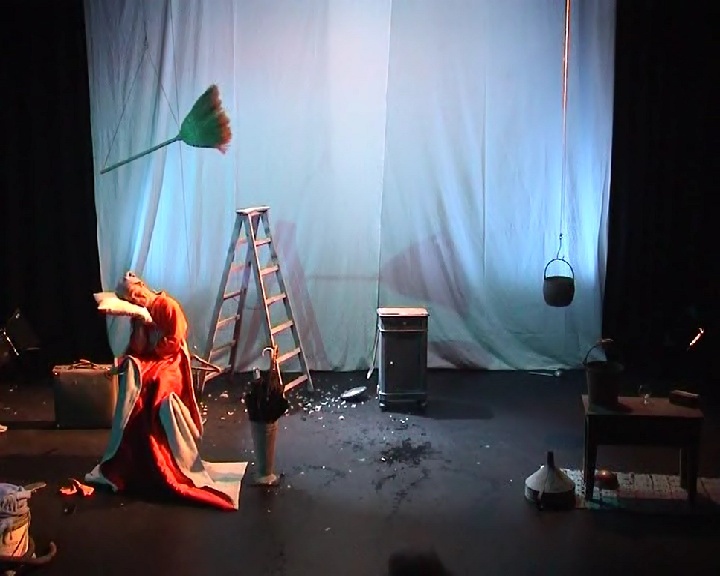 The third performer is Kate Phillips, she is a plant (a performer sat in the audience in plain clothing) she has minimal involvement and does a excellent job but, ultimately, her involvement feels calculated and disingenuous. 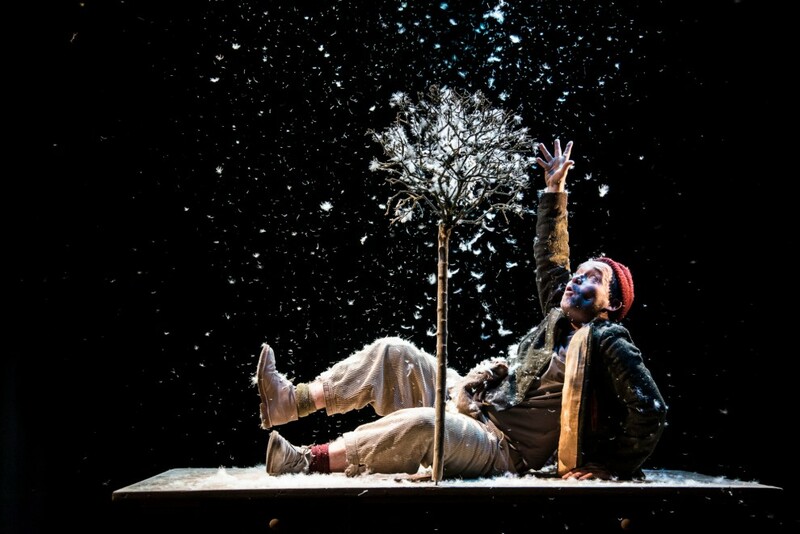 Despite the skills of the performers the real star of Snow Play is the script and its tight integration with the prop and set design. 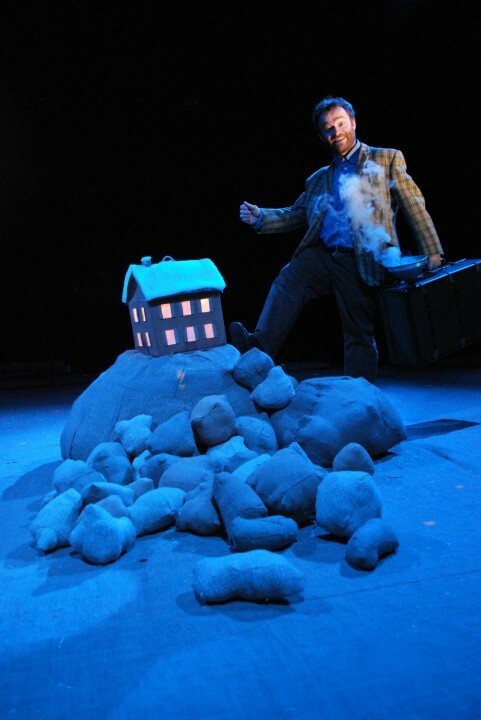 Many different types of snow are used - ranging from large rolls of it that the audience spread over Mr Green's house whilst he is sweeping up the paper based snow Mr White has spread outside. 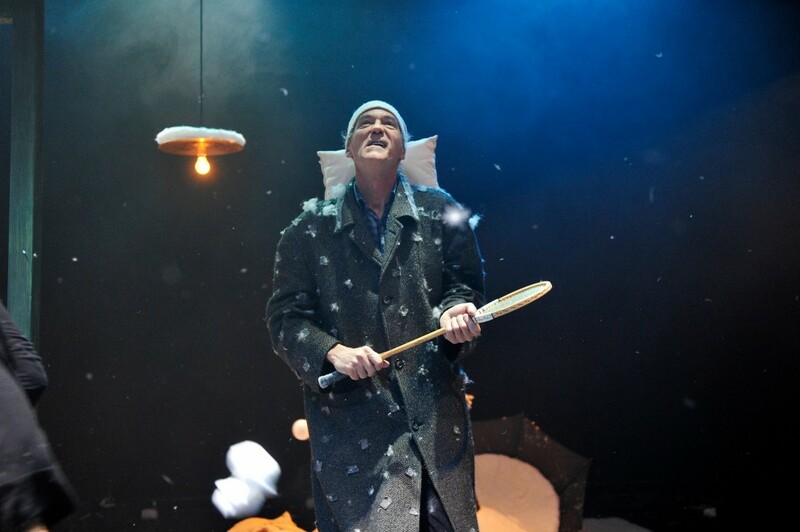 Other tricks used to great effect are a umbrella that snows continuously from inside itself when opened and 'snowballs' that the audience throw at Mr White who then bats them back with a tennis racket. Marcello Chiarenza's direction is assured and skilled, mixing slapstick with storytelling and always keeping Mr White and Mr Green as distinct and rounded characters. He takes his young audience seriously and repeatedly gets them involved, allowing the stage to get close to anarchy before trusting his two excellent performers to reign things back in. It's very impressive work. There are slight niggles, the lighting design is patchy and disjointed at times, although operator error and usual Edinburgh technical compromises most likely explain this. The French windows in the set are also slightly too imposing from some angles and obscure some of the action. ‘Mr Green returns from his holidays to find that Mr White has moved in. It wouldn't be so bad but he is the winter and covers the house inside and out with snow. A touch of adult interaction, kids throwing snowballs and a wonderful hour under the lights leaves young and old thoroughly satisfied. 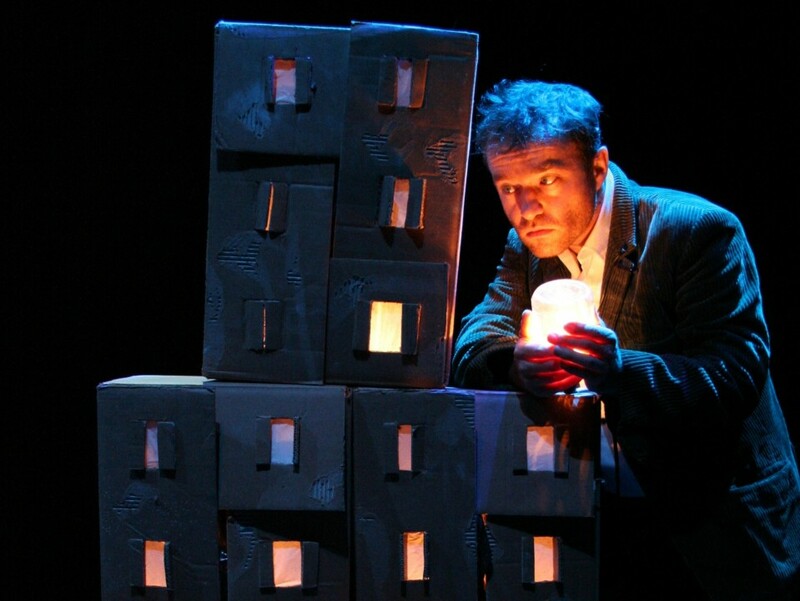 The piece has simplicity at its core but does ask us to suspend our disbelief from beginning to end. 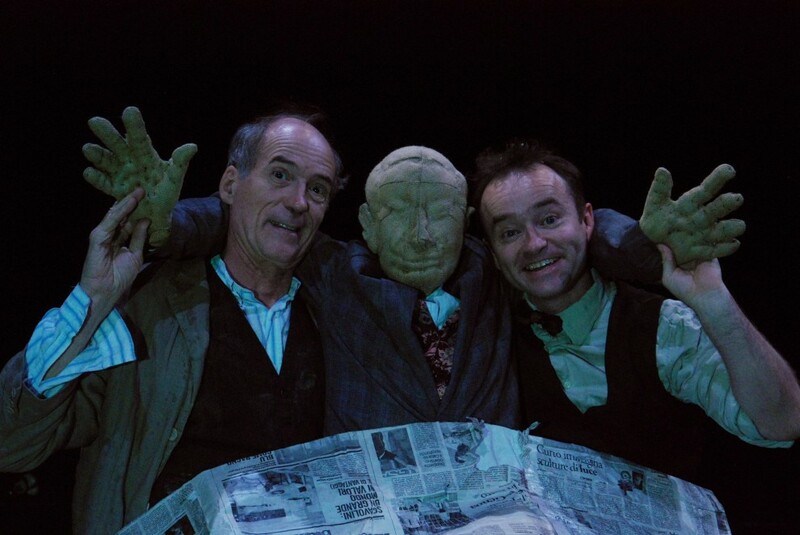 Two actors without the youthfulness of a C Beebies presenter but with the experience of being one - take a bow Patrick Lynch alongside Carlo Rossi - show us how to keep the kids involved and the pace just right. We are enchanted by their interplay, buy into the whole door that keeps the noise out and the snow that becomes snowballs and falls out of every piece of scenery. 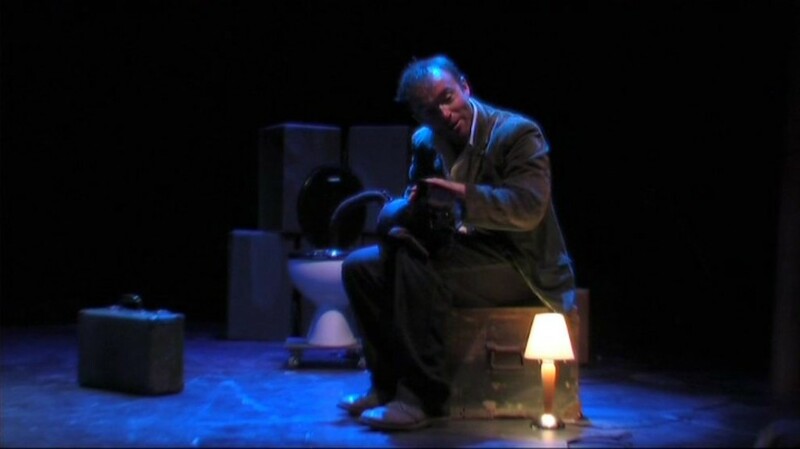 The setting is charming but also functional with the tree, the light, the previously mentioned door and the suitcase brought on by the returning Mr Green mined like a Shakespearean sonnet for laughs and effects. It needs the effects and the staging but does not simply depend upon them. 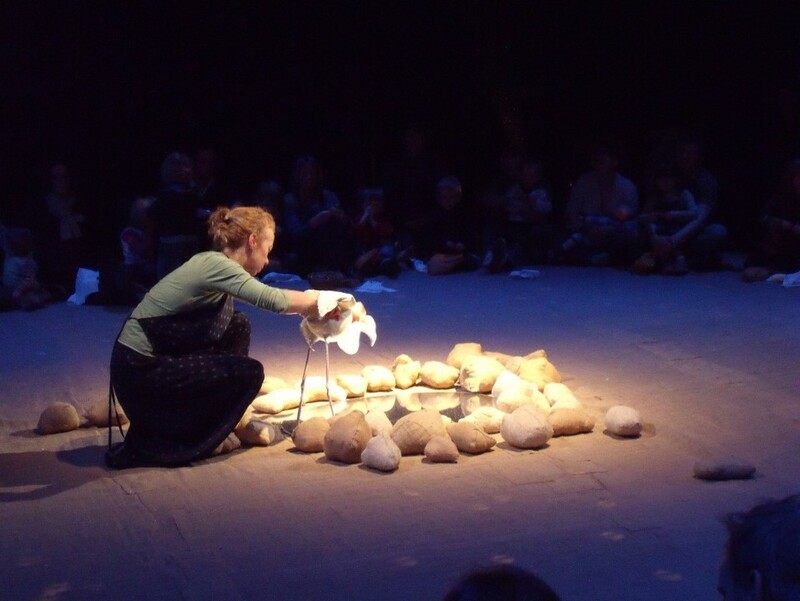 The pace of the show was right and young and old became aware of each nuance as served up as both performers demonstrated consummate skill in their approach to the piece. 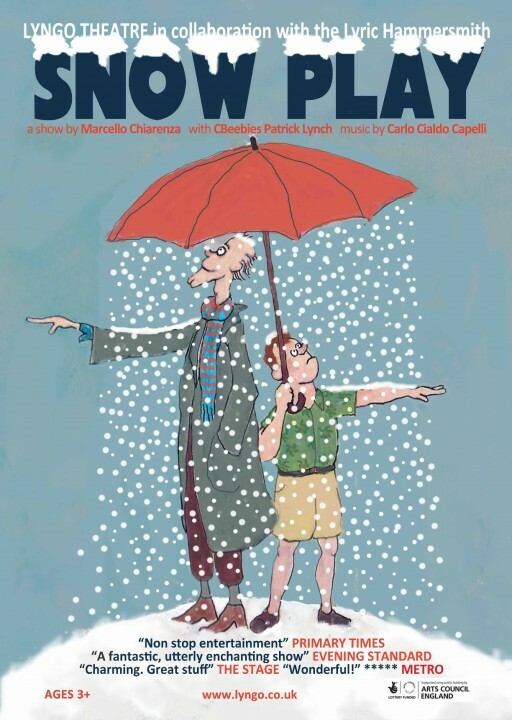 The slapstick was enough, the storyline worked and the interaction enough and at the right times to keep the kids onboard and the parents less worried about snow ball fights in August. 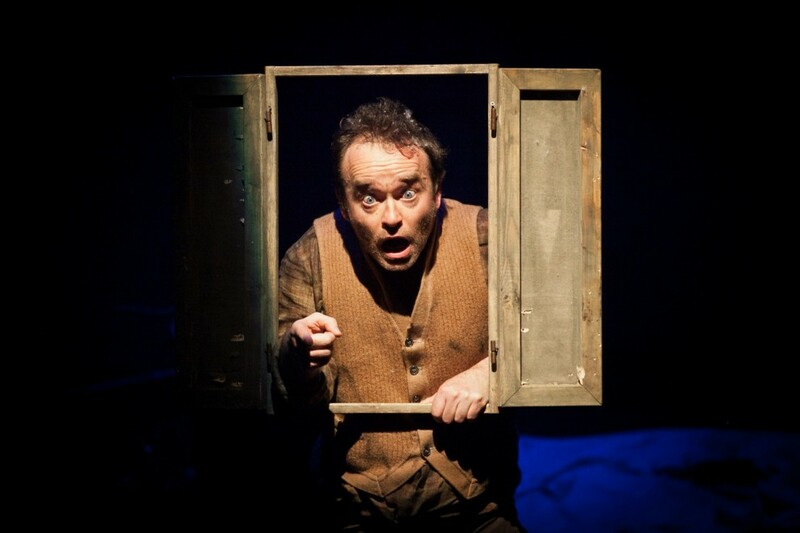 As a production this ticked enough of the boxes to make it a hit transfer from London that makes the Fringe such a delight when you find something of this quality and value. The down side for me were slight but were present. 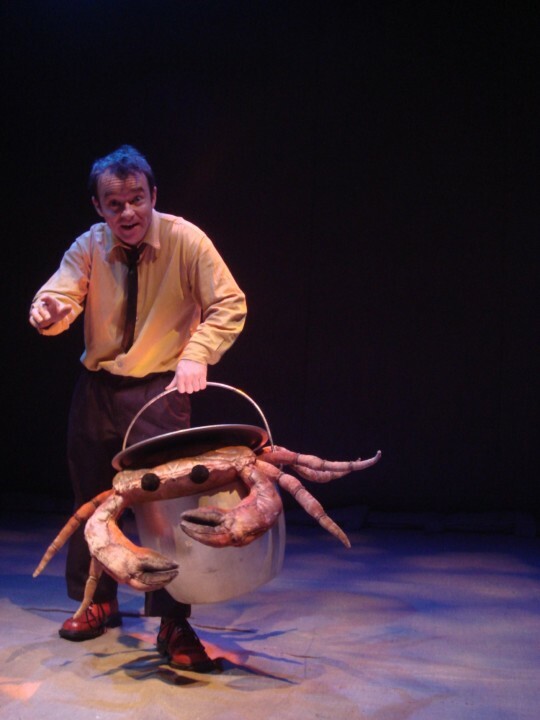 It comes in whether this is, as an example of its genre one of the best examples of children's theatre and I would have to say that my opinion is that it is great but I have seen better. 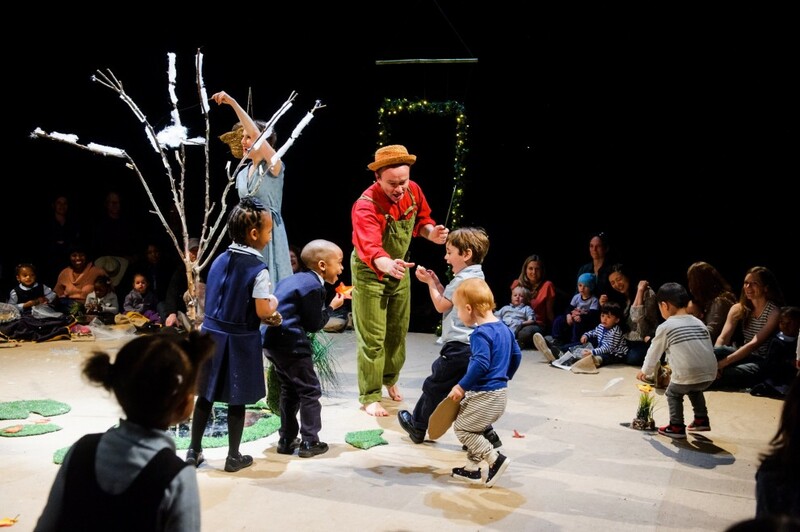 The quality of the performers notwithstanding and the structure being so good there were times when I felt the kids were being directed rather than fully engaged. 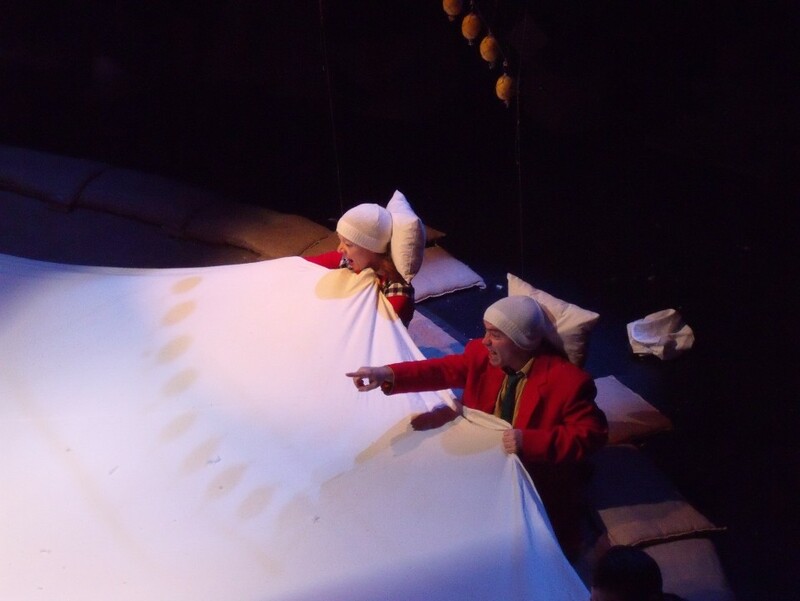 Risks are taken every time you try and involve children as the stop button can be hard to find and the authority each actor possesses onstage is impressive but the children became ancillary to the story rather than integral to its telling. 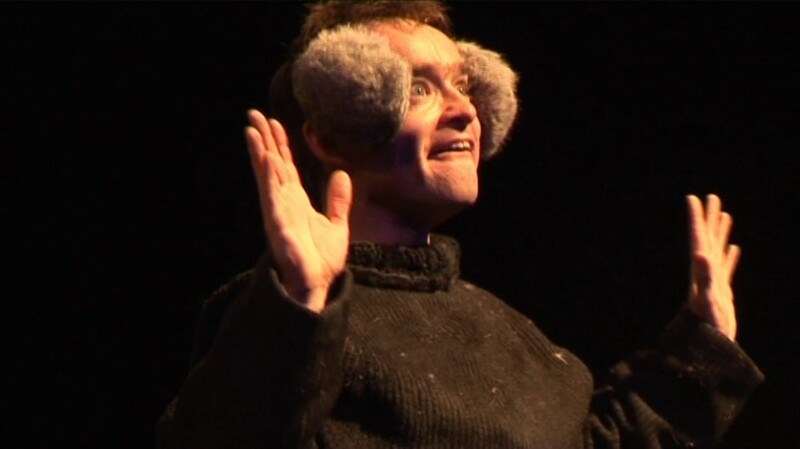 The use of someone in the audience who is part of the production is for me quite difficult. You either go for it or you don't. ‘I wish I was a kid again then I could have joined in the snowball-slinging 50 minutes of sheer delight that was Snow Play without drawing undue attention. 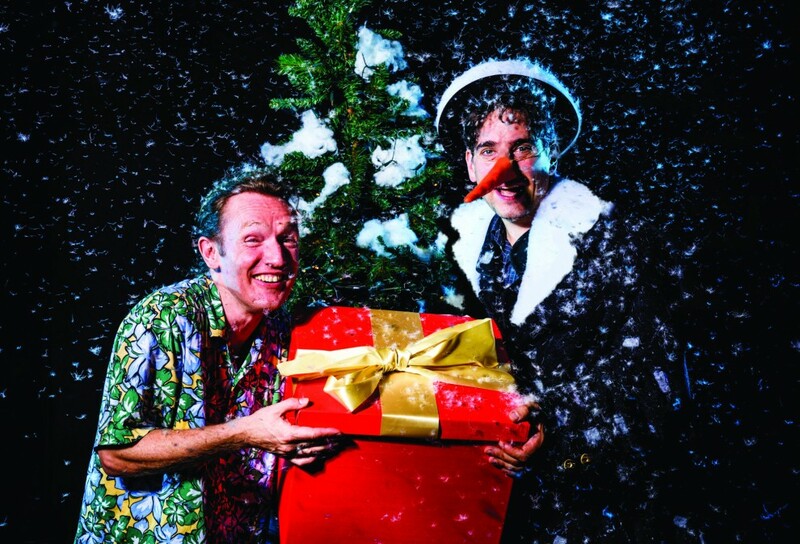 Lyngo Theatre's winter family show is aimed at younger children between three and eight years old (and their parents), although unaccompanied adults will have a good time too. 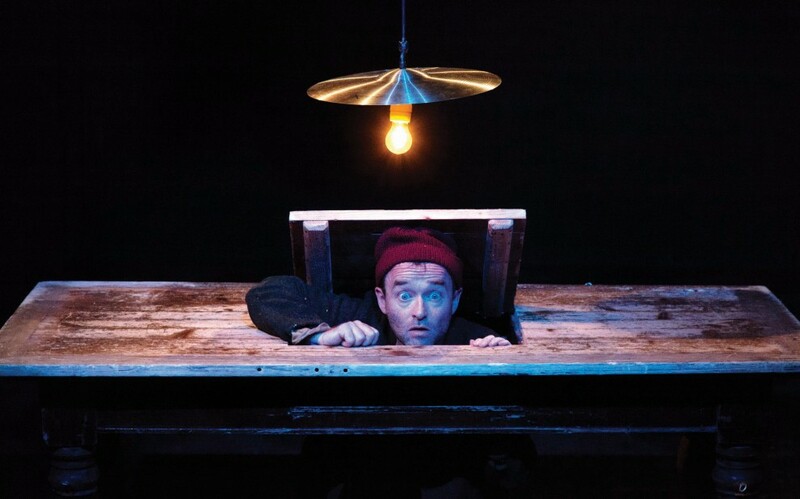 It played to sell out audiences in London last year and it's easy to see why it's perfect for the Christmas slot in Poole Lighthouse's studio space. 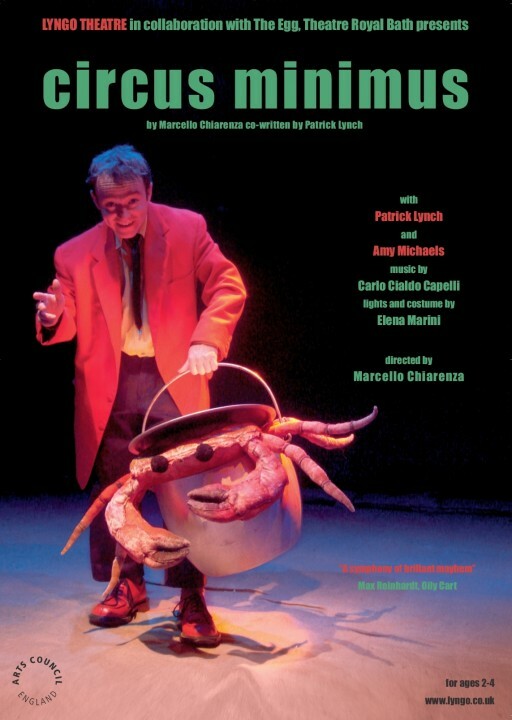 Italian theatre practitioner Marcello Chiarenza has crafted a wonderful piece incorporating physical comedy, circus skills and mime and Carlo Capelli's music sounds like sleigh bells. 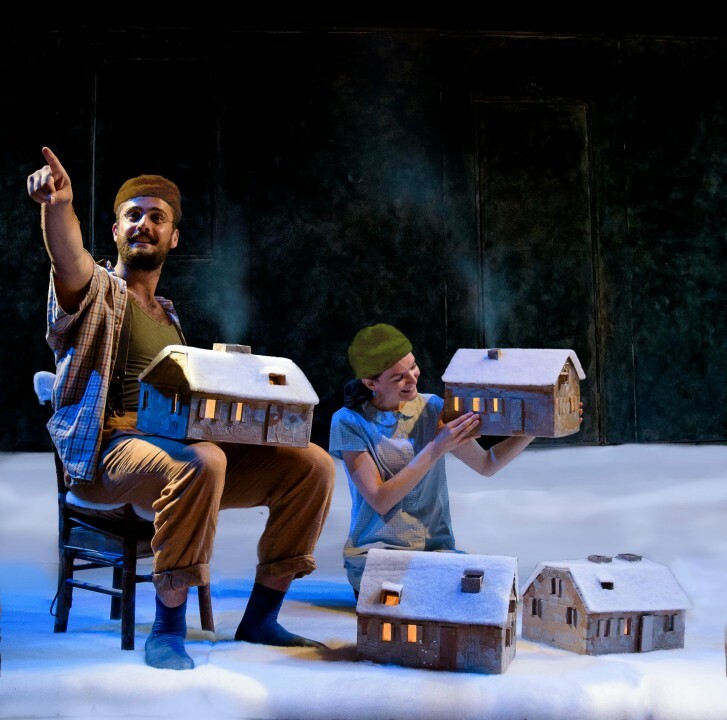 The story of sun-loving Mr Green's retum from holiday to find Mr White squatting in his house, gradually filling it with snow, is simple to follow and absolutely enchanting to watch as battle commences for possession of the property. 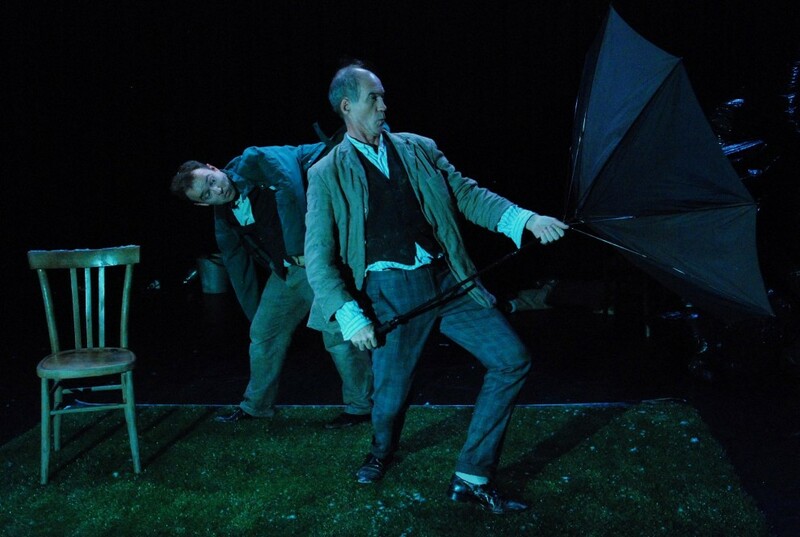 Tall and icicle thin, Frank Wurzinger plays Mr White with an unhurried, otherworldly innocence that contrasts beautifully with Andrew Irvine's frenetic, arm-whirling Mr Green. 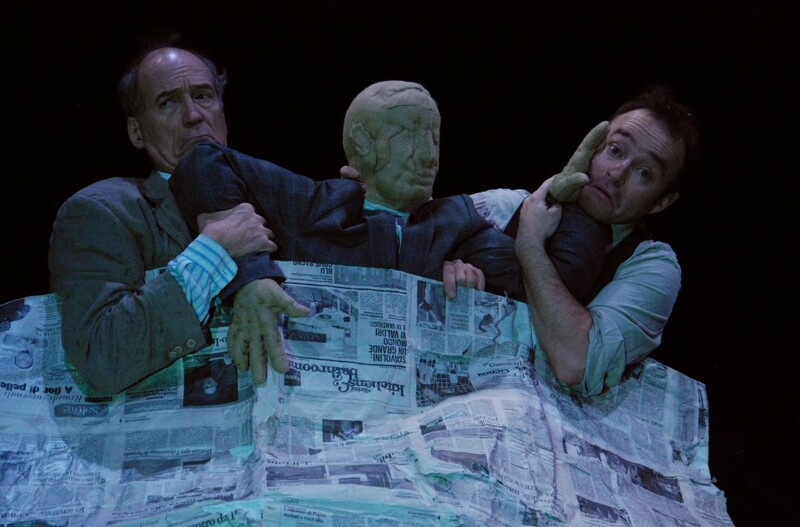 Their physical difference - Wurzinger towers head and shoulders over the stockier Irvine - works well, making Mr Green's attempts to evict Mr White physically very funny. But Snow Play is less about watching and more about taking part. 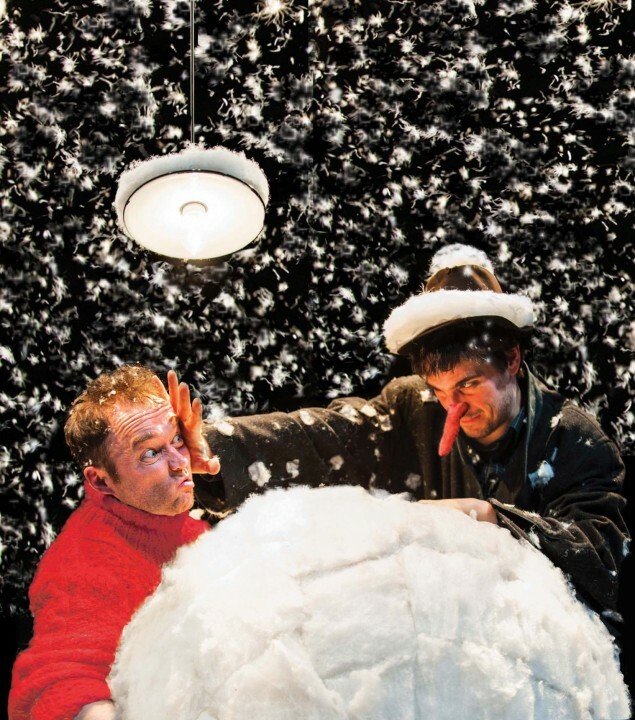 "Snow" is liberally distributed among the audience - later to be returned as snowballs - parents are called into service on stage and youngsters invited to help build snow men and sweep up snowfall. 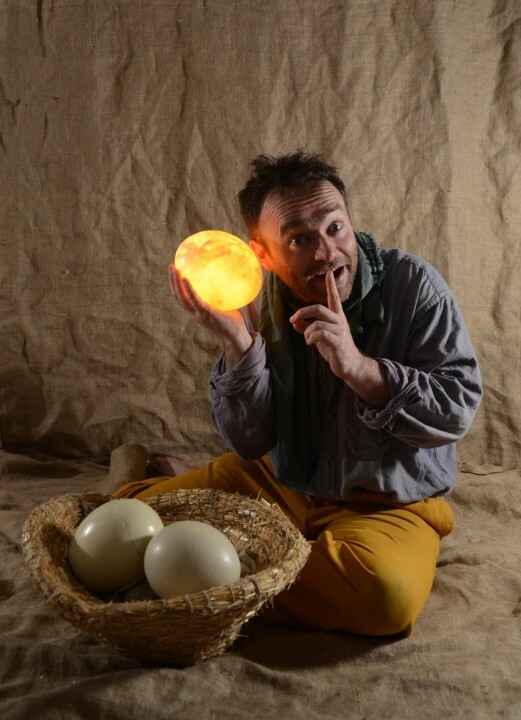 ‘When the sun has got its timing spot-on for the holiday weekend, it's tempting to think outdoors, but this afternoon show, by Lyngo Theatre, is well worth an hour of family time. 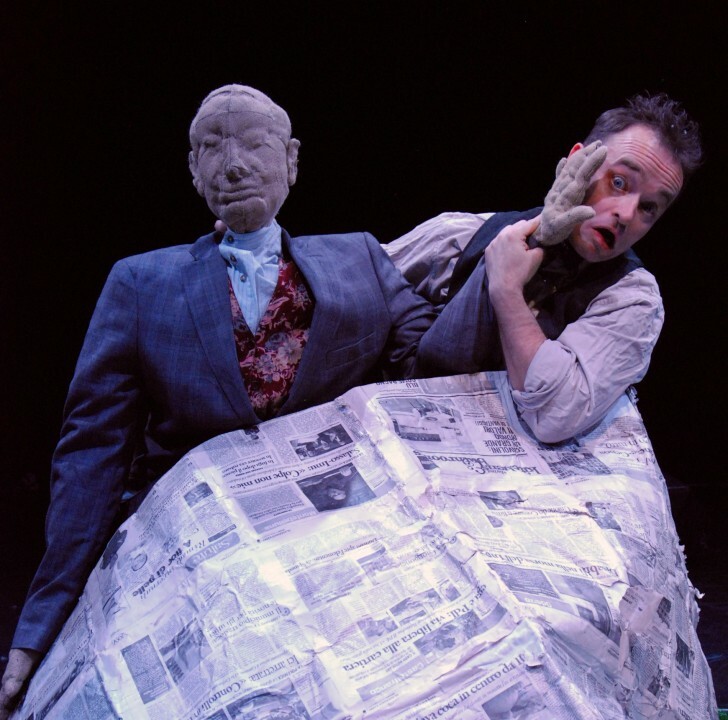 Aimed at the over fives, it's an eccentric wander through the place where dreams come from a place on the other side of the mirror where the Dust Man sources all the topsy-turvy, back-to-front and inside-out ideas that make perfect sense when we're asleep. 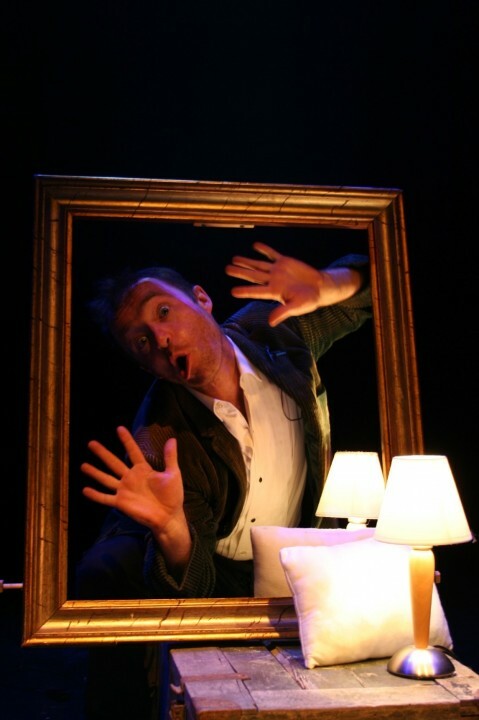 To begin with Dusty (Patrick Lynch) appears affably shambolic: but his tricksy routine with a picture frame - it's an invisible window in an invisible wall - leads his giggling audience into understanding that his dream world is on the "other side" of ours. 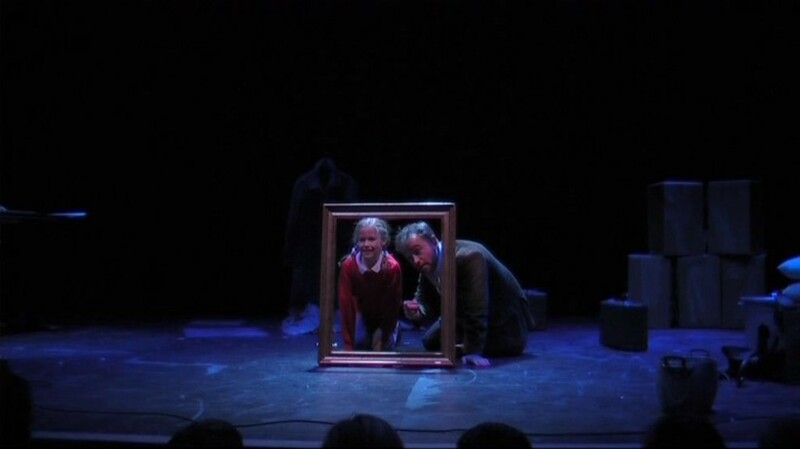 Best of all, in a kind of Alice Through the Looking Glass moment, he invites a little girl to climb through his frame and into his make-believe. ‘It was quite a curious setting at the start with the dark gloomy lighting but we were all amazed when the lights slowly started to glimmer. 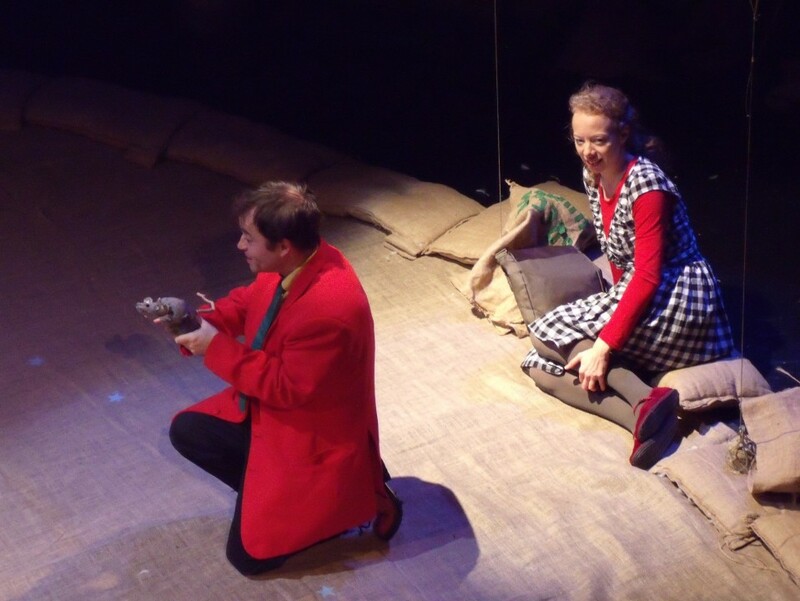 Through the show there were a number of humorous and joyful songs that made us the audience feel both calm and exhilarated. 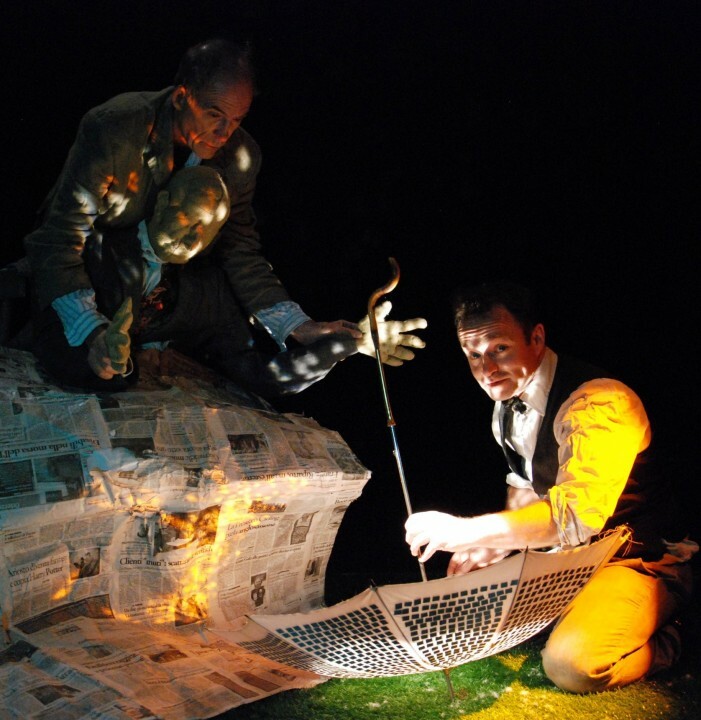 The scenery and props were few throughout the play but very inventive helped our imaginations. Surprisingly there were only 2 actors to perform 6 fascinating characters. Our favourite was Hansel because of his joke about the “fat” sheep. 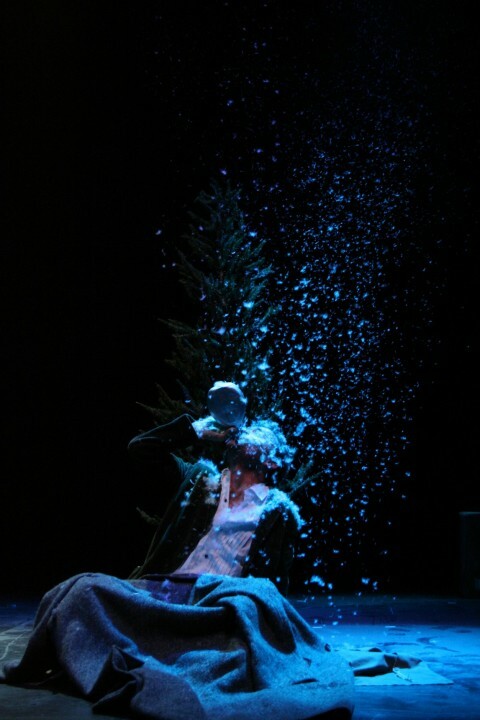 Concentrated Christmas production with forceful impact. 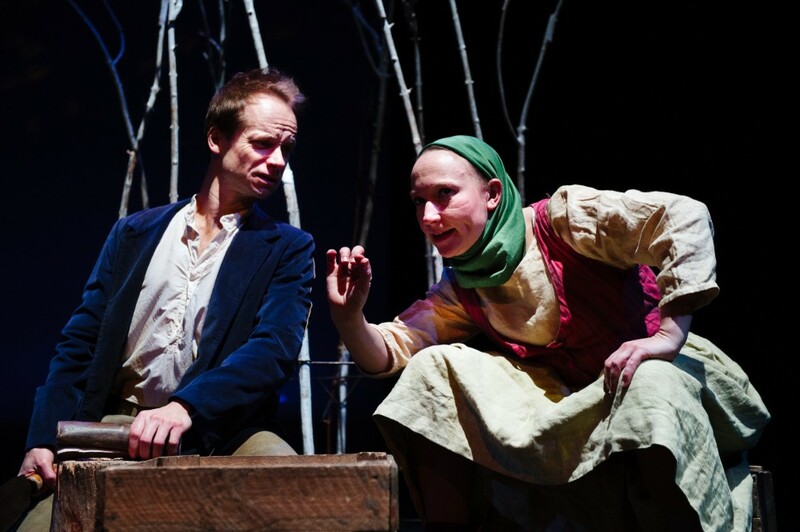 A cut-down, two-person version of well-known folk-tales like Hansel and Gretel isn't normally my idea of fun. 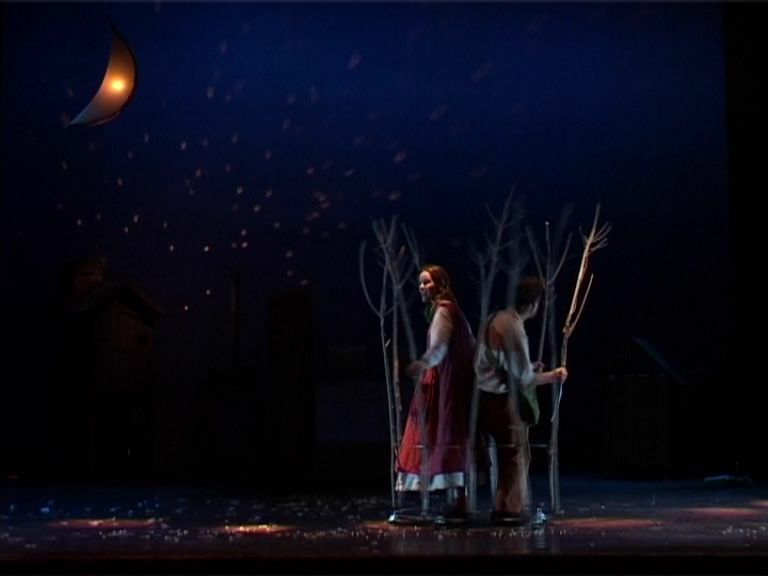 It makes economic sense for a small-scale venue like the Met, but the doubling and other strategies needed when the same two actors are playing multiple parts and trying to impress as a range of characters each, easily threatens to short-change young viewers as writer, director and performers struggle with the imposed limitations. 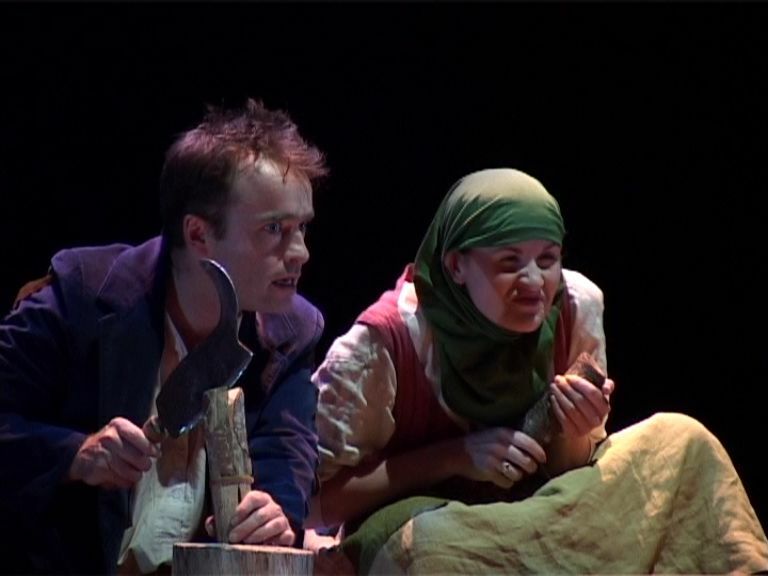 But Lyngo Theatre, whose expert way with theatre for the young is evident in their work, has devised a way to make maximum impact with limited means; so much that the two-hander format becomes a virtue. It helps focus in a show aimed at 4+, as actors Amy Michaels and Robin Brockway become guides through the story; not as narrators but by quick character changes. 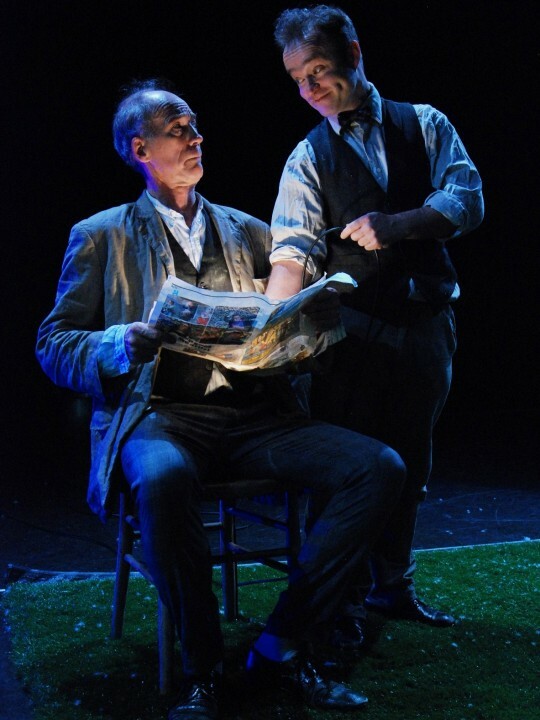 A couple of alterations in elements of costume and a change of stance move Brockway between Hansel and his good-natured but unassertive father. 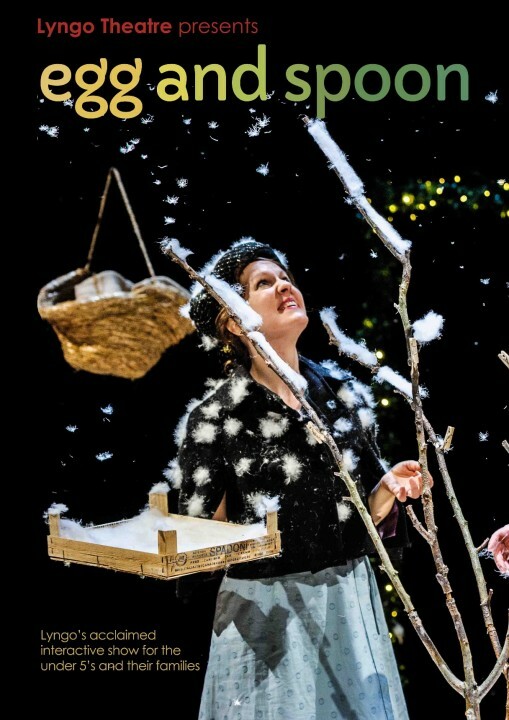 More noticeably, because the contrast's greater, Michaels' bright and lively Gretel physically sags and vocally deepens into a stepmother whose manner any child would recognise as chilly-going-on-freezing. Both actors later function as owners of the sweetly luring sweetie-house, she with a trail of flame-red hair, he under a sort of Davy Crockett hat needing a severe trim. Scenery's limited, but economically used; principally a couple of mobile seats with front coverings used as beds. 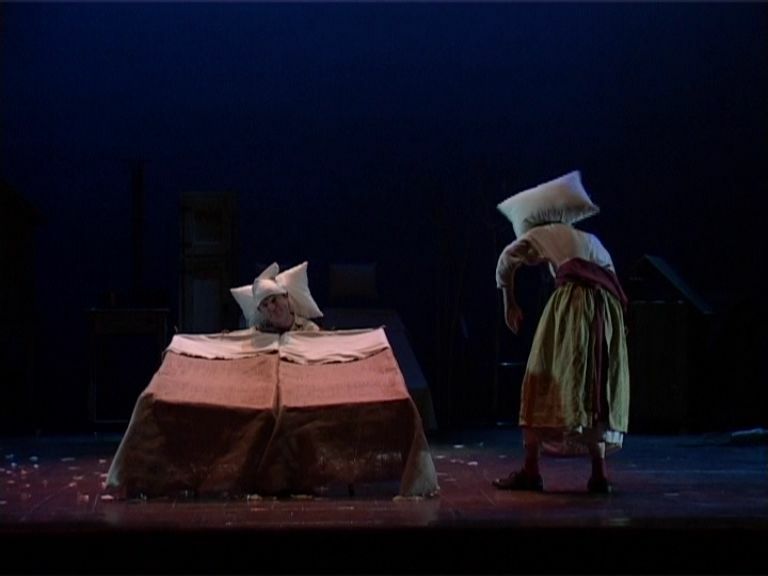 Hansel and Gretel lie together as brother and sister; the parents' bed-talk is colder with a sense of estrangement provided as the 'beds' wheel at angles to each other, joined only narrowly at the head. Seasonal adjustments and the joy of being alive. 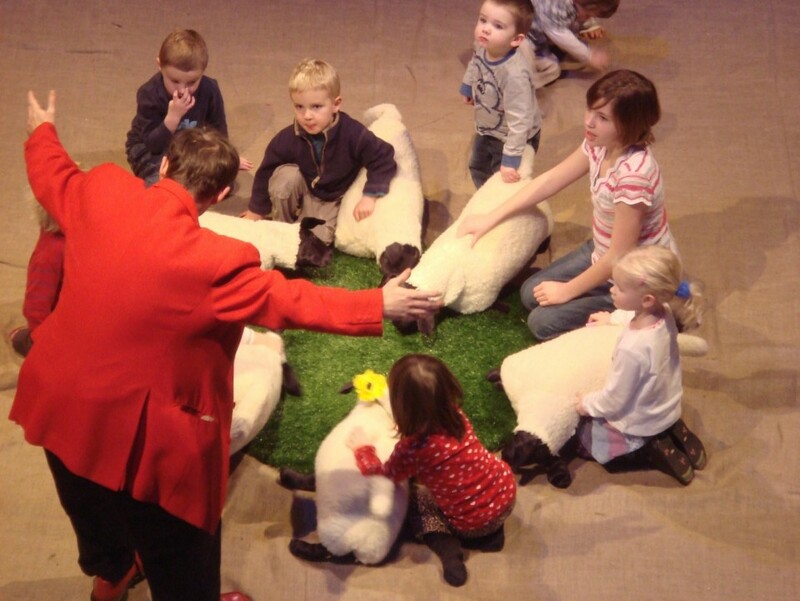 It's not only the police who're getting younger; it's theatre audiences too. 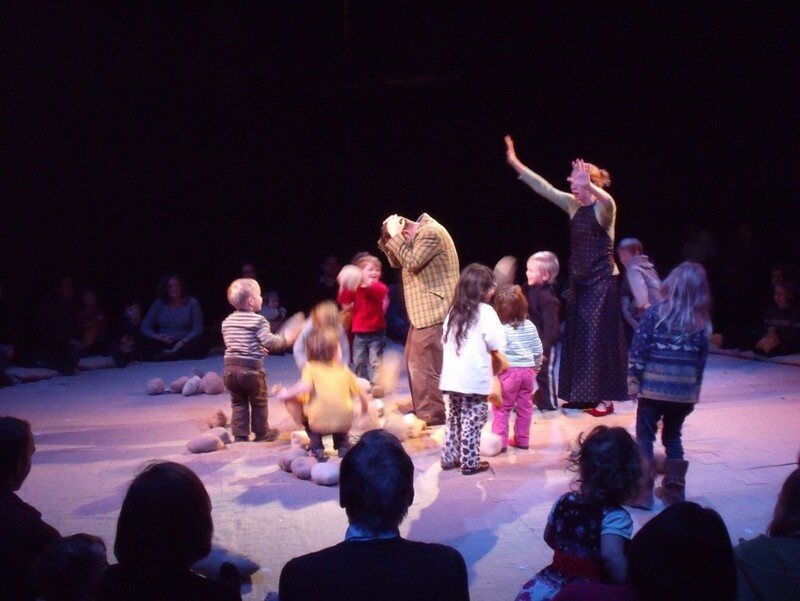 Lyngo Theatre's piece is far from alone in its 1-3 age range. 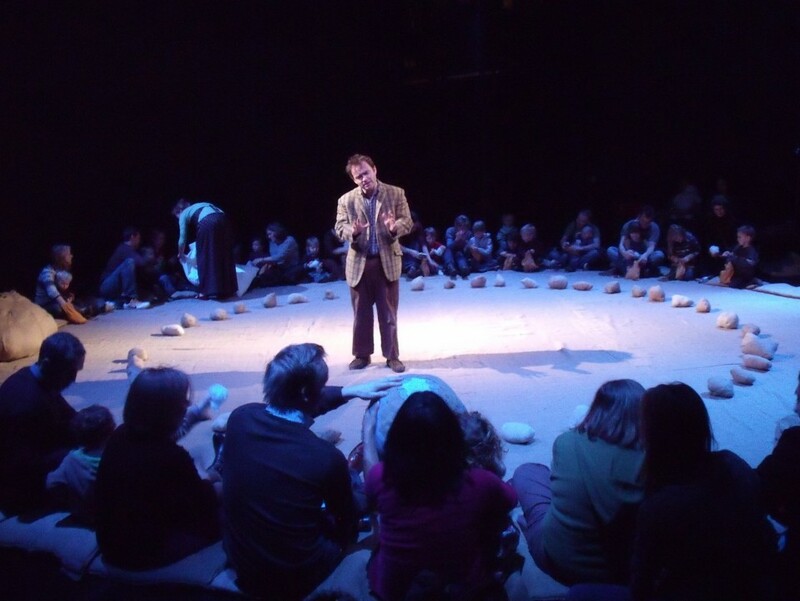 Neither the formalities of theatre nor a progressive story are appropriate for its near-infant audiences, who sit on a circle of cushions with their accompanying adults. In itself it provides social interaction, safe with a parent or relative but engaging cooperatively with others. 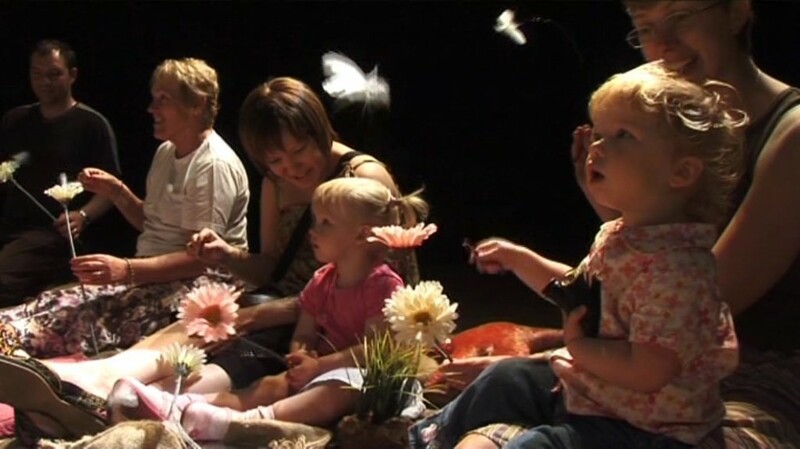 Even in a nursery performance, there's the gain of being guided through individual participation in a group experience. And events don't have to bounce along. There's interest enough in a single state of being. Objects hold a fascination, and as the piece proceeds through the seasons, taking day and night into account, there are plenty of opportunities to experience birds, flowers, butterflies, grass and puddles formed by mirrors. 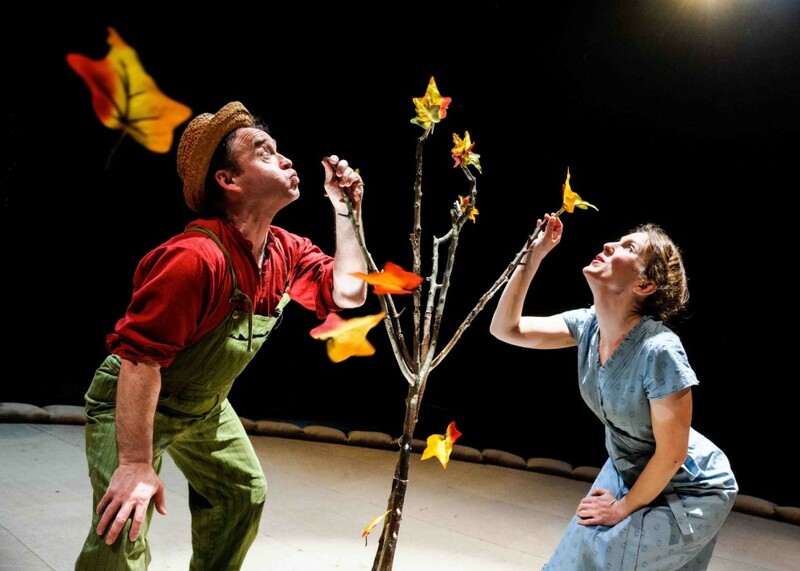 Proceeding gently (there's never a blackout) audience members have the chance to blow autumnal leaves away, make rain sounds and birdsong, fly wire-attached feather butterflies and plant grass. Some may hardly have experienced the turning of the seasons, and the changes will still fascinate experienced 3-year olds. 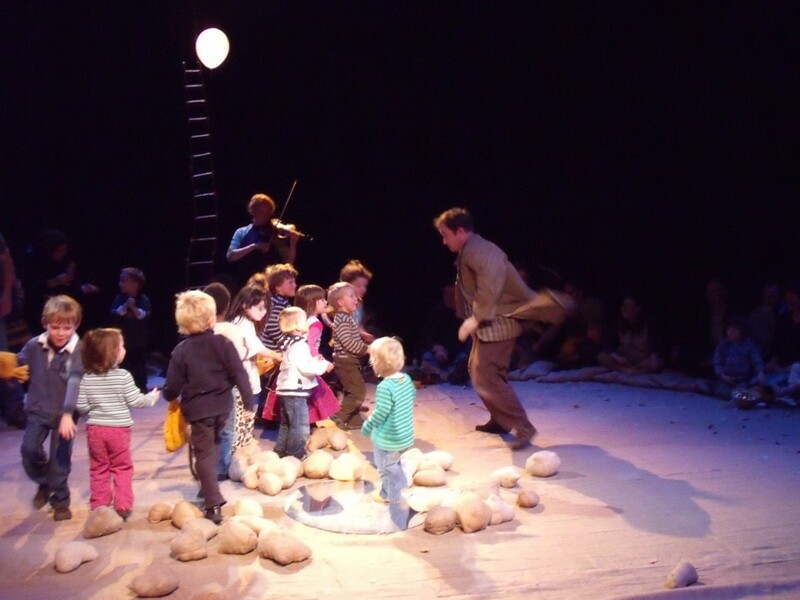 Patrick Lynch guides audience members; even his few comments aimed at adults don't exclude the young, but seek a complicity, binding everyone into involvement as the performers (Elena Marini also contributing atmospheric violin music) co-create the wide world in their circle. 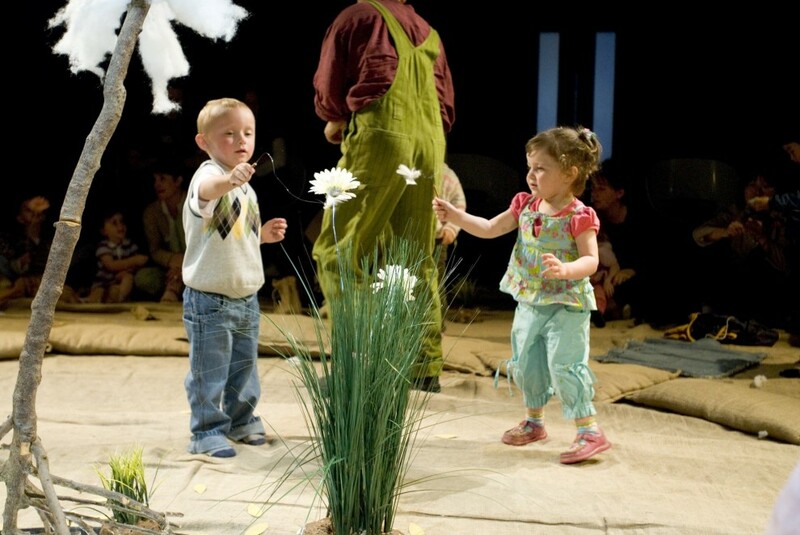 While the petals, grass and ingenious little tubes creating birdsong focus attention, most important is the company's ability to work at a pace and with a simple directness that gains genuine responses and involvement from very young people; there's none of that terrible incomprehension and boredom which too often comes from ill-thought through audience participation - the very young are never taken for granted. 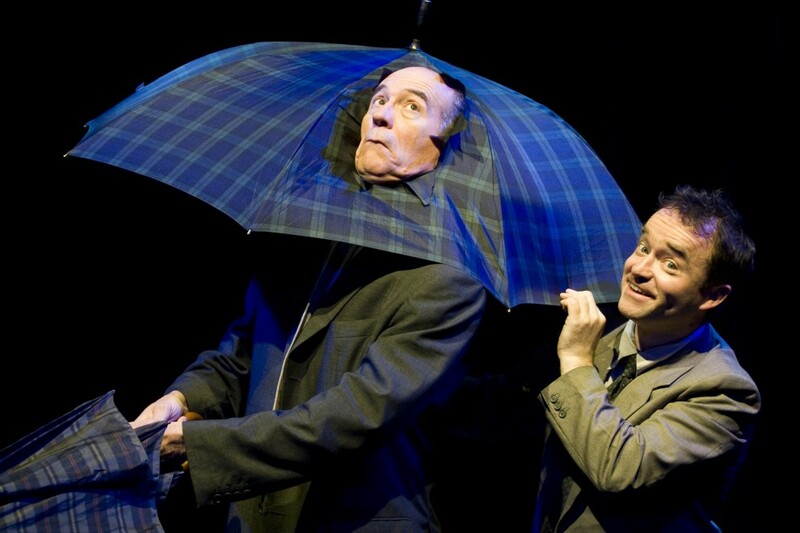 I saw your 11.30 performance of “Egg and Spoon” at ***** to-day with my grandson, Sam, who is 4. 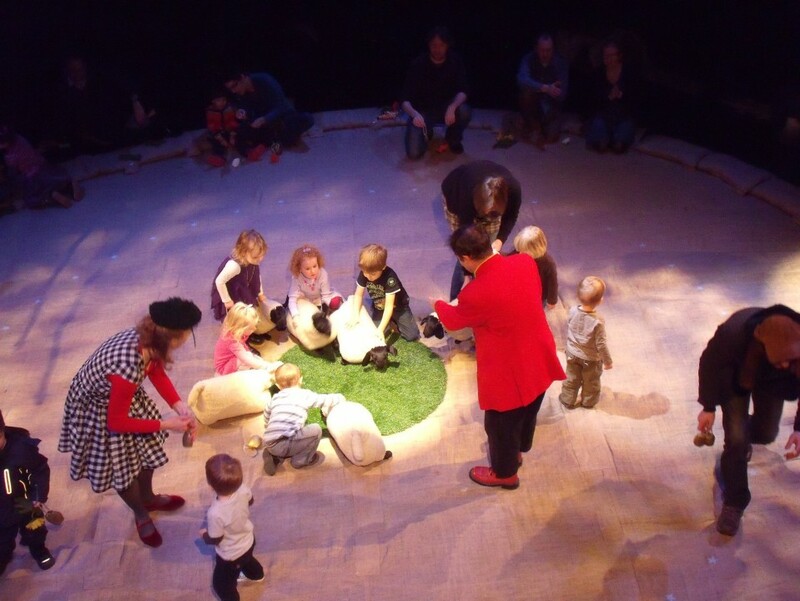 Top-class theatre for the very young. I've been undergoing a crash course in Lyngoistics over recent weeks. 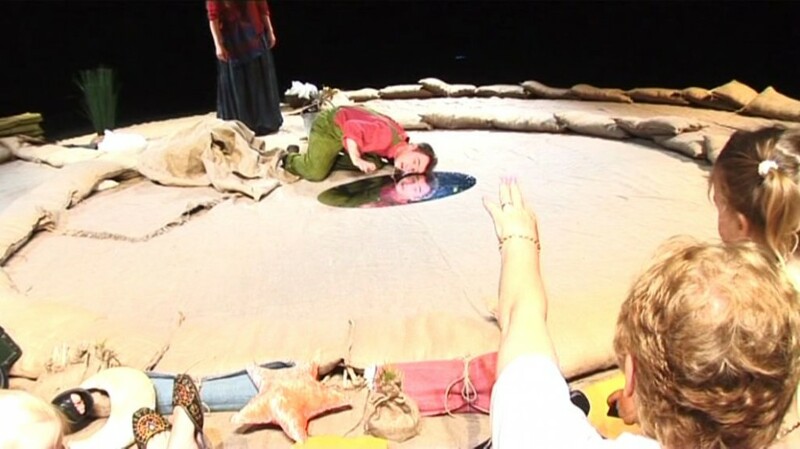 Discovering that, out of four Lyngo productions on view, the three playing a season in the Unicorn's Clore auditorium share a common setting, with children and adults sitting in a large single-row circle around the action in which they are invited to participate. What fine-tuning designates this show for 2-4s, while What a Wonderful World, here last week, extends to 5s it's hard to say. Circus is more free-form, while Wonderful World develops more through a story; that apart they cover much the same ground. Literally. 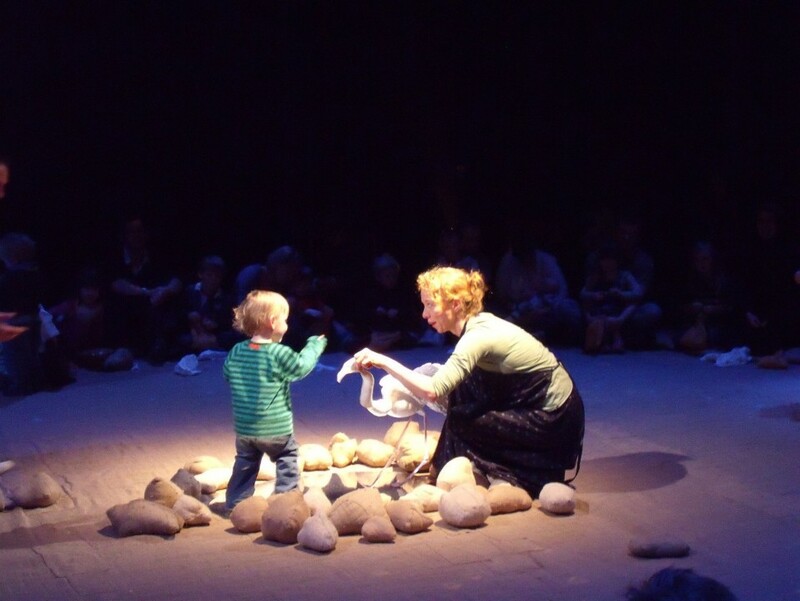 With a mum and a dad from the audience each briefly helping, and Airlie Scott's latecomer being roped-in throughout as Auntie, this is certainly a family show. 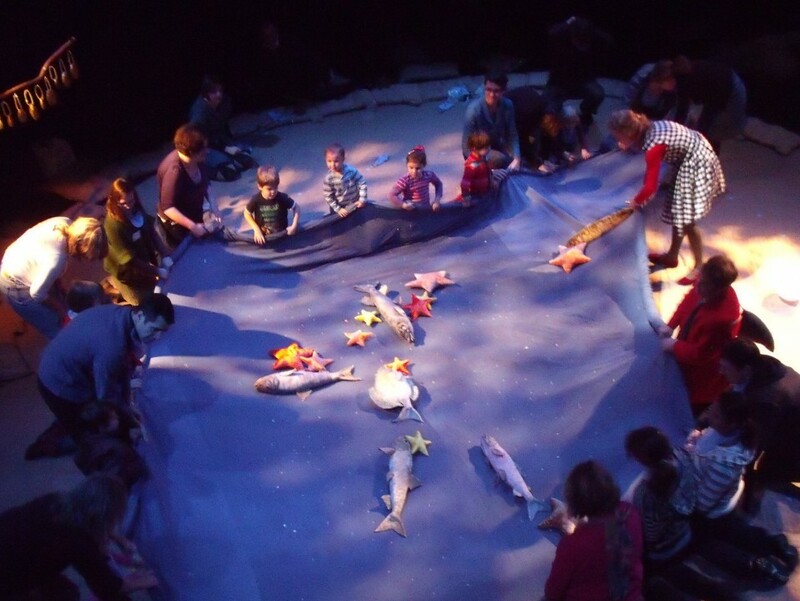 There's plenty of opportunities for 2-4s to involve themselves, whether it's helping keep a moon-balloon aloft, leading sheep round the space or helping turn a full-stage sized cloth into an ocean, its waves tossing various sea creatures. 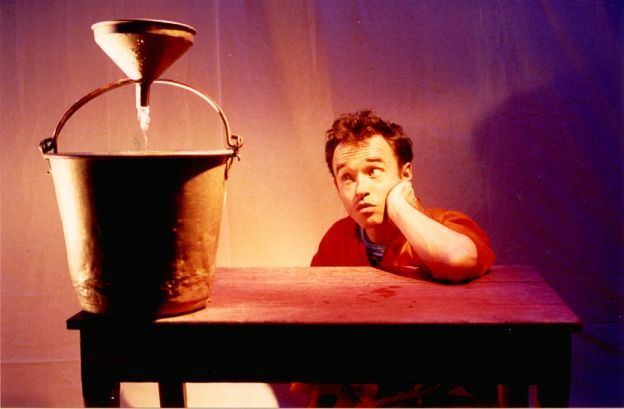 All this under the guidance of Patrick Lynch's red-coated ringmaster Col Tom Thumb, encouraging involvement through questions and suggestions, building the scene element by element. His symbol of authority, a ringmaster's whip, soon turns into a buzzing fly, following the butterflies that have fluttered around, along with numerous other natural breeds recreated with theatrical ingenuity. 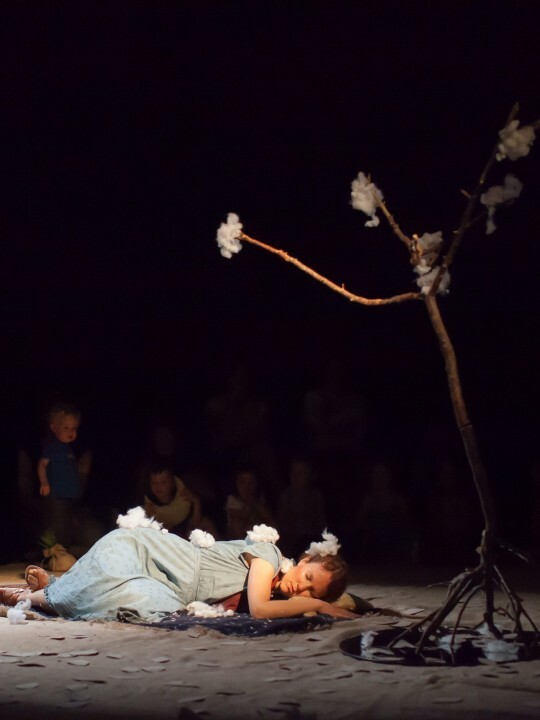 This piece's freer form means that the organisation element in Lynch's description of Lyngo's three productions as 'organised chaos' is tested, but wins out, while allowing space for imaginative creativity and play - something parents find themselves helping with. True, the way several sheep get carried around means it's good they're not real (one or two would need strong ears). 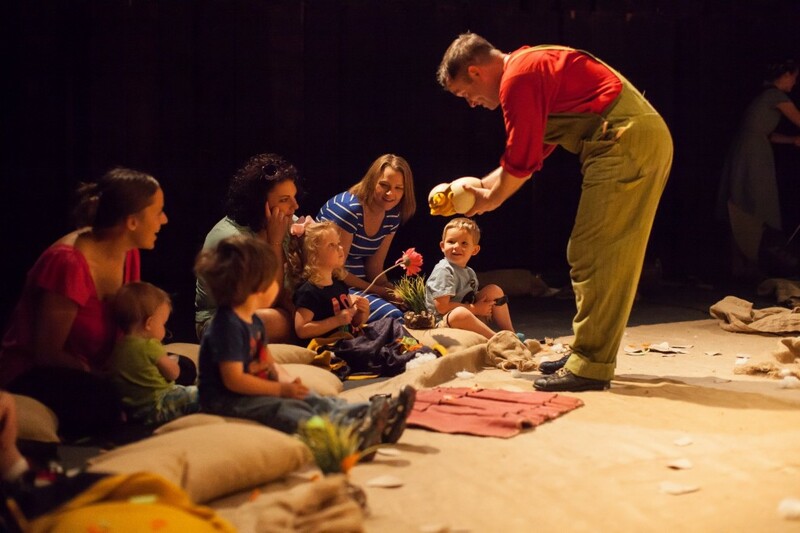 Italy's Lyngo Theatre knows the score when it comes to producing theatre for the very young (from age two). An audience of such tender years has no truck with fourth wall realism, or, indeed, any attempt to put space between performer and watcher. 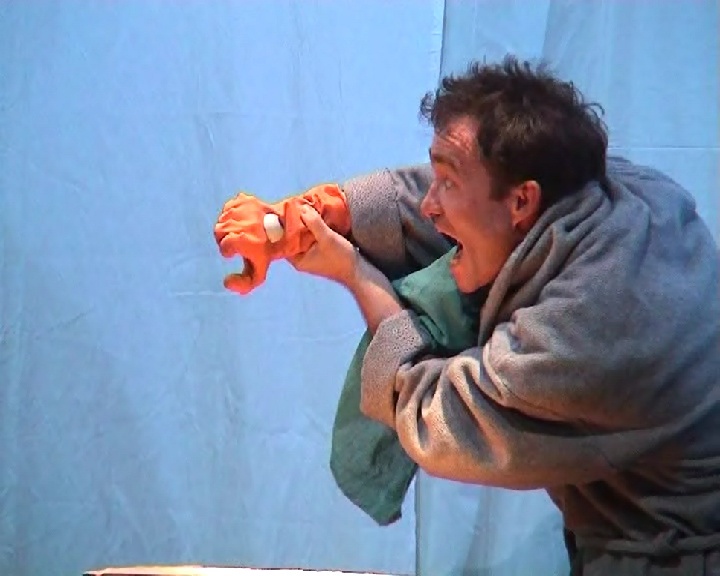 Small children are expected to enter into the play world and take a hands-on approach to props, set, even actors, who in turn should be prepared to step over supine toddlers with thumbs in their mouths. 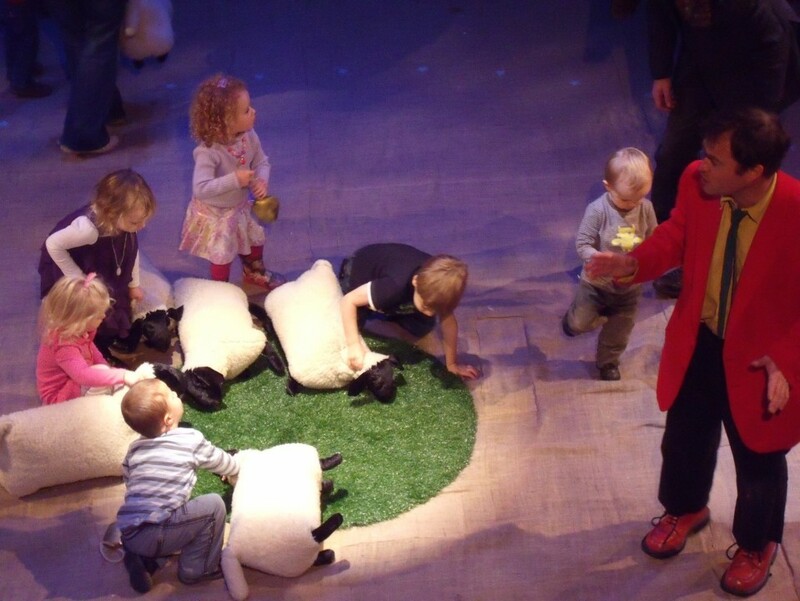 Thus, Lyngo's third show in a trilogy of early years work - a creation story - is mostly interactive, with music, songs and judicious use of intriguing goody bags, soft pillows, mirrors and miles of hessian to roll about on. 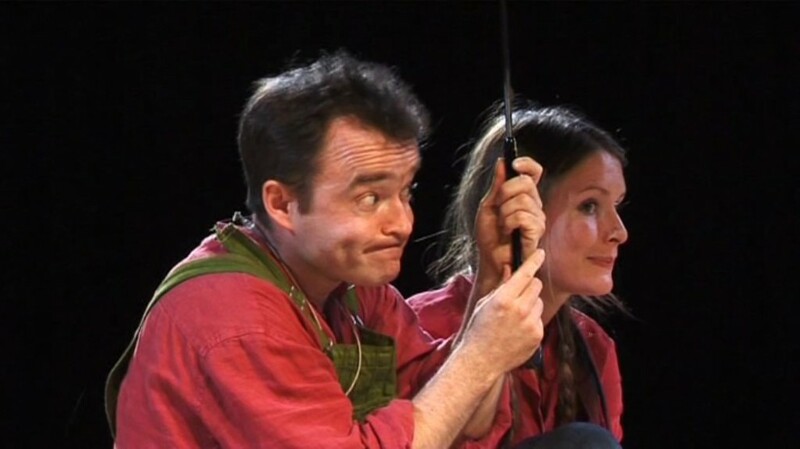 Patrick Lynch, of CBeebies' Razzledazzle fame, and Emilia Brodie, with her violin and alto recorder, play Mr Armstrong and Necessity, Mother of Invention, respectively. Mindful of the selective attention of their infant audience, their dialogue is interspersed with jolly invitations - to chase stars, throw snowballs and pop bubble wrap. 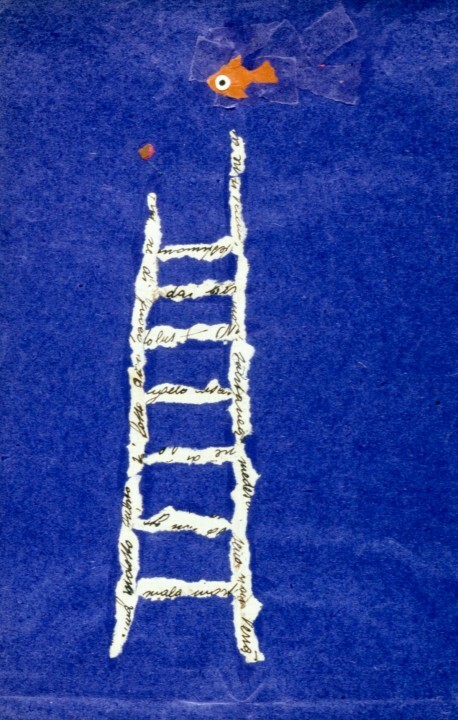 Activities are accompanied by composer Carlo Cialdo Capelli's sweet ostinato overlaid with message-affirming lyrics. Various witty asides are thrown in to keep parents and carers occupied - snatches of old hippy speak and pseudo science give a tongue in cheek impression. Startlingly out of place references to, for example, multicellular organisms make grown-ups smile as they fondly watch their infants busy placing velvet starfish on a glassy pond. 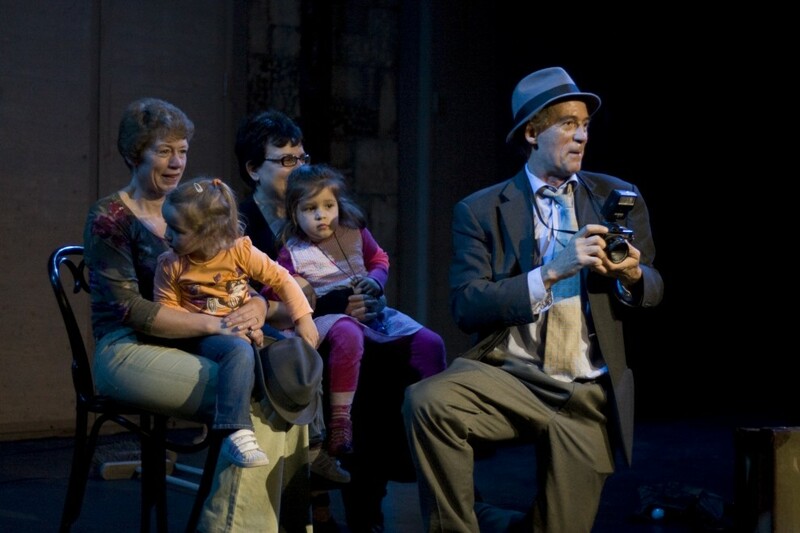 They grow up quickly, Lyngo Theatre's audiences. 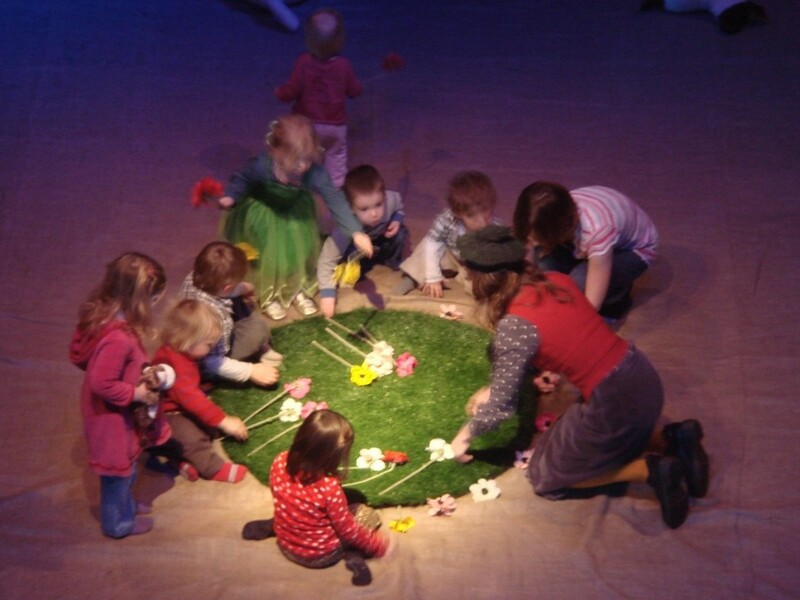 Last week at the Unicorn Egg & Spoon took a simple approach to life for 1-3s. 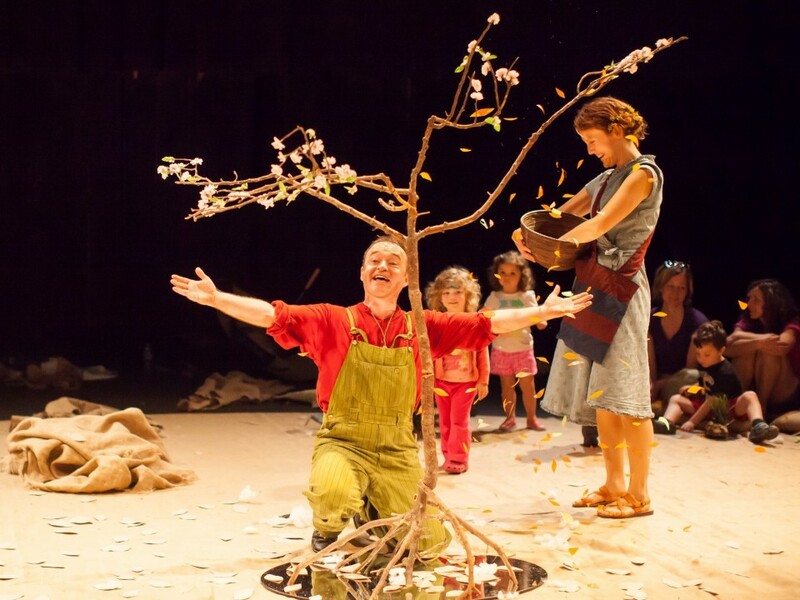 But Wonderful World, for 2-5s, introduces the Collective Unconscious of people's dreams. 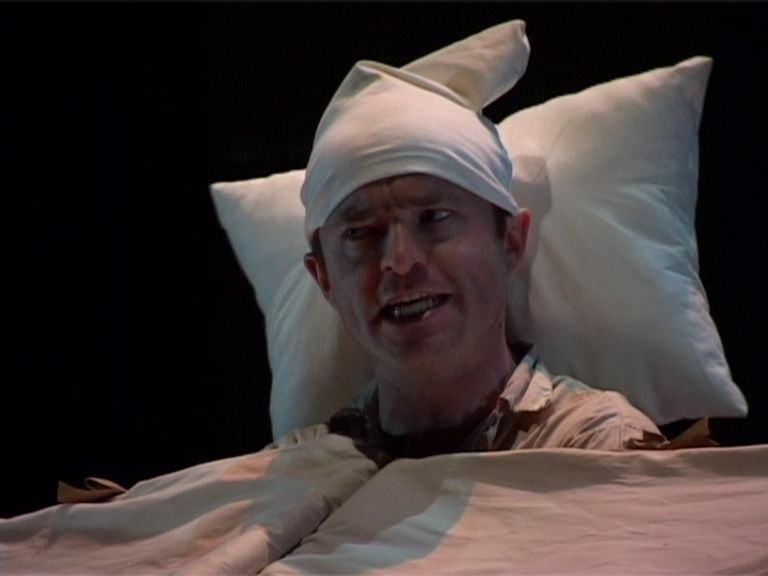 And if you're old enough to notice that the Unconscious is a large pillow-case, stuffed with dreams of cotton-wool, you'll be an accompanying adult, and well aware of the importance of dreams, and the notion of a Collective Unconscious. 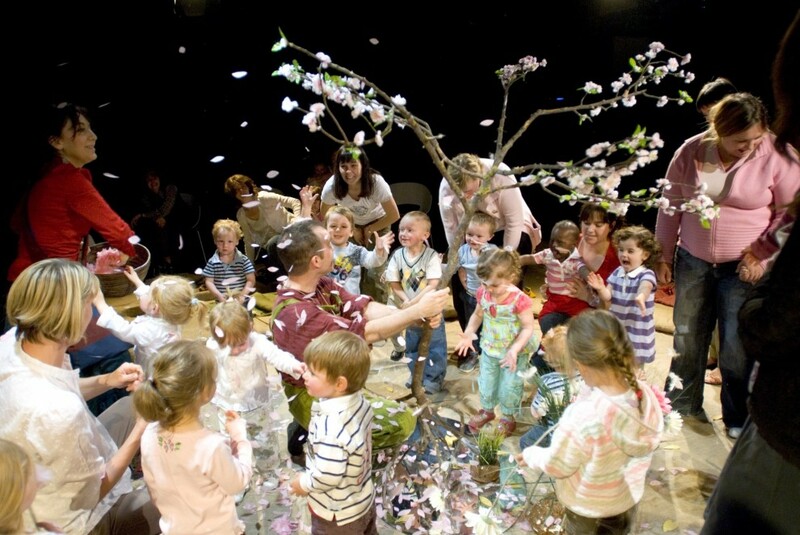 It's apt, therefore, that the audience's participation in Wonderful World should often be shared by young children and adults - at one point the young people blowing on the leaves their adults drop, creating a windswept autumnal fall. 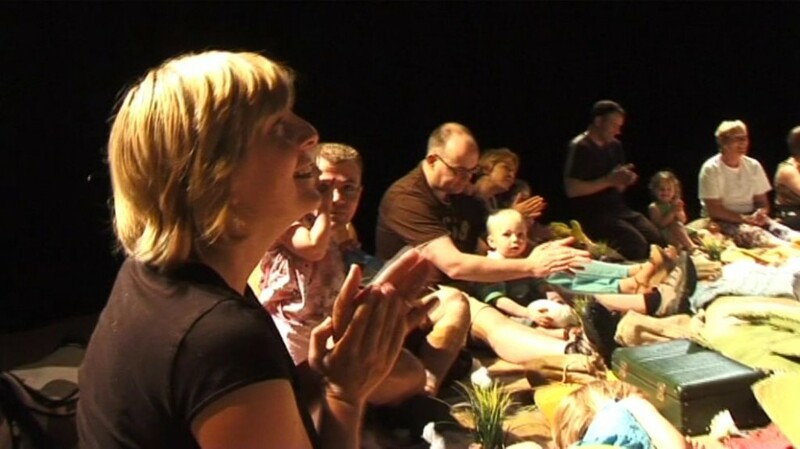 The usual, embarrassing idea of "audience participation", by the way, is entirely inappropriate for this joint venture, in which adults help children develop their wonderful world, nature created and celebrated by a series of theatrical tricks (the hand-held birdsong devices an especial treat) made 'real' by interaction with young people's perceptions and experiences of the world around. 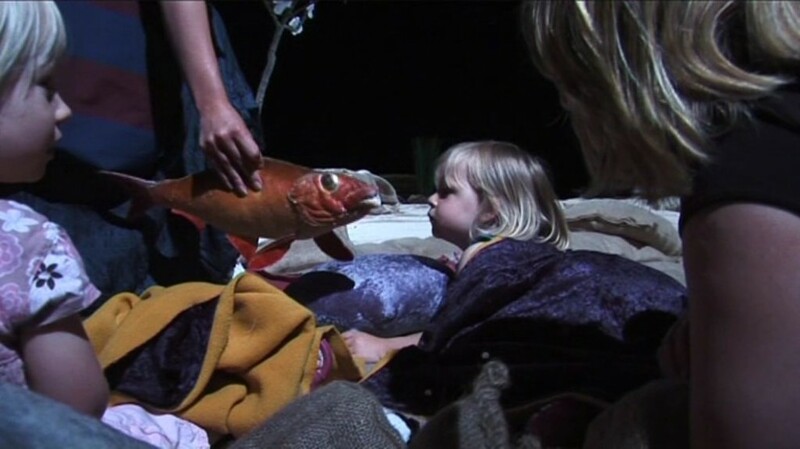 As the audience places rocks, and a dream-train of children is formed (a sleeper, naturally), their new companions waving them goodbye with handkerchiefs; as dream-fish are shared, a pond created from a mirror and surrounding rocks, the care put into the detail of this new-created world, down to an audience-created wood-fire crackle, becomes the point: treat the world well and it will treat you well. ‘Dear Patrick, I just wanted to drop you a quick note to say how much my 3 year old son and I enjoy your shows. 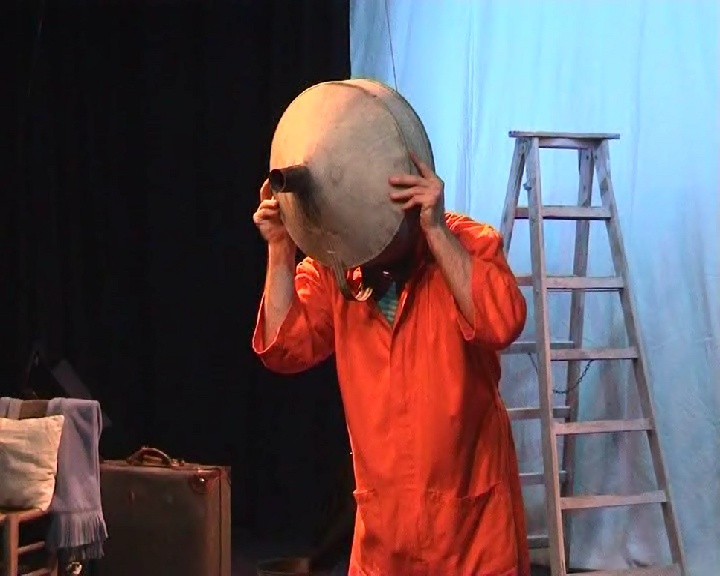 We've seen a few of them, the most recent one being What A Wonderful World at the Artsdepot, we've also seen Circus Minimus (twice) and Egg and Spoon. Ok, let’s put the youngster aside for the moment. I'm 36 years old, but lose about 30 of those years when I come to your shows. I feel like I know how Alice In Wonderland felt when she falls down that rabbit hole. With the risk of sounding like a weirdo (I can't be the only to have said this....can I?) I confess: I come to your shows as much as for me, as I do for my child. Goodness, I feel so much lighter now. You've got it spot on with the kids. I take my son to a lot of shows, and they don't always get it right. To get on their level without being a patronising git is something you do extremely well. Your sense of humour is appealing to both kids and adults. The way it is in Shrek or Toy Story. I do think kids shows have got to have SOME kind of appeal to adults. 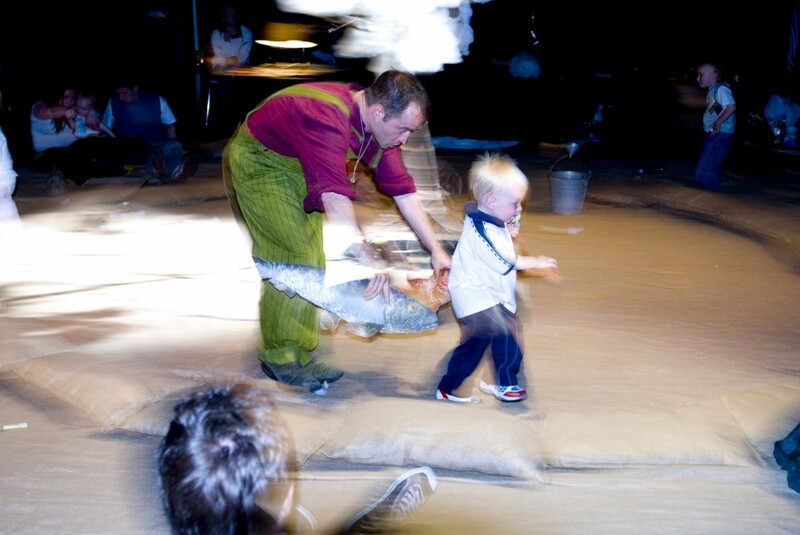 It's easier to share the enthusiasm about the show with the kids afterwards. I also don't get that gritting under your teeth "I've been doing this for too long and the kids are starting to get to me" sort of vibe. (I've seen this with other performers. Us parents recognise this straight away - it's how we feel a lot of the time). Each show is as fresh as a lettuce, like you've entered this magical world for the first time. 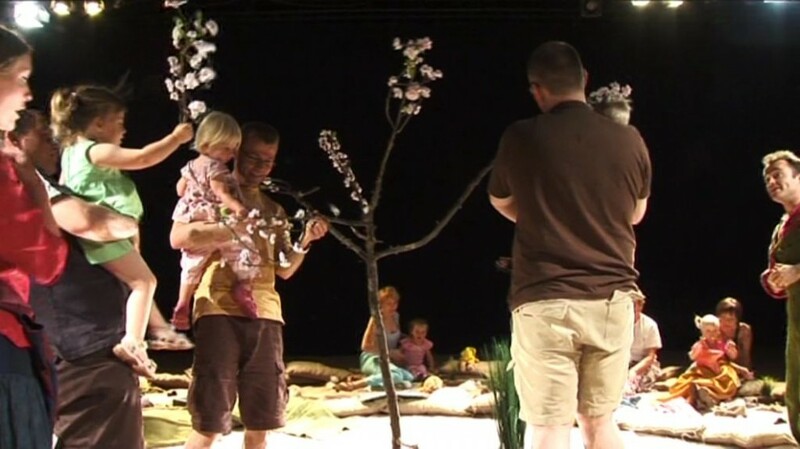 I love that it's interactive, not only with the performers but that the parents and children can interact together as well. ‘I wanted to say a huge thank you to you for organising the ticket for us to see What a Wonderful World today. 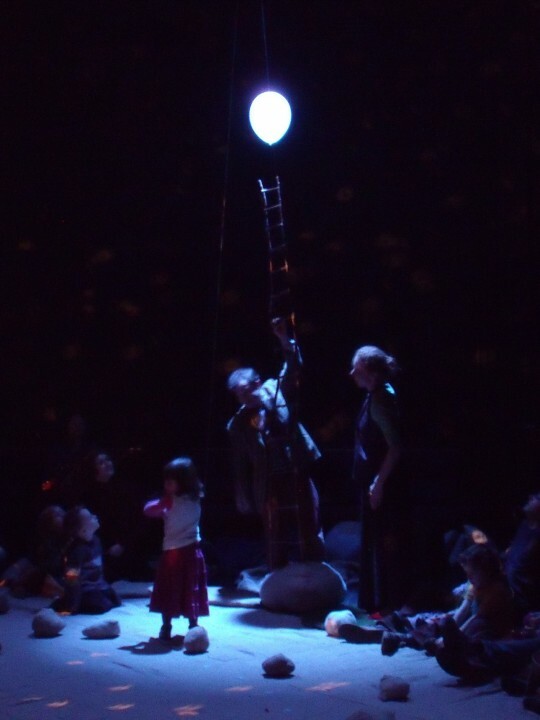 The children were totally captivated by the show - they didn't stop talking about throwing snowballs and catching stars all the way home! It is a magical show - I can't belive it is not finished yet - it was outstanding. 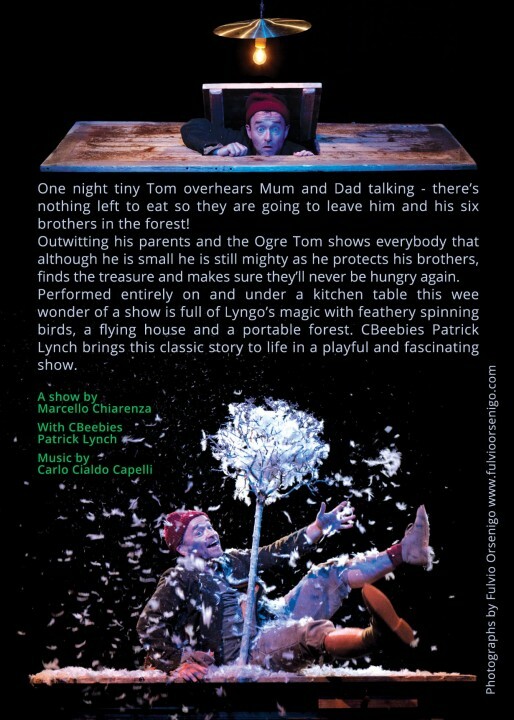 The staff and parents helpers all thought it was fantastic as well and they all took Lyric kids brochures. The teacher that I am working with is already talking about taking the kids to see something else! 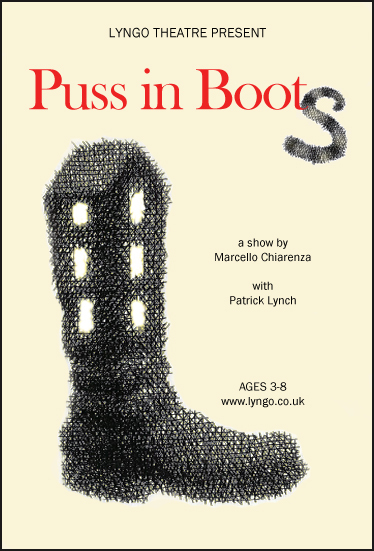 ‘Puss in Boots' is such a strong story, beautifully told here by the mercurial, talented Patrick Lynch, that one wonders why it doesn’t get more outings. 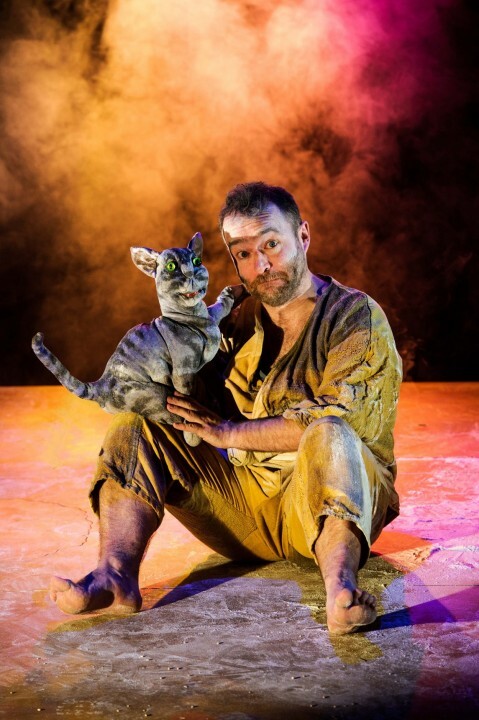 With an utterly captivating, face-licking, tail-wagging cat puppet that morphs into the miracle-working, talking and booted feline, this show ticks all the boxes for fine children’s theatre. 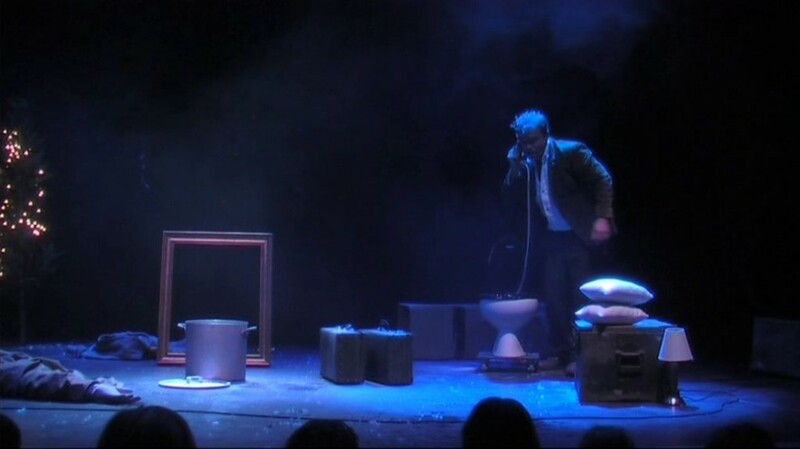 Marcello Chiarenza’s set is neat and, presumably, readily transportable on tour: a wedge-shaped mini-stage that allows Lynch to descend into a trap, climb away into the upstage space behind it and open and close flaps at the front. 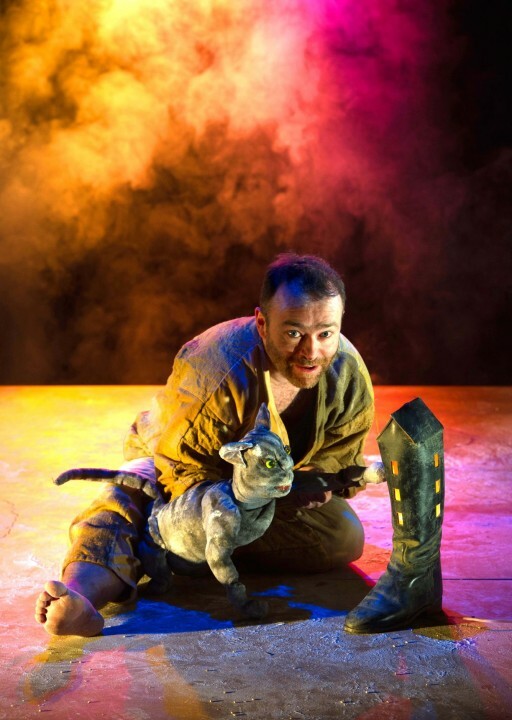 Putting on stage Puss in Boots, with its clever talking cat, king and court in their carriages, beautiful princess and ogre in his castle, is a pretty ambitious undertaking. 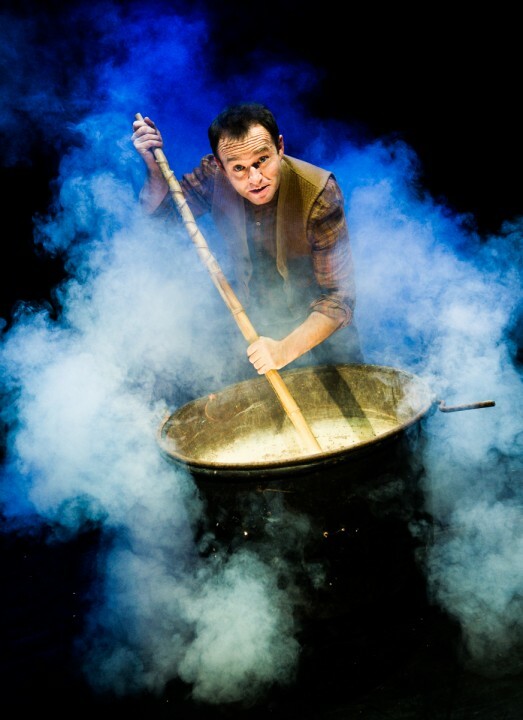 Don’t expect pantomime spectacle from Lyngo Theatre but do expect theatre magic and you won’t be disappointed. 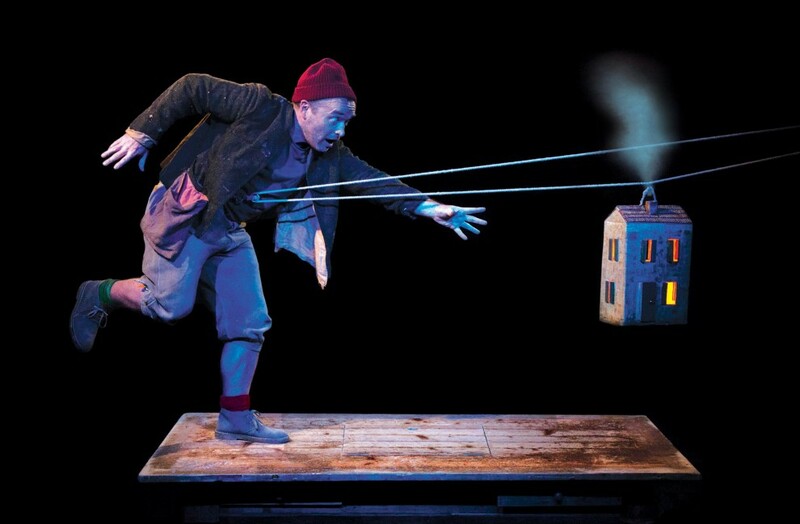 Aimed at 4- to 8-year-olds, this is a delightful retelling that seemed to totally captivate the packed school audience with whom I saw it.The theatre was full of excited chatter and there was a great whoop as the lights went down. I don’t know what they were expecting but they loved what they got. 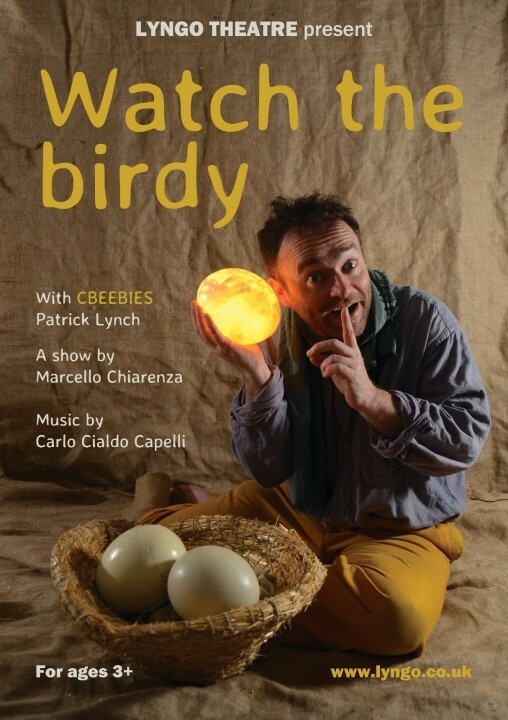 That was just one actor (Patrick Lynch) relying on talent, imagination, the clever design by Marcello Chiarenza and Elena Marini, Carlo Cialdo Capelli’s music and rich warm lighting to bring the familiar story to life. The simple setting could fit almost any sized venue. 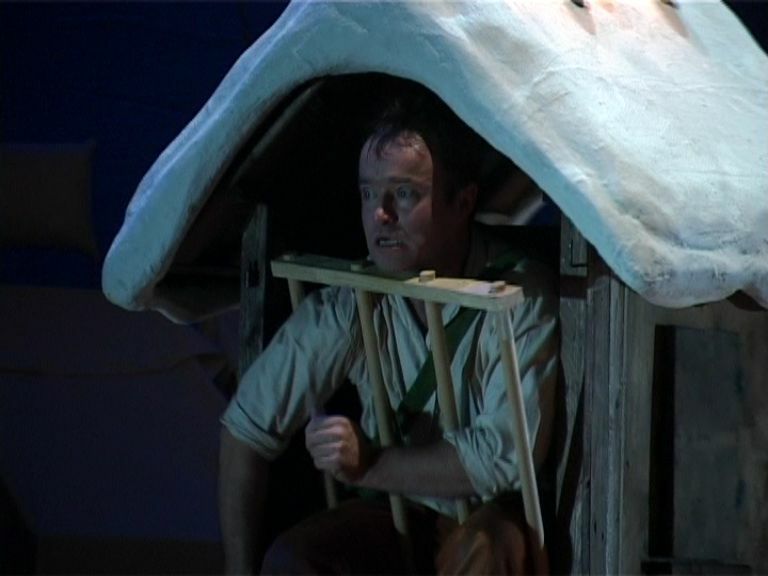 It is a sloped rostrum with a backcloth behind it but it is fitted out with trap doors and drawers that can provide a lake to jump into, an oven to bake bread in and a ramp down which to chase mice or roll the riches of the lands that belong to the ogre—and a hideaway behind which more props can be appear from. 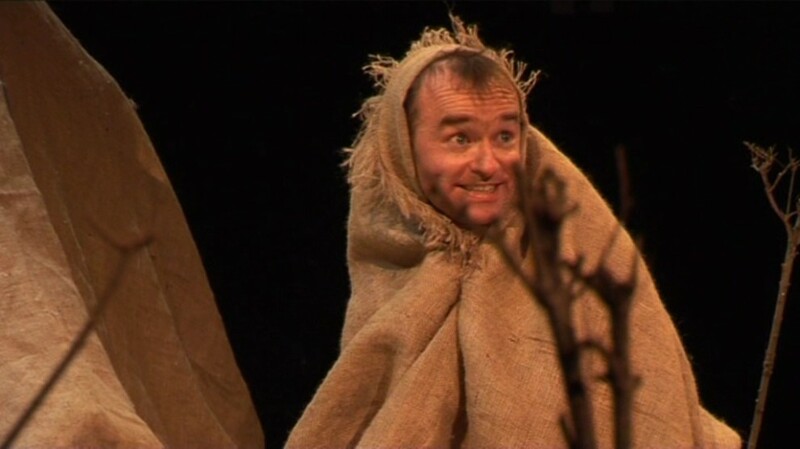 When Lynch appears, coming up from that hideaway preceded by flourish of music and light, he starts telling the tale of the hard-up miller with three sons, fitting in a flour-dusted description of how flour gets milled and is turned into bread complete with grain grinding and a fiery-fuelled oven for baking. 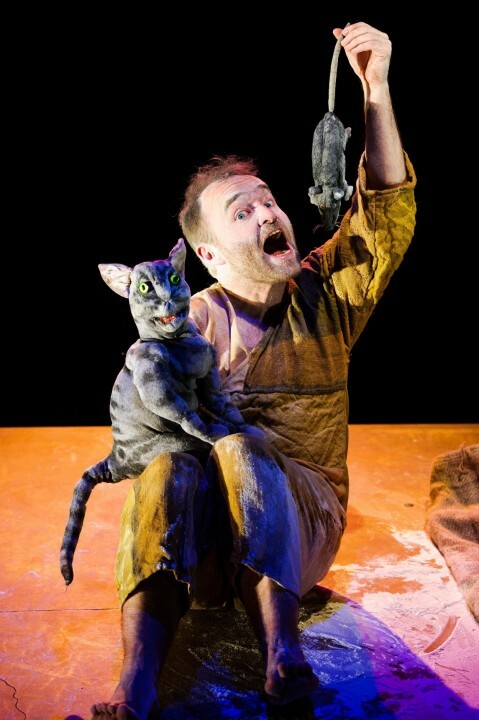 Continuing the story with how the eldest son was left the mill, the next his dad’s donkeys and Felix, the youngest, just a cat, Lynch then becomes Felix, with the cat a glove puppet with bright eyes and a lively red tongue. Puss not only understands what Felix says but can communicate back, this soon setting things in motion with a plan to make Felix’s fortune, though at first he will have to go hungry unless he is prepared to eat mice. 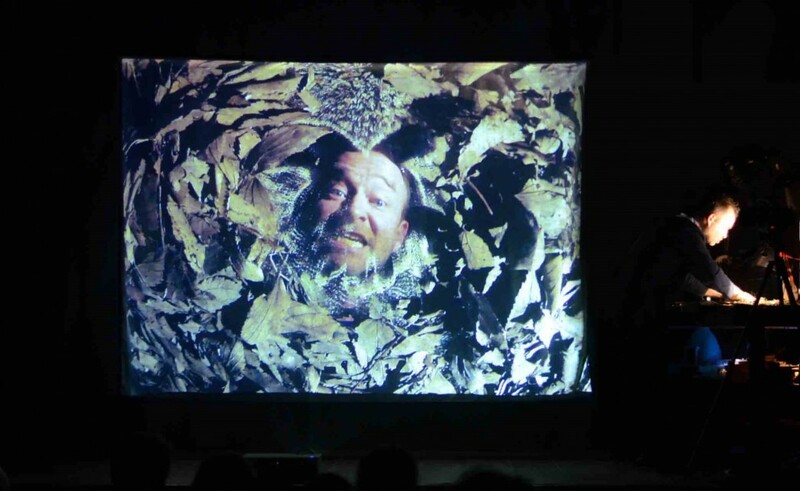 Lynch creates close rapport with his audience; they are with him every inch of the way. Even when he is absent for several moments doing something out of sight, the atmosphere remains one of concentration, helped by well matched music. Lynch handles everything except light and sound cues (and a smoke effect that is part of the lighting plot). 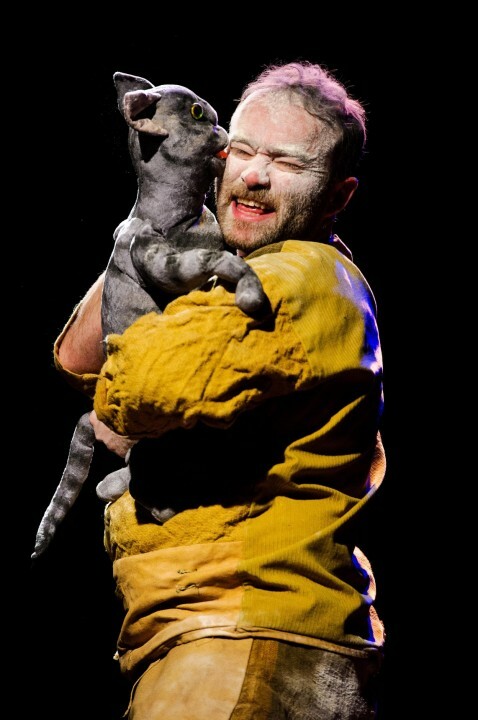 He is puppeteer, prop man and storyteller as well as playing both Puss and Felix and dealing with lots of other things while still giving a delightful performance. A show that has been very carefully planned is excellently executed. 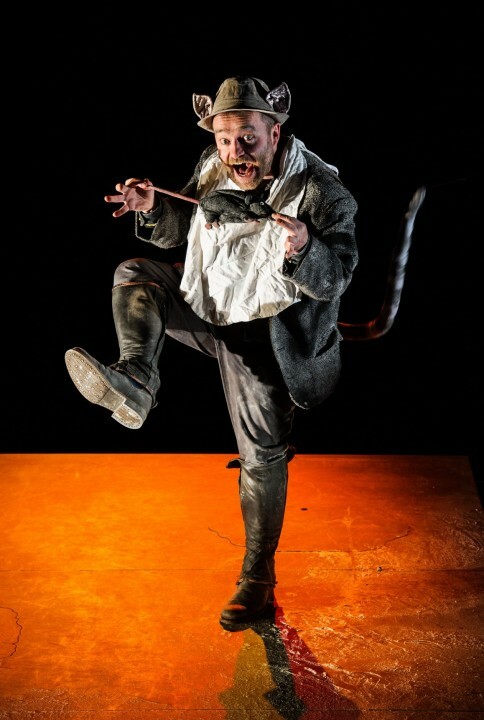 This Puss in Boots lasts just under an hour, well within the youngsters’ attention span, and its performance style made it just as enjoyable for accompanying adults. Lynch and his Lyngo team make shows worth catching if they are all as good as this one. It was clear from a Q & A at the end that the satisfied audience had also been fascinated by the way effects had been achieved. 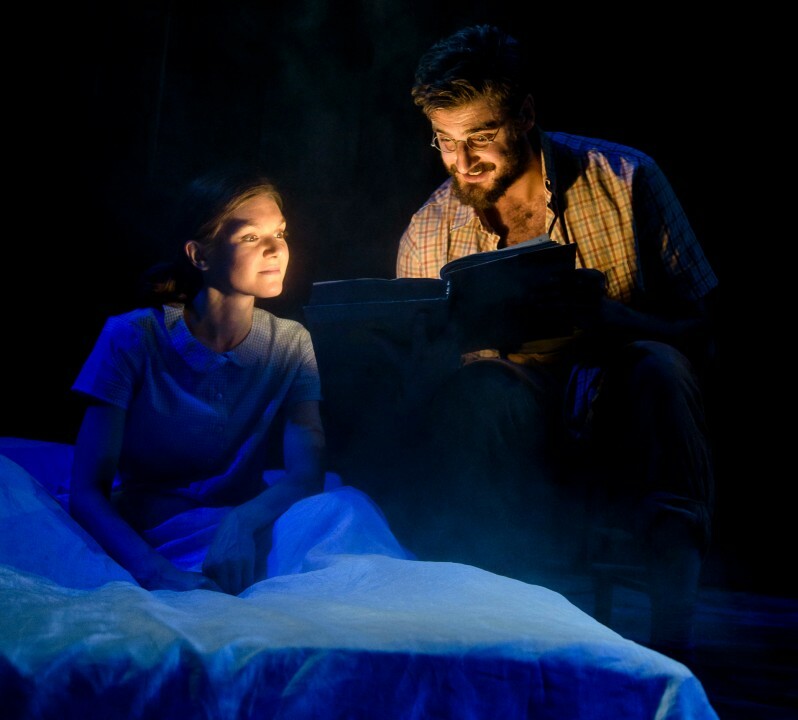 It had been an excellent introduction to theatre for those who were seeing their first show—and there were quite a number of them for this was one of Polka’s Curtain-Up!Performances. 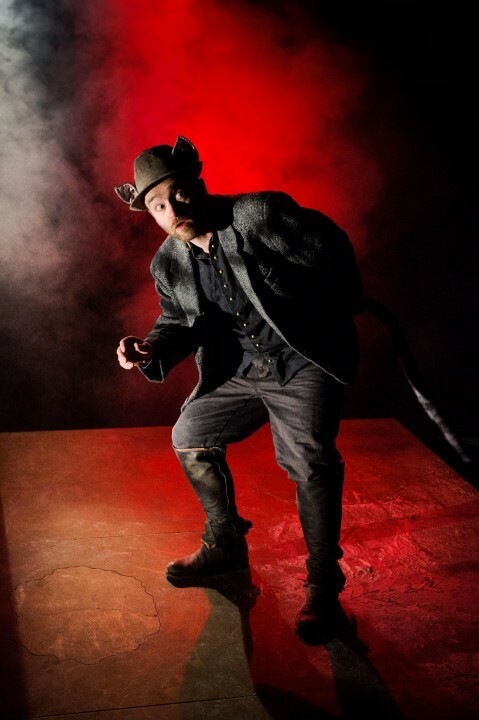 A one-man show telling the story of Puss in Boots came to the stage of Hulme’s Z-arts Centre last weekend. 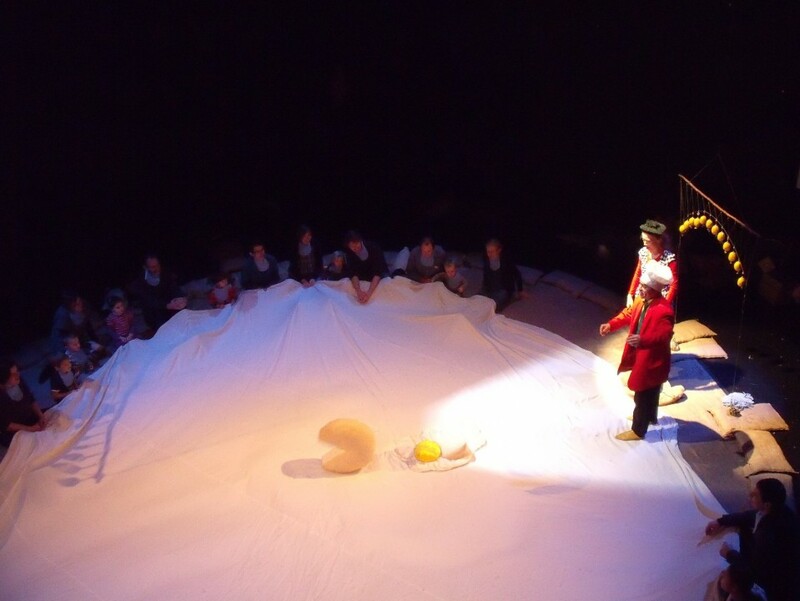 Presented by Lyngo Theatre, the performance formed part of a weekend of events within Manchester Children’s Book Festival’s 2017 programme. 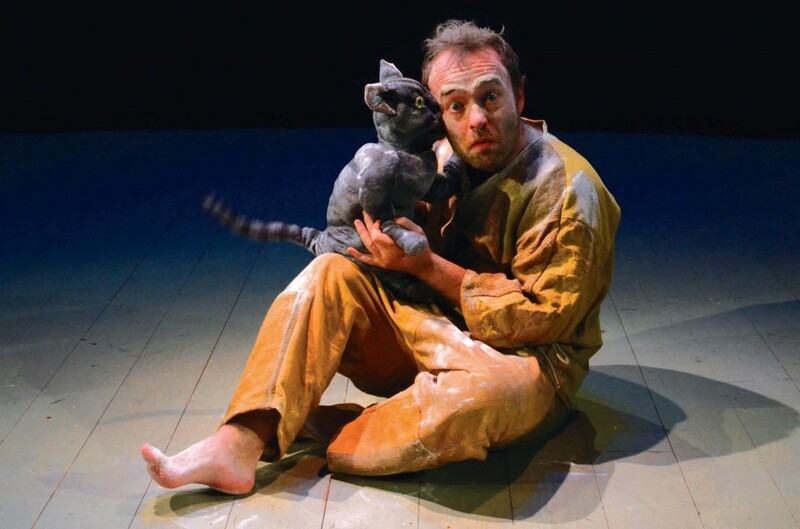 The classic tale of a cat who realises he can walk and presents himself to the king was, in this version, seen from the point of view of the owner of the cat – played with great energy by Cbeebies’ Patrick Lynch. There was also a free art cart before and after performances allowing the young people to interpret what they see. 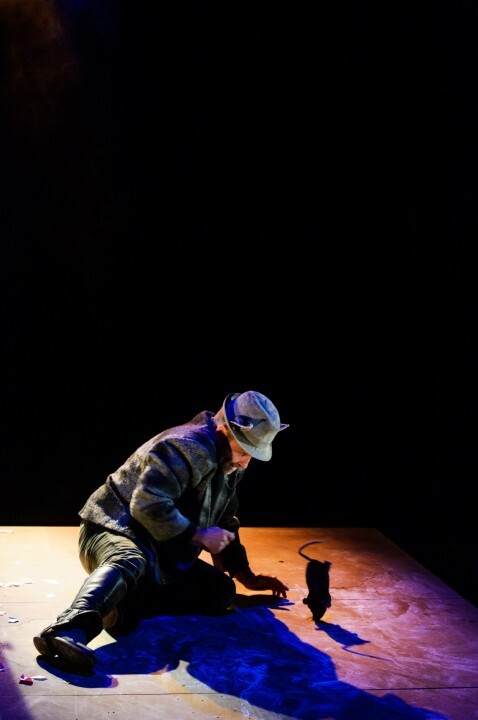 Initial focus on Lynch’s character, a mill worker, allowed the young audience to look to him also as narrator, a welcome source of storytelling. 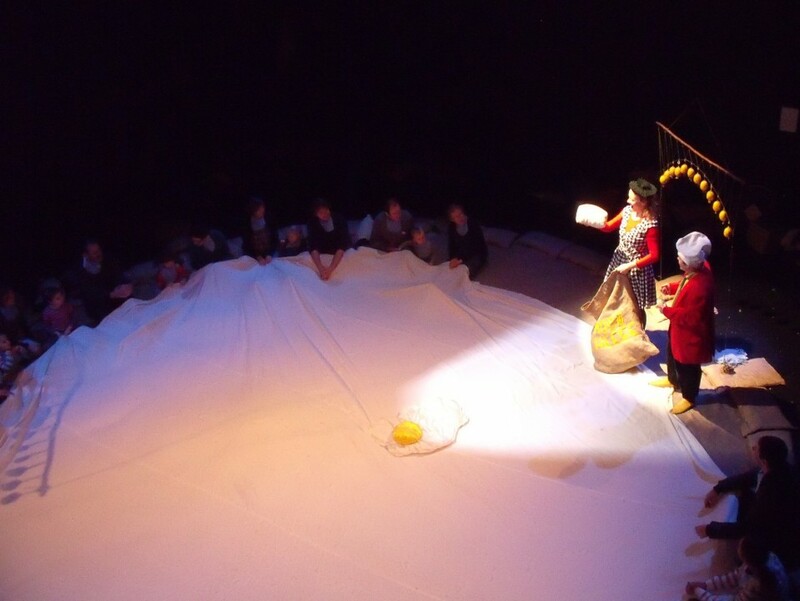 The use of a single raised and sloped area as a stage was particularly notable, increasing the intensity and visibility of the opening scene in which the miller is floundering around in the flour – to great comic effect for the children. Lynch has mastered the art of keeping his comedy silly and family-friendly, rather than farcical. 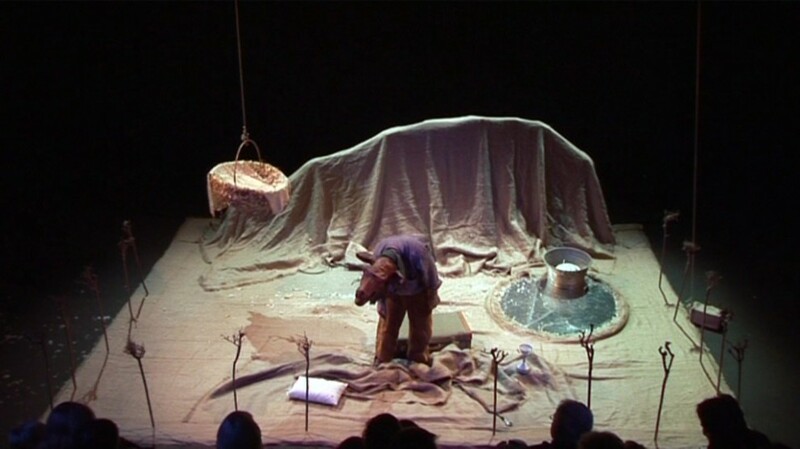 The sloped stage allowed his body to slip and slide and he worked with this movement throughout the performance to keep things animated but never excessive. 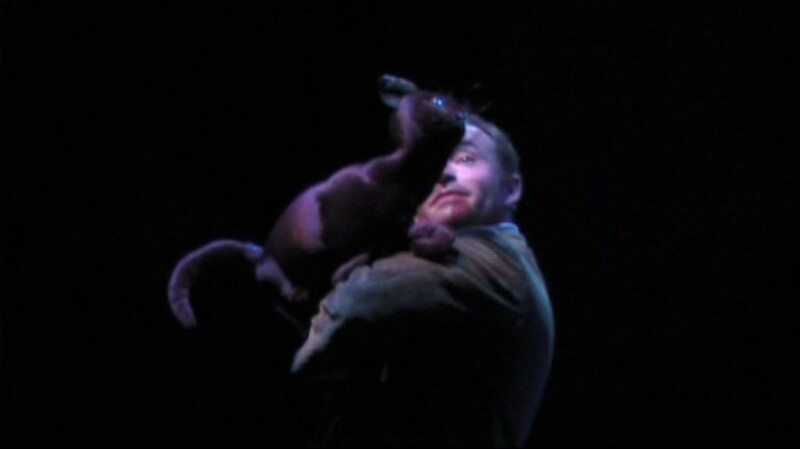 Other examples of where movement was used to keep attention on the stage – showing key awareness in keeping a young audience occupied – was when Lynch became the arms of a windmill and also doubled-up as puppet master, managing to control a mouse, dog and cat all at once for an entertaining ensemble of animals. 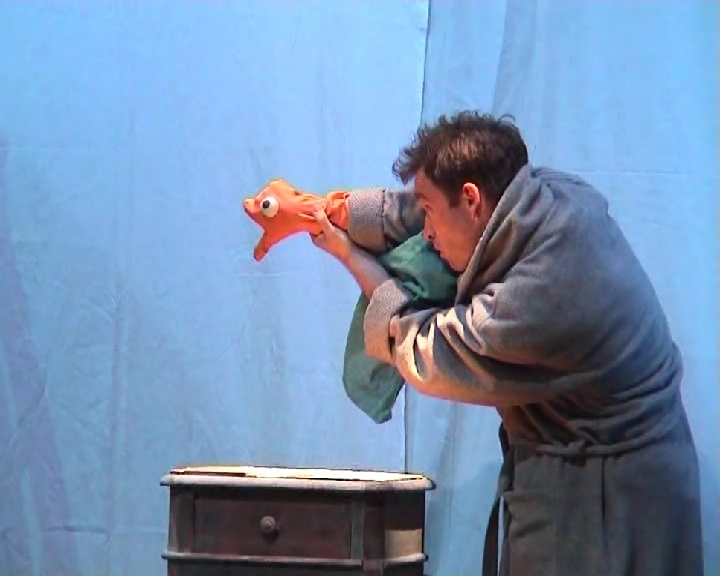 For a one-man show, it certainly was animated and the absence of other actors did not detract from the fun. 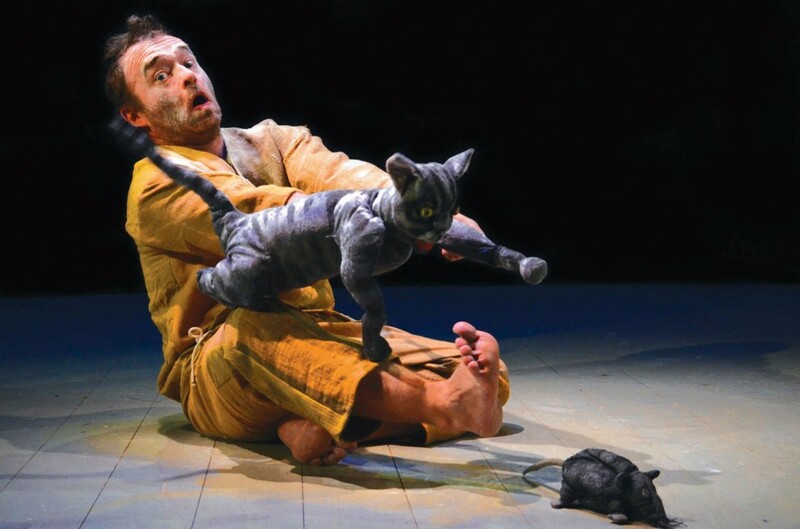 The introduction of cat as a puppet was potentially symbolic as it suggested to the children that it isn’t size or stature that makes people significant in life. Rather, it is their eagerness to get involved and their enthusiasm. 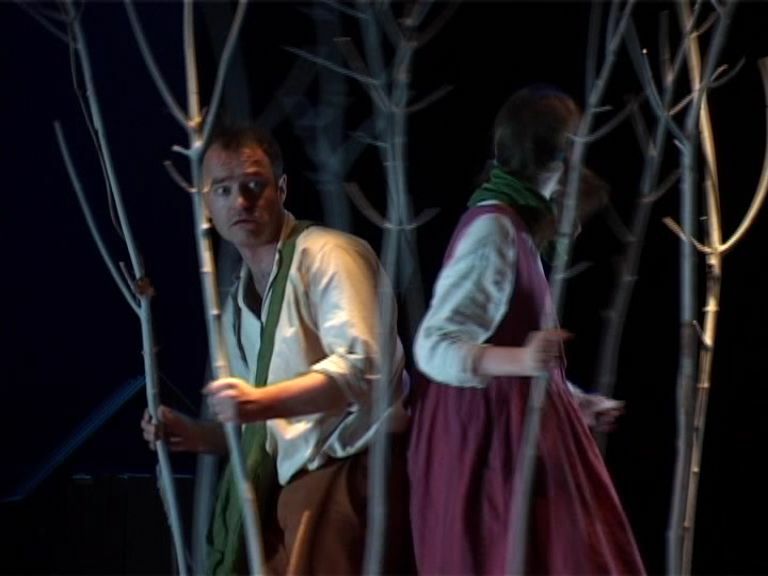 Conveying moralistic potential in this way – not overtly, but through the suggestions behind actions on stage – meant that enjoyment was not compromised either. There were nothing but smiles as Lynch clambered around the stage, rolling various fruits down it in an attempt to claim ownership of the land and the attention of a princess. 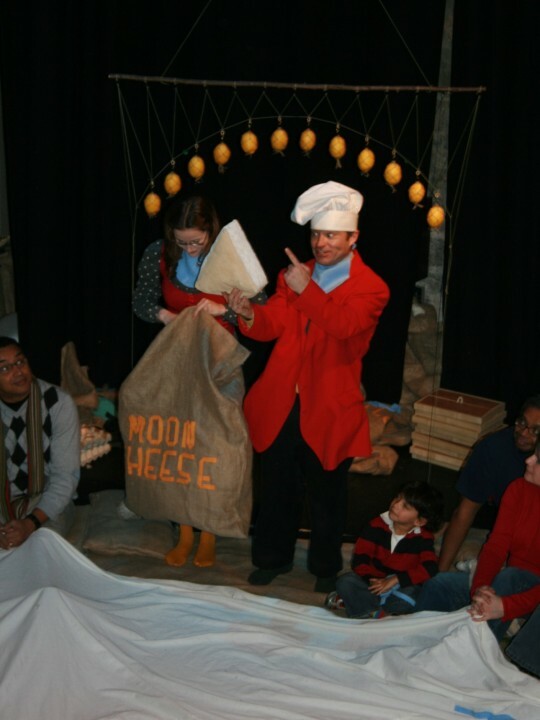 Even his naming of individual items – potatoes, lemons and the rest – ensured there was an easy-to-follow aspect for youngest members of the audience. 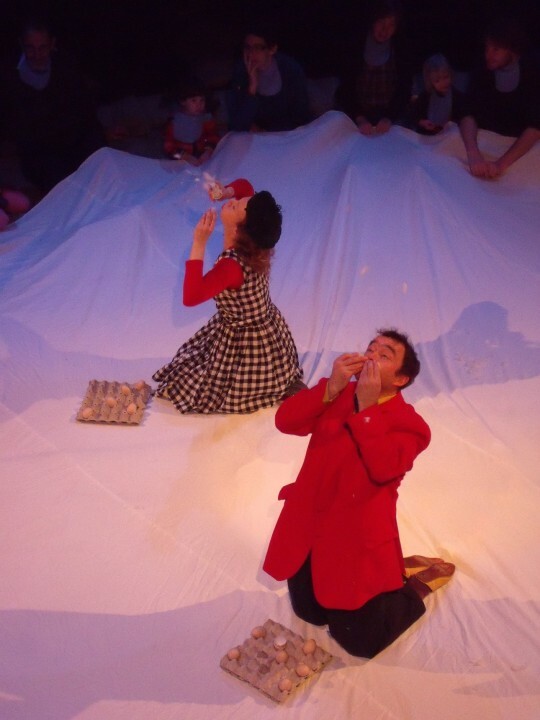 It was recommended that the show was suitable for ages 4+ and even the younger children seemed to enjoy themselves. Even more significant, was that adults also appeared well-occupied, as the miller’s dialogue was both extensive and expressive, telling a full story alongside the actions. 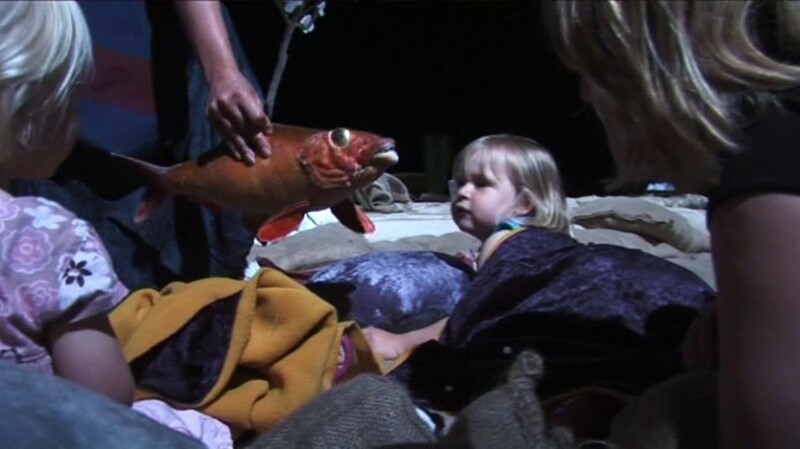 One parent said: “Our whole family really enjoyed it. 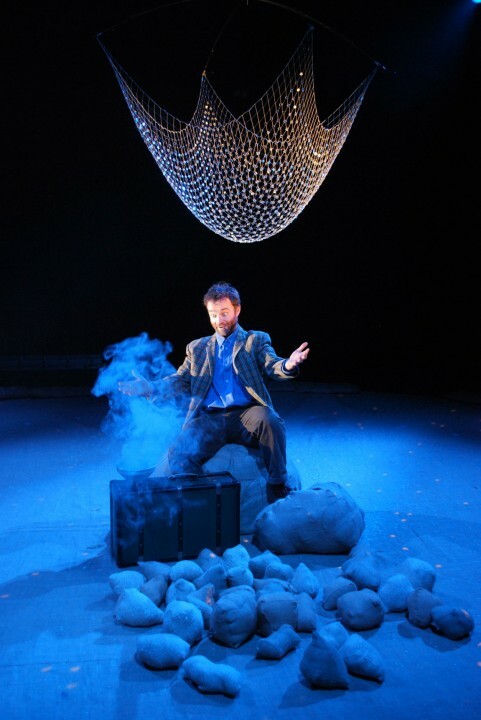 We found it simple yet admirably effective and we loved how the single actor engaged with the audience at various points yet still presented a full production to us. 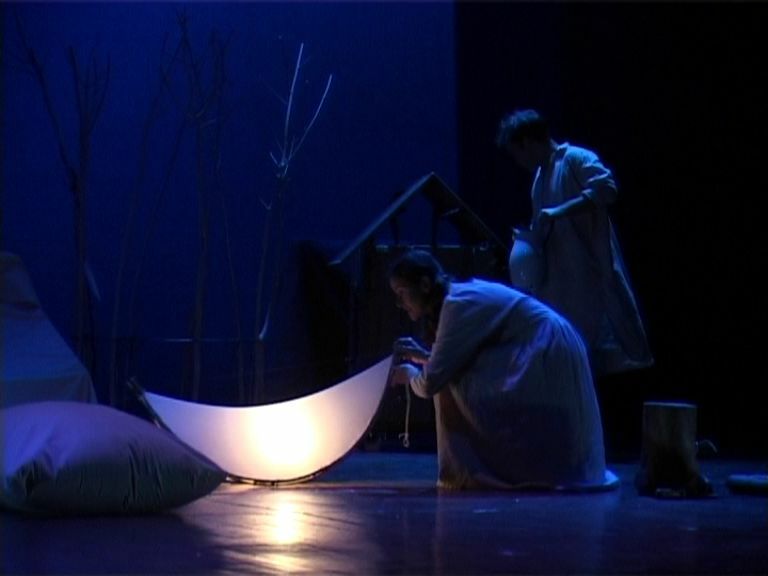 As the play unfolded, the use of its staging and effects became more apparent, the use of darkness allowing the stage lighting to be intensified, for example when the ogre is introduced. 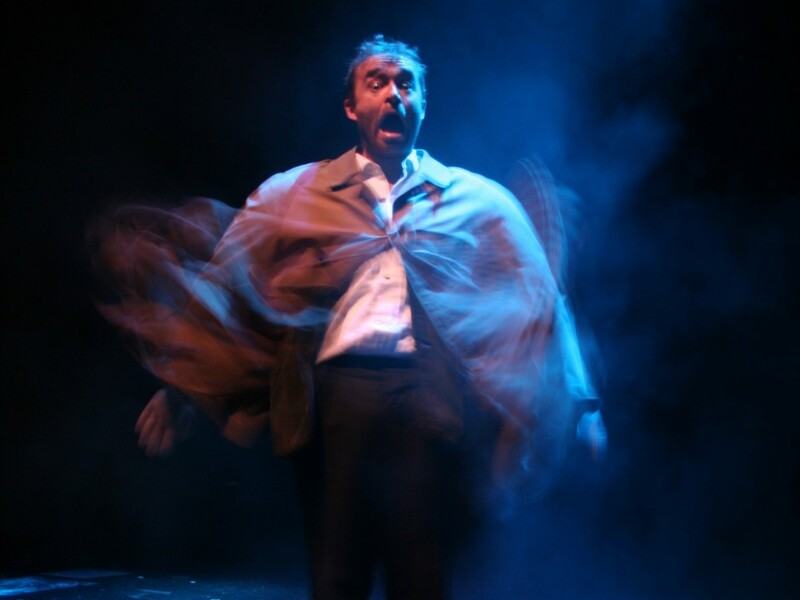 In this sense, it allowed the light to convey movement and character and keep the play very much one-man. 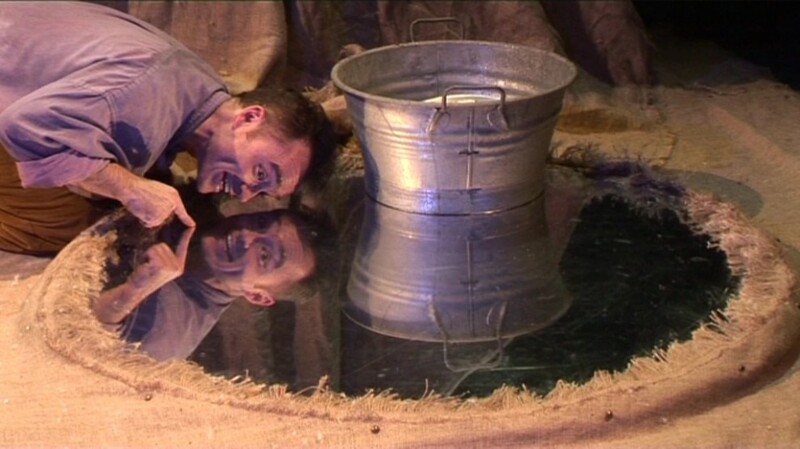 An aspect of the play deserving particular praise was the versatility of the stage, upon which a number of trap doors were opened in order to introduce new settings: one even became a hole into the river into which Lynch tries to disappear! At first it seemed this method of introducing new settings may have been too subtle, but the audience did seem very much engaged by it. The use of clothing and the situations they conveyed was also effective without being too overt; from dusty mill-clothes to the uniform of attempting to be the Marquis. 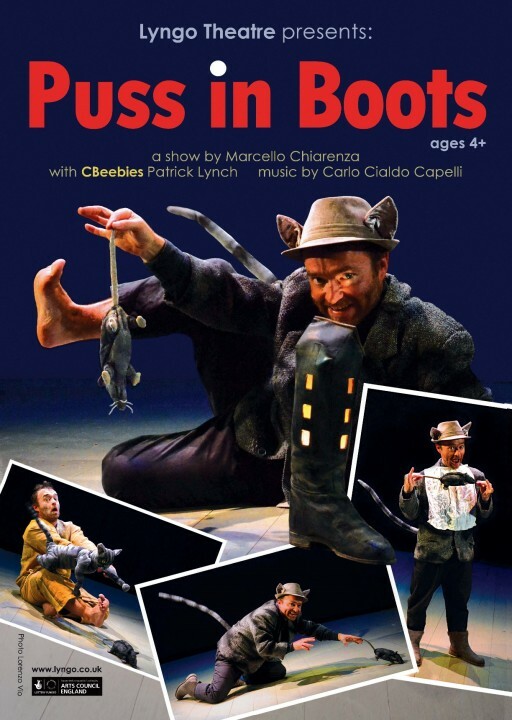 In all, an admirable and highly animated re-telling of the classic Puss In Boots tale which also explores the morals behind authority and symbolism in a subtle way to children, whilst remaining well-balanced and enjoyable. 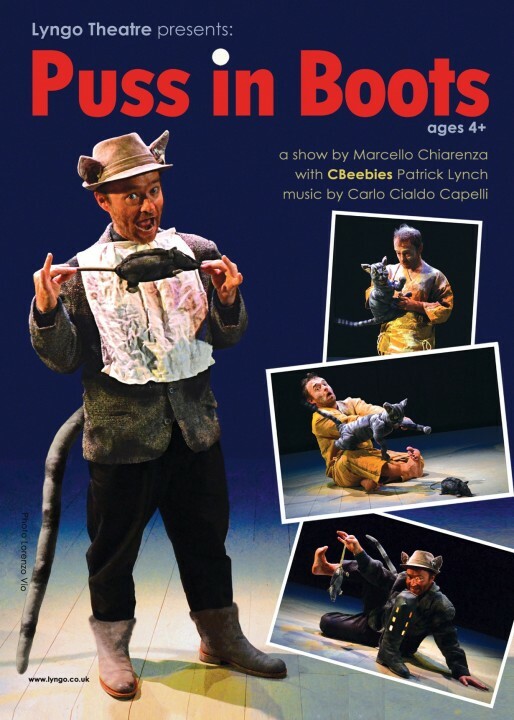 We took our recently-turned 6 year old to Puss in Boots yesterday at the Polka Theatre in Wimbledon. 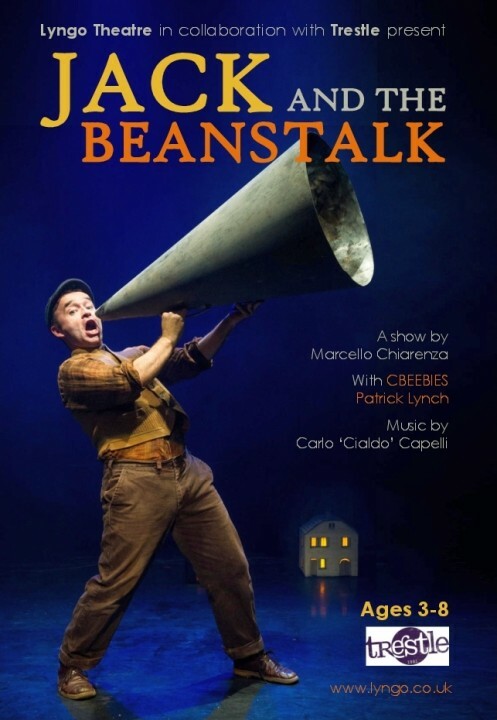 This one-man production performed by Patrick Lynch (C-Beebies), presented by Lyngo Theatre and written by Marcello Chiarenza is children’s theatre and the Polka at its best. 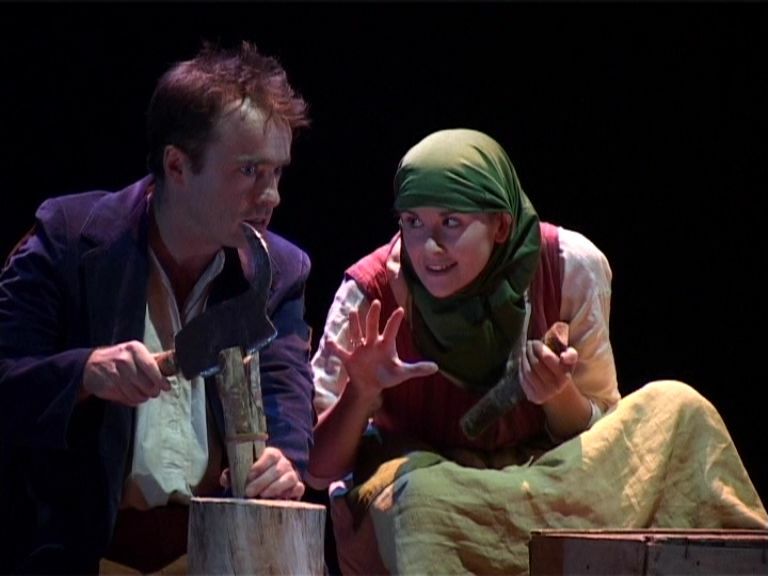 The classic tale was simply but very effectively staged and kept the audience (this performance was for all ages) entertained. In fact there were times that the young audience participated in response to what they were watching which was most satisfying. 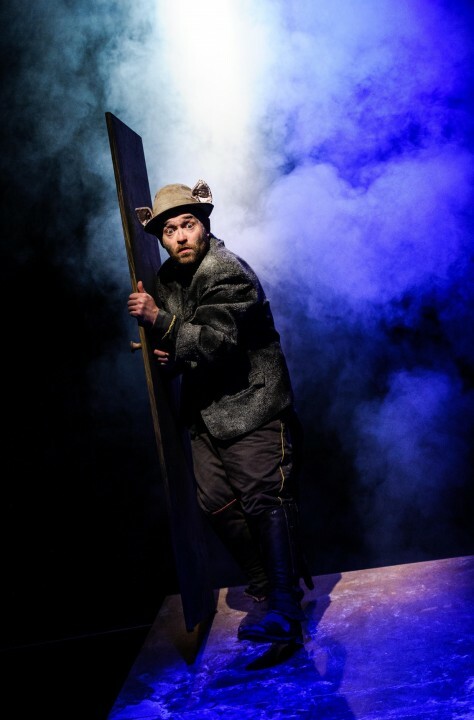 The music was also excellently arranged, creating the atmosphere and encouraged the imagination..
Patrick Lynch moves from character to character effortlessly and convincingly and does not falter during the 50 minute duration of the play. 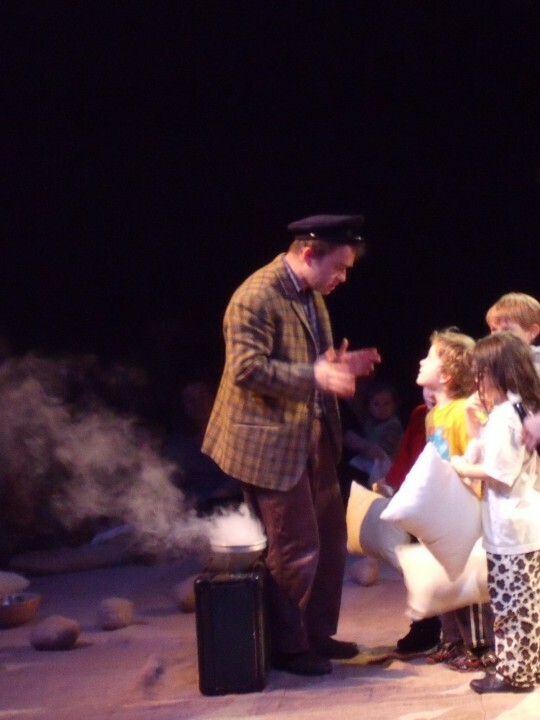 A star performance and a performer truly engaged with his young audience. From explanation to how wheat becomes flour, very warm overall and funny at times this is a script delivering on many levels to both young and old. 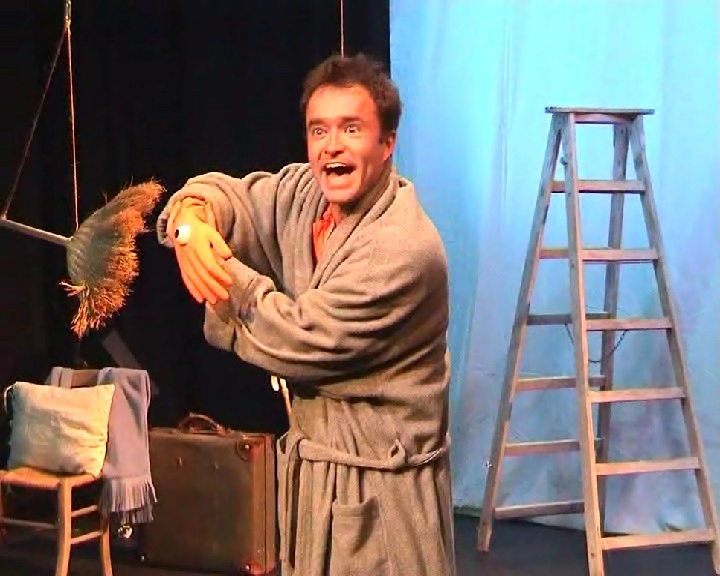 The play runs until 28 June 2015 and is well worth a visit. 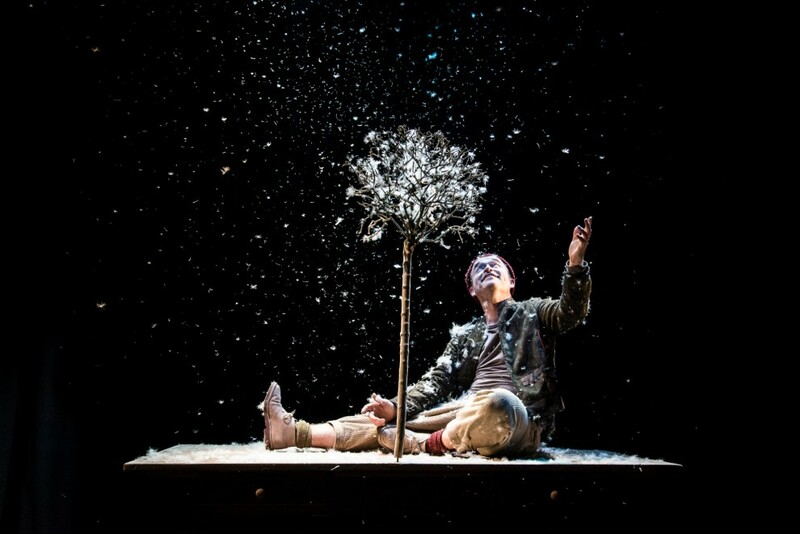 We had such an amazing time last year with Lyngo Theatre at Jack and The Beanstalk, (read our review here) that we were looking forward to this year’s The Curious Adventures of Pinocchio. 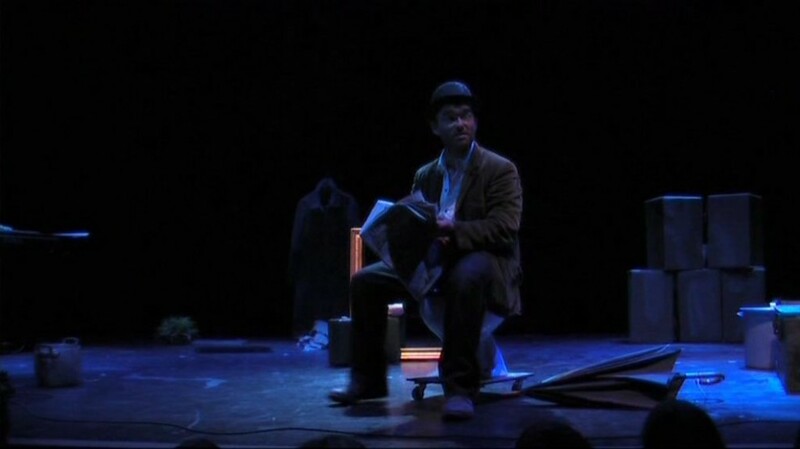 As expected, the props that accompanied his master retelling of the story were simple yet effective. 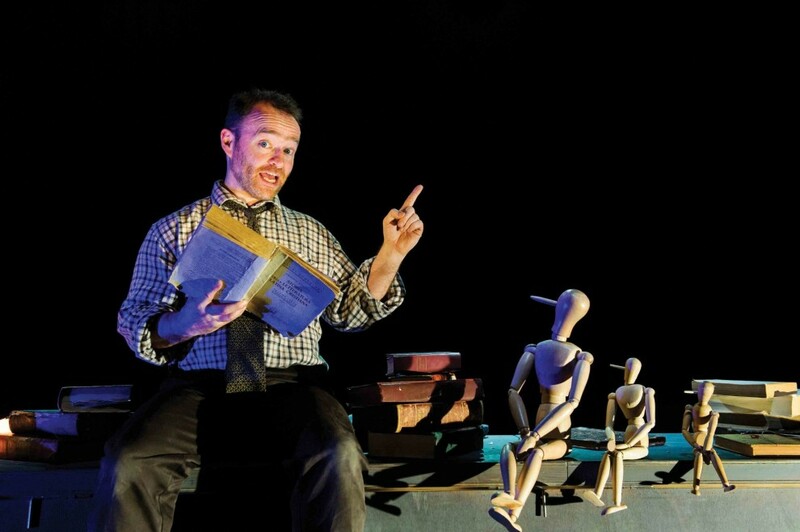 Amidst dusty old books, the magic starts and the story of Pinocchio comes alive on stage. 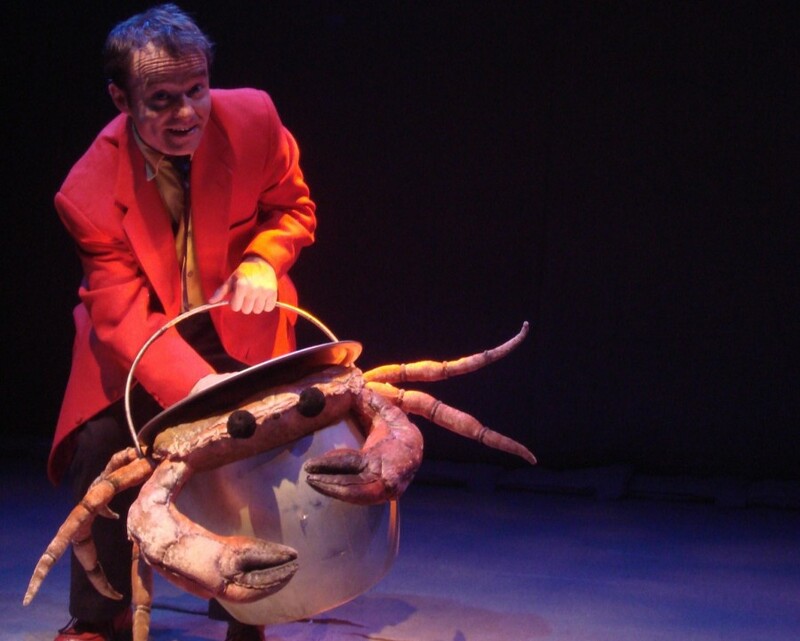 Patrick was able not only to hold the attention of the young audience, he made them laugh gleefully at his playful antics and his curious magical props. 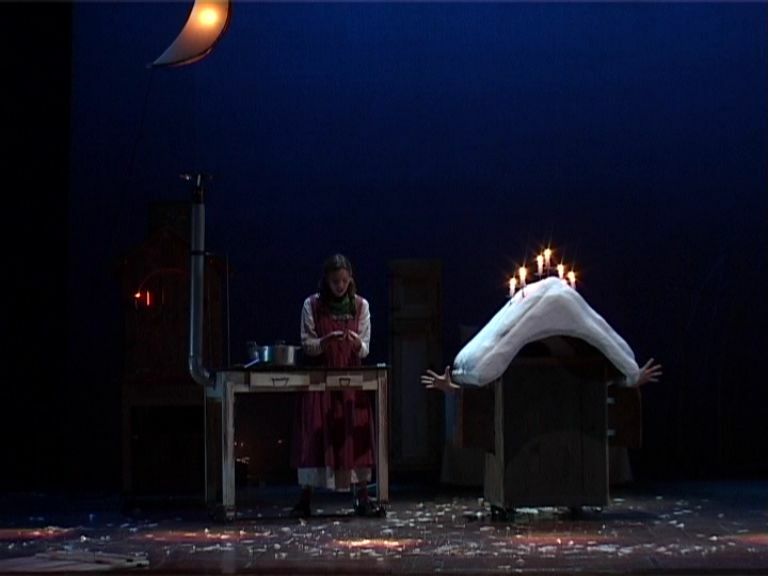 My favourite part must have been when Pinocchio crushes all those ice cream cones (oops! 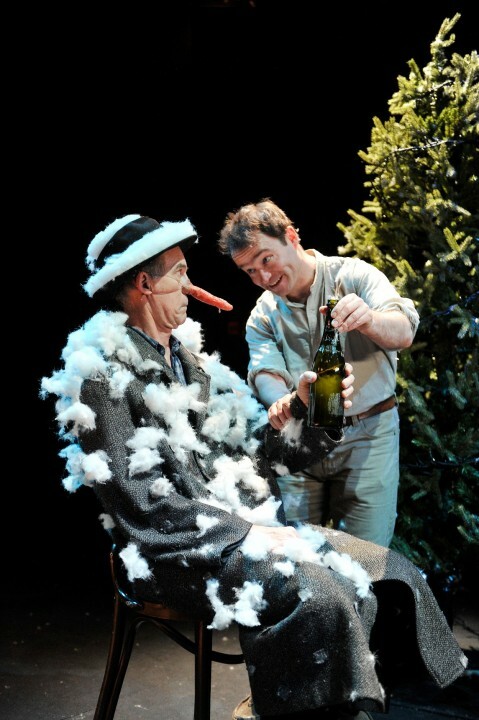 I mean Pinocchio’s long nose) bit by bit by bit after he learns not to lie again. Wey was spellbound throughout the entire hour. 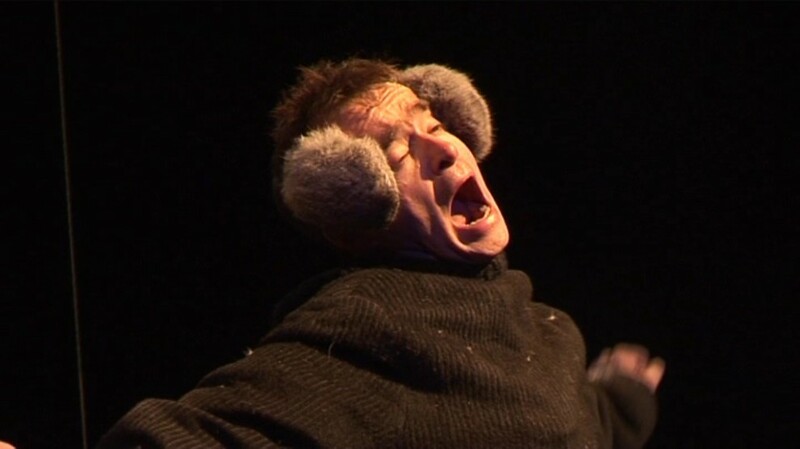 Although there were no actors, and many of the characters in the story that Patrick spoke of were left to imagination only, I could see he was truly absorbed in the story unfolding onstage. At one point, he even exclaimed out loud, “Oh no, this story is tragic…” I was quite surprised at his choice of words because it showed that he was emotionally invested and had empathy for the characters of the story. 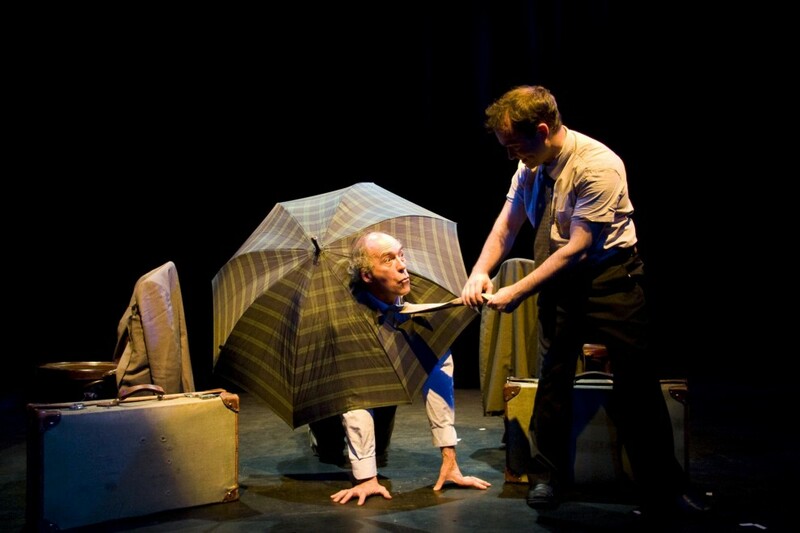 Therein lies the mastery of Lyngo Theatre’s story telling. I have never been to any Lyngo theatre before hence I do not know what to expect of it. 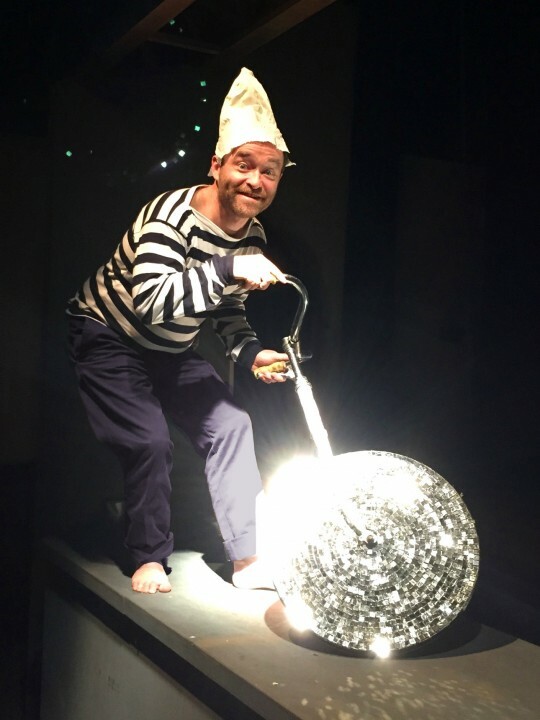 I knew it was a one-man show and one scene backdrop show and I had my skepticism how is it possible to keep entertain the audience especially kids for almost 1 hour, but Patrick Lynch who is also the artistic director of Lyngo Theatre did just that. 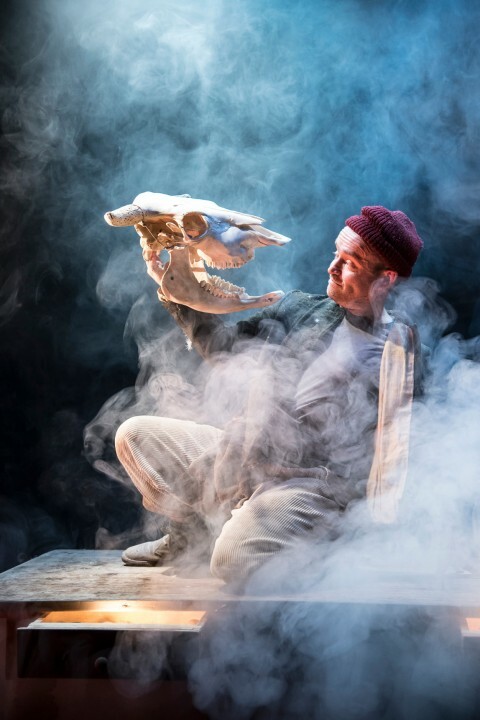 There are lots of imagination involved which is superb for my older kids .Though the recommendations was for 5 year old and above, my 4 year old was wildly entertained and was glued to the actor and the stage for a good one hour. However due to his age he will not be able to fully understand the entire story and make full use of his imaginations unlike the older kids. 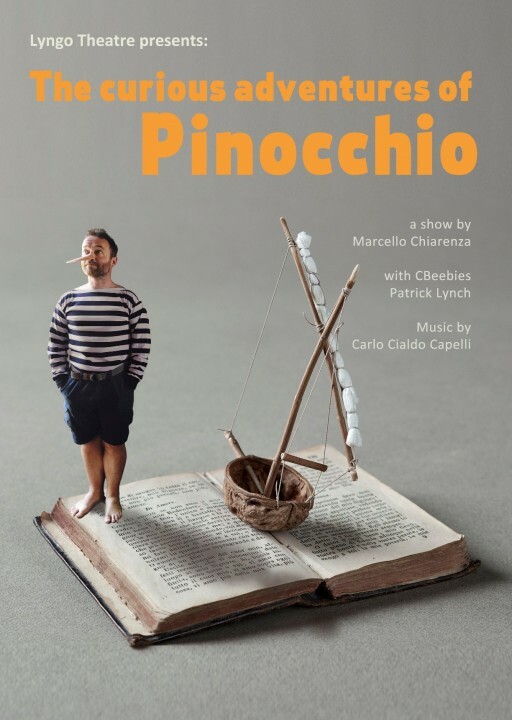 While many has read the story of Pinocchio how many has read the original Pinochhio story entitled The adventures of Pinocchio by an Italian author Carlo Collodi. 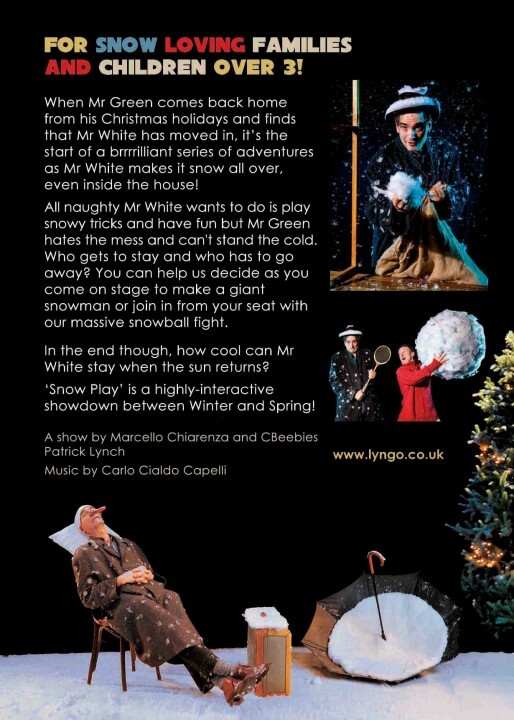 Lyngo Theatre interpretation stay true to its original story which may not be familiar to many however it is quite easy to follow. It was a simple setup a table full of books and a story teller/actor who played all the characters in the original Pinocchio story. 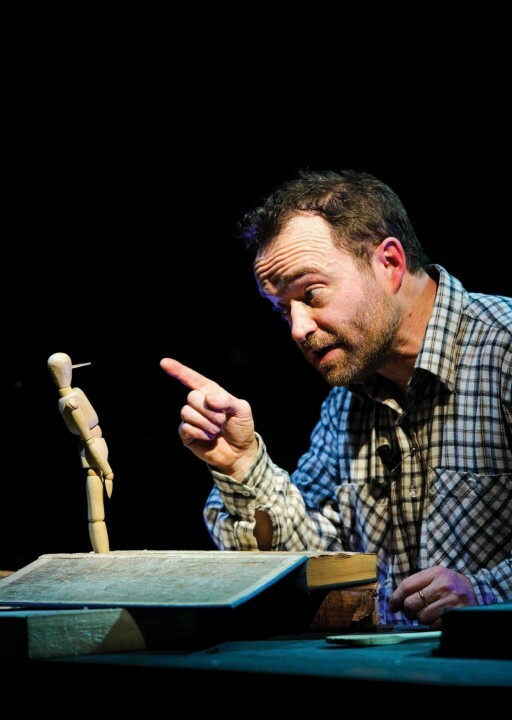 It started with woodcarver Gepetto obtaining a block of wood which was carved into a wooden puppet called Pinocchio. 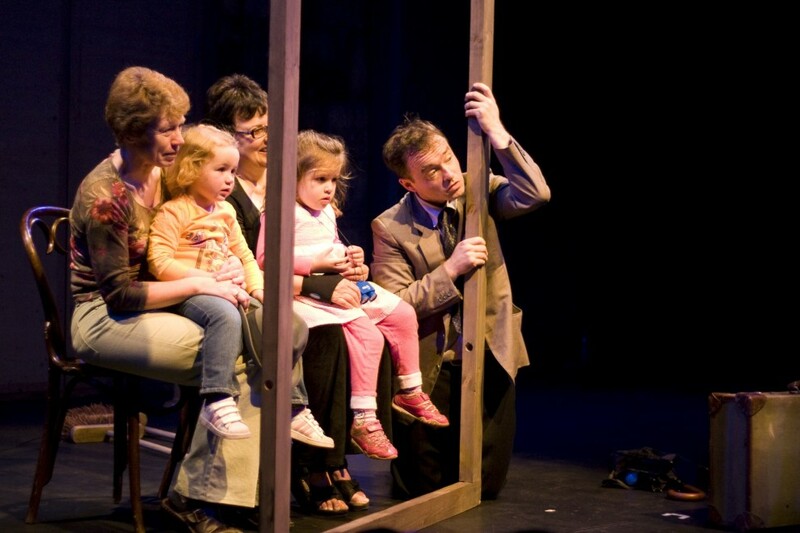 At the very beginning the audience was introduce with a little bit of magic where they saw the wooden block moved much to the delight of kids. 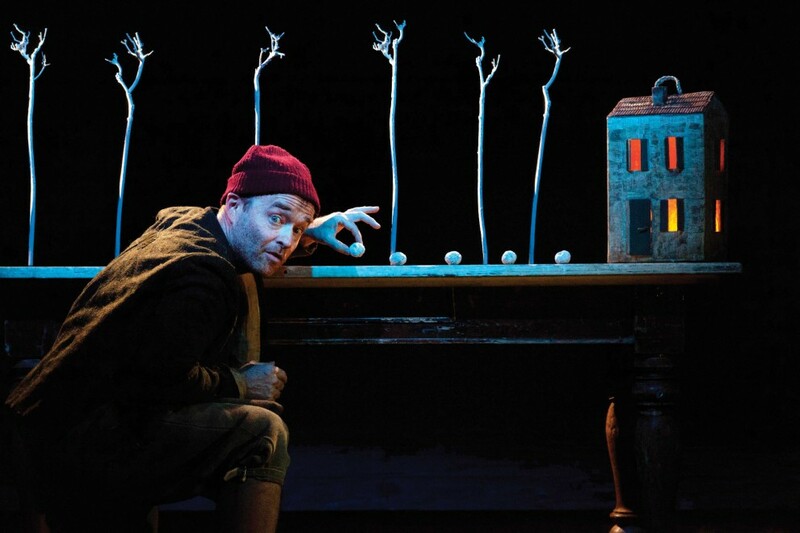 Patrick has used the elements such as books to portray dialogues or swapping of simple props like the sunglasses to differentiate the speech of the blind cat and the cunning fox. The use of ice cream cone to signify Pinocchio long nose when he lied and Patrick crushes the long stack of cones to signify the curse was gone was simply ingenious. He also uses the pages from the books to mimic sea waves which i thought really fuels the imaginations of the younger audience. 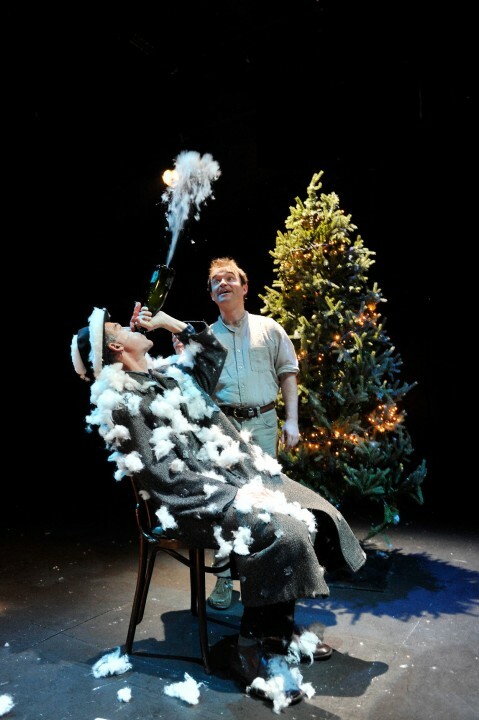 As the back drop was black, many effects were done using gold, silver foils, feathers, bubbles and water. 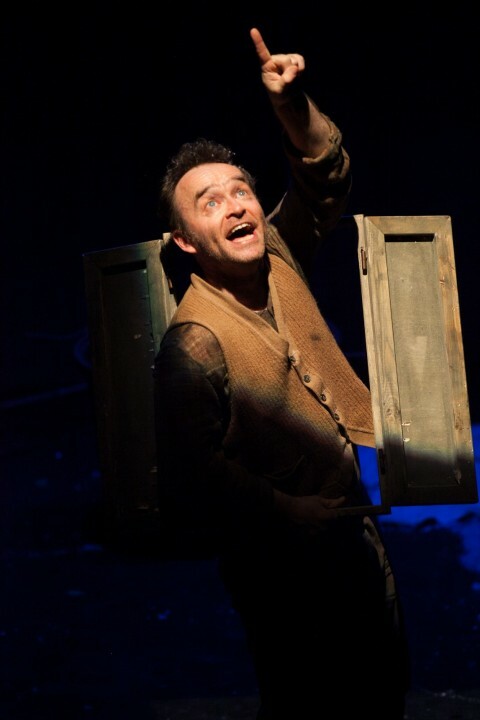 The audience was literally brought on an adventure with Pinocchio as he skipped school, got tricked by the cat and fox , healed by the turquoise fairy, turned into a donkey, saved by the tuna, and ultimately became a real boy which was the original story written in 1883. 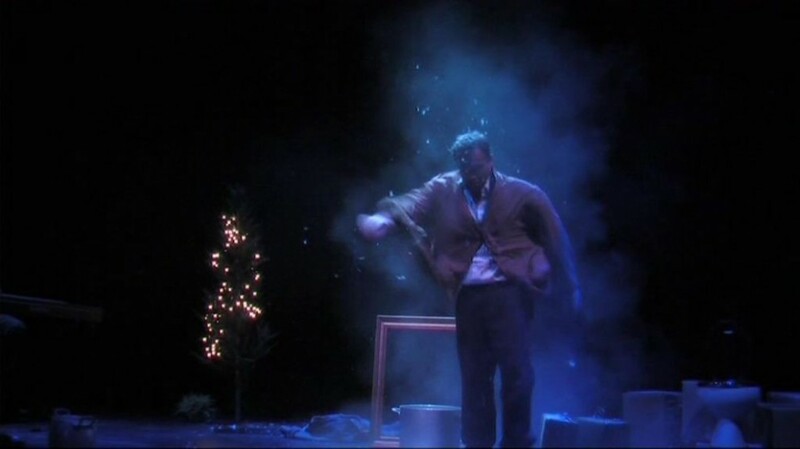 At the end of the show, Patrick spent 10 minutes to whoever who is curious about any “magical” effect that were used during the show. He also explained the use of books as props as we lived in the day and age of technology where tablets and smartphones dominate over books. 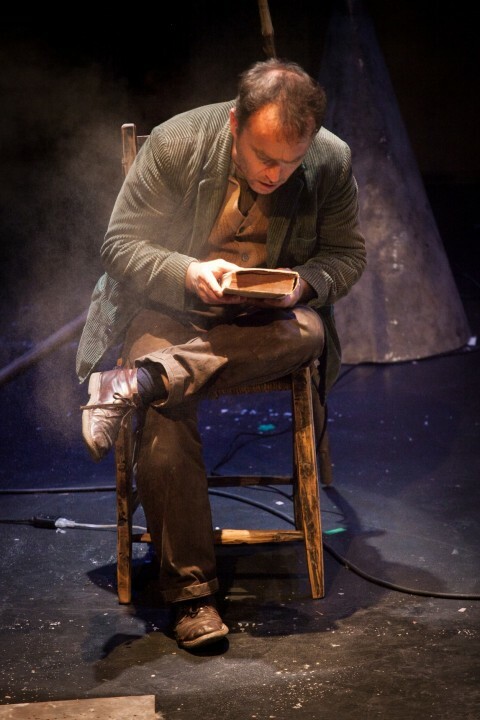 He hoped through this production, Lyngo Theatre can bring back the appreciation of books and bring back the magic of theatre. We also had the opportunity to take a photo with Patrick as a memory of our very magical afternoon with him. As an adult watching this for the first time, I am amazed at the power of theatre production. It doesn’t have to be a one with many backdrop changes, musical effects or a huge cast to make one successful production. 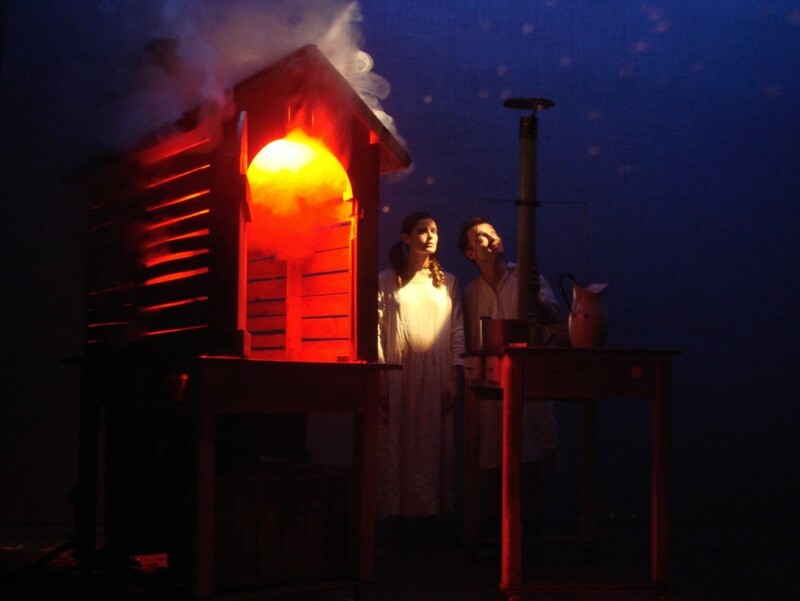 Thank you ACT 3 International for bringing such world class productions to the fortunate children in Singapore. It is only showing till end of this week, do bring your children to uncover the simple magic of children theatre productions. 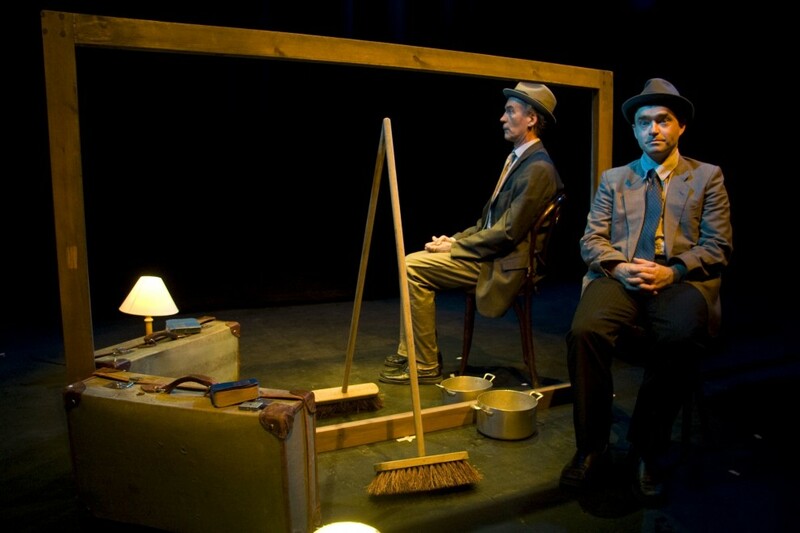 We saw the performance at Lighthouse, Poole's Centre for the Arts, in the intimate setting of the Sherling Studio. 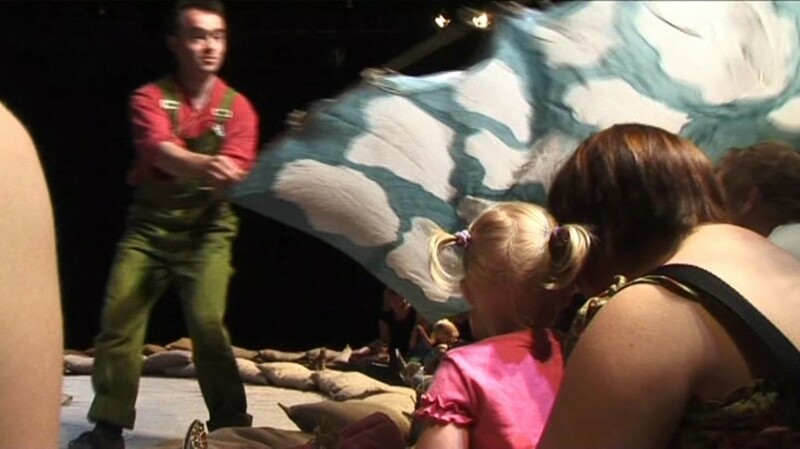 The show is aimed at children aged 6-11. Homer? For children? I was intrigued to see how this would work, and awaited the start of the performance with a mixture of curiosity and anticipation. As soon as the lights went down, and Lynch took to the stage I could see that we were in for a rare treat. 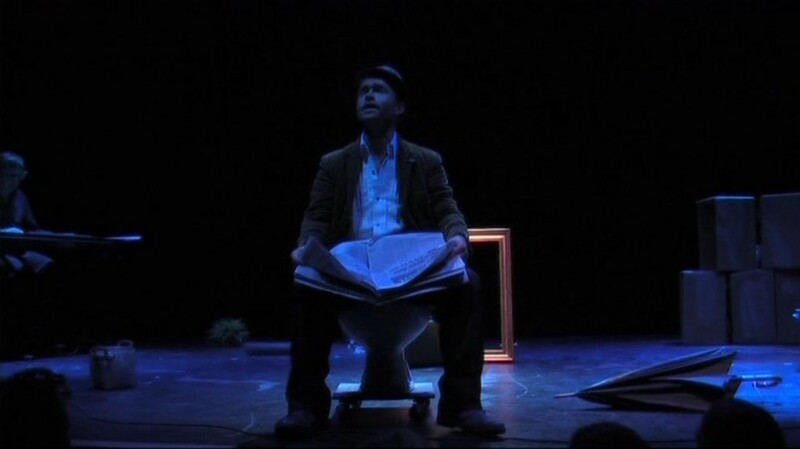 A story that could have been extremely heavy going for an audience of children on their Easter holidays, seemed to captivate them and they sat engrossed in what was unfolding before their eyes. 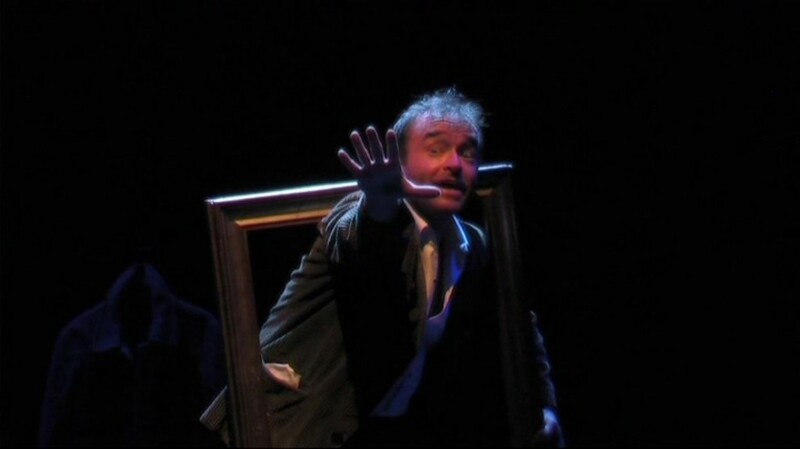 The visual element of the performance really helped with this, as we followed Ulysses on his classic journey, both aided and hindered by the gods. Despite the lack of an interval, there was no fidgeting, instead, you felt like you were witnessing something very special indeed. Skillfully re-telling this epic tale, whilst at the same time using props, and also operating lighting and cameras to great effect, Lynch ensured we were truly drawn into the story. 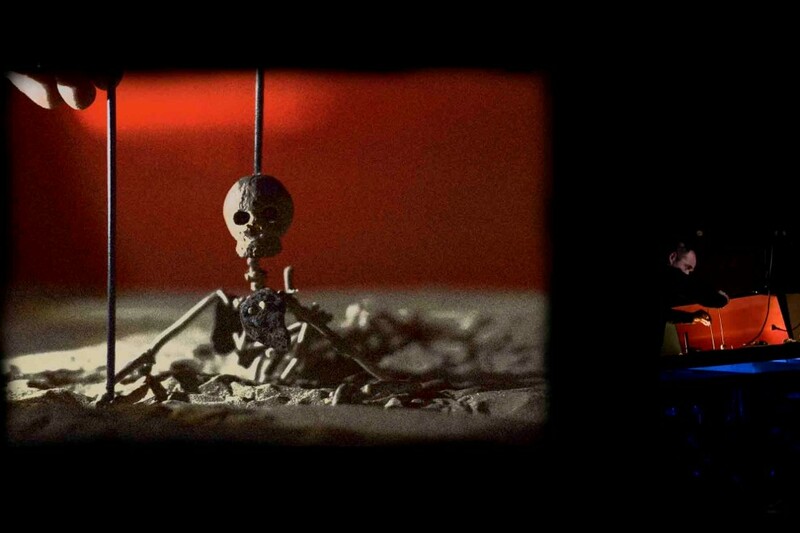 A real feast for the eyes, we were able to watch Lynch operating the props that were creating the visual telling of the story on the big screen. Sounds complicated, and it's very difficult to explain, but I can assure you the result was magical. Despite being aimed at children, I think that many adults would enjoy this show. I came away feeling that I had witnessed the most original creative performance I'd seen in a long time. My seven-year-old's verdict? "Amazing!" And trust me, seven-year-olds can be hard to please. 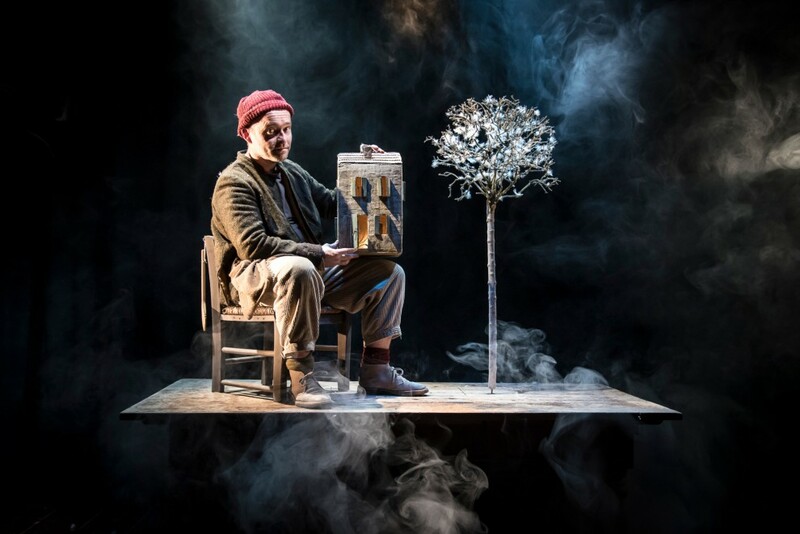 It’s all smoke and mirrors … really they’re both used … and sand, and water, and models, and silk cloth, and puppets and rocks and bones, and an undulating screen, and narrative and face close-ups and even hair dryers, all set to an atmospheric soundtrack. It takes its title from the more modern odyssey, by J.R.R. Tolkien … but it is the Greek myth. 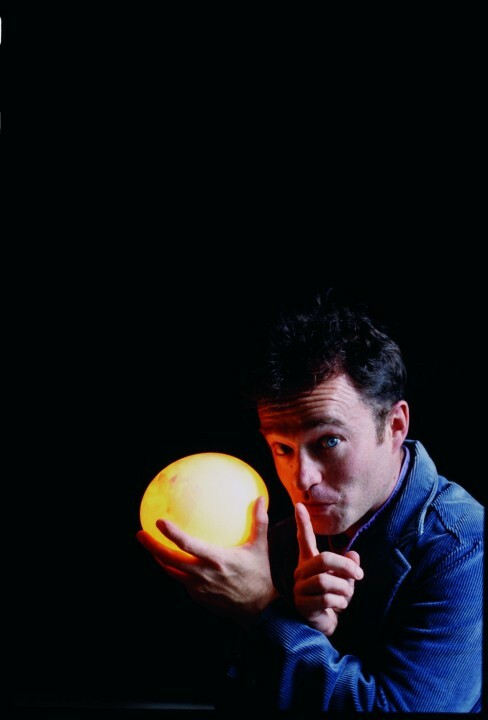 Patrick Lynch (from CBeebies) is narrating, with a long table with lights and video cameras on one side of the playing area, and a loose floating sheet as a screen on the other. Foot switches were used to operate and shift between cameras. Backgrounds and skies slotted effortlessly into place behind the sand. Rocks were added. Puppets were moved into place. Falling sand created islands. Water swirled. The actor’s eye became the Cyclops in extreme close up. His mouth became the Cyclops feeding. The camera on his face revolved through 360 degrees. I was lost in admiration. I used to do talks on teaching with video, and my equipment set up on speaking tours was a video player, an overhead projector and an audio player. Eventually a laptop replaced the OHP projector, but I still needed two screens. Then I added DVD to demonstrate that for classroom language teaching, video is better than DVD (you can isolate single frames on a professional video machine, and advance one at a time … you can’t do that with DVD). And I had to give the talk too. It was nothing to the amount of technology and equipment used here to great artistic effect. 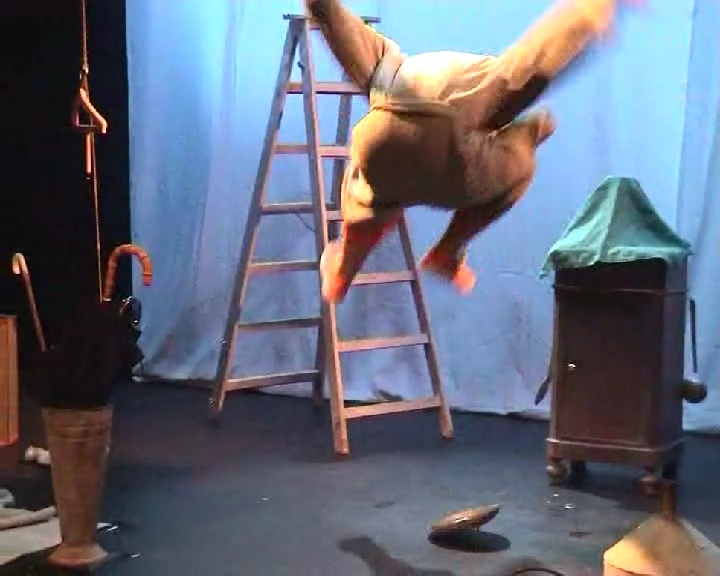 Here our actor, Parick Lynch, had the widest multi-tasking task I’ve seen. 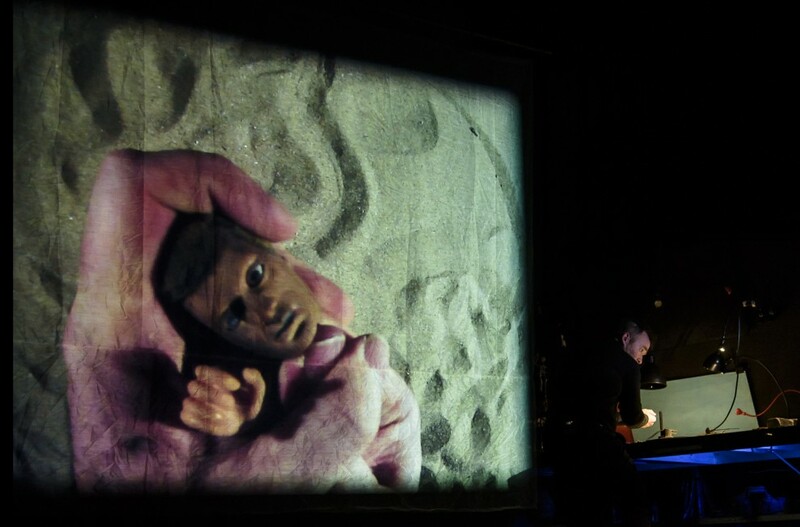 The projected film showed what he was doing with his hands and the camera, and if it had simply been recorded and shown at the Tate Modern as a video art installation, it would have garnered massive praise. But here it was all being created in front of us and filmed live, whilst doing a splendid narration. The story of the Odyssey was cut and constructed extremely well too. I took a 13, 11 and 6 year old with me, and all were entranced. The six year old never fidgeted and remained enthralled. I’ll add that I would have been equally entranced if I had gone on my own just to watch. 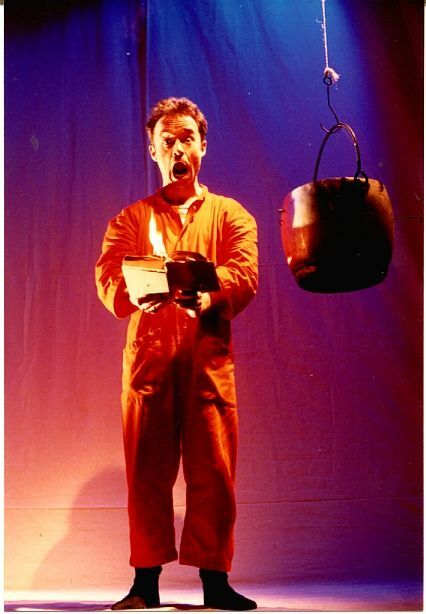 Most remarkably this was the first show in the tour that Patrick Lynch had done. It could run off and on at half terms and Saturdays for years. It was a clear introduction to the story too. 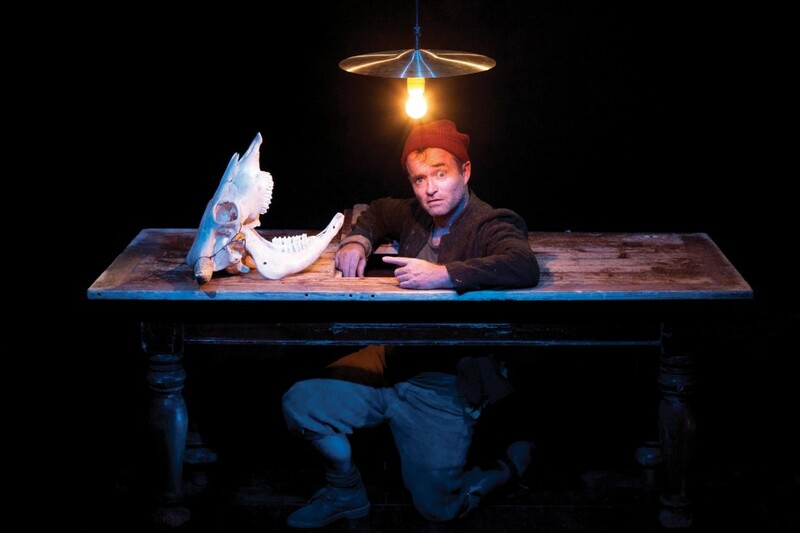 The word unique is over-used, so I’ll say it only once … it is a unique and richly rewarding theatrical experience. It is half-term, I’d gone expecting a normal kiddy show (I don’t usually review those at all), but this was much more than that. Comments? Well, it was watch rather than “participate” but on the way in a kid was saying “We won’t have to DO anything, will we?” A heartfelt cry from a boy who had clearly seen (and been dragged into participating) in a lot of children’s theatre. My three were relieved too. Highly recommended. It’s on tour. 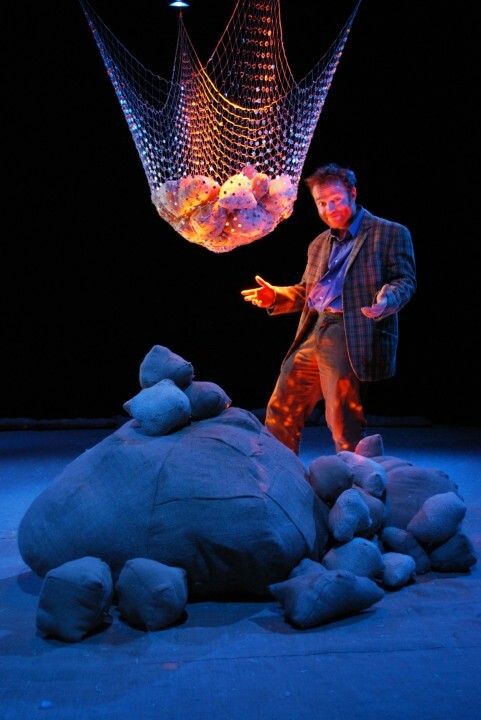 In There and Back Again storyteller, actor and puppeteer Patrick Lynch presents an hour-long version of the Odyssey. The Homeric saga is told through a mixture of sophisticated technology and the very simplest means. With sand, lumps of stone, crude ceramics and folds of cloth, he presents his protagonist and fashions the places and oceans of his travels. 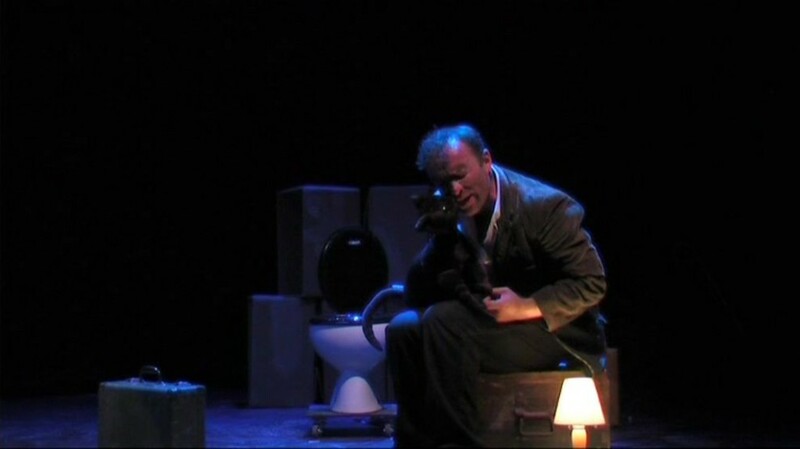 He begins talking directly to the audience, inviting them to feed him information as he tells them it is a story about going home. 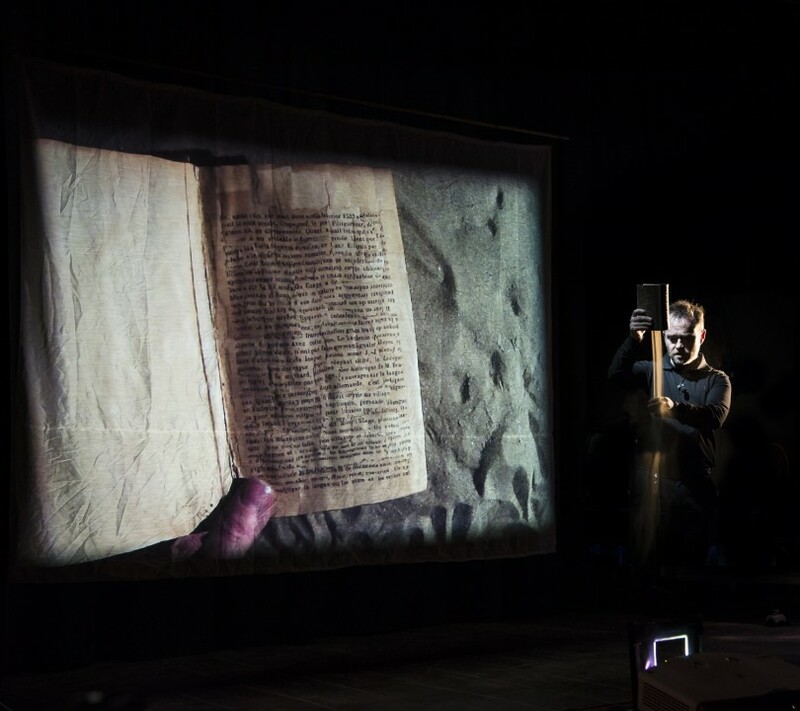 Turning away he switches on a camera and, projected upstage on a loosely hung cloth, we see his finger draw a route in sand and then clear it to reveal the word HOME and then HOMER before, wiping off more sand, he picks up a book. 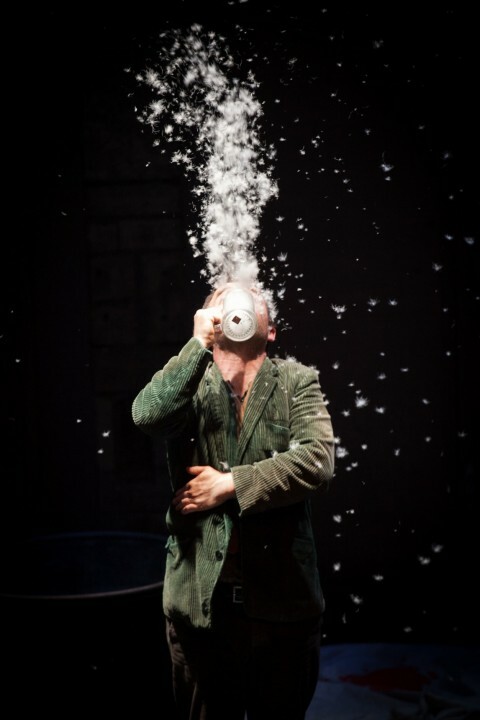 Coming back to face the audience, he holds it up and it spills sand, and more sand; like a story pouring forth, it goes on doing so. Where does it come from? It is extraordinarily simple but looks fascinating; a little bit of theatricality that grips the audience. From now on the theatre full of school parties is entirely with him. 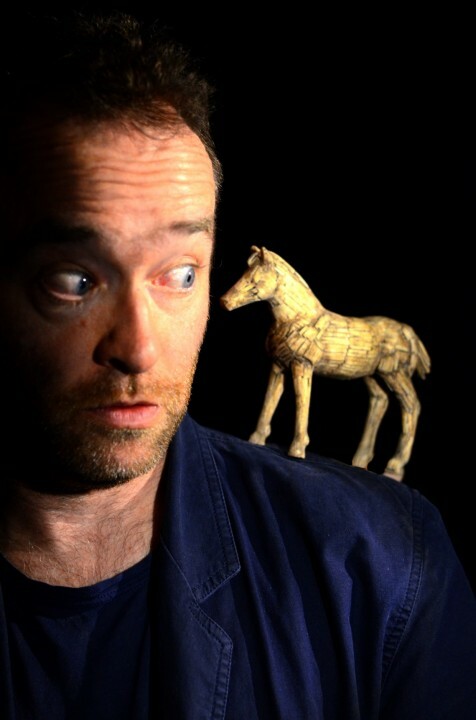 On a table top with cameras set up around it, he acts out Odysseus’s adventures, first filling in the background of the hero trying to get out of going to Troy, then of thinking up the Wooden Horse to get the Greeks victory even before he embarks on the voyage going home with all its dangers. Crudely decorated pottery and lumps of stone become a village or a palace as they move in front of a camera. Blue cloth waves swamp the returning Greek ships, rudimentary representations but the action obvious. Only his vessel sails on. 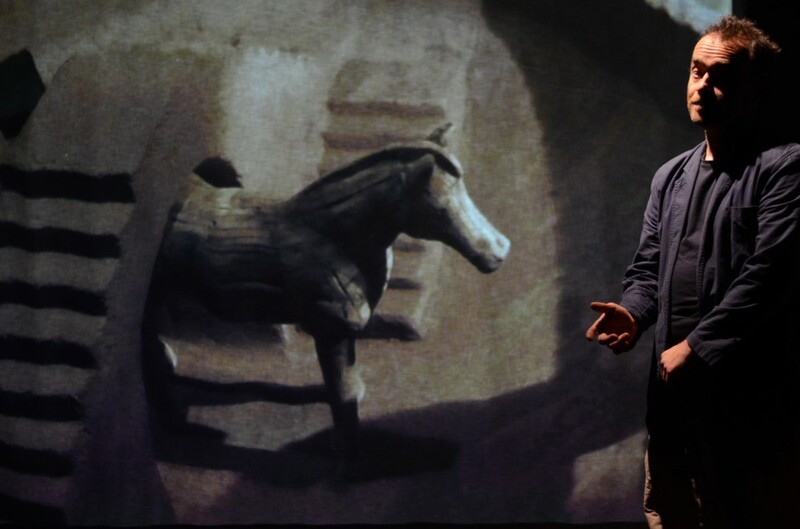 When it is wrecked a tiny bearded head appears: Odysseus struggling for survival who looks down at two tiny feet as he is stretched out, beached on a sand strip; on camera they can look life-size, the camera angle helps imagination make them real, gives the audience Odysseus’s gaze. When Odysseus blinds the Cyclops, it is a close up of Lynch’s own mouth that shows his pain. 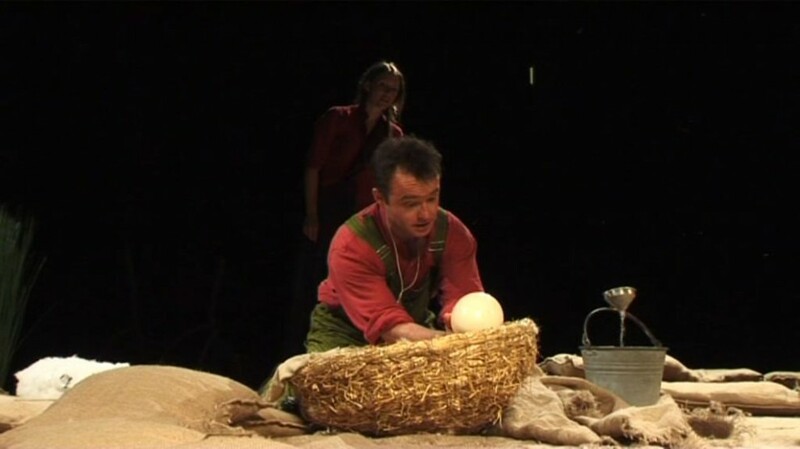 Sometimes, while Lynch arranges items for a new scene, the image will freeze-frame, but he never seems to lose his rapport with the audience, helped by his continued narrative, Carlo Cialdo Capelli’s music, careful timing and by the children’s own imaginative investment. 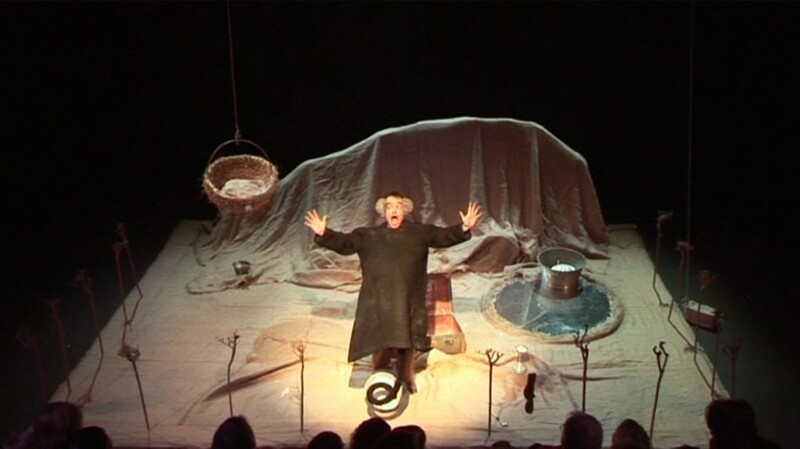 At the schools’ performance I saw, the children clearly loved it, both those who already knew the story and those for whom it was a new one. Questions after suggested they were also fascinated by its means of execution: not just “was that real blood?” of the killings on Ithaca but how the pottery was made and how the pictures happen. Lynch explained how other people helped him put the show together, including interactive programming which gives him push-button control for 87 different cues that change camera, lighting or music. 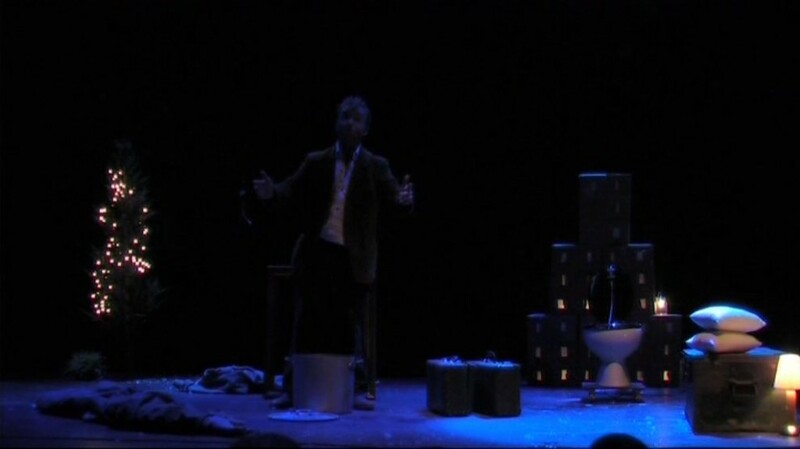 There was also one audience complaint: that the rocks and whirlpool weren’t included. It’s not the only incident that is missing, but you can’t fit Homer’s long saga into just one hour. 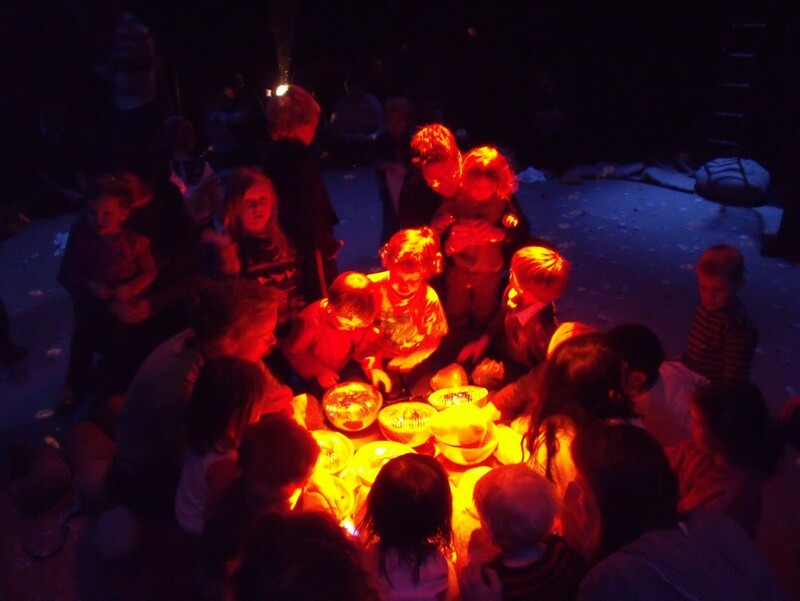 Aftershow Q & A sessions not only satisfy the curiosity of youngsters, they also set out to actively encourage them to be creative, suggesting how they can use simple materials and their own webcams to tell their own stories, whether privately or with their teachers. At around 3000 years old, Homer’s the Iliad and the Odyssey stand proud amongst the world’s most ancient surviving literature. Greek gods, battles, love and revenge rage through the epic poems that verge on 28,000 lines of Ancient Greek. Translated into often impenetrable flowery prose or verse, these great works make for chewy bedtime reading let alone a quick story for the kids. 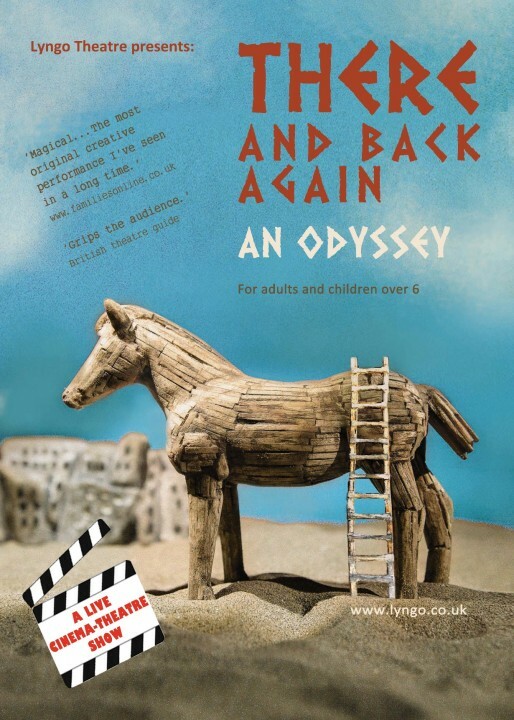 Lyngo Theatre’s There and Back Again - An Odyssey has chewed away at this epic for us and made it accessible to anyone aged 6 to 100. 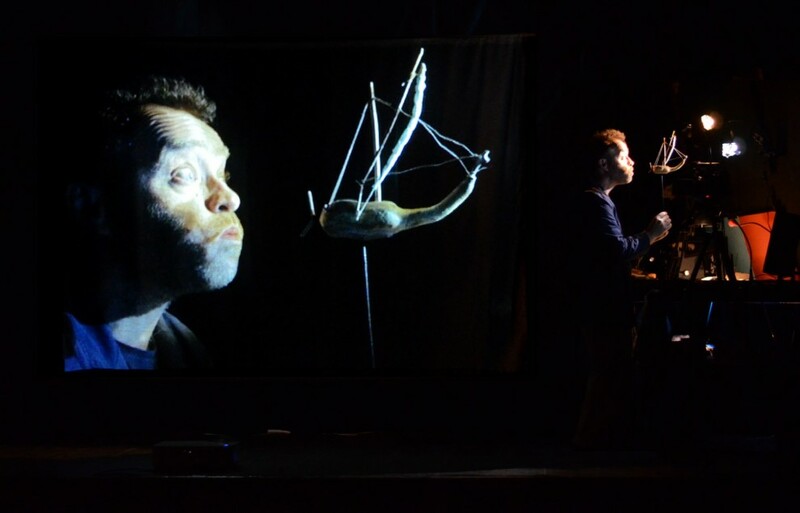 The old and new come together through live object and puppet theatre that is projected onto the big screen. Far from distancing us from the original story, the physical presence of image and sound bring us closer to the old oral tradition of narration that existed long before Homer. 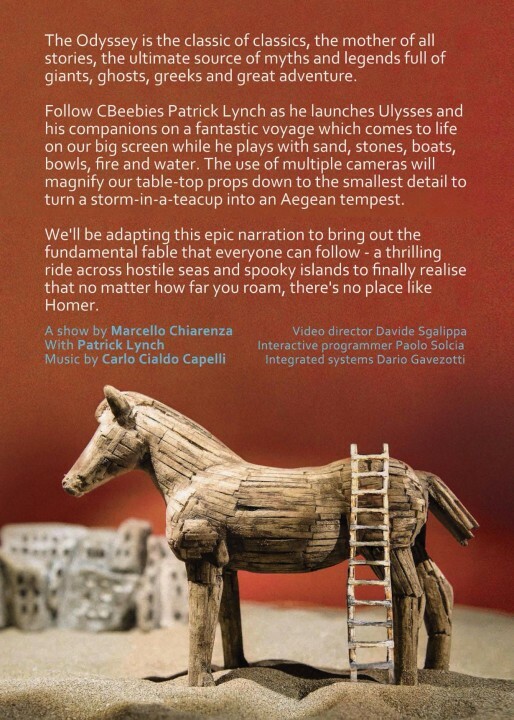 Everything is intentionally bigger on screen – the toy Trojan Horse projects tall and majestic and Patrick Lynch leers menacingly into the lens as the Cyclops approaching a trapped Ulysses. Face half lit, Lynch is a master storyteller who peels back the Odyssey to its core tale of a man, Ulysses, who just wants to get back home. 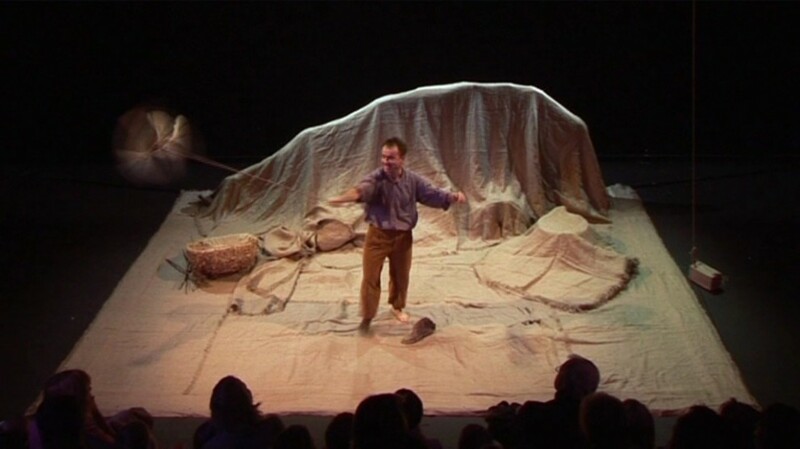 Tiny walnut boats glide and churn through swathes of fabric sea, pages weave across the screen as waves, and Action Man presses his toes into new lands. Carlo Cialdo Capelli’s evocative piano score accompanies and sweeps us through the fear, drama and curiosity. At the end, awestruck children crowd around as did generations of kids when the old travelling storytellers came from village to village. 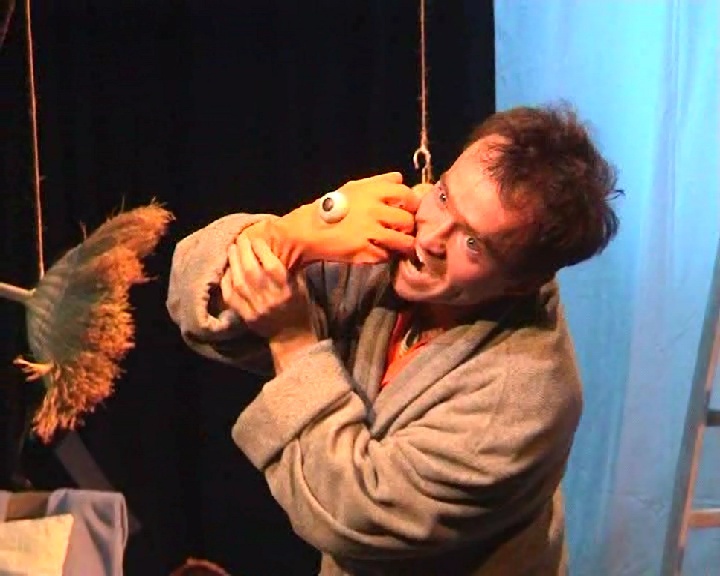 Lynch continues in his dramatic role as one child pipes up, “How did you make the blood?”. 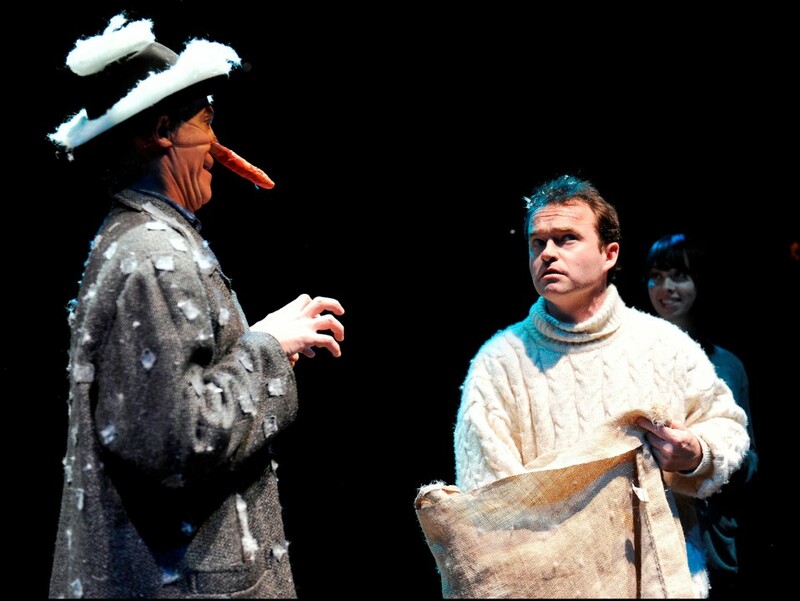 The storyteller has a glint in his eye, “Why, from children of course! But only the youngest will do!”. A ripple of excitement and giggling sets in and every face, young and old, lights up. Just when I thought that every last fairy tale had been made into a theatre production, I’m surprised yet again that there’s yet one more! 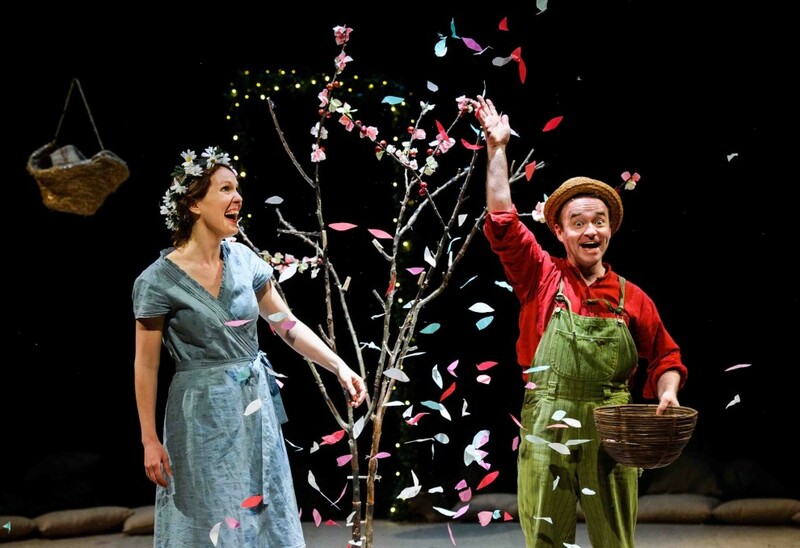 Yep, Jack and the Beanstalk is a classic fairy tale which we’ve yet seen on stage until now. 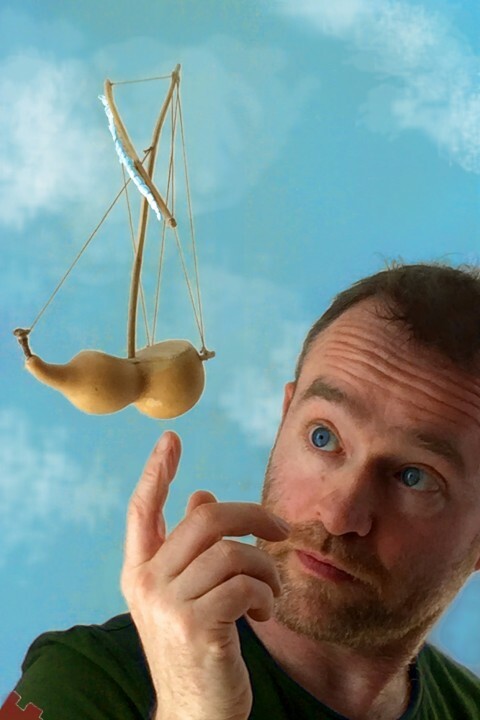 Everyone knows the classic story about Jack who sells his cow, Milky White, for 5 magic beans that grew and grew overnight to reach a land above the clouds where the Giants live. 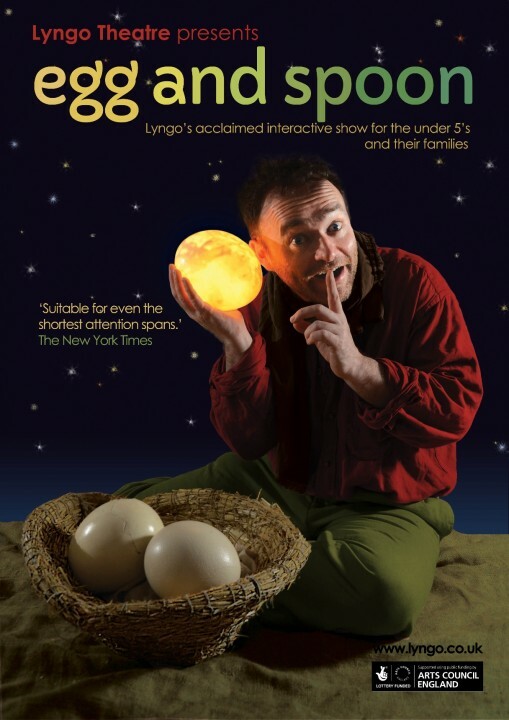 Now join LYNGO‘s fun storytelling and hilarious exploration of the land of Giants and expect lots of fun surprises and squeals of laughter! We had so much fun at today’s stage performance. 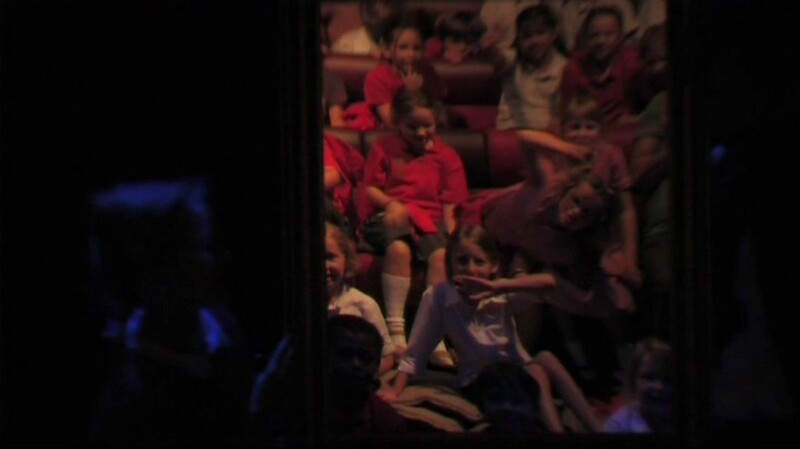 The kids were all riveted to what was happening onstage. 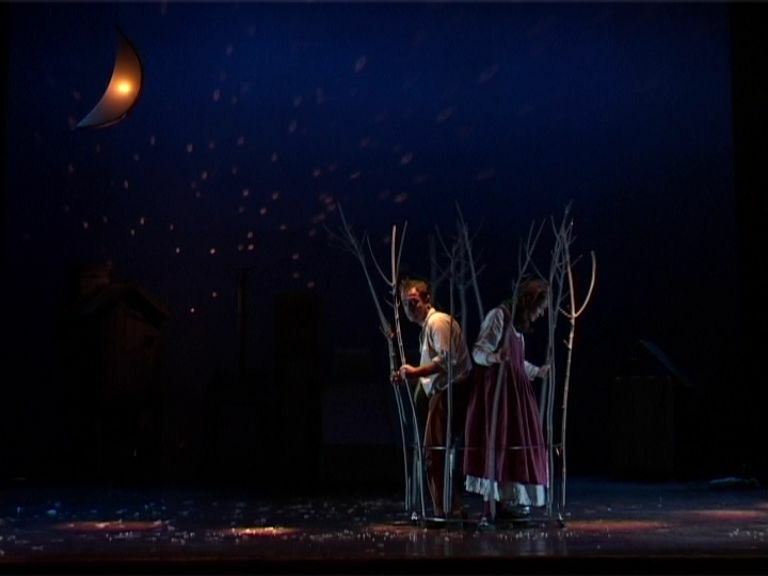 The set was simple as with the storyline that remained unchanged from the familiar, and yet every bit captivating with the well timed lighting cues and music. 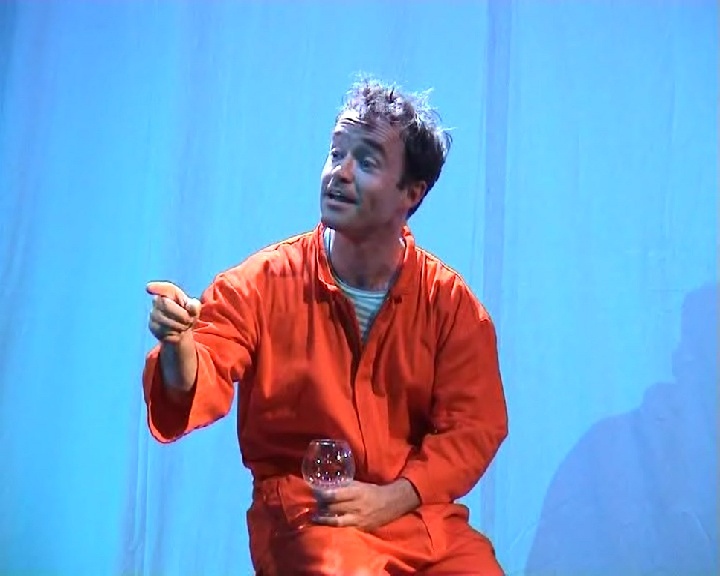 The wonderful acting and performance by just one very energetic engaging actor drew laughter from every corner of the theatre. 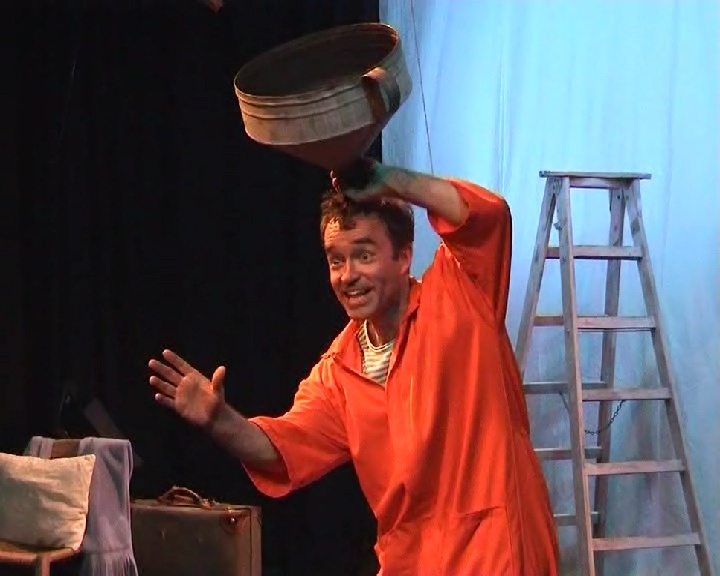 That is the children’s theatre success of Lyngo ~ One man, all the laughter. The audience interaction was superb even without asking for anyone to come onstage or purposefully baiting the audience to participate. 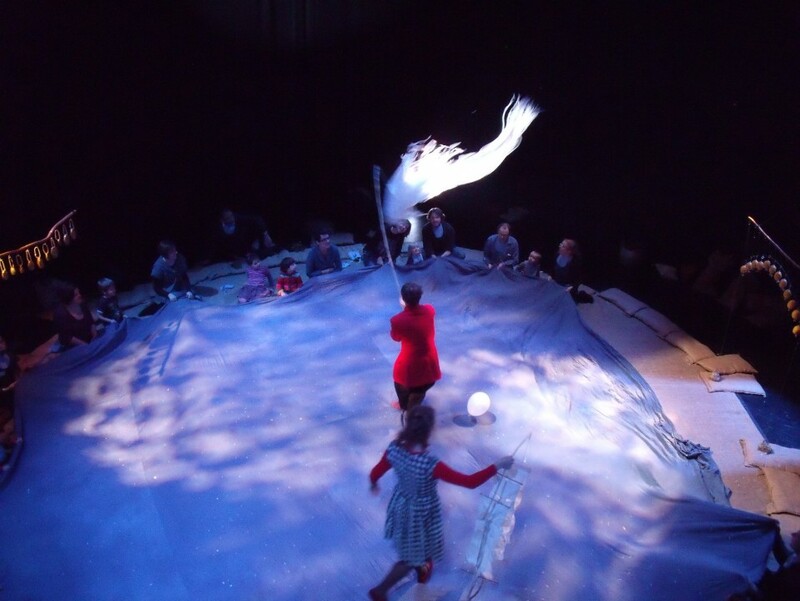 The atmosphere was so relaxed at the Black Box Theatre this afternoon that the children felt so at ease to shout out their thoughts right from where they sat at every possible moment. Watch for the really Enormous boot, tiny house, snow and showers of silver and gold and some squirts of ‘milk’ for the front seats! A really good show that wastes nothing! If anything, don’t miss the Backstage Workshop Tour. There are limited spaces and tickets available for this and it’s really really worth doing! At the backstage workshop, you get the Meet and Greet to meet the man behind the amazing performance. 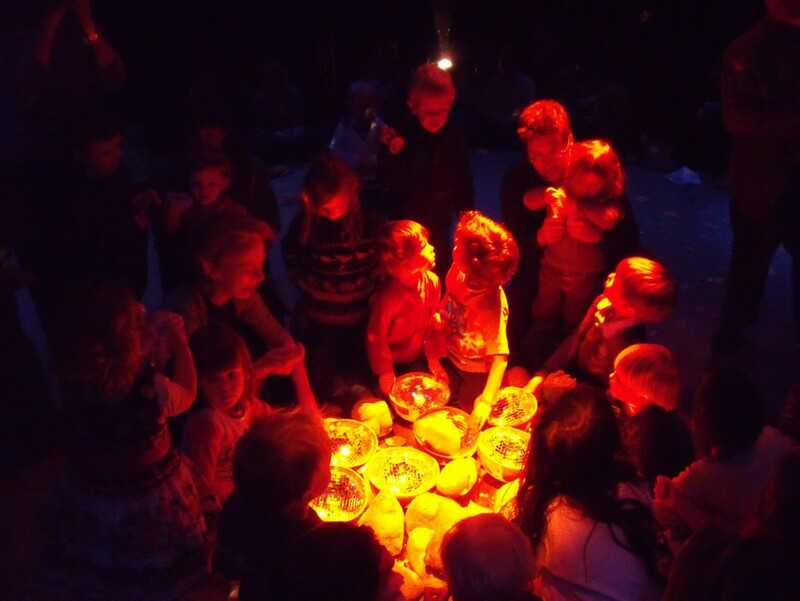 But what’s most precious about this 30 minute workshop is that your kids get to explore theatre behind the scenes. 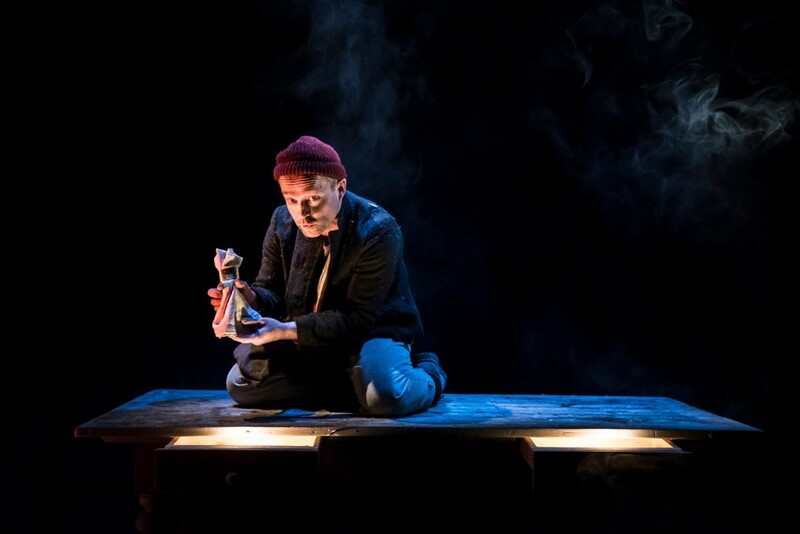 The children are encouraged to think how each scene is achieved, how and why a prop is made in that way, what lightings are used and why and what they noticed about the music used! 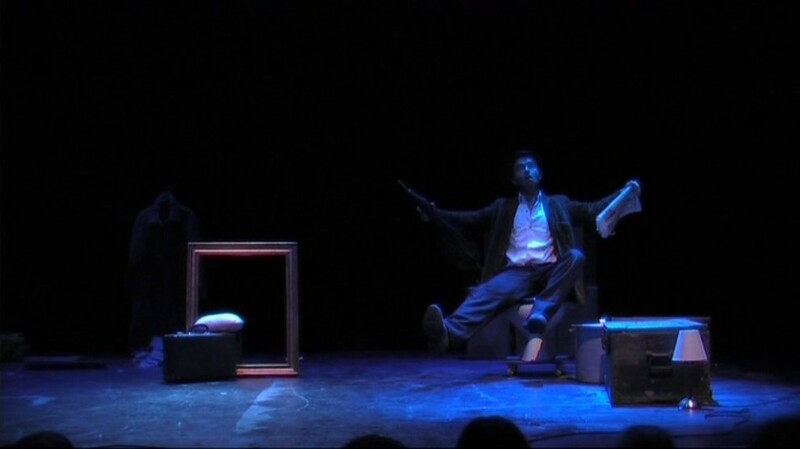 I learnt that there were 45 different lighting cues for this short 50minute production! Wow! Watch this mini-video of parts of the Backstage tour that we so enjoyed and loved! 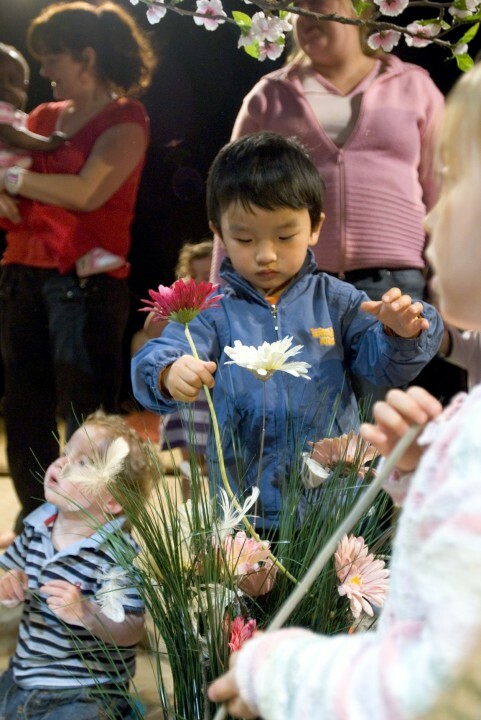 As a parent interested in the Arts and wanting to cultivate the same love for Arts in my little one, I found this workshop really great creative fun. 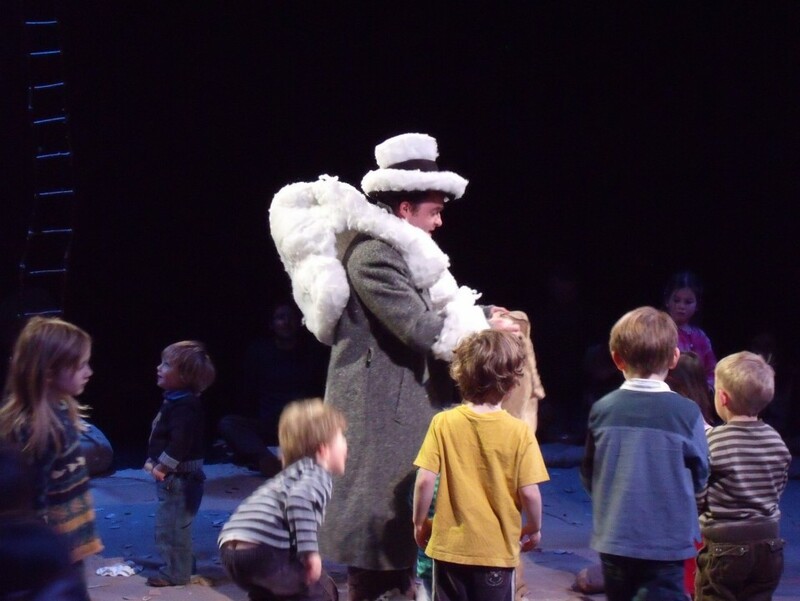 The kids were given every opportunity to interact with the actor, with the props and with what they had just watched, to explore and imagine. 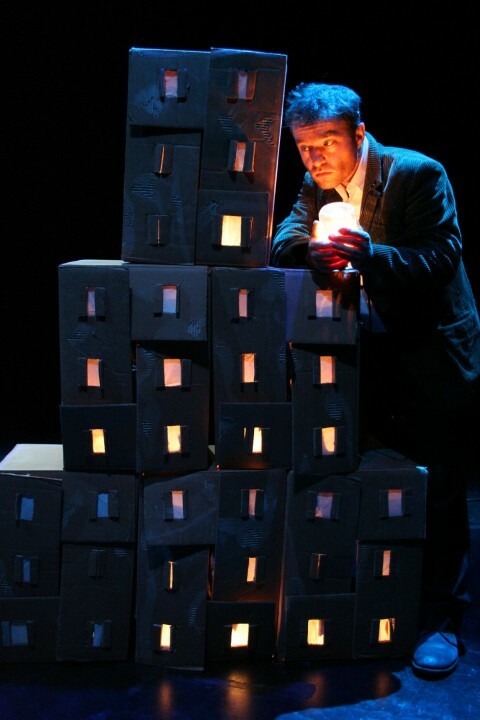 I could see it really helped Wey put his creative thoughts in place as he thought through the play he just watched and how each scene was achieved. The discussion was highly interactive as the kids were told and taught how things were done. Everyone even the adults had fun! As the show ended, I couldn’t help but to ask the kiddos what they thought about Jack’s actions, was it right or wrong? Although the fairy tale doesn’t quite give a sense of Jack doing any wrong, and seems to celebrate the fact that he killed the Giant, my take home discussion for Wey was to check out his moral compass despite the fair tale’s presentation. I was quite pleased that Wey’s immediate response was that Jack was not right to steal (not just once but actually thrice!) from the Giant. Wey said to me “Mama, being poor doesn’t mean he can steal from the Giant. And because he didn’t work hard for what he stole, he used it up so quickly and had to go back to steal again!” Wow!! Thank you, Wey! So we’re good in that department! hahah! Phew! So, there you have it, a great take home lesson and teaching opportunity for the kids too! 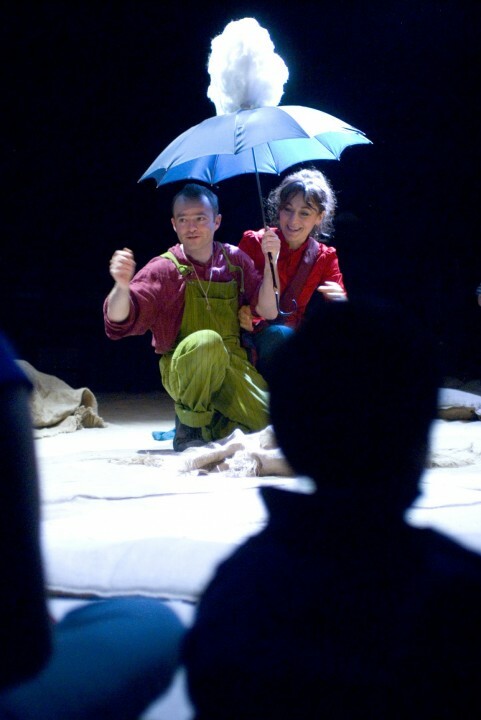 Don’t miss this great fun opportunity to meet theatre in a fun innovative way with LYNGO, a UK based Children’s Theatre company. 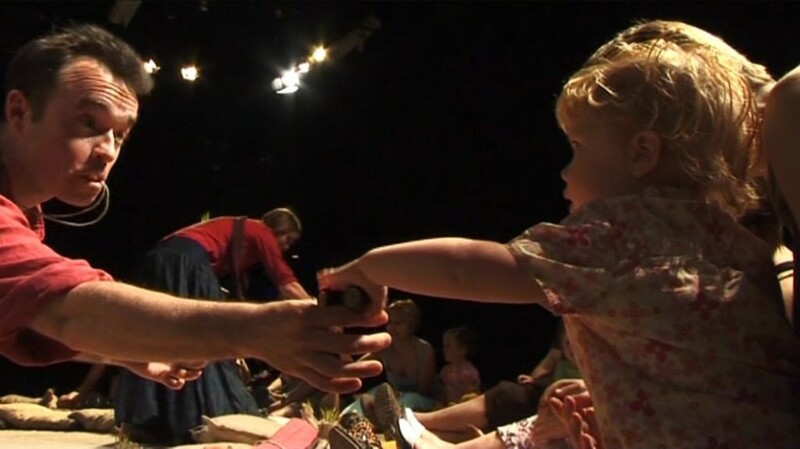 Their shows have delighted children for over 10 years, with their inventive use of beautifully designed and handmade ‘theatre toys’ with a genuine approach to playing and interacting with their audience. 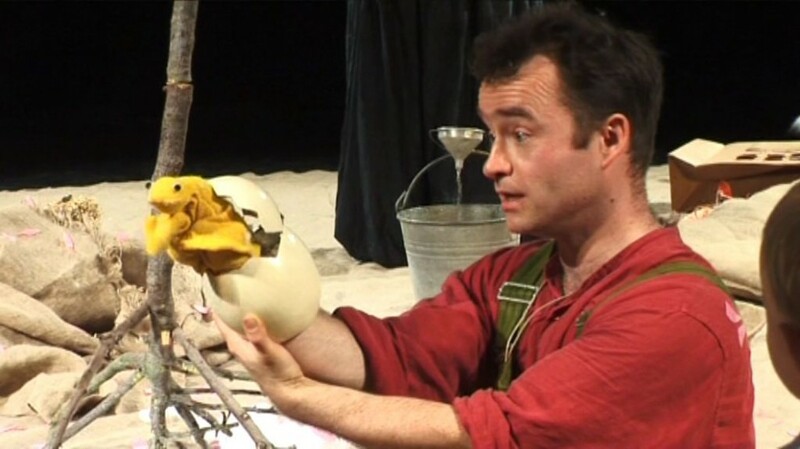 Patrick Lynch has specialised in children’s theatre since 2003, after a wide-ranging career in theatre, television and film and academia. 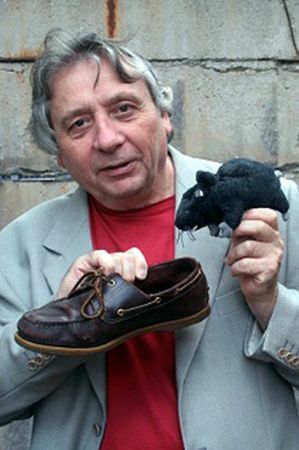 He studied psychology at Glasgow University and then dramatherapy and worked for many years with special-needs groups. 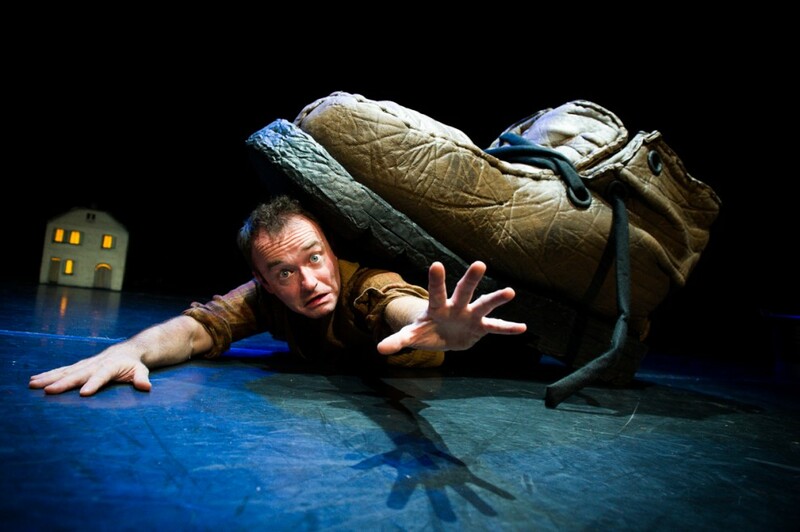 He has worked extensively in Europe in theatre-forms like Commedia dell’Arte and clowning. In the UK he has acted and directed for companies like Oily Cart and been a workshop and project leader for many organisatons. 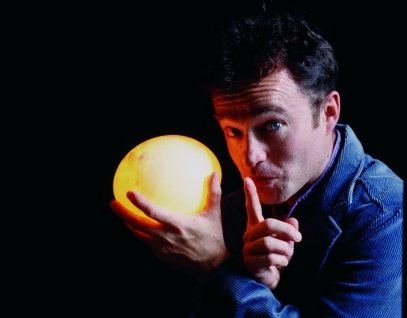 Since 2006 he has been presenting television programmes for the BBC on their channel Cbeebies. 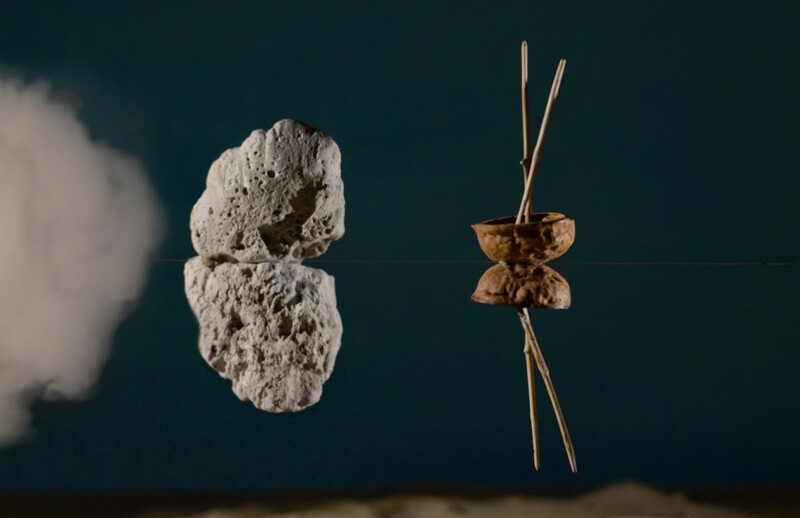 Marcello Chiarenza ‘s work is situated on the border between figurative art and theatre, between symbolic sculpture and event organization in his multi-roles of sculptor, painter, scenographer, designer, theatre writer and director. 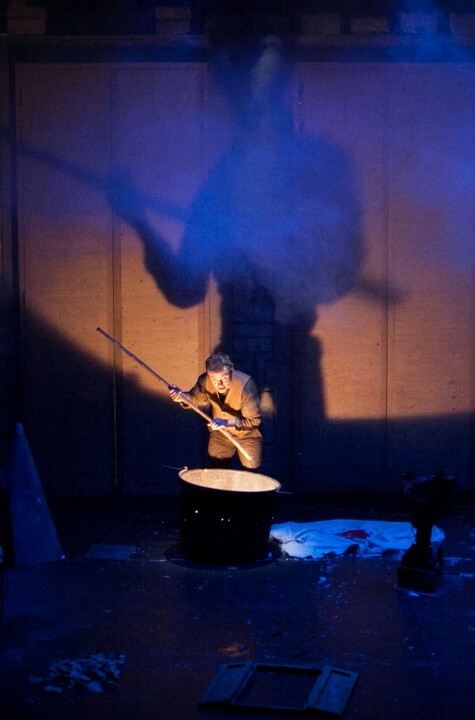 In the last decades he has been involved with installations, exterior and interior art exhibitions and theatre design for the stage and open-air. He has worked in many cities in Italy and abroad, in theatres, in nature reserves, by rivers and lakes, on beaches and up mountains. 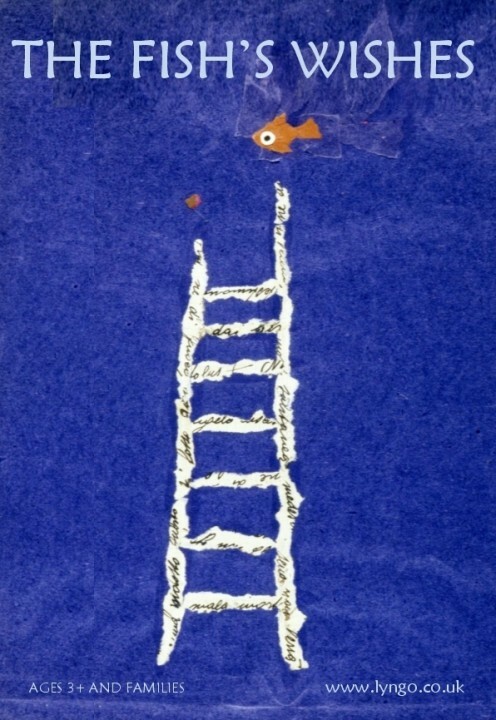 Some of his work is housed by institutions such as the new library in Maastricht and Olivetti's offices in Rome. 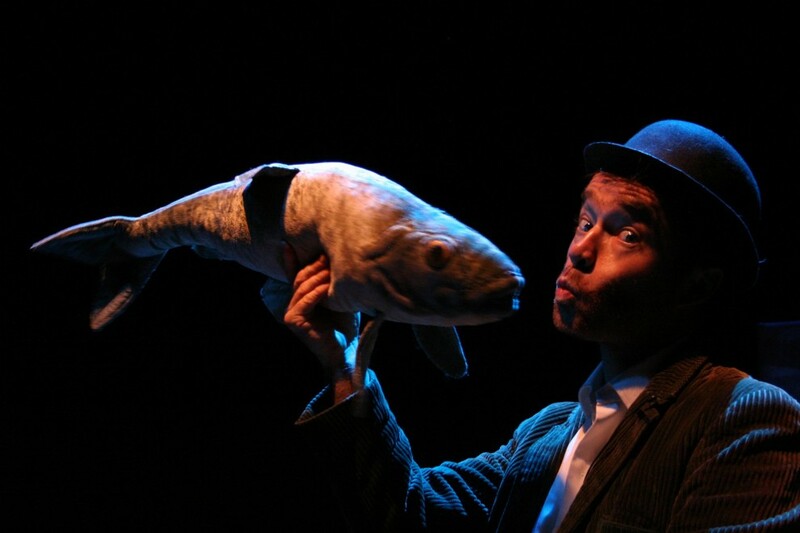 He has written, created and directed numerous children's shows, adapting myths and fairy-tales such as Hansel and Gretel, Tom Thumb, religious stories like the 'cantico delle creature' of Saint Francis and creating original work like The Fish’s Wishes. 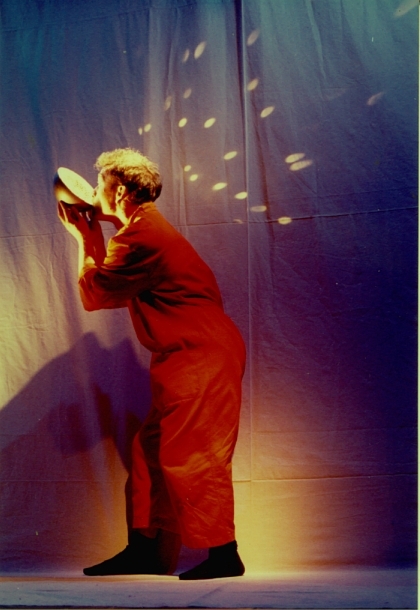 Carlo Cialdo Capelli studied at the Bologna conservatory with teachers such as G.F. Fugazza, K. Stockhausen, B. Ferneyhough, and G. Petrassi, and participated in the making of The show "Il Treno di John Cage" in 1978. 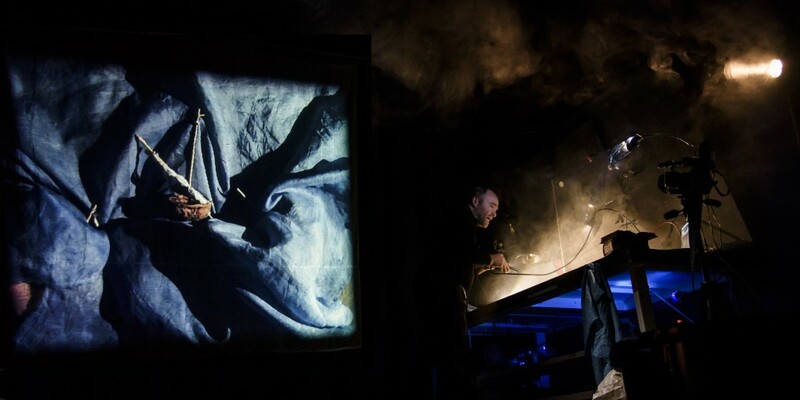 He works mainly with synthesised and electronic music, writing scores for dozens of theatre shows and working with artists such as Arturo Brachetti, Carmelo Bene, Sandro Luporini, Giorgio Gaber (from 1985 al 1990) il Teatro del Buratto (from 1987 al 1993), Dario Moretti (from 1995), and Accademia Perduta (from 1998). 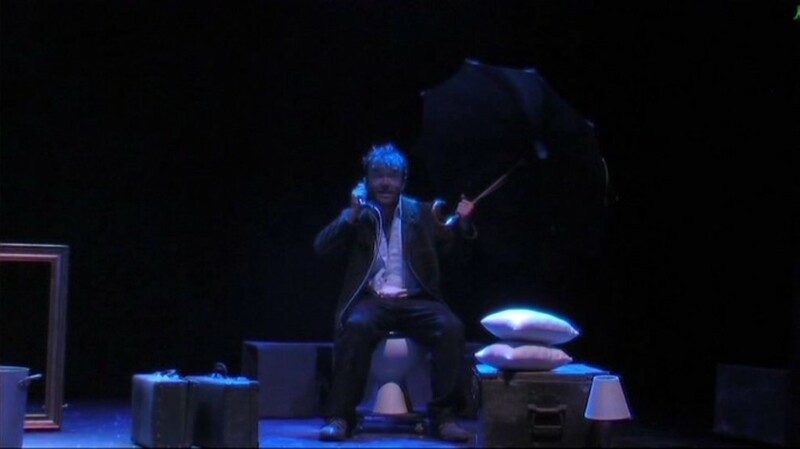 He was the winner of the 'children's composer' prize in Como with his first work "L'anello magico" (the magic ring) and since then he has specialised in children's theatre often making use of his "Tuttopiano", a piano with a keyboard running all around its perimeter. 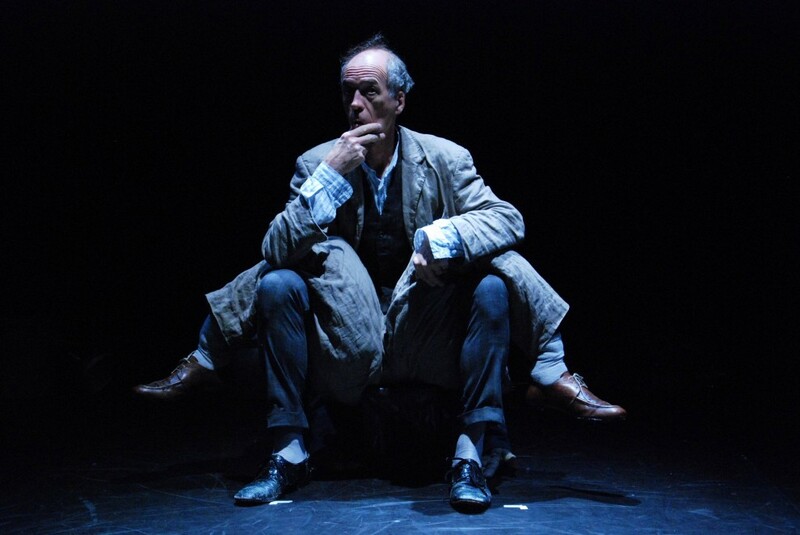 Since the late 90’s he has directed his own shows such as "The dancer and the pianist", an anthology of the songs of Dario Fo and written all the music for the circus-theatre shows that Marcello has created. 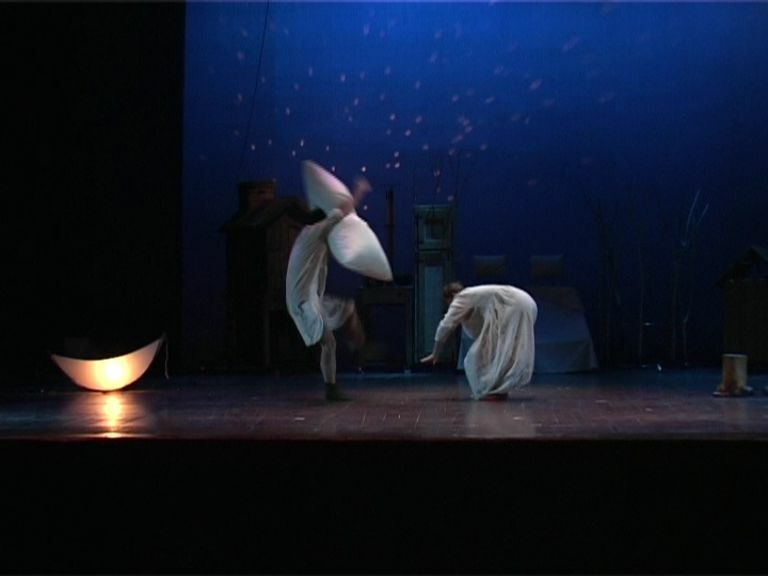 Elena Marini has had experience in many aspects of theatre and design, working in Venice with visual artists such as Fiora Gandolfi, costume designers like Sue Blane and Vera Marzot and theatrical bodies such as the Biennale and the Venice Carnival. 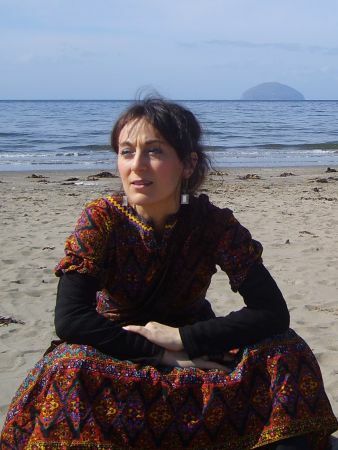 She has also worked in film and television, with BBC and Disney and in theatre with companies like Oily cart. She co-designs and makes Lyngo’s props and costumes and when on tour she is our stage manager, technician and assistant director. 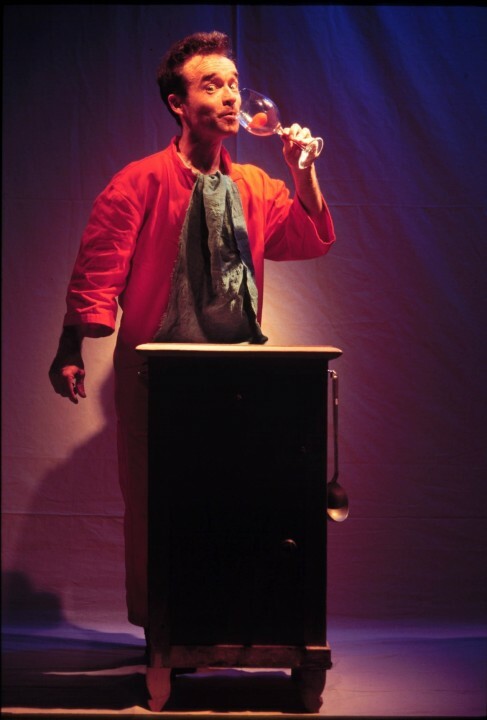 Carlo has been performing with us since 2010. 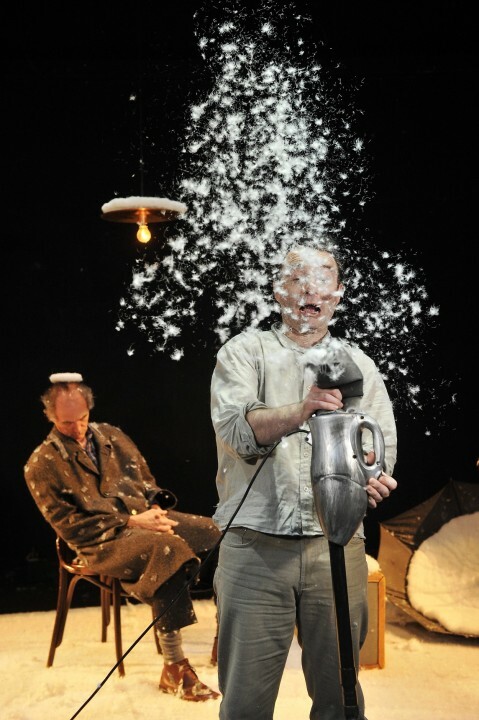 He studied with the legendary Czech clown Bolek Polivka and brings to our work a surreal and absurd twist that fits very well with our philosophy and is an important part of the European theatre tradition. 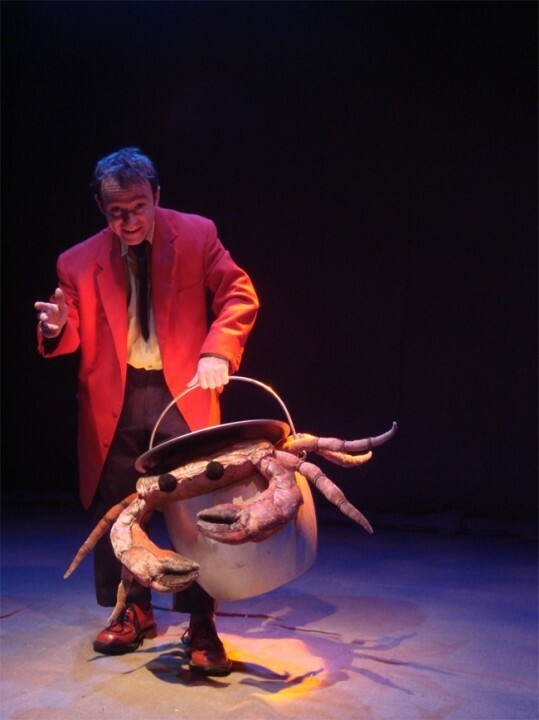 He was one of the founder of the clown company Filarmonica Clown in the early 80’s and still works with them today. 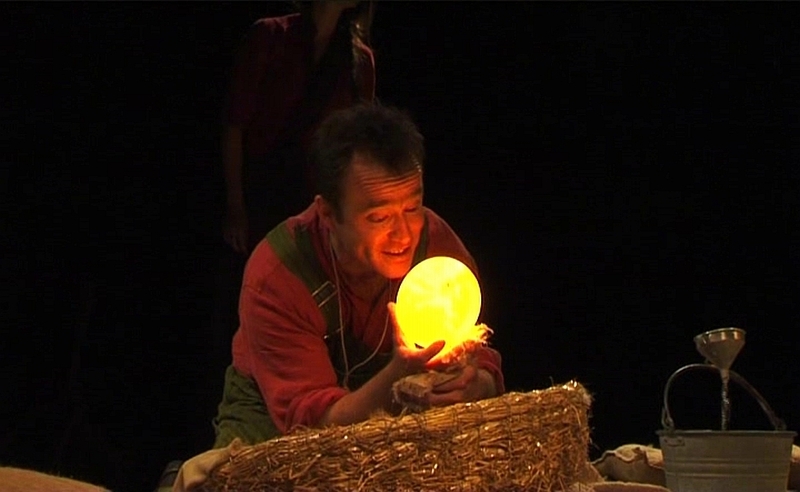 He also worked for many years for RAI (Italy’s State television) presenting and acting in the children’s program Albero Azzurro. Amy Michaels, Emilia Brodie, Airlie Scott, Zoe Harrison , Andrew Irwine, Frank Wurzinger, Pietro Chiarenza, Keta Newborn, Martha Kotzian, Zoe Hunter and all of those who have played with us.